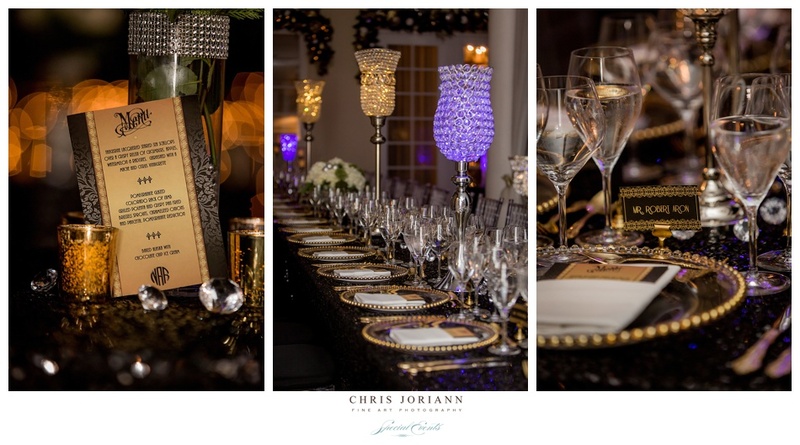 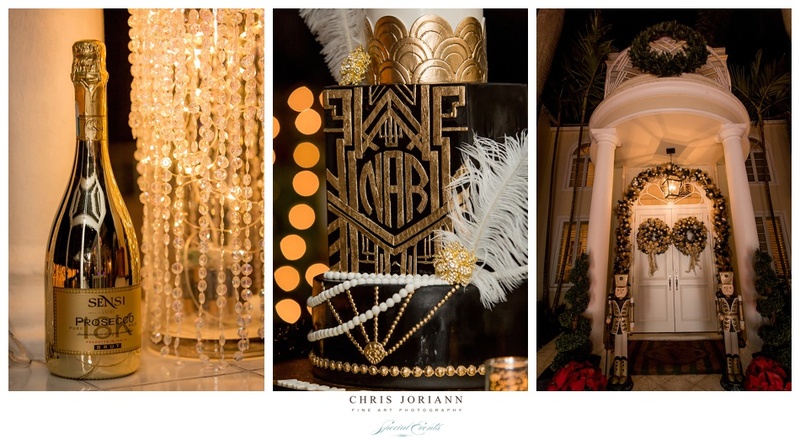 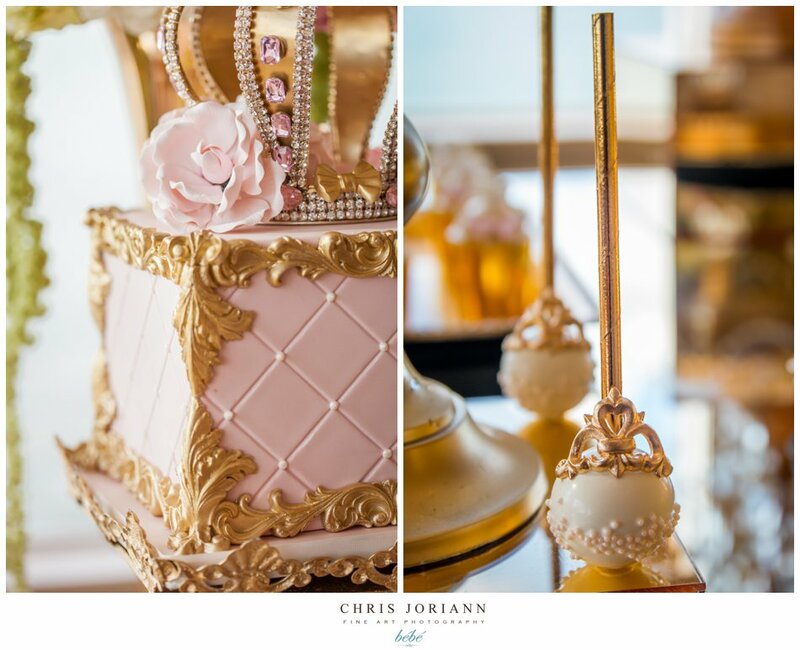 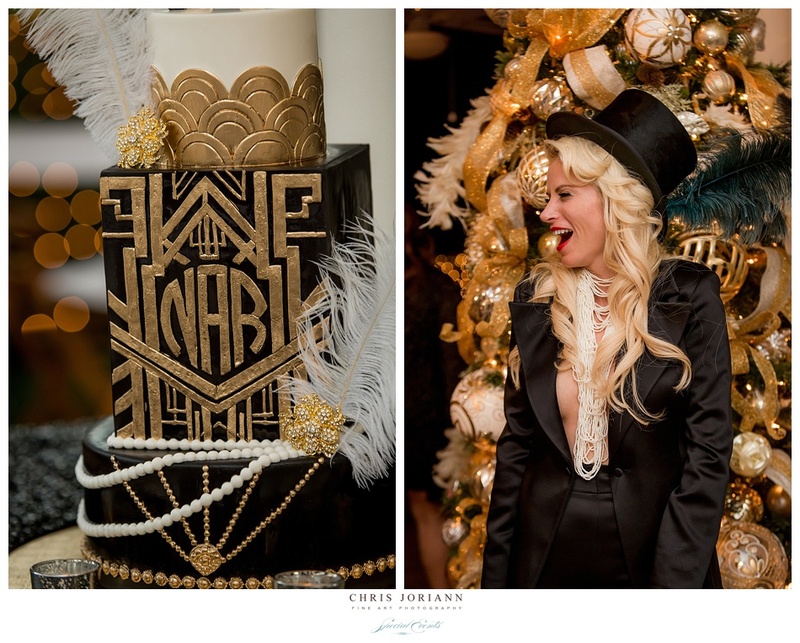 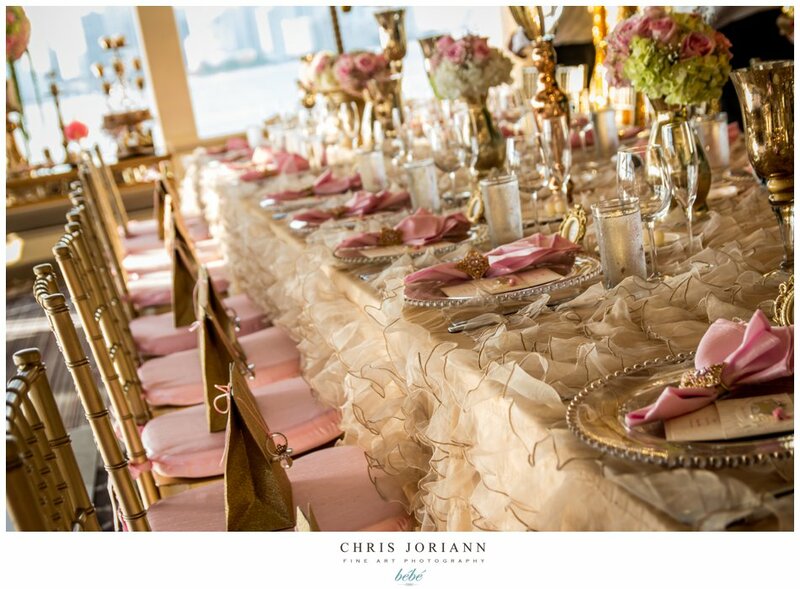 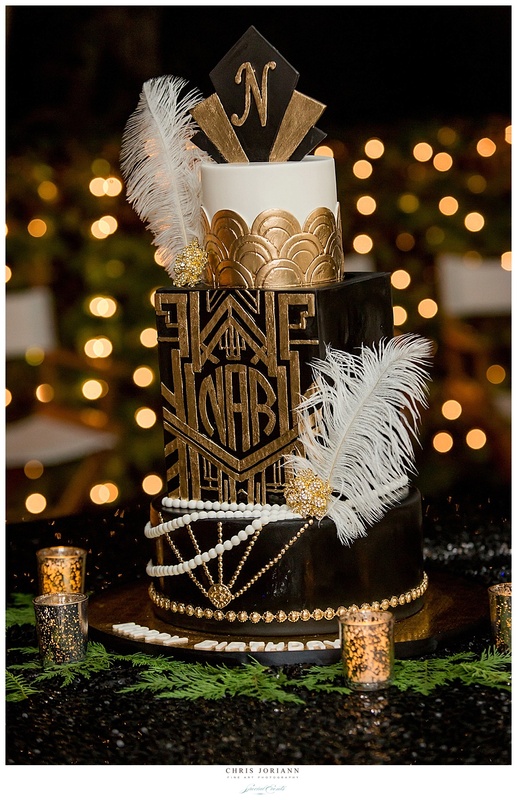 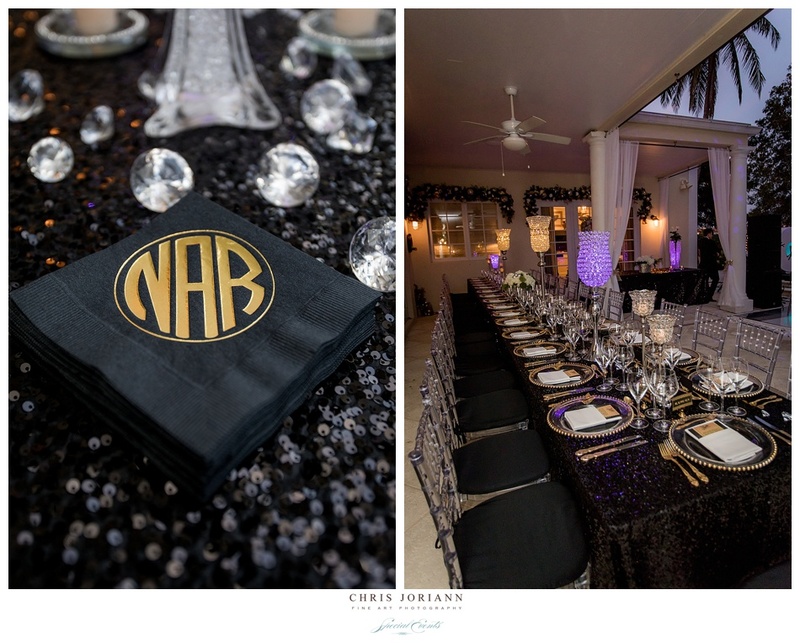 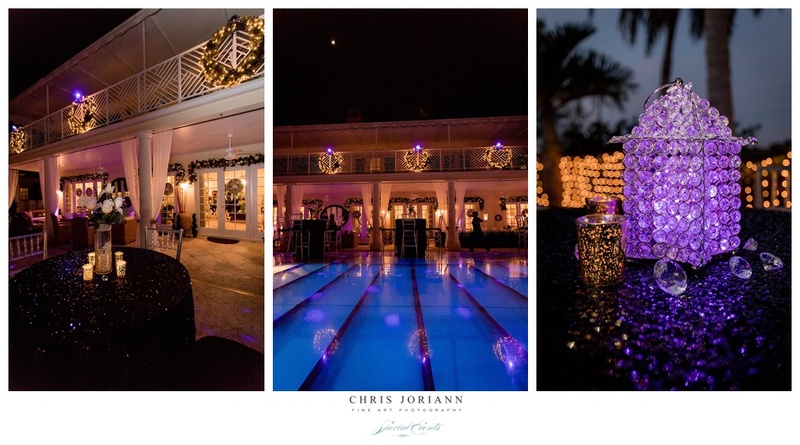 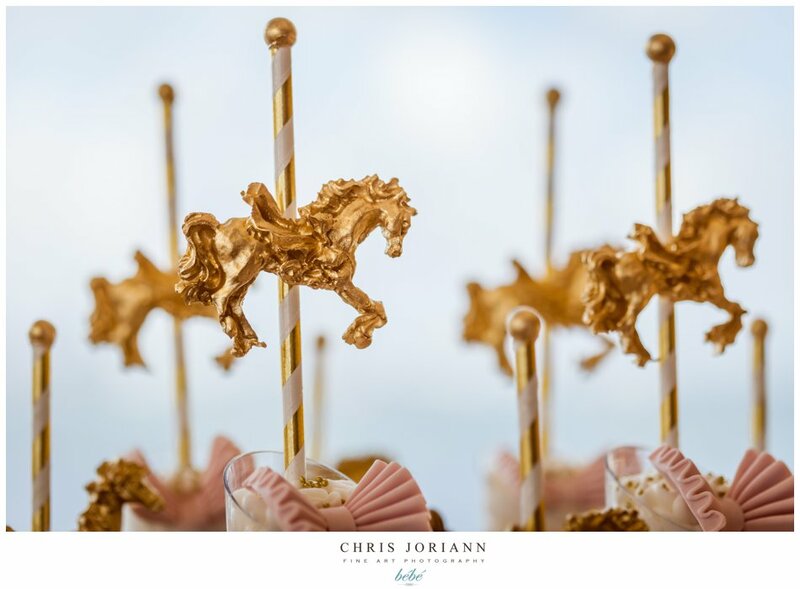 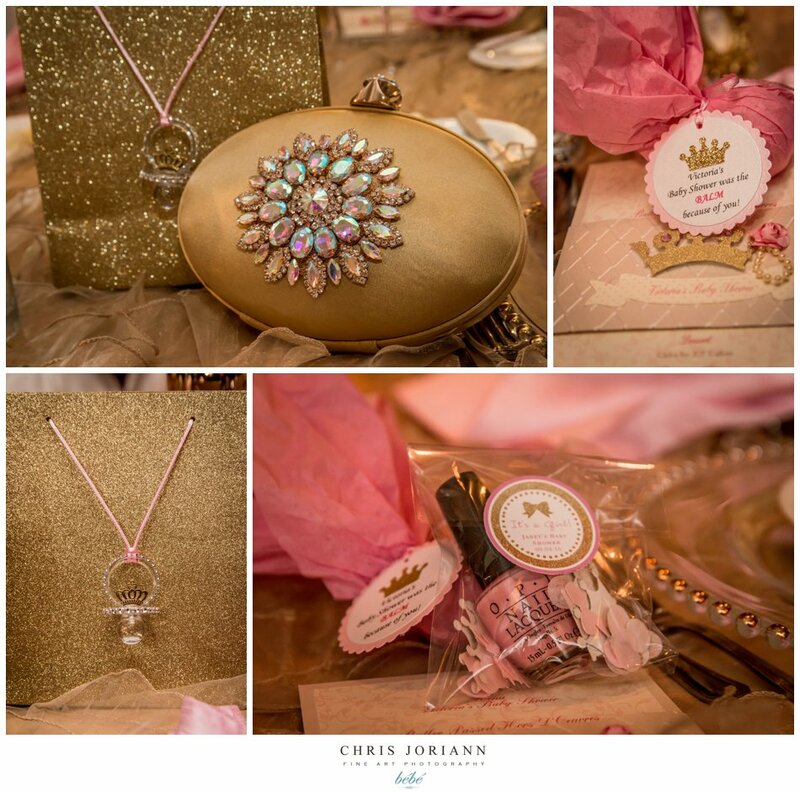 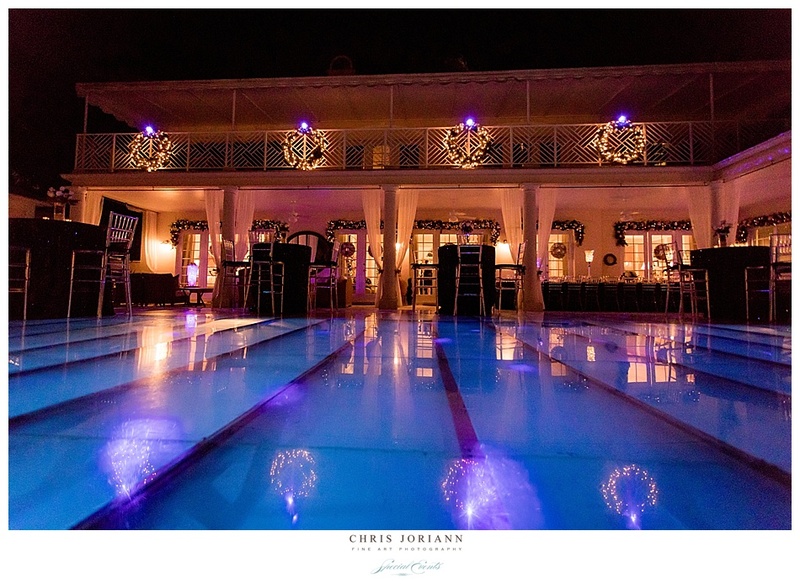 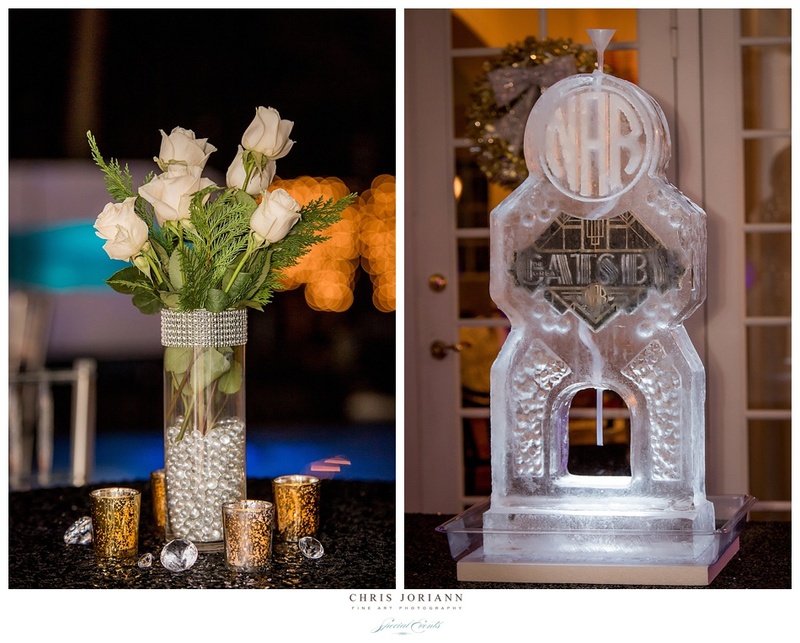 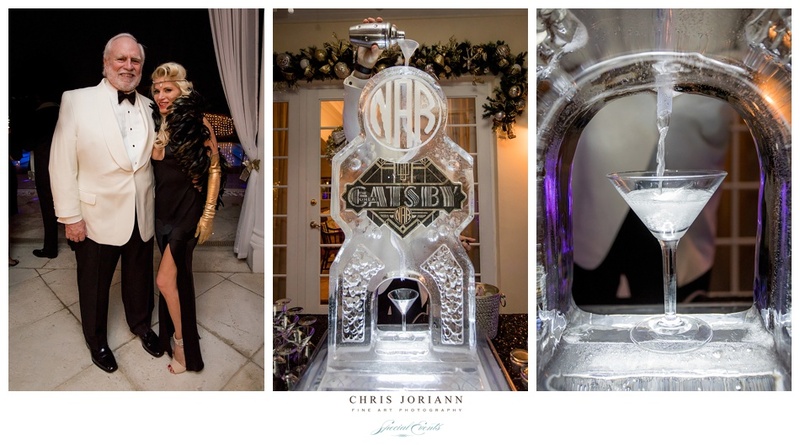 This stunning Gatsby Themed birthday celebration, created by Scott Style Events, was held at a private Polo Club Residence, and featured a glass covered pool, and gold and chocolate art deco meets holiday décor. 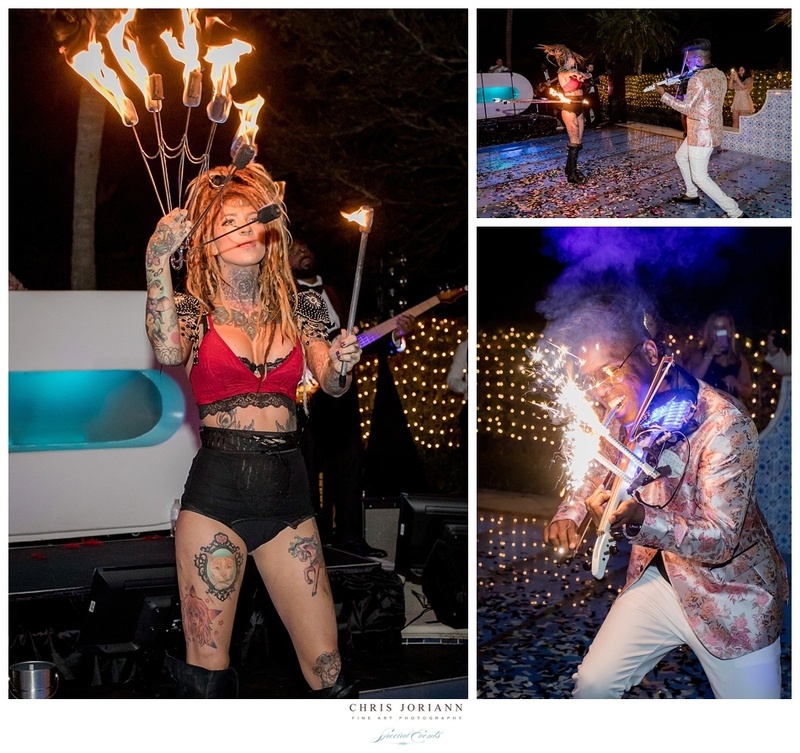 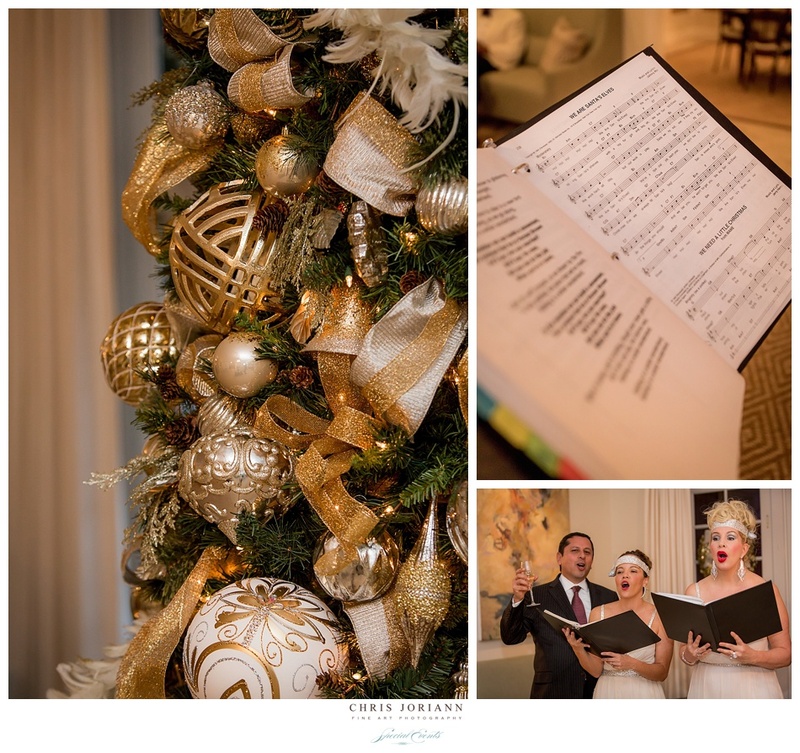 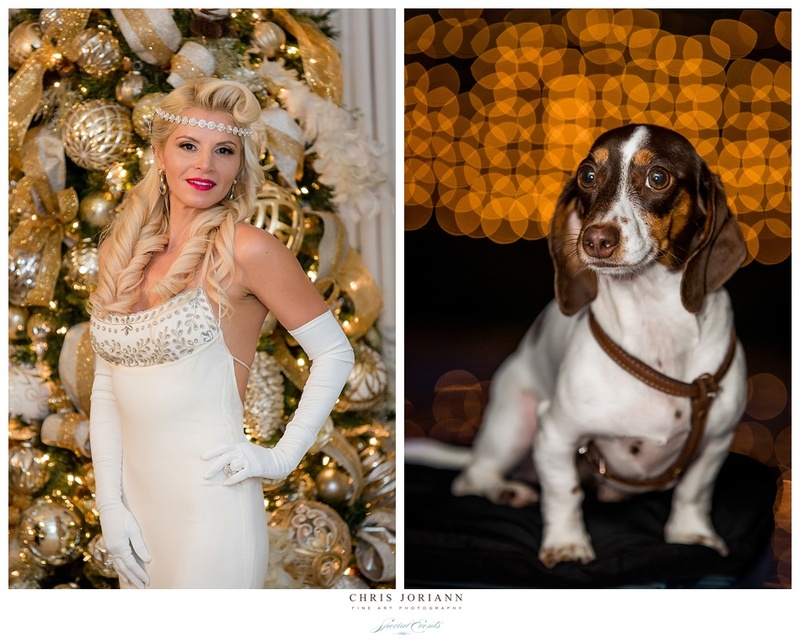 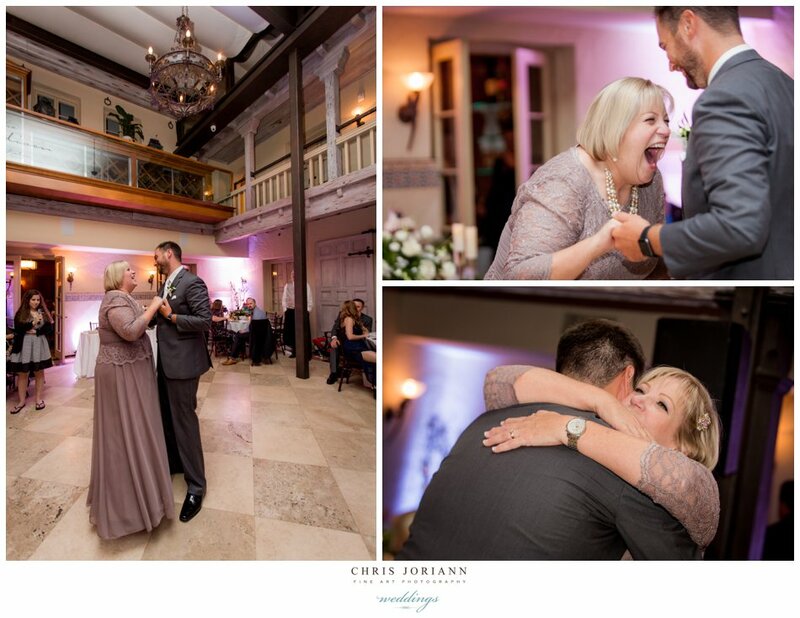 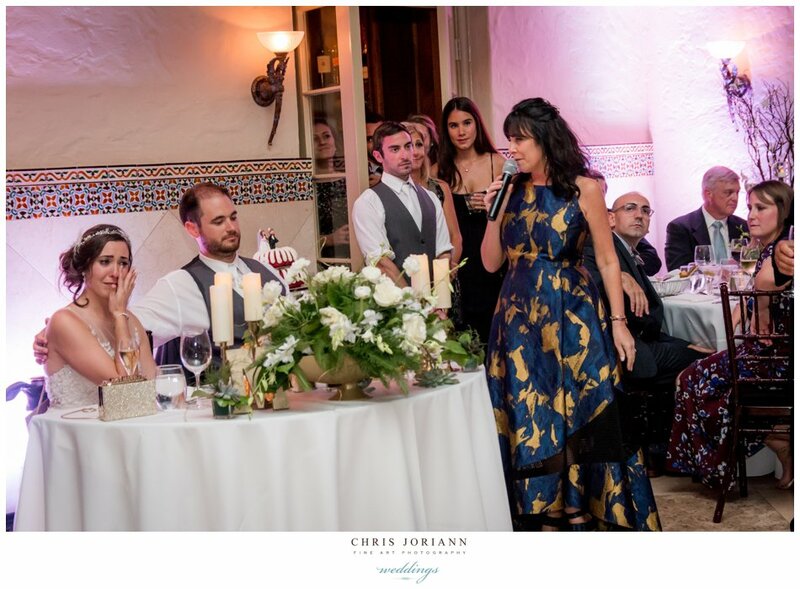 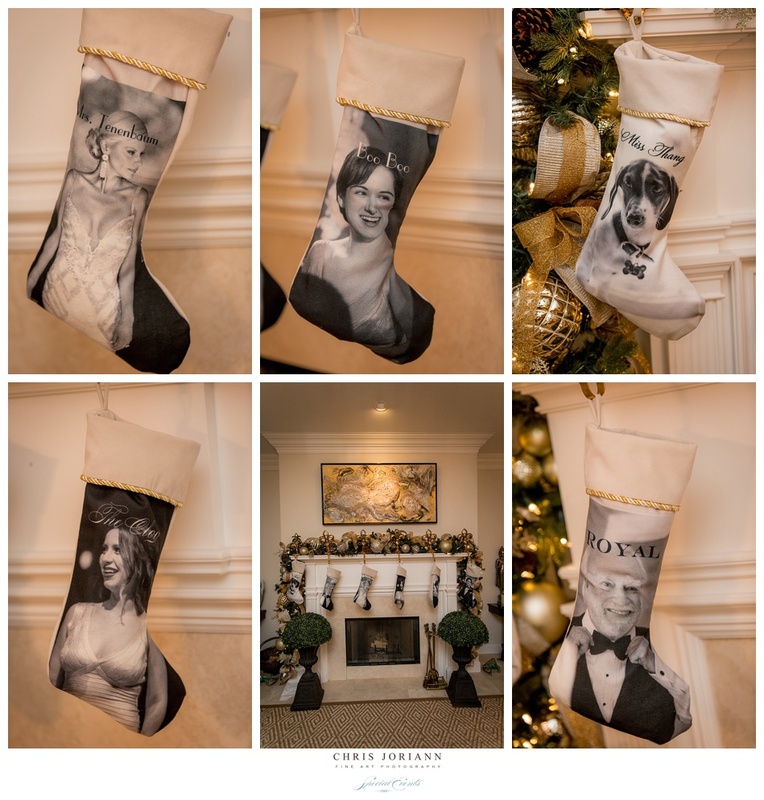 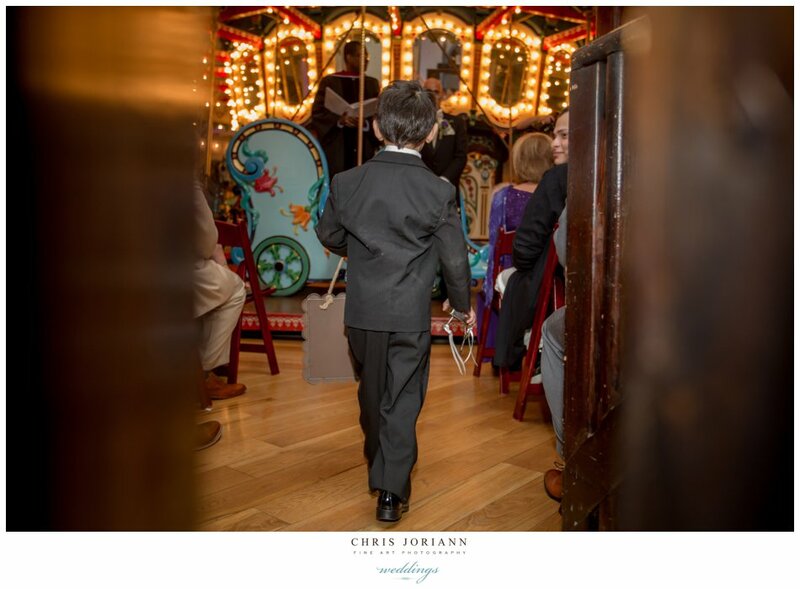 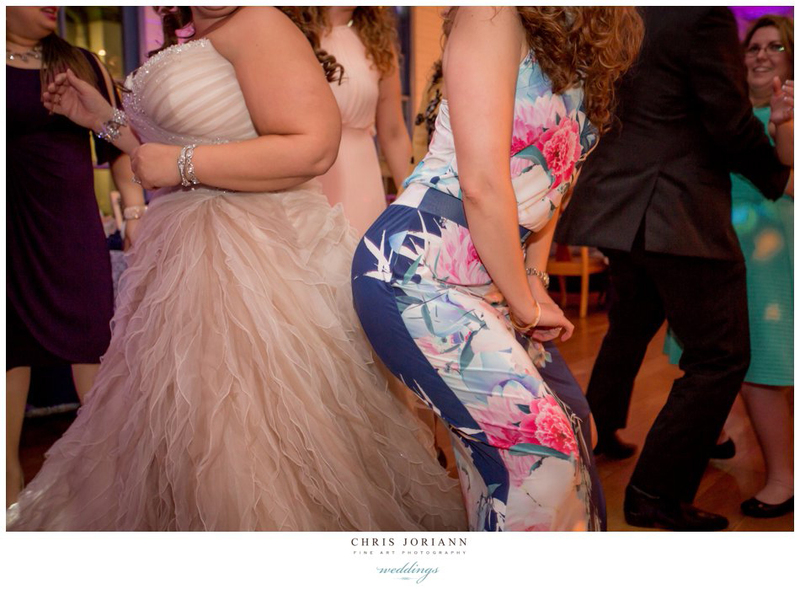 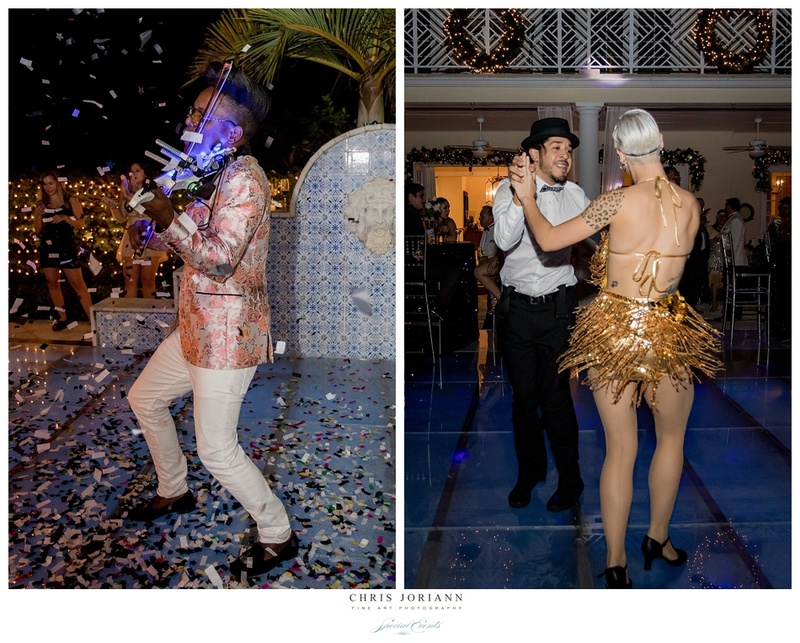 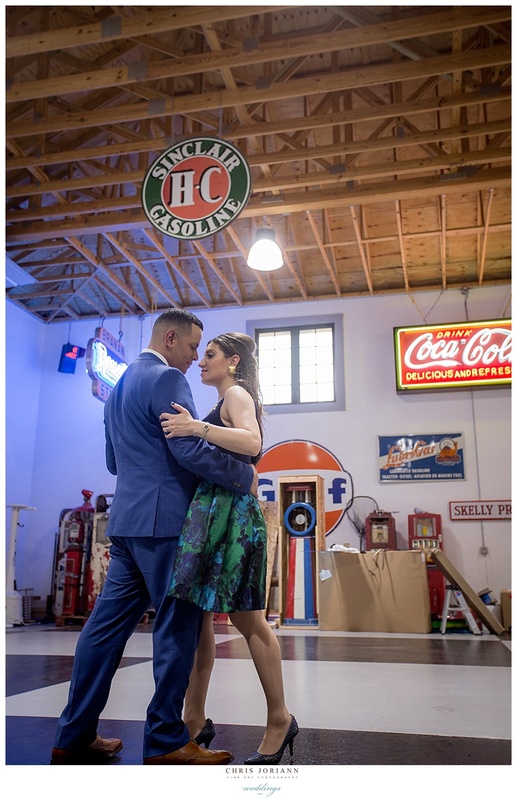 Guests donned their best 1920’s styled garb, and the guest of honor, enjoyed several fabulous outfit changes as dancers, carolers, and even a strolling electric violinist entertained. 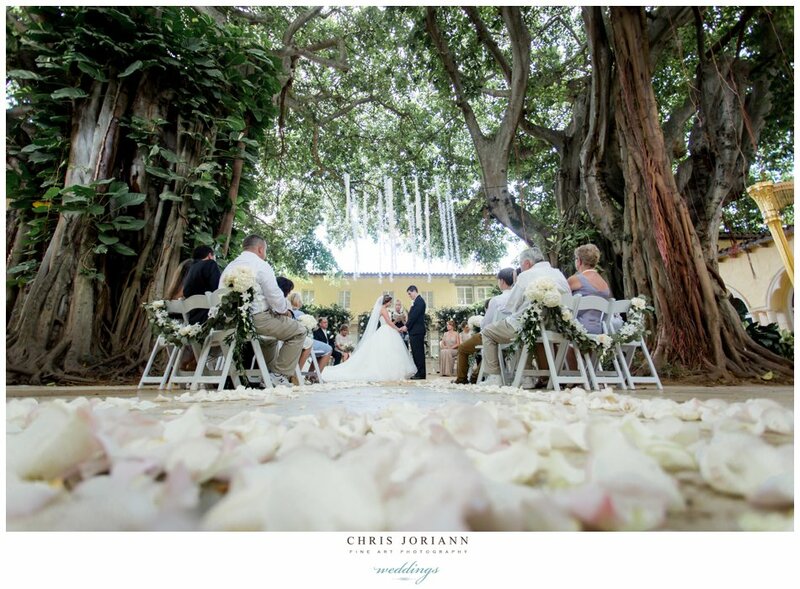 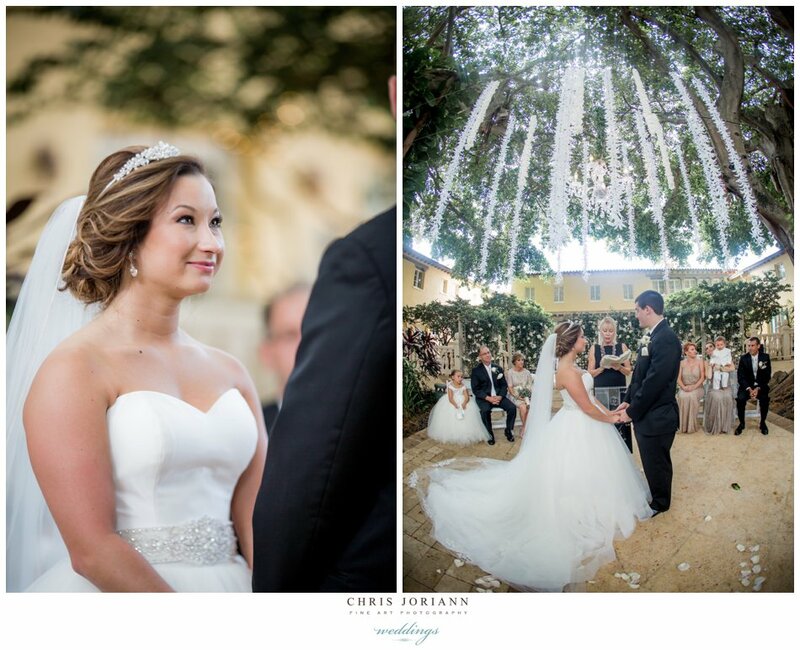 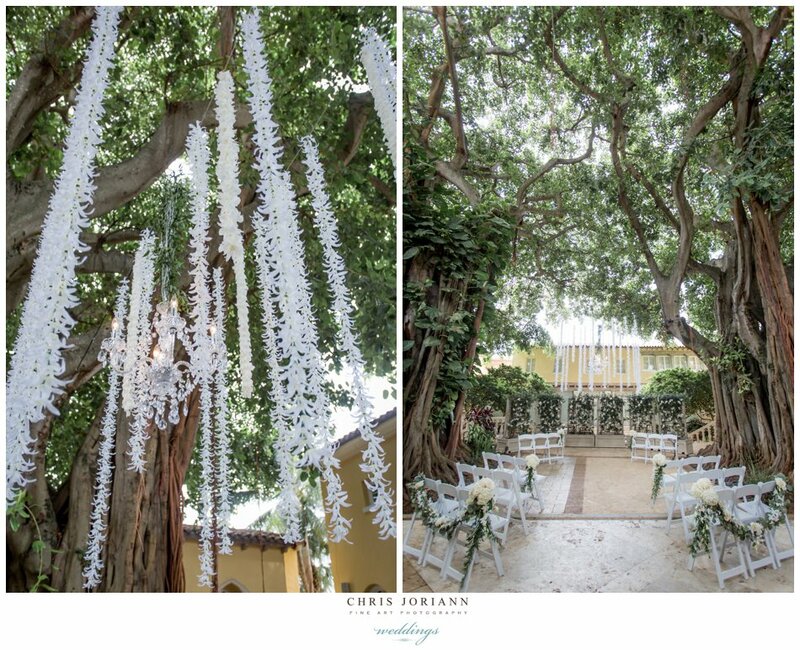 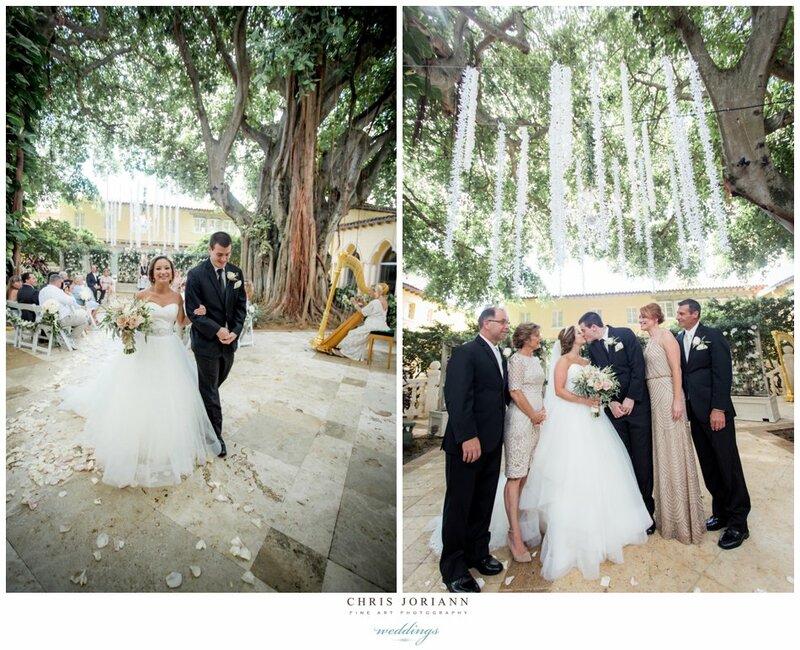 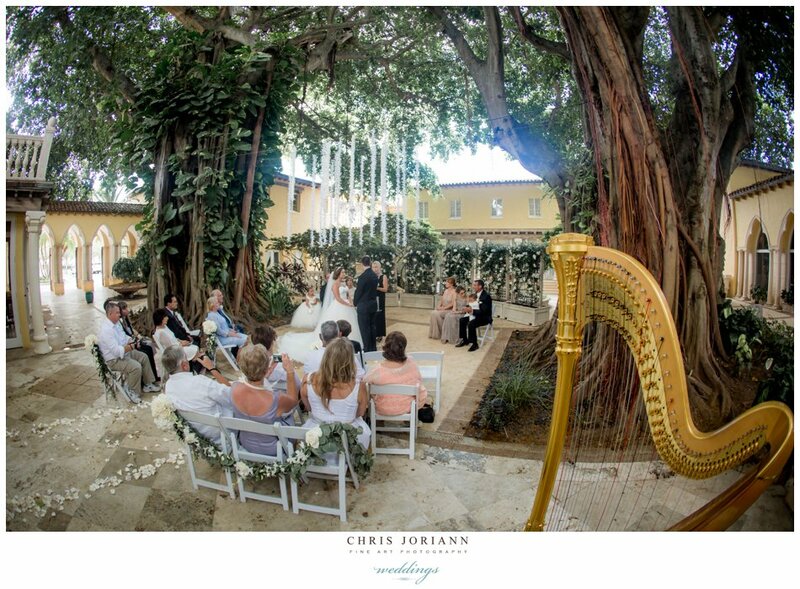 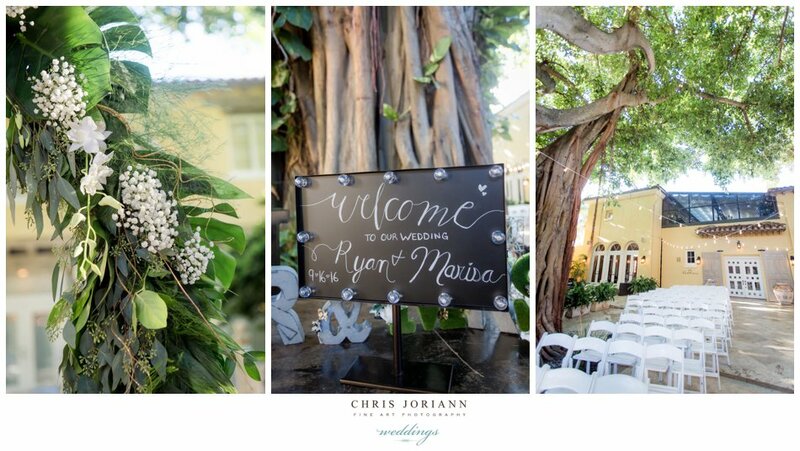 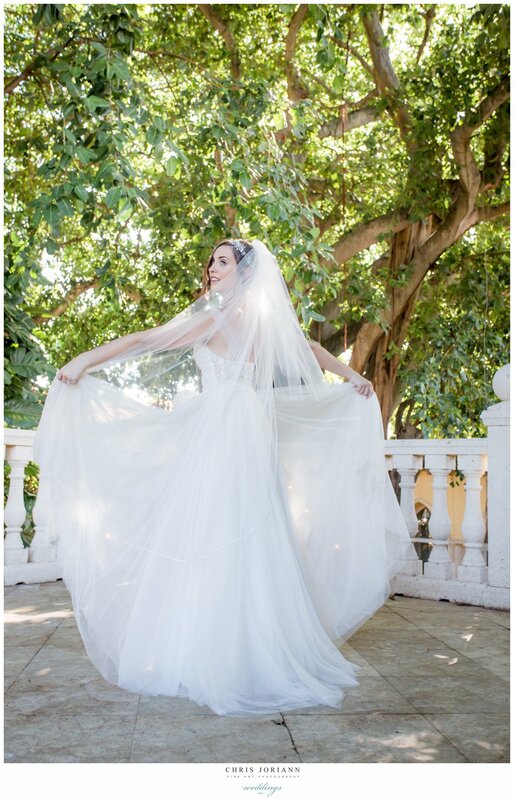 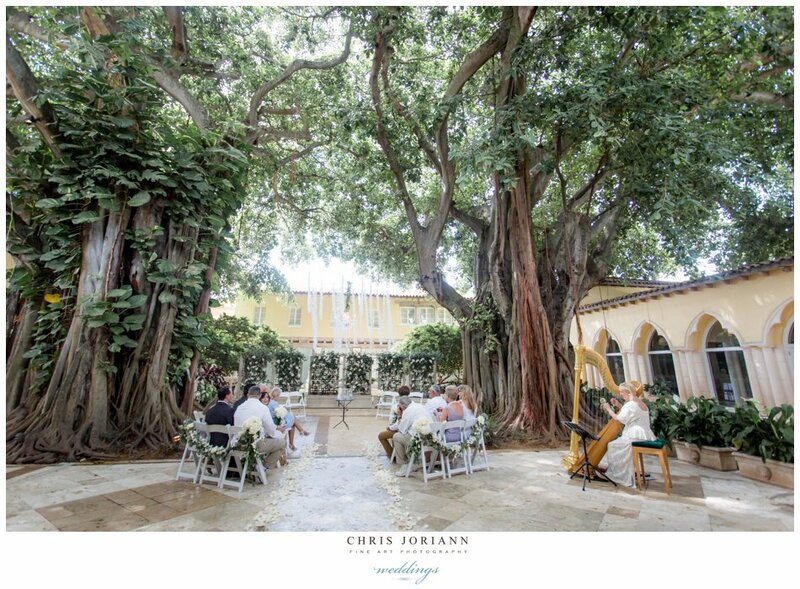 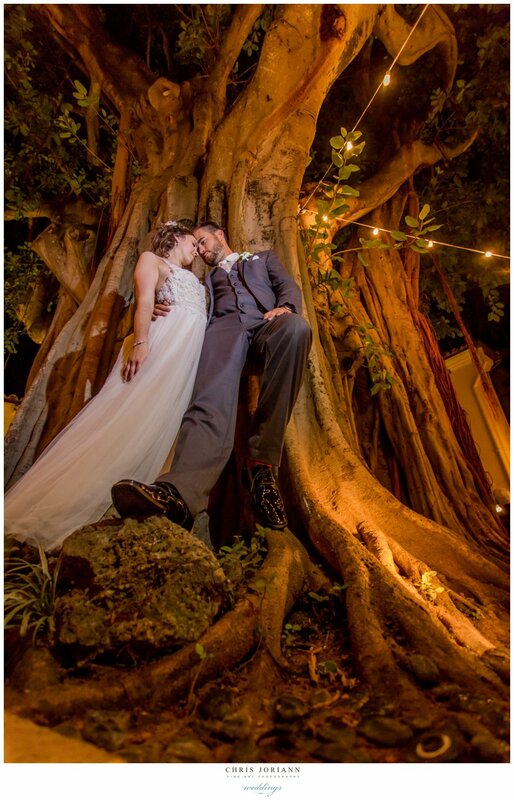 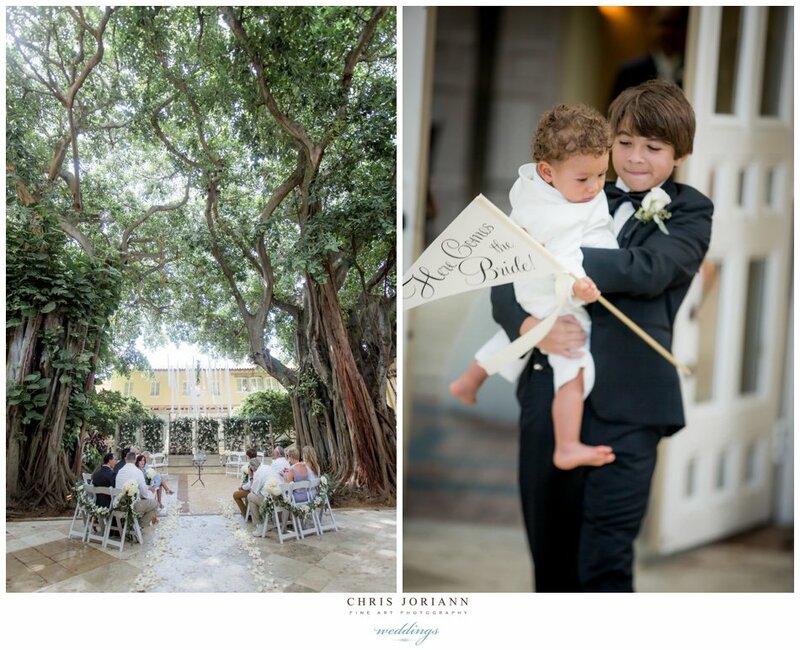 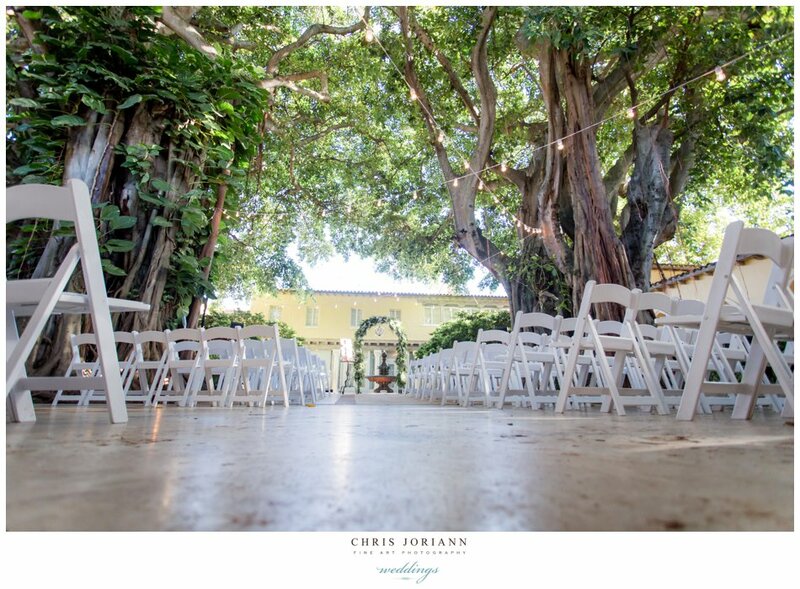 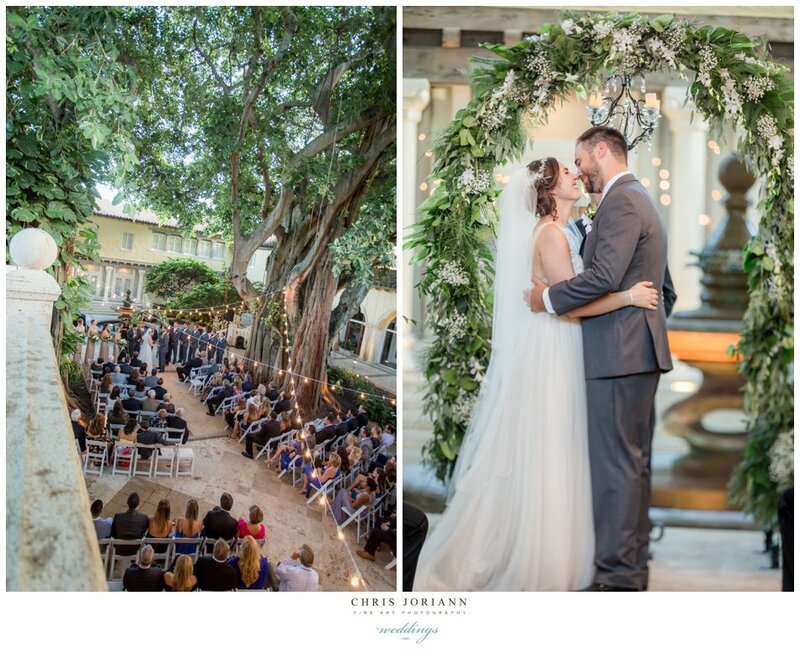 Marisa + Ryan’s romantic garden wedding was held beneath the giant banyan tree at The Addison in Boca Raton. 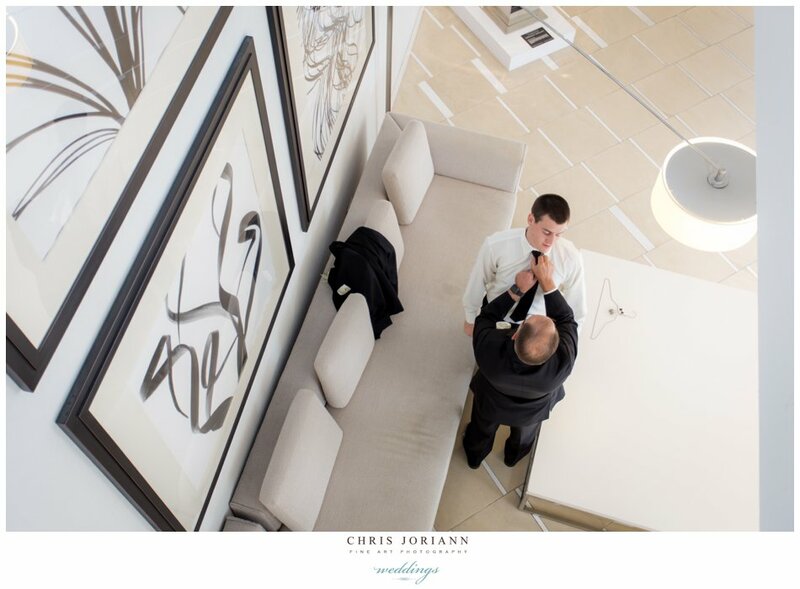 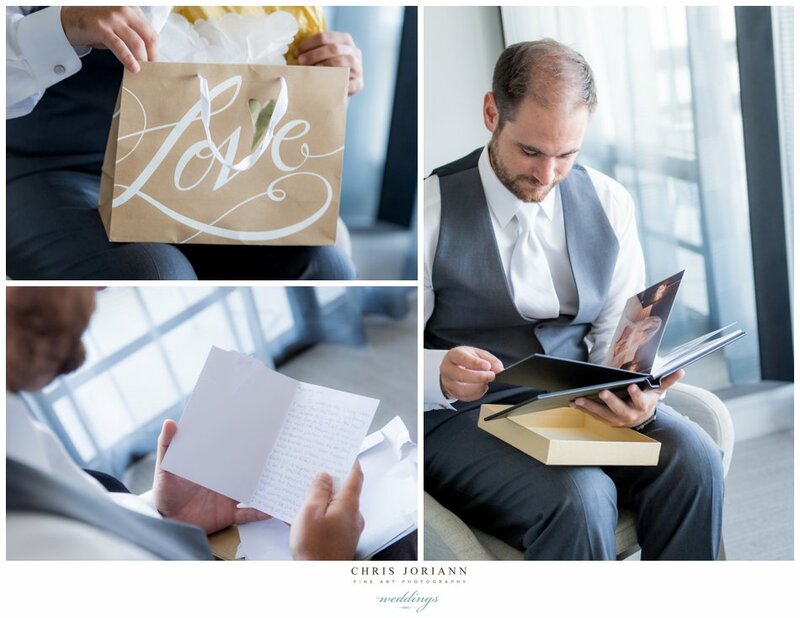 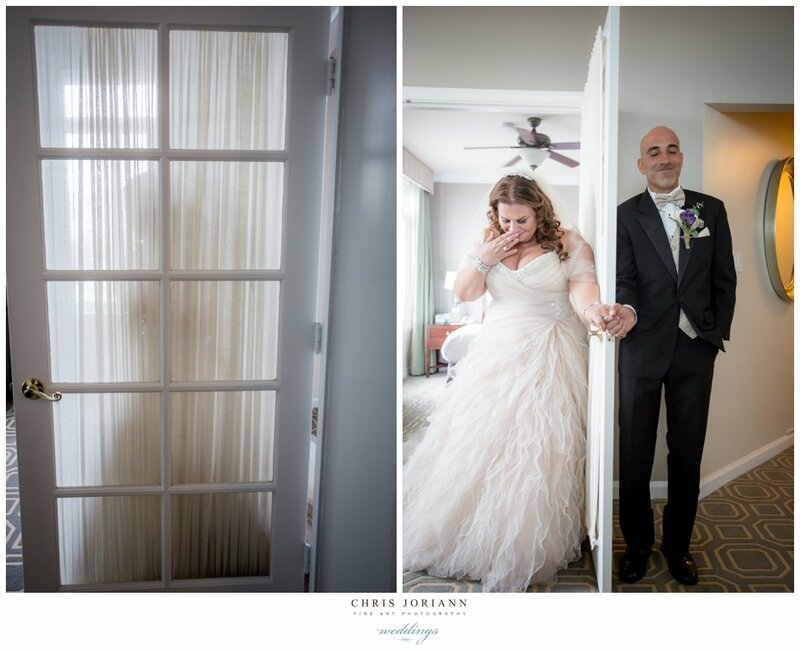 Earlier in the day the couple readied at the nearby Waterstone Resort + Marina. 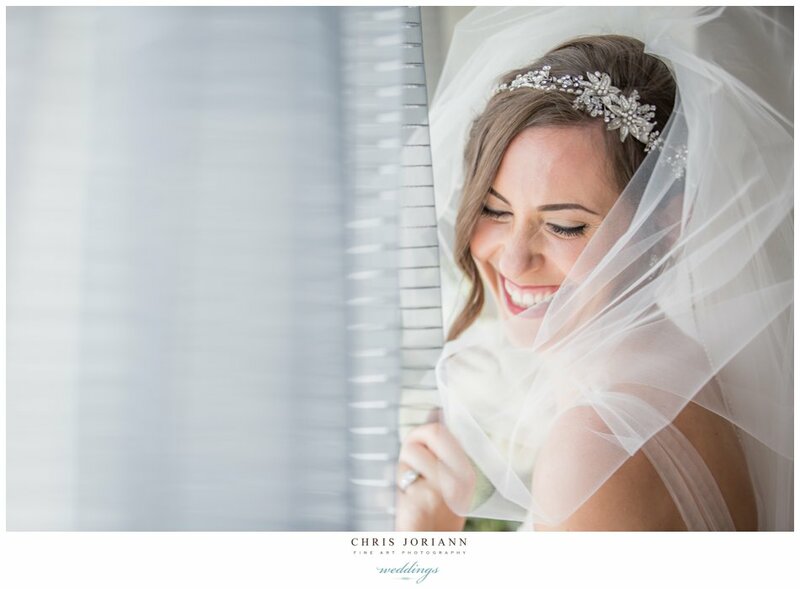 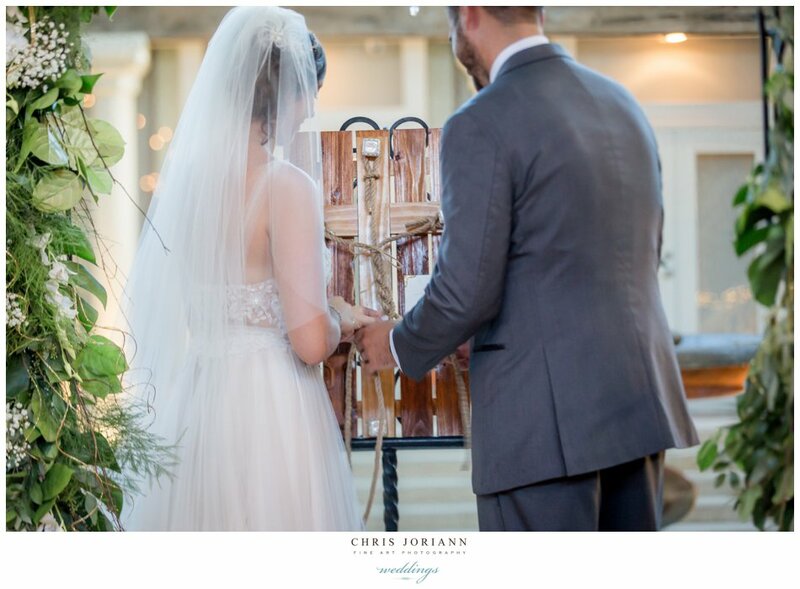 The bride channeled old world elegance in a vintage inspired Willowby by Watters couture gown, and a headpiece featuring netting and antique feathers. 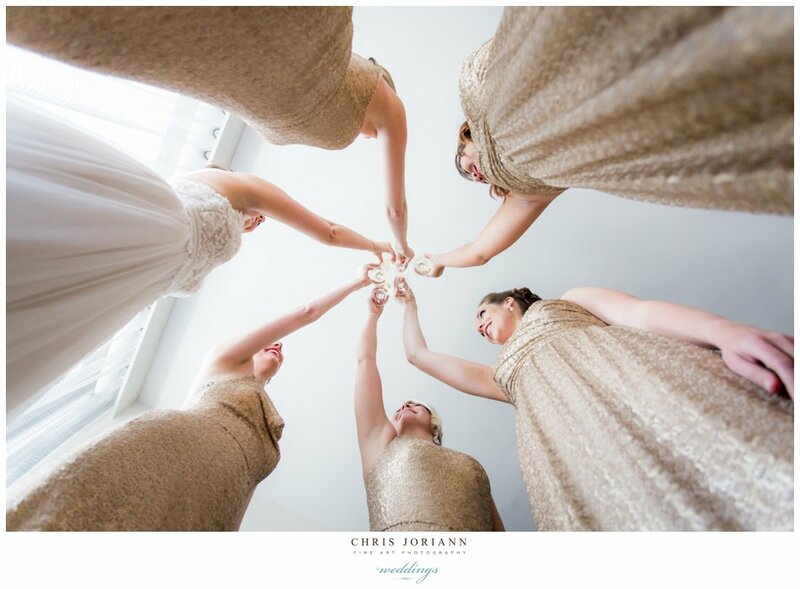 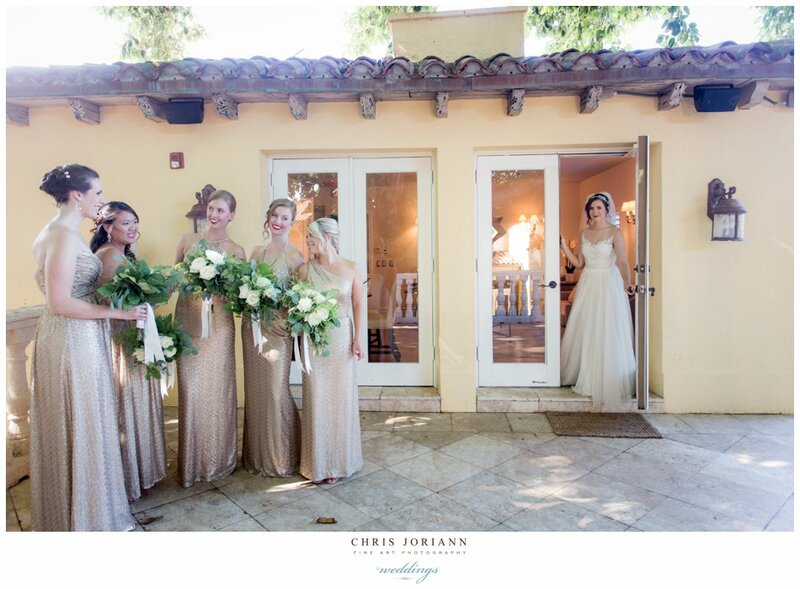 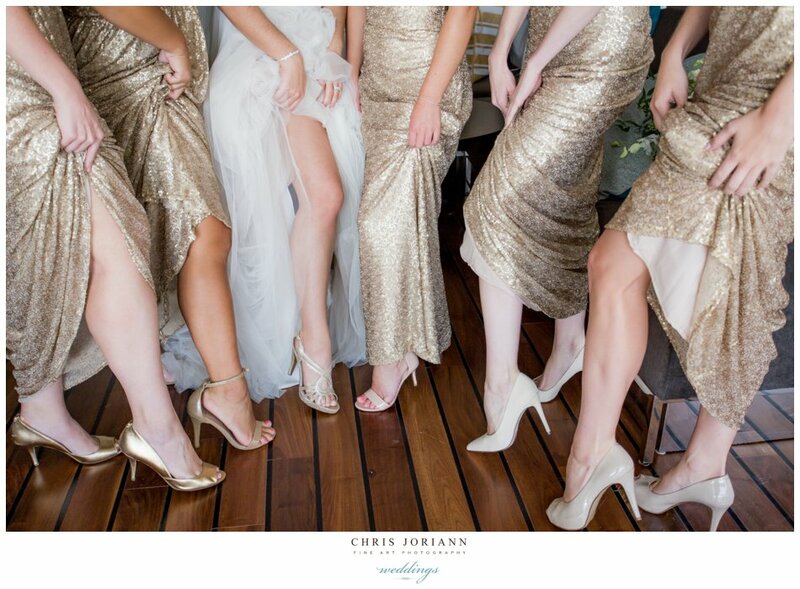 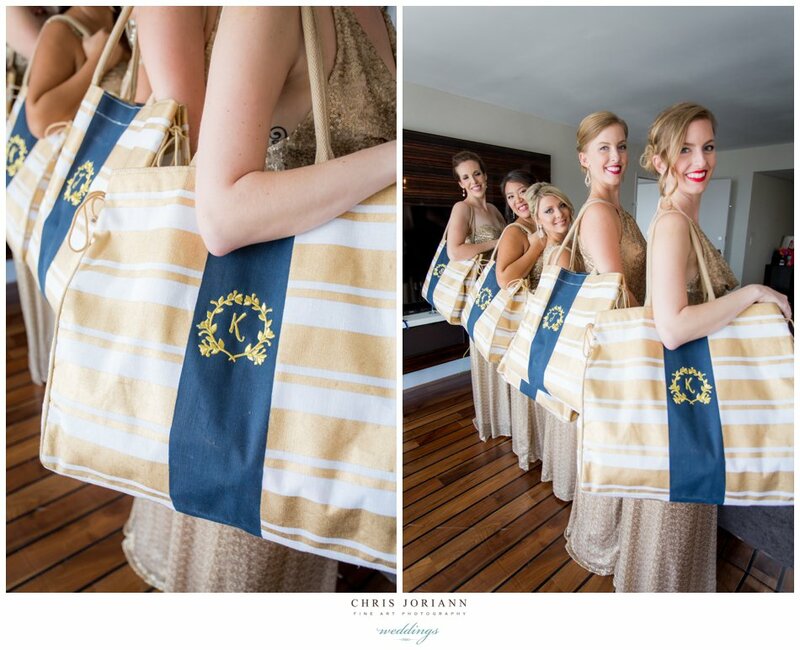 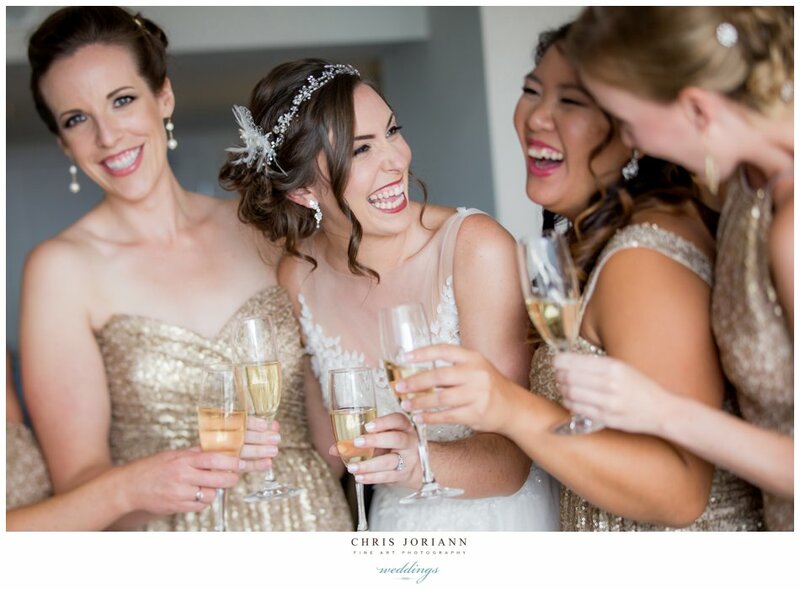 And her bridesmaids rocked in sheer champagne gold lame. 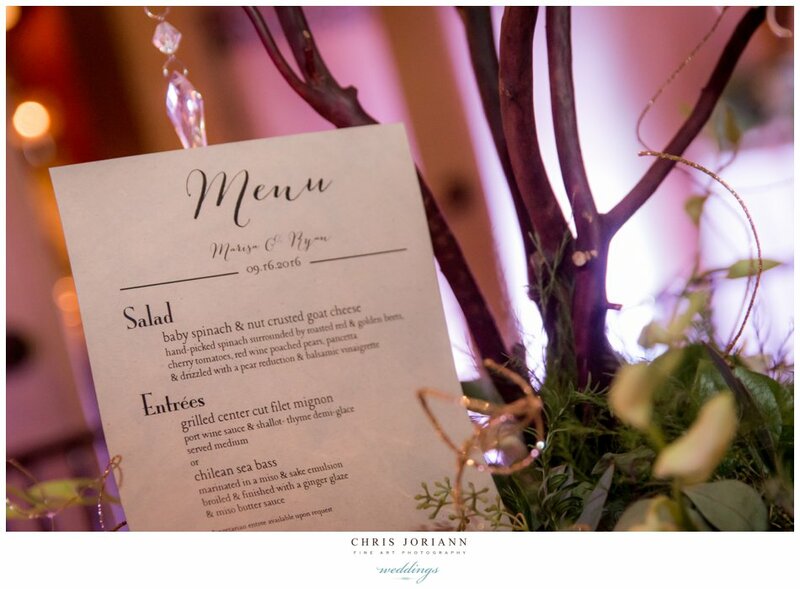 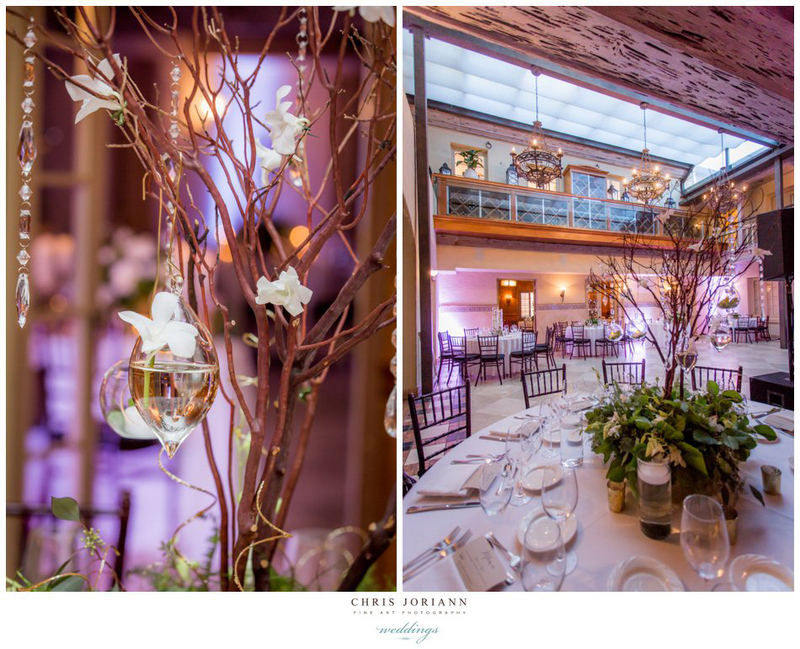 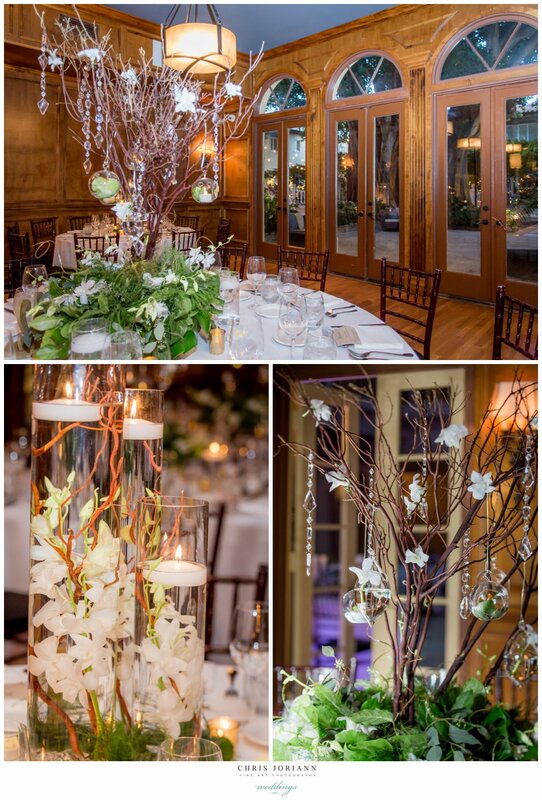 Tablescapes featured, branched centerpieces with hanging votives, and vases of floating orchids, surrounded by succulents and votives. 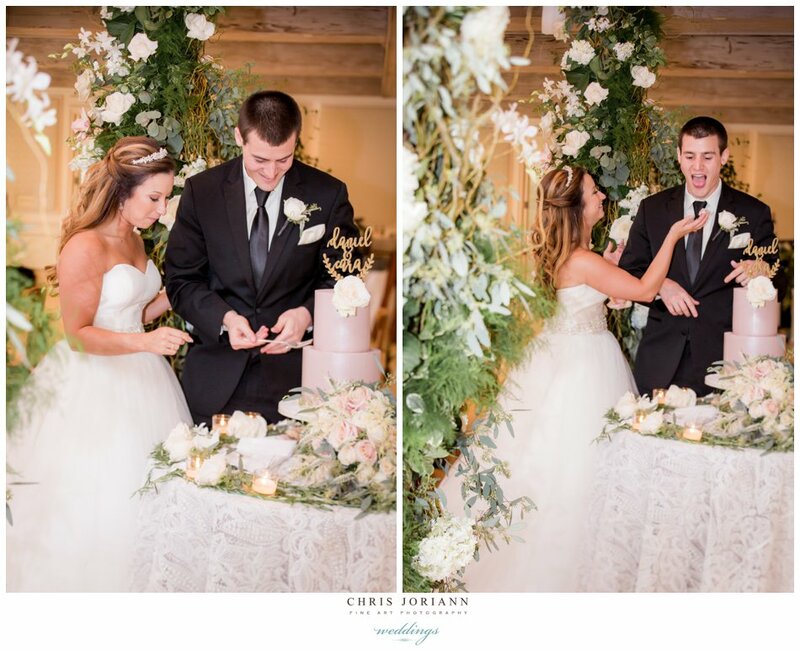 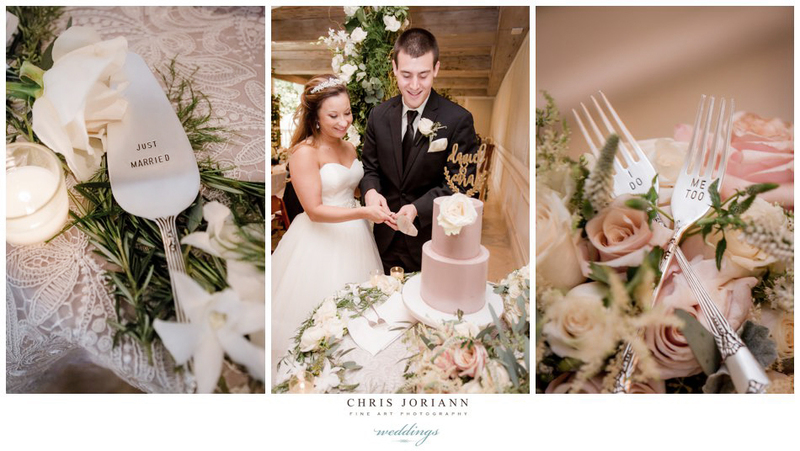 Their cake cutting table was extra meaningful to the couple. 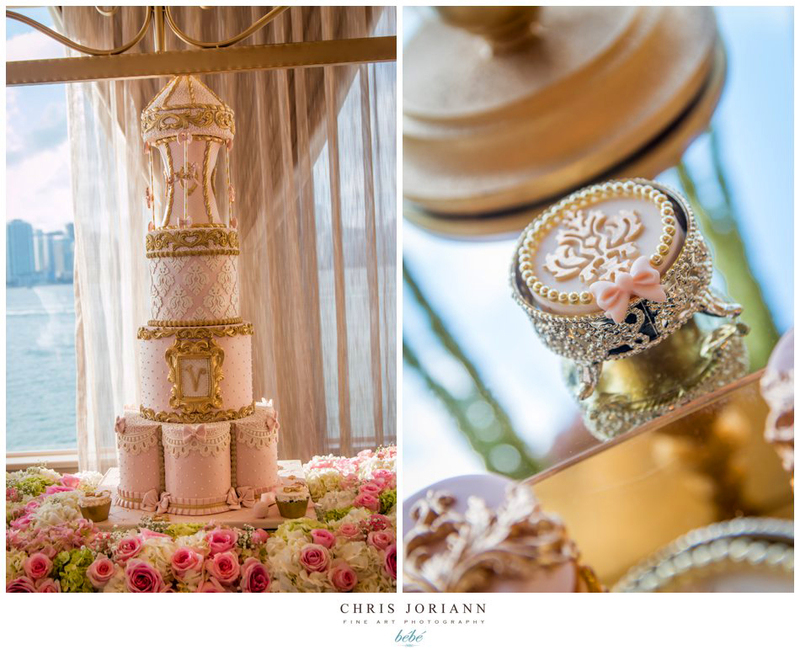 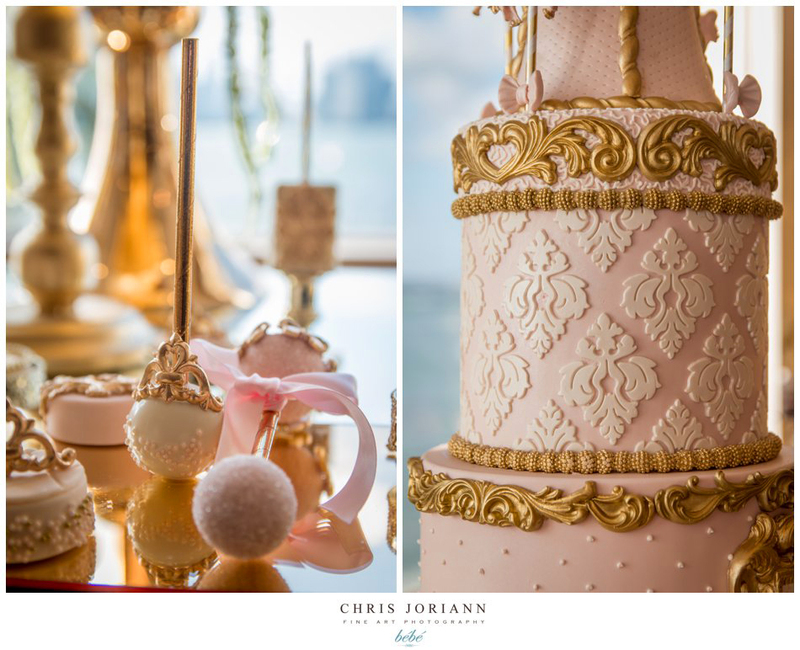 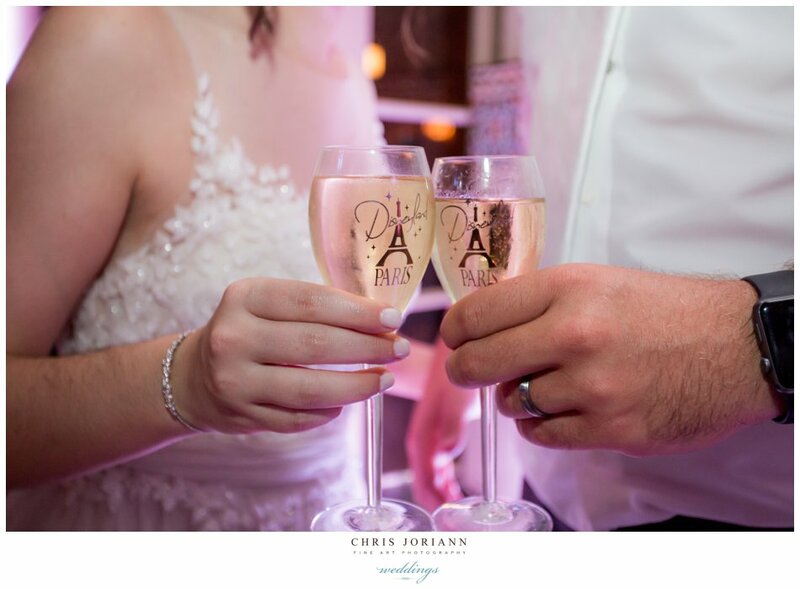 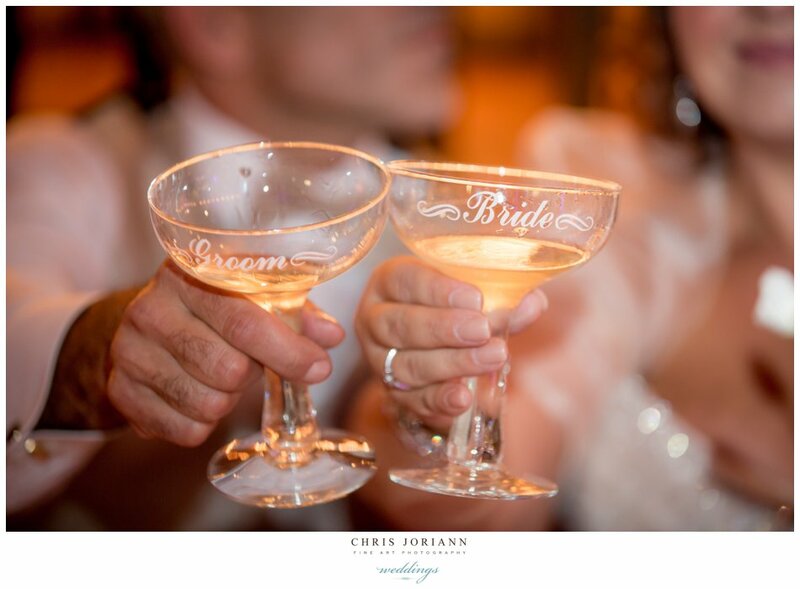 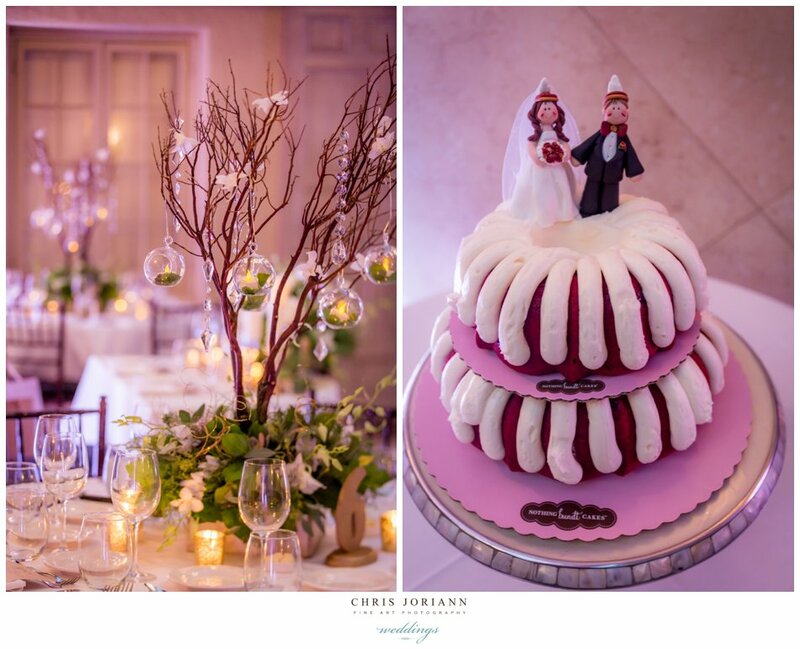 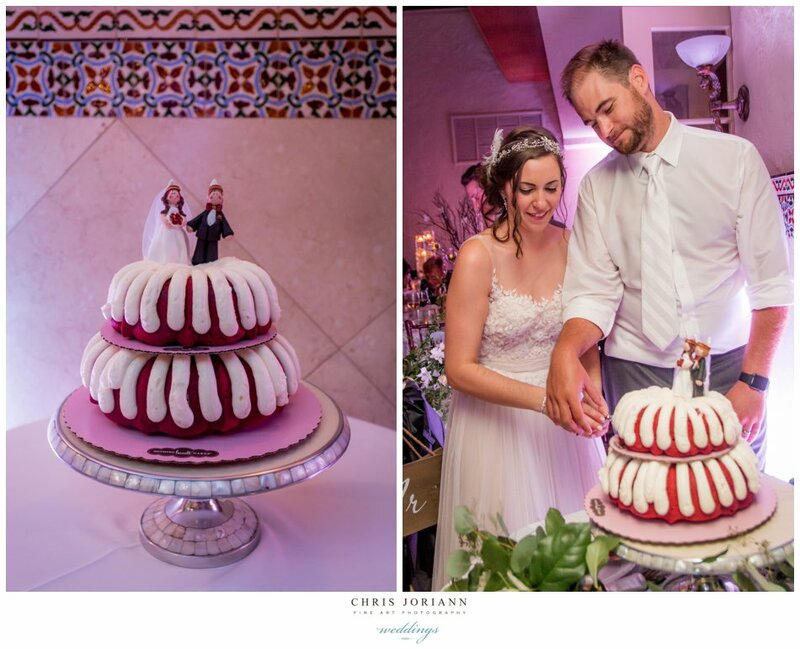 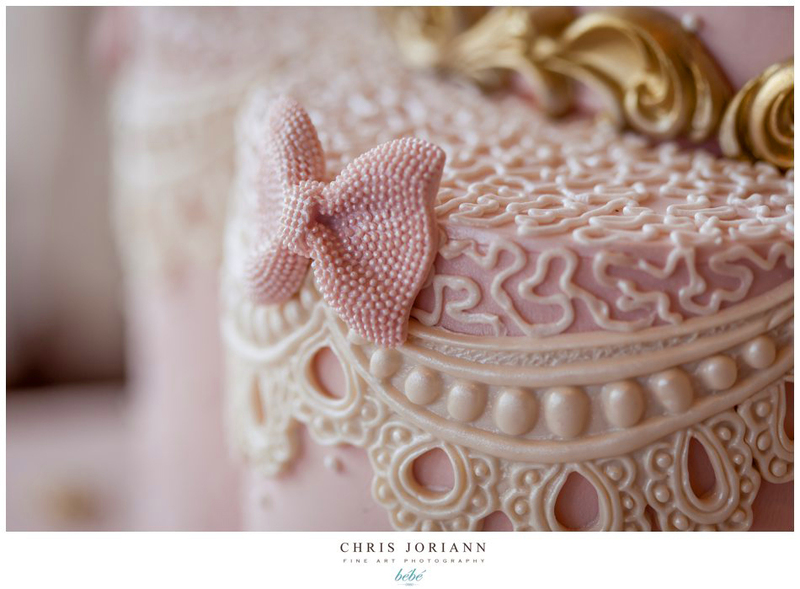 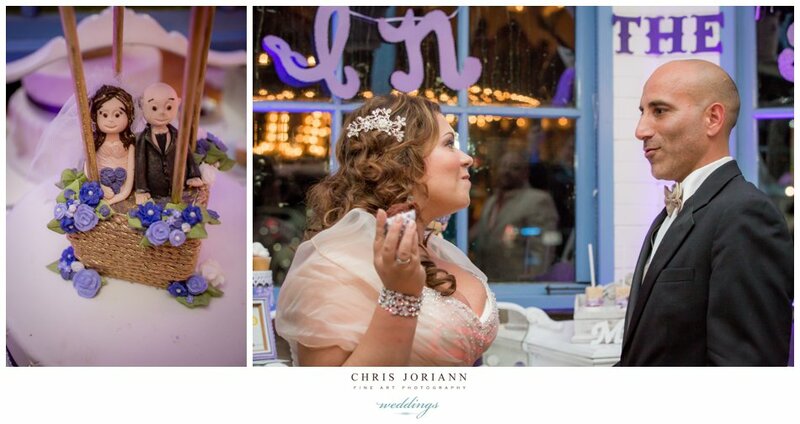 Beside the seminole topped, two-tiered, red velvet hand decorated bundt wedding cake by Nothing Bunt Cakes, sat two champagne glasses, dishes and cake knife purchased in Paris the night Ryan asked, “Veux-tu m’épouser?” during their Euro-Disney proposal. 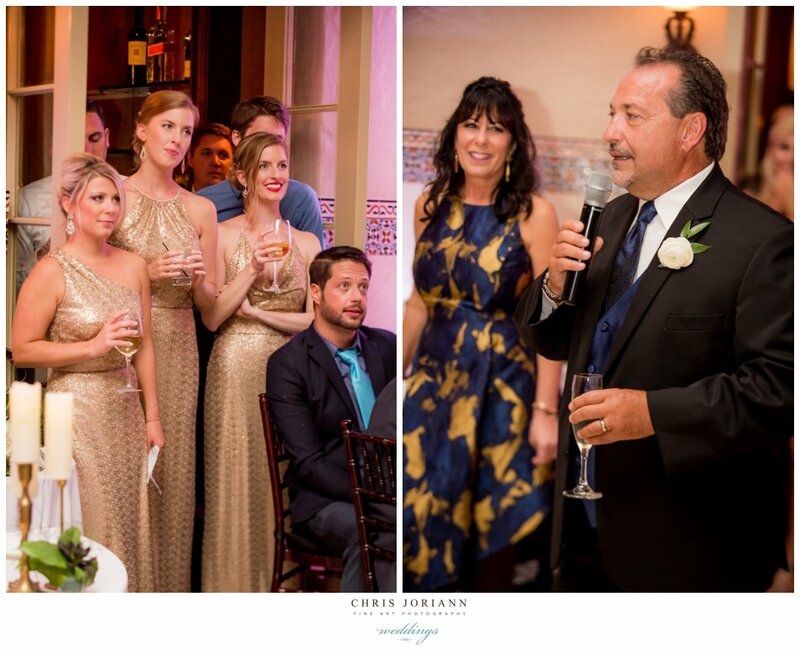 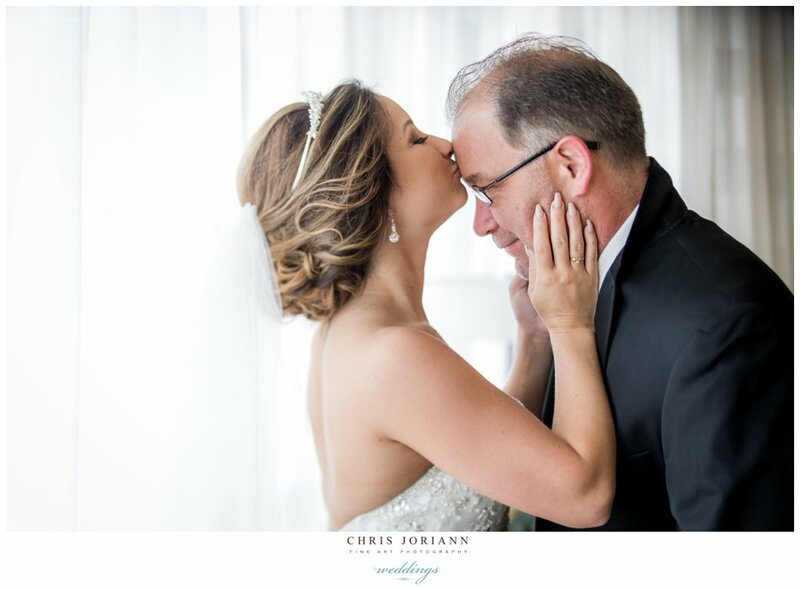 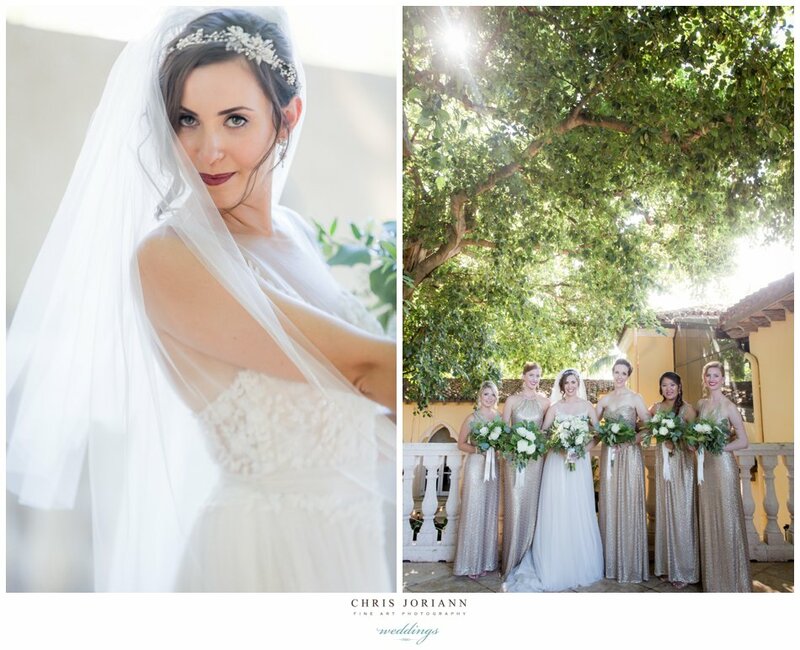 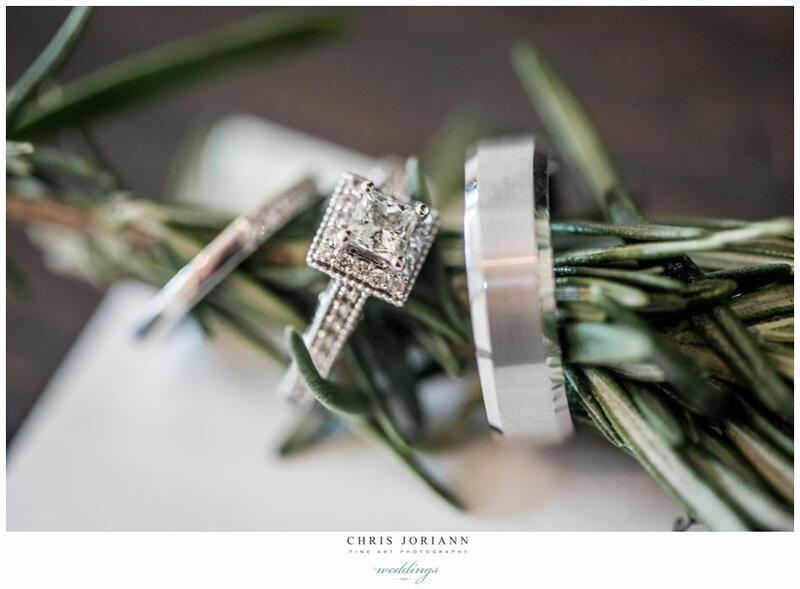 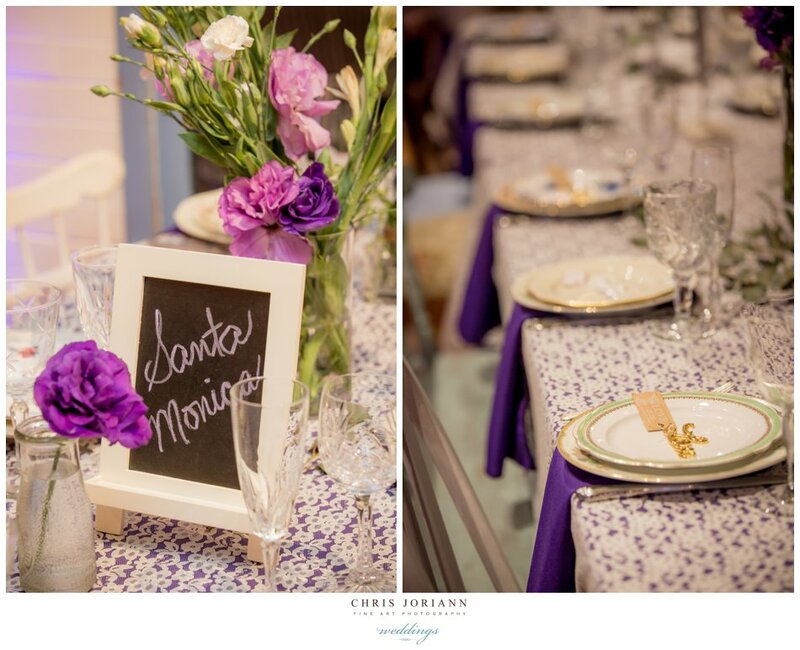 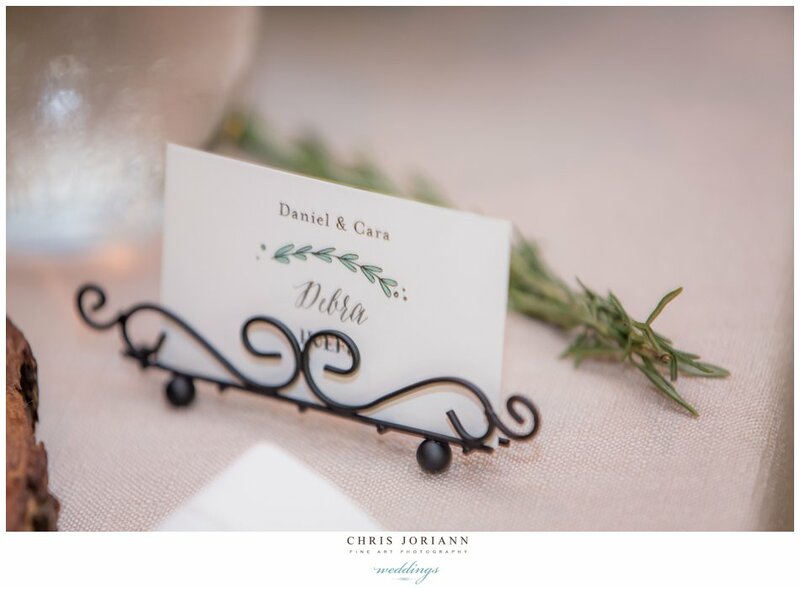 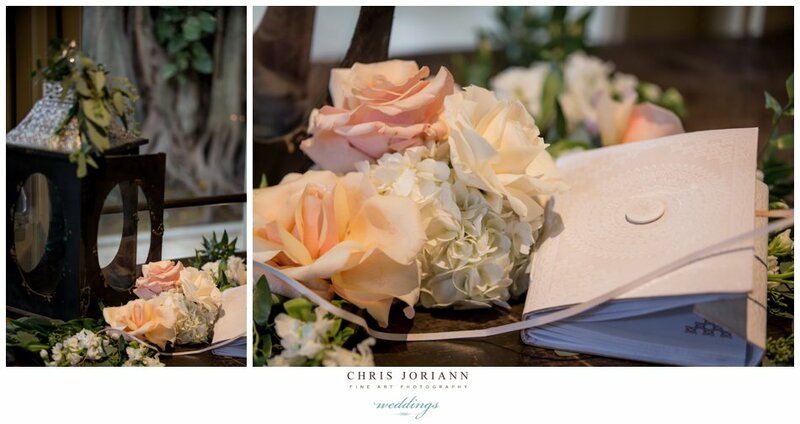 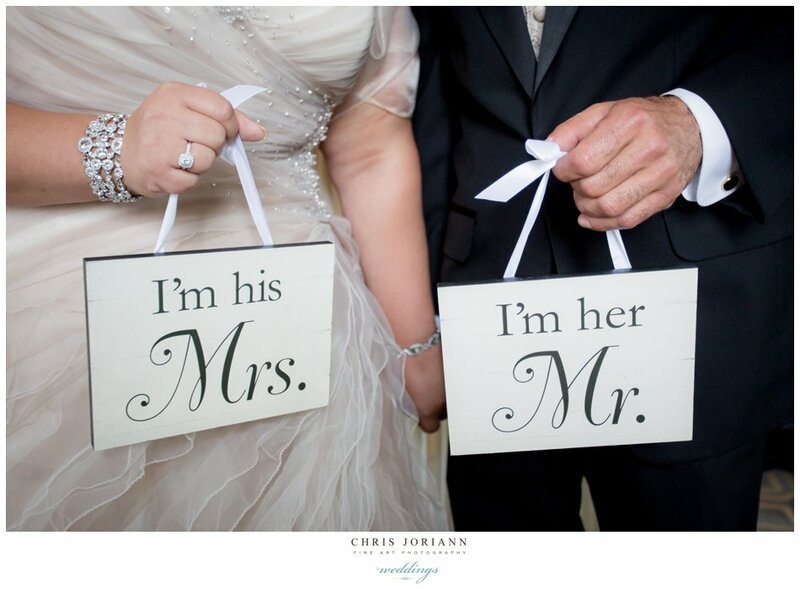 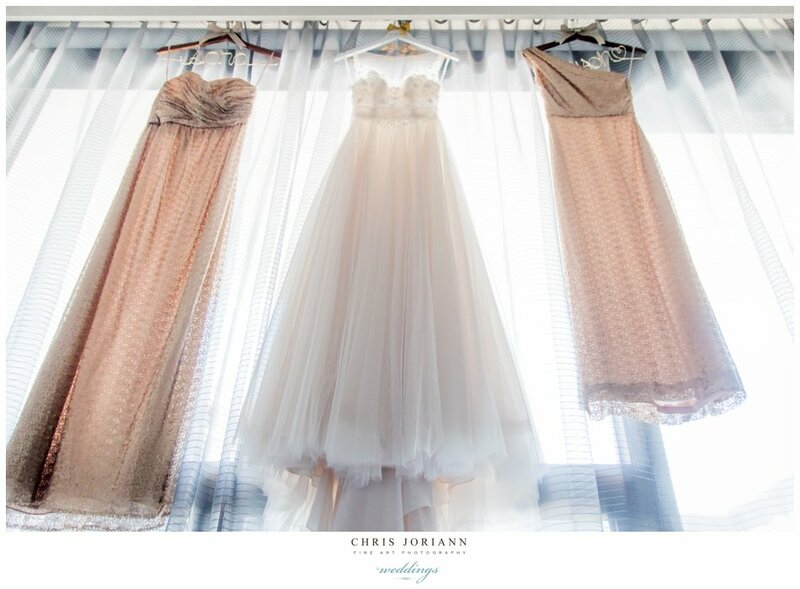 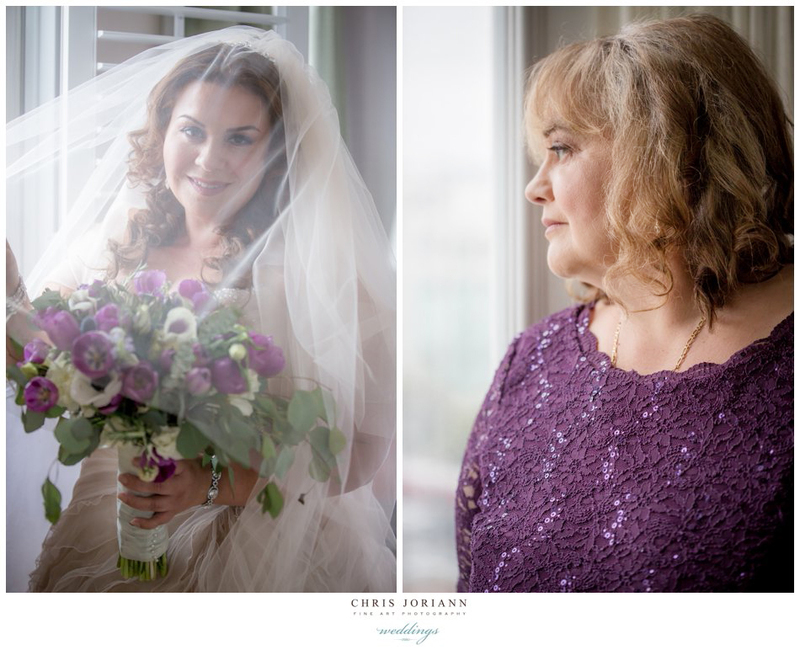 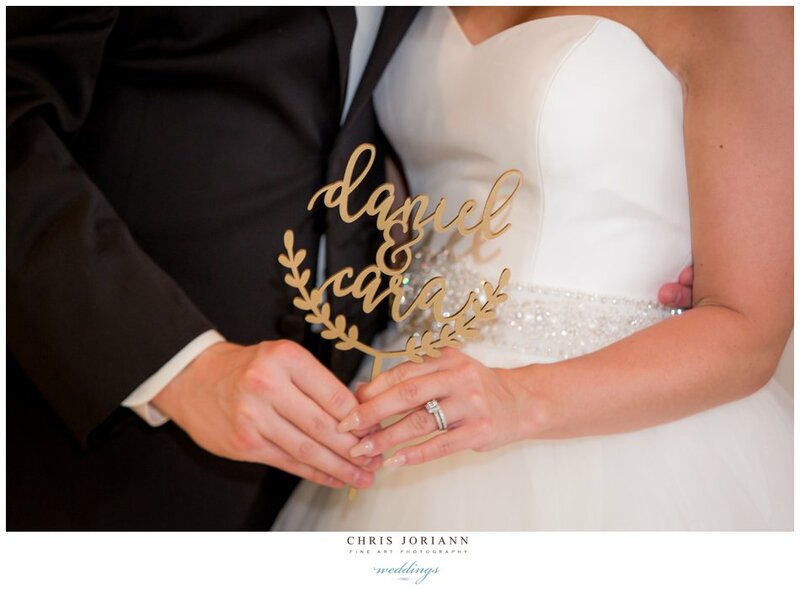 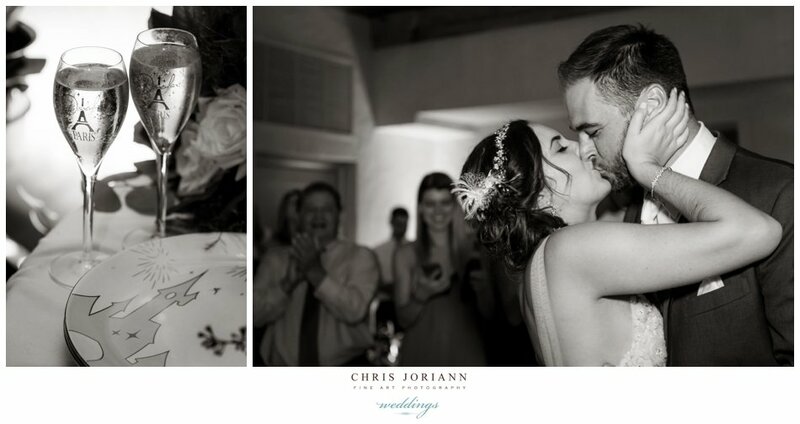 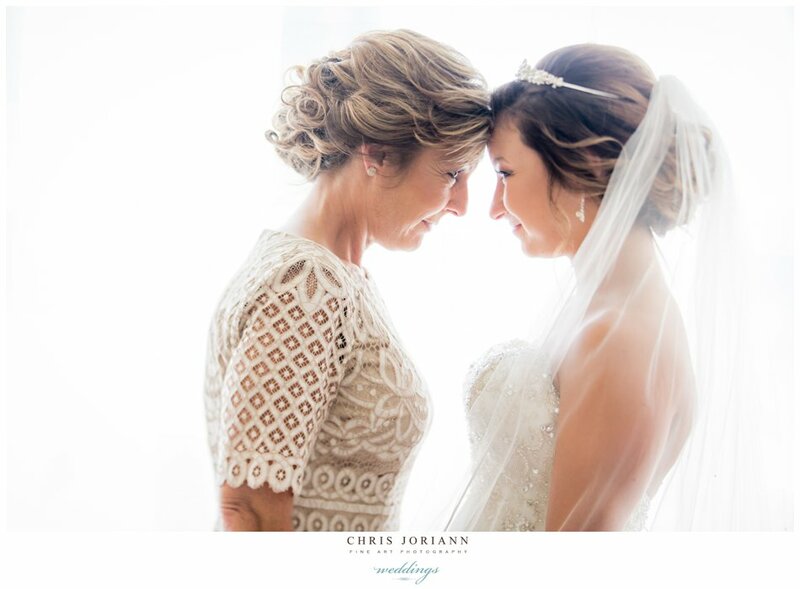 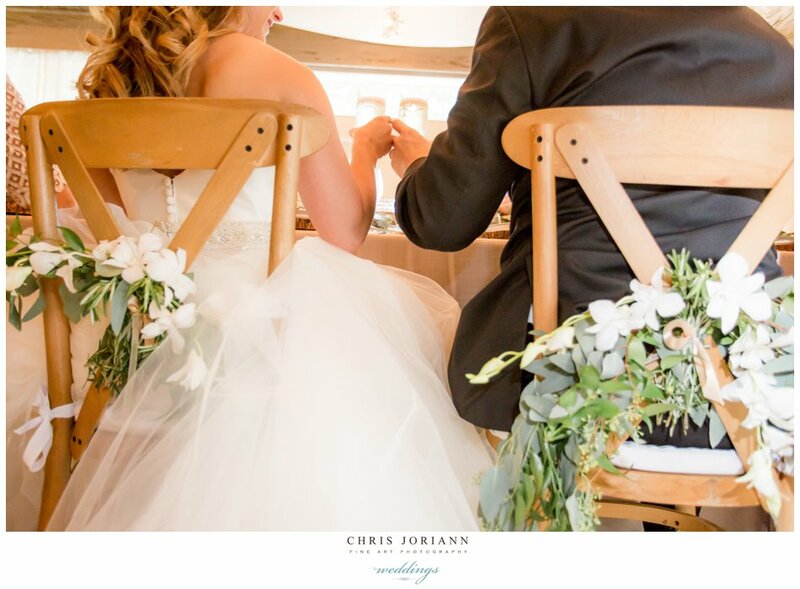 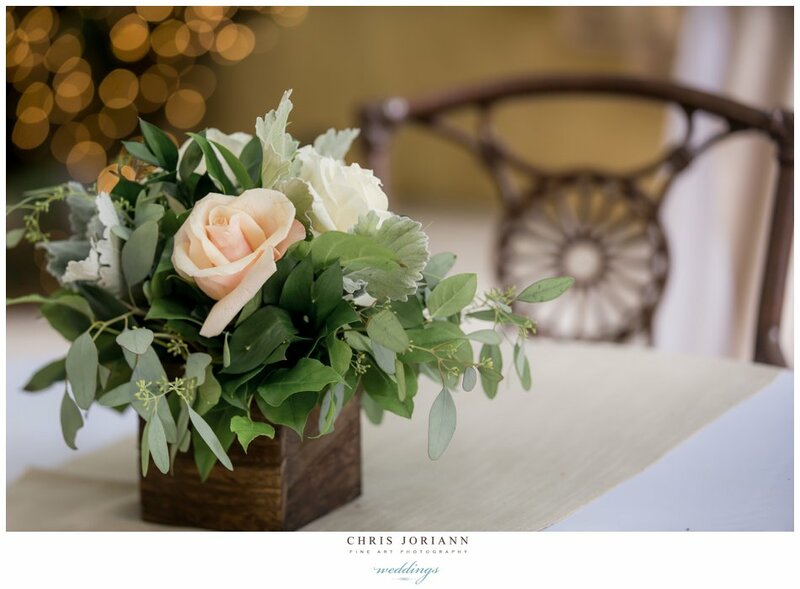 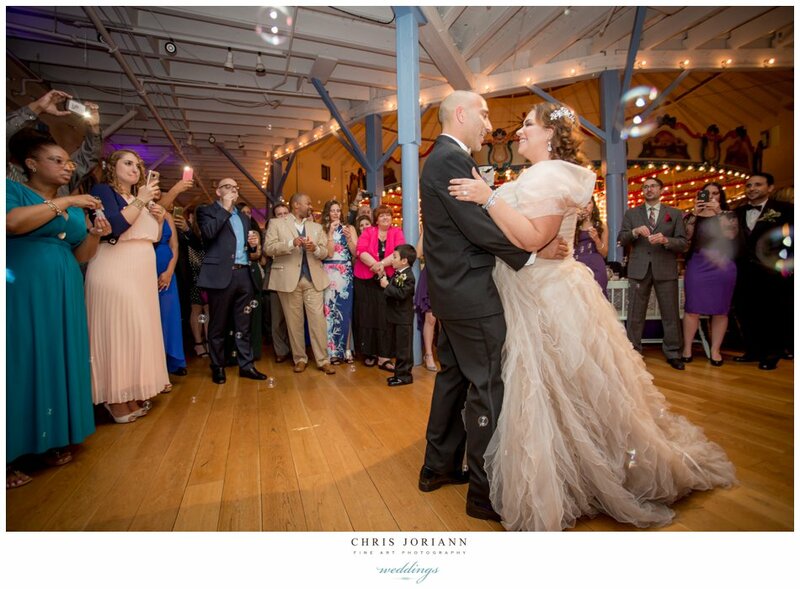 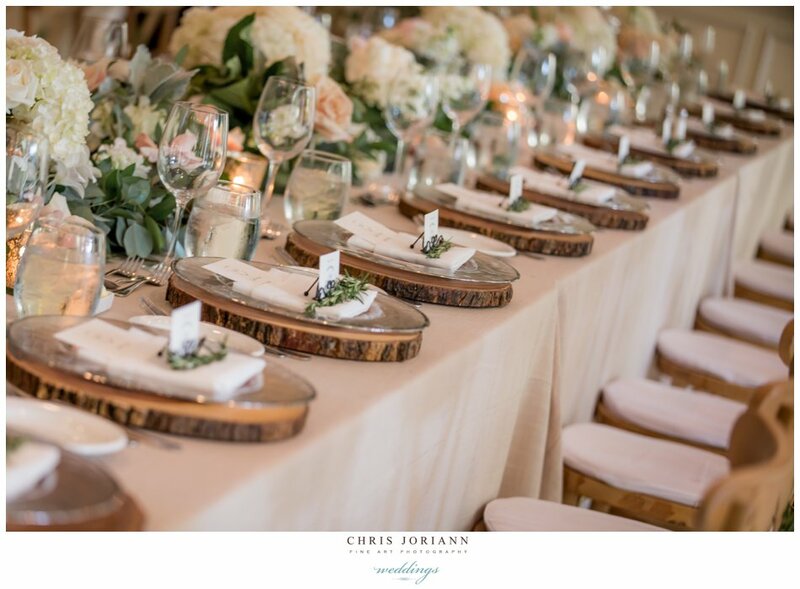 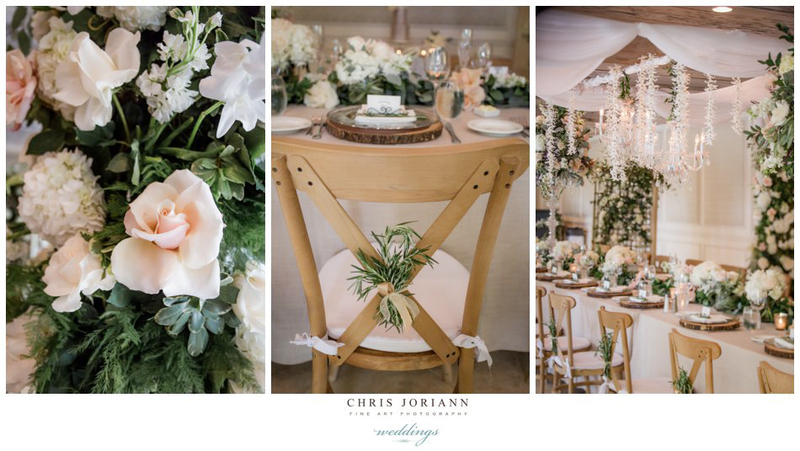 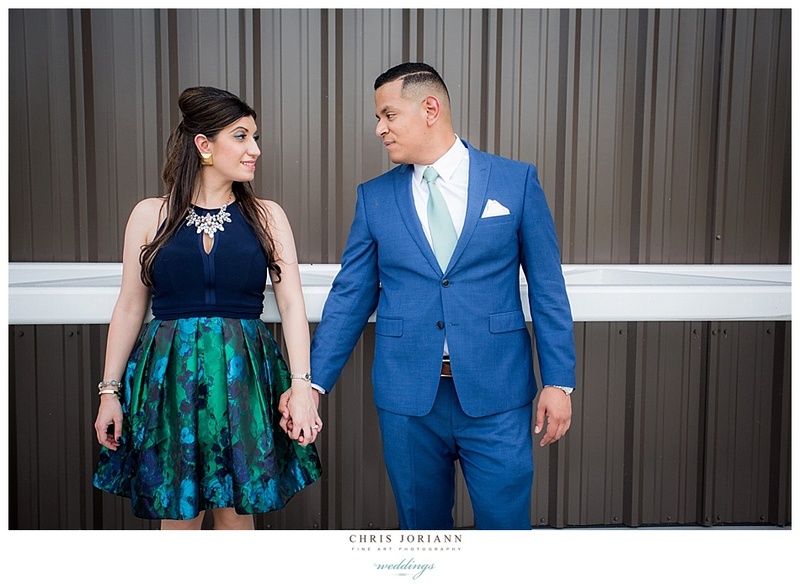 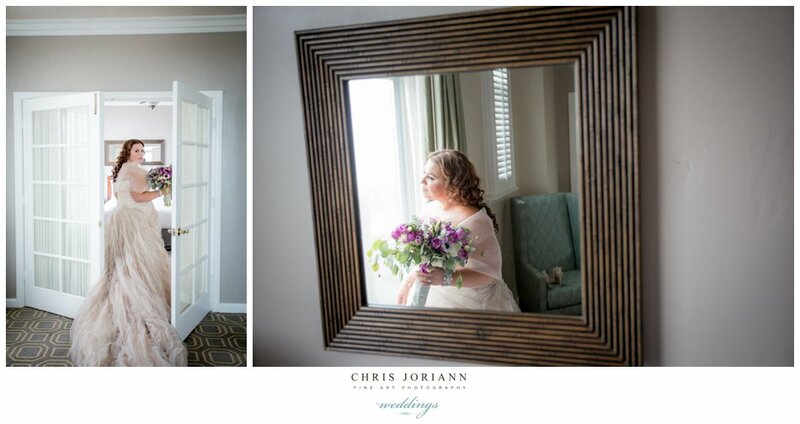 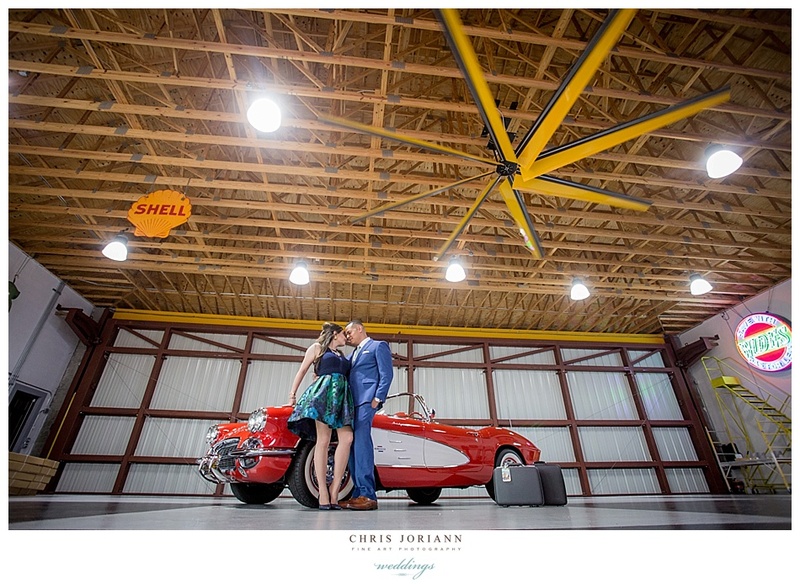 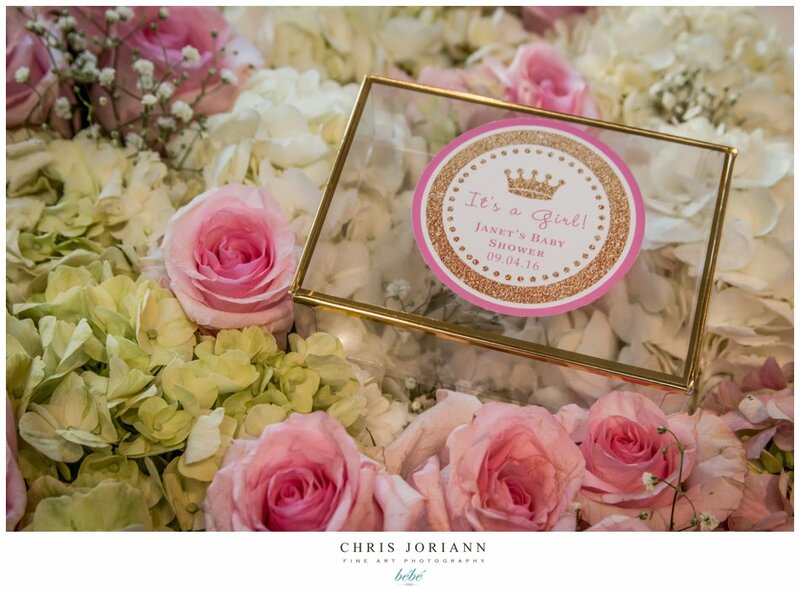 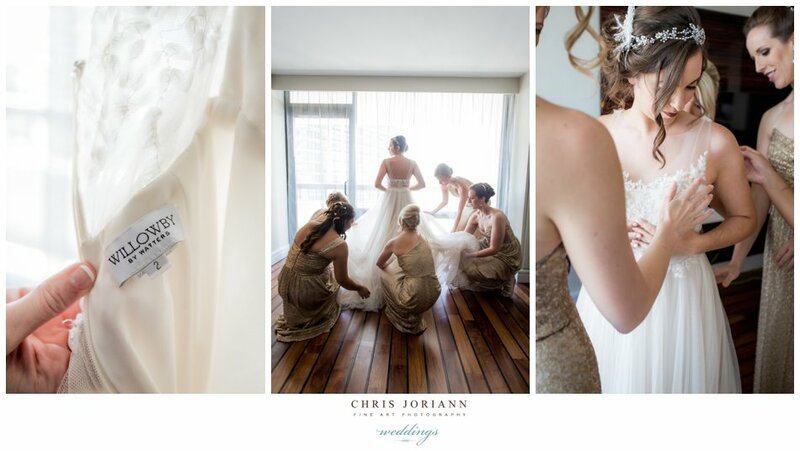 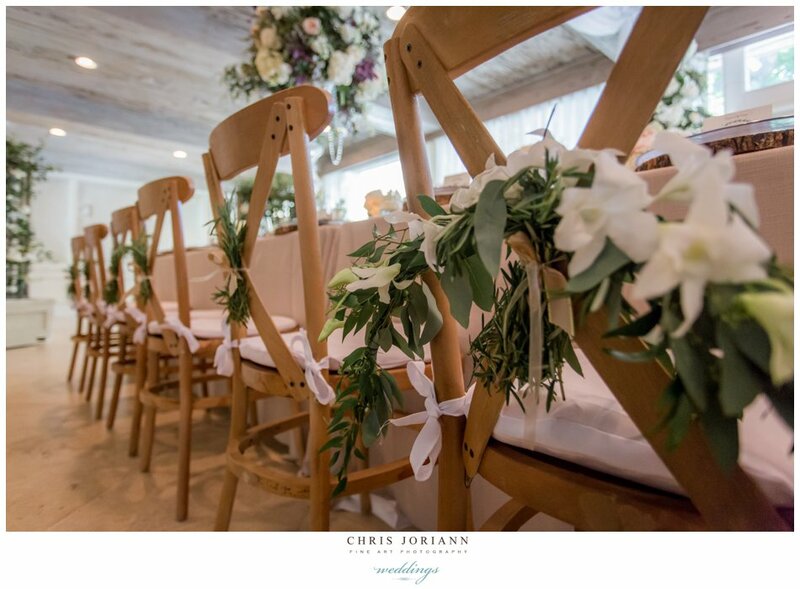 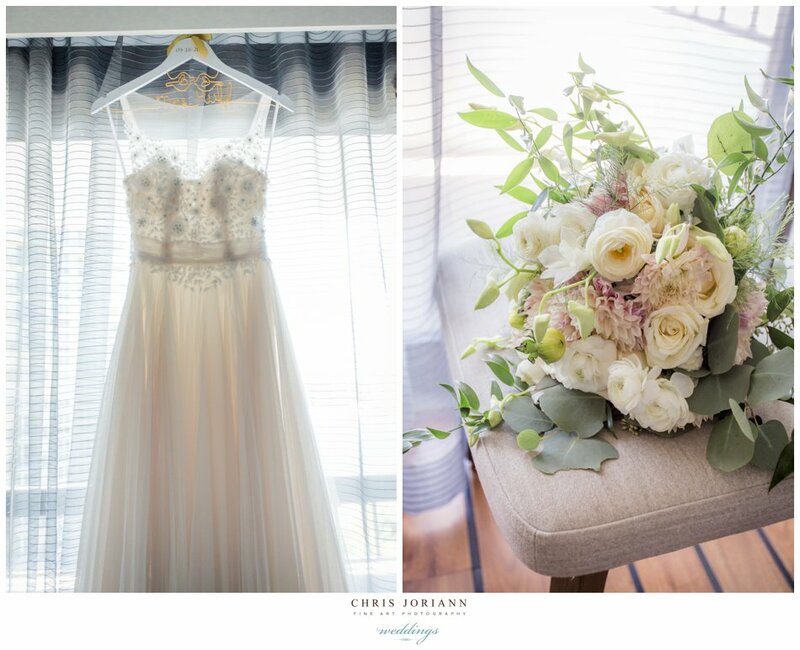 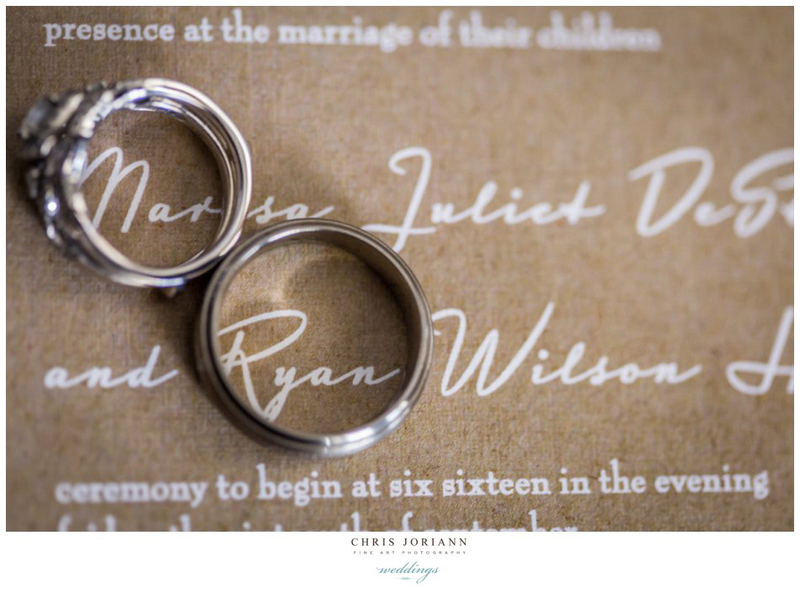 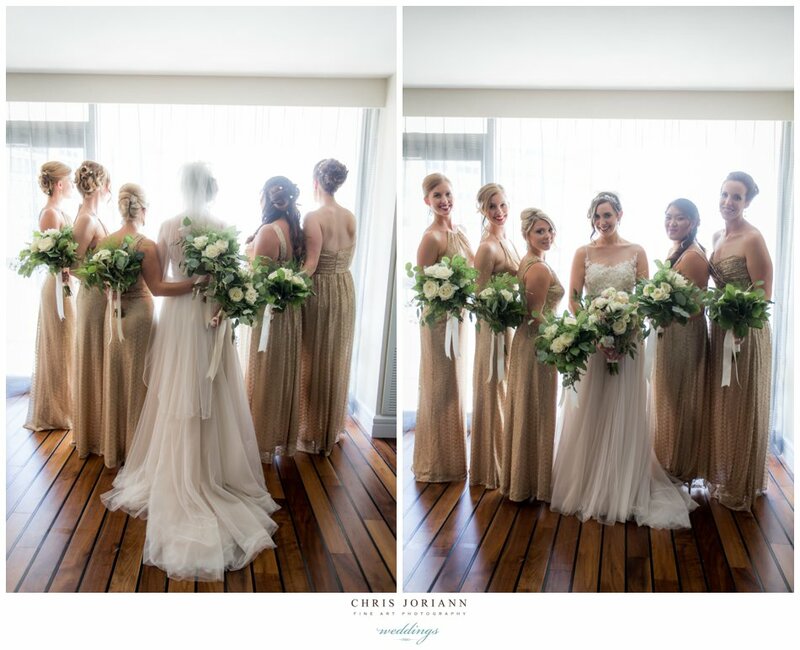 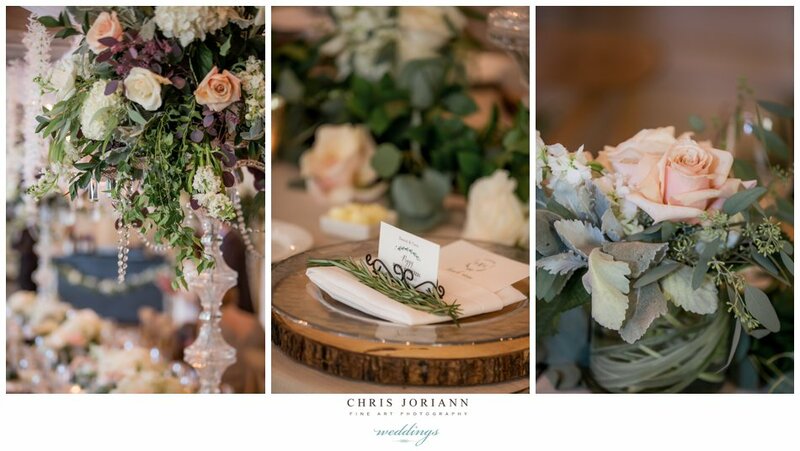 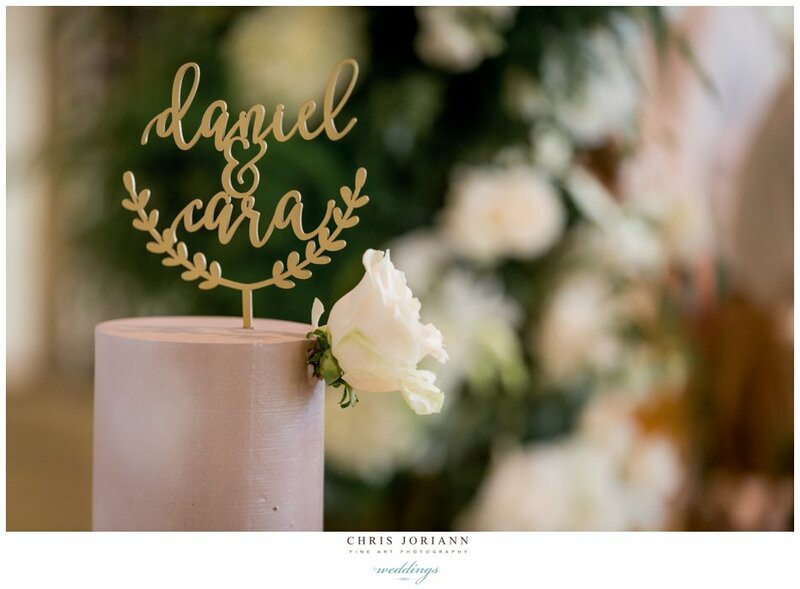 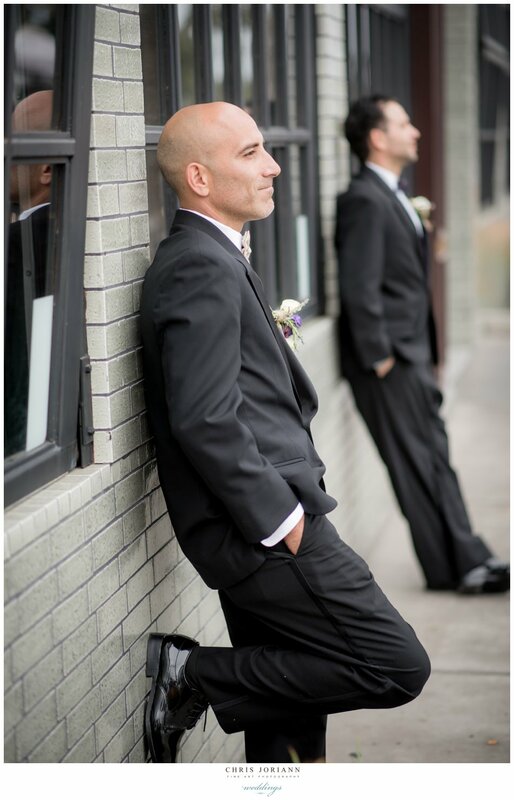 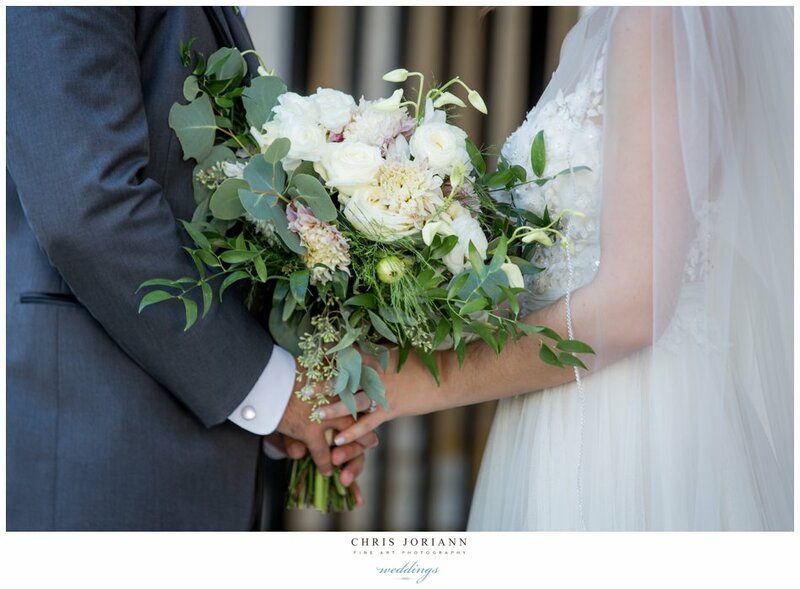 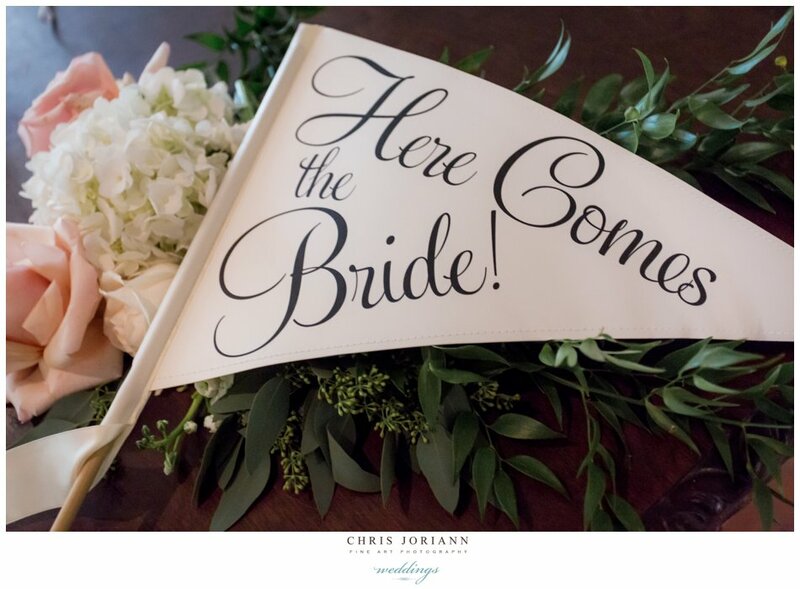 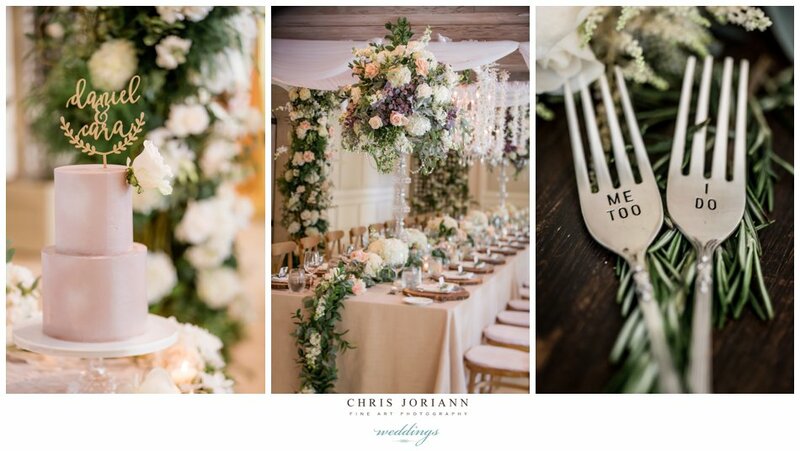 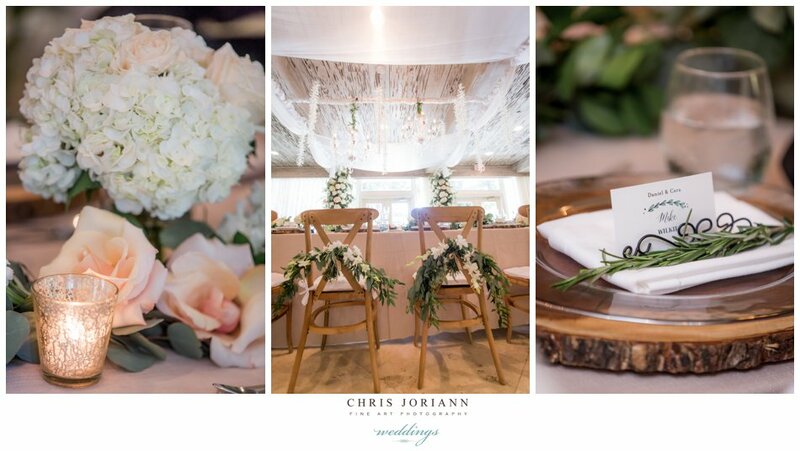 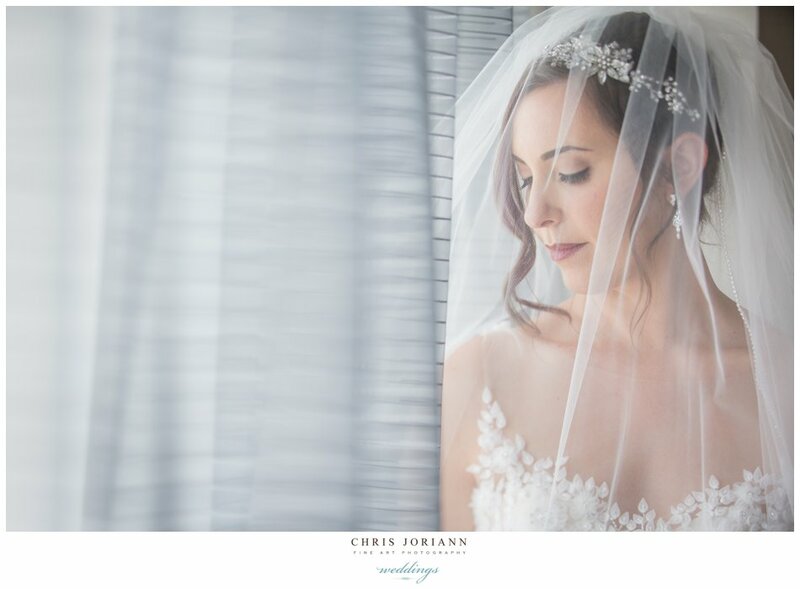 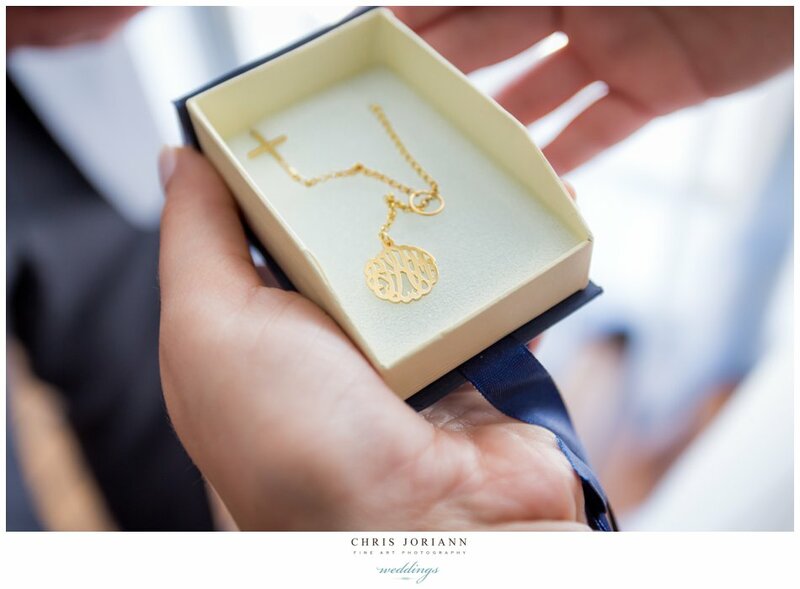 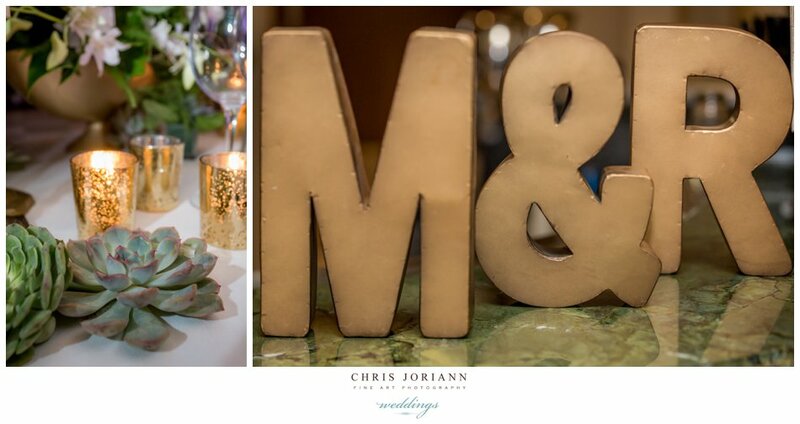 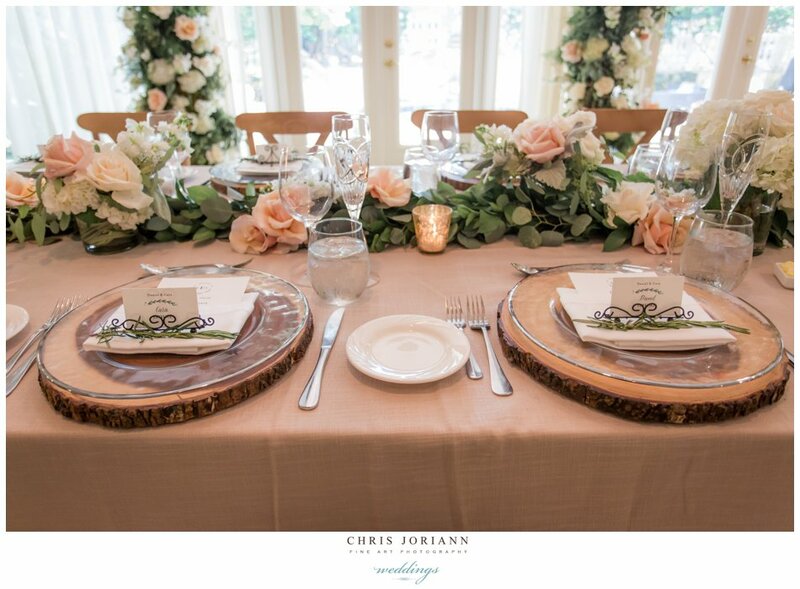 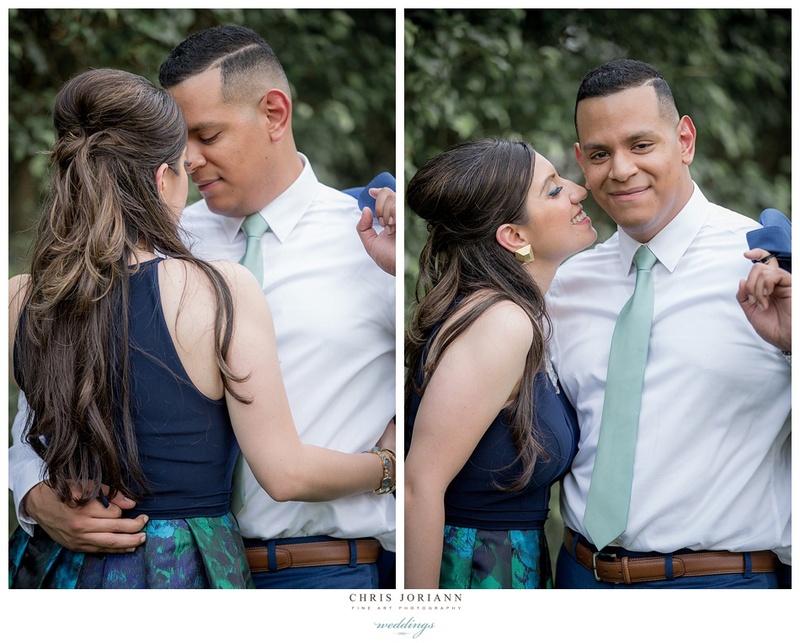 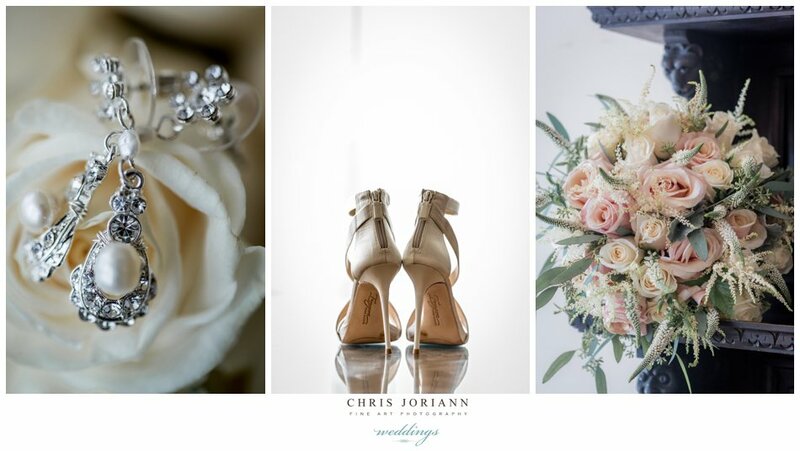 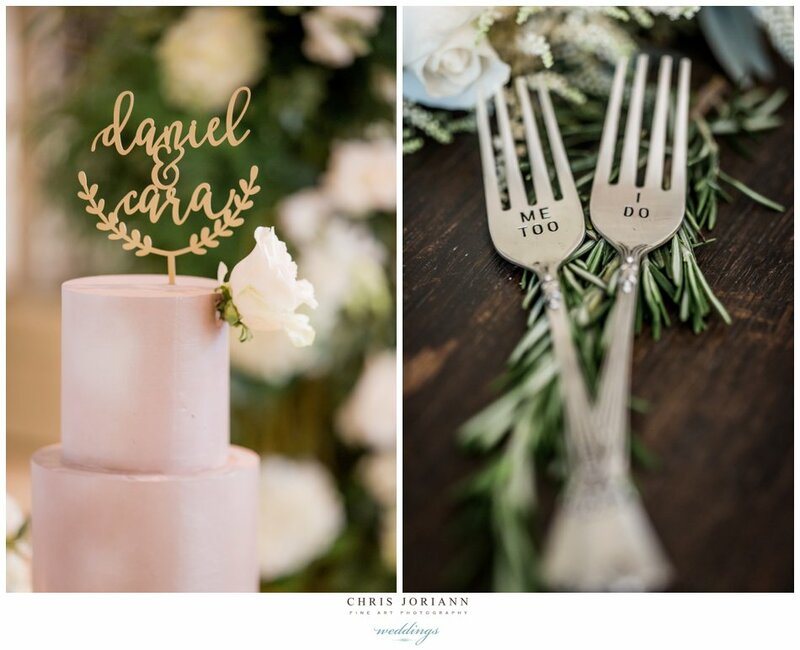 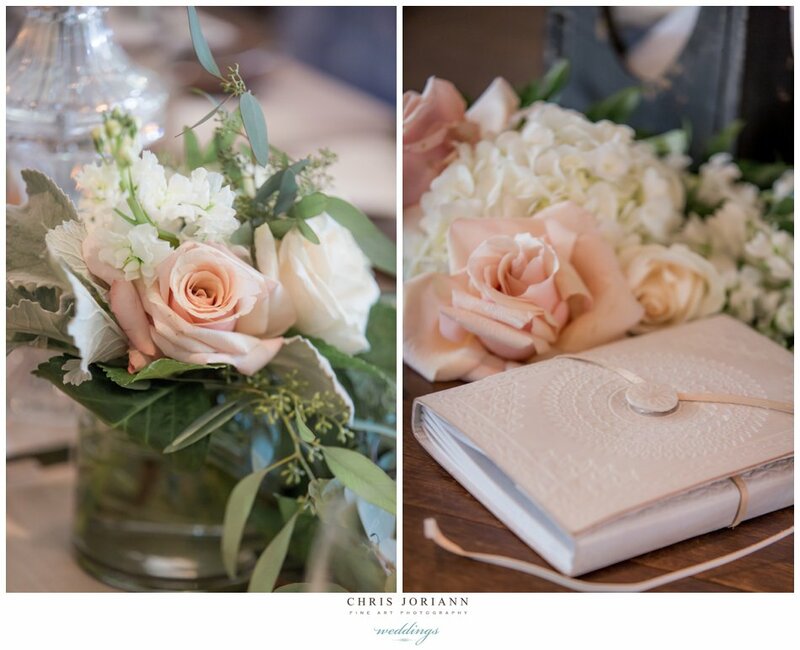 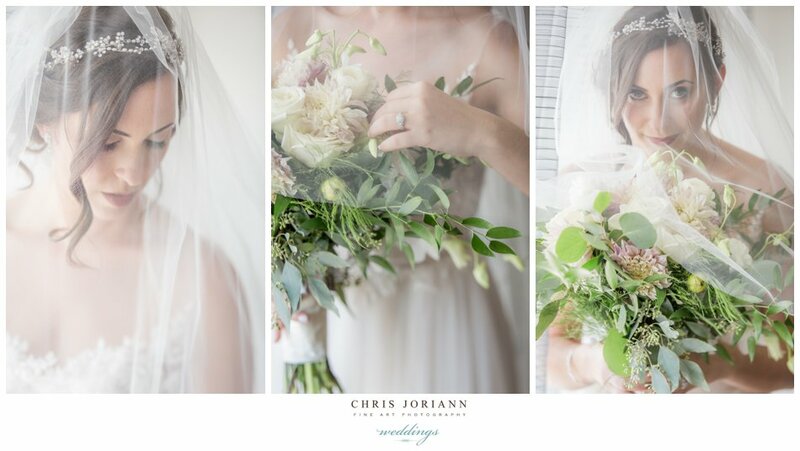 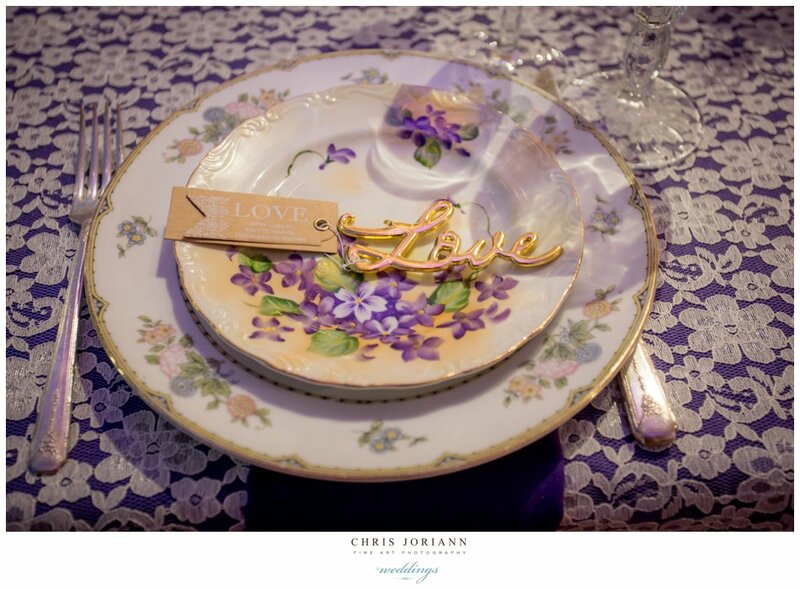 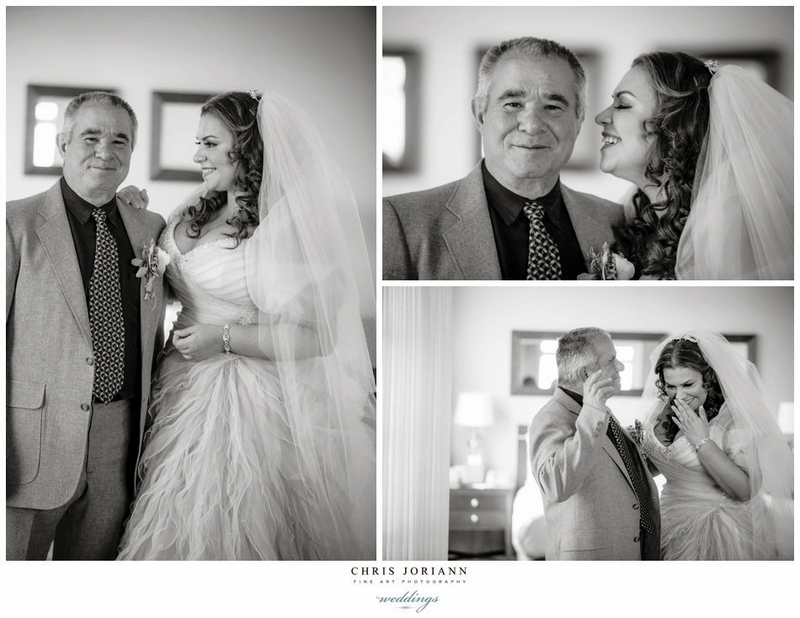 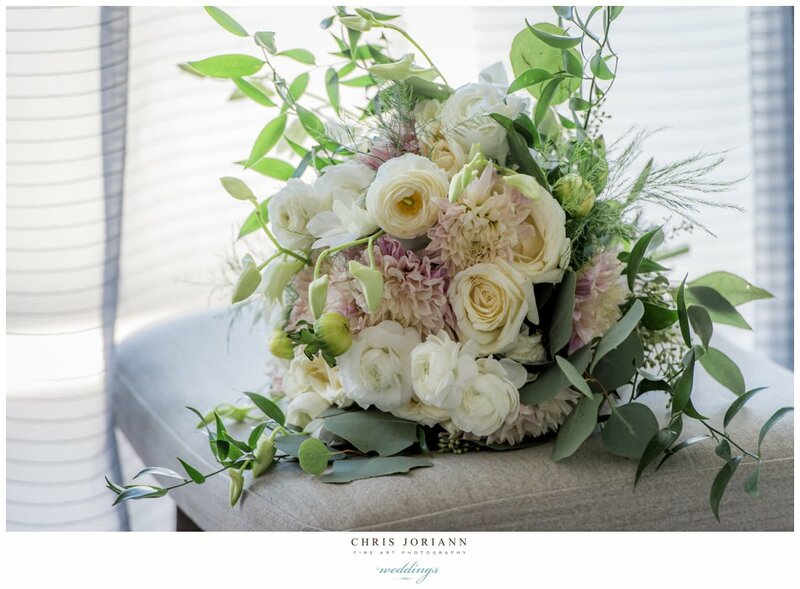 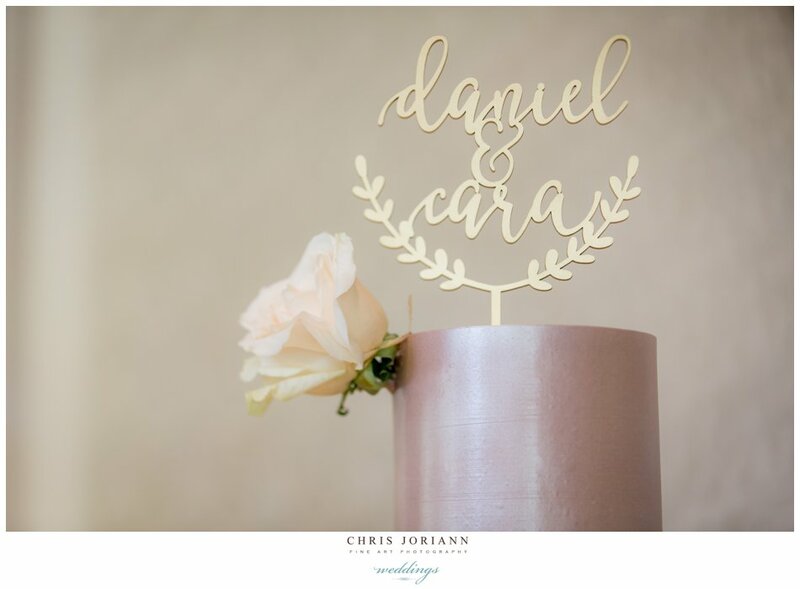 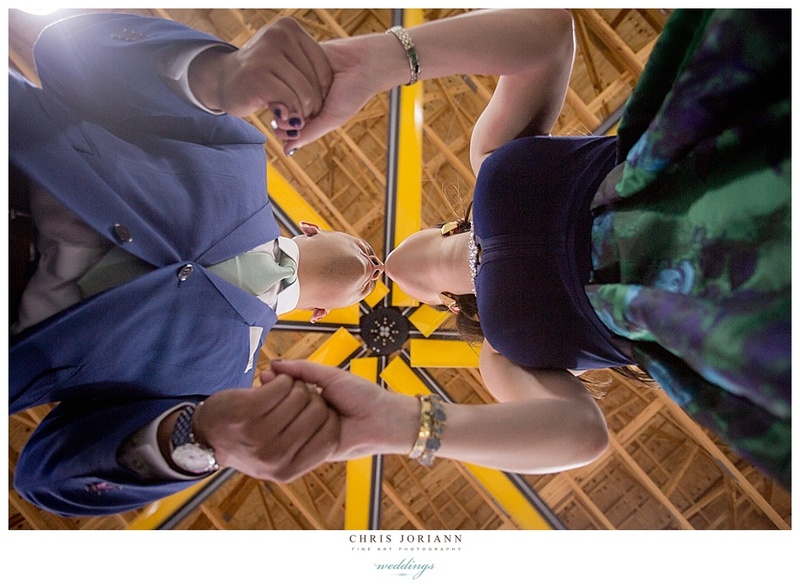 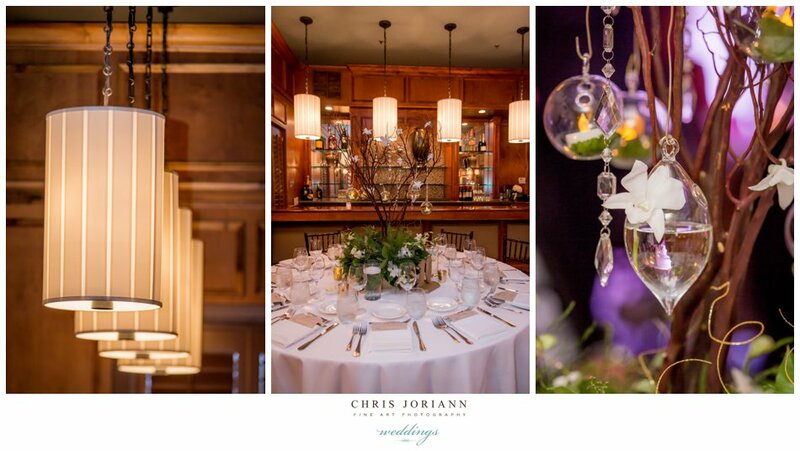 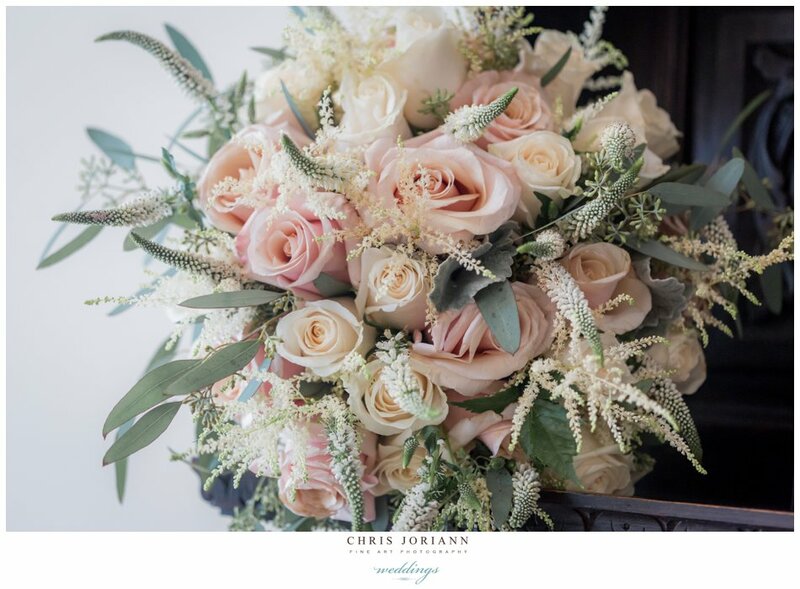 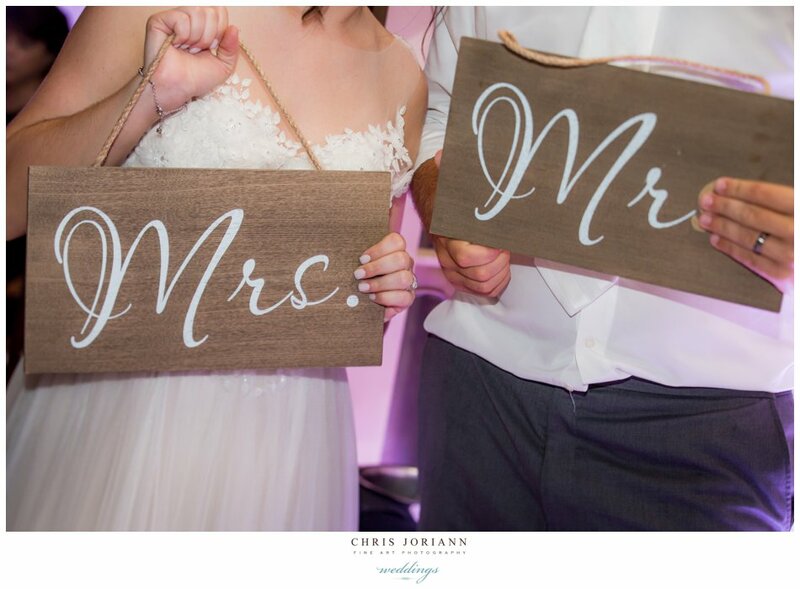 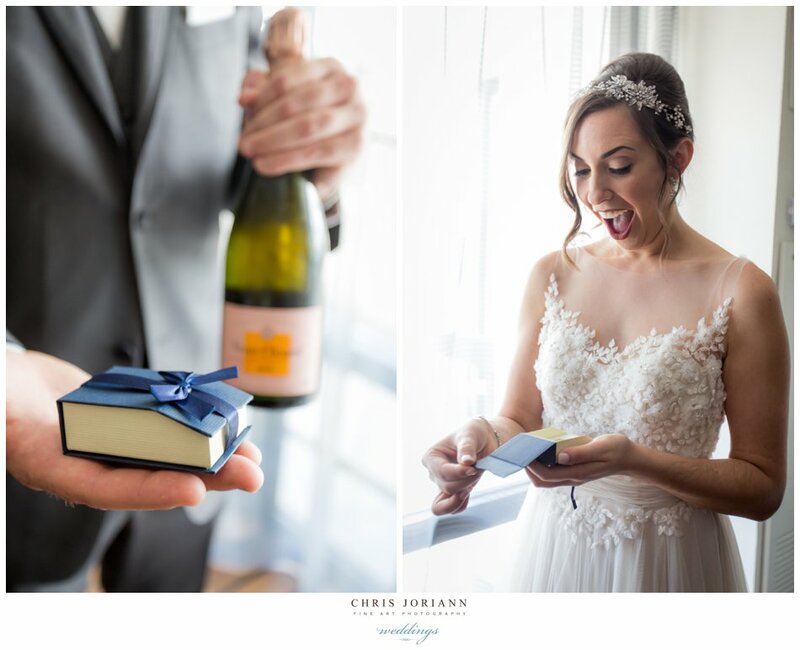 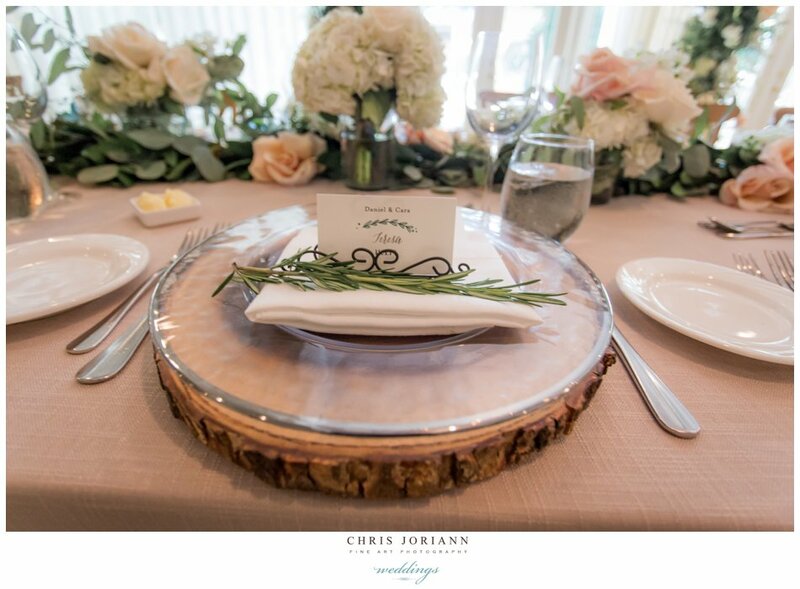 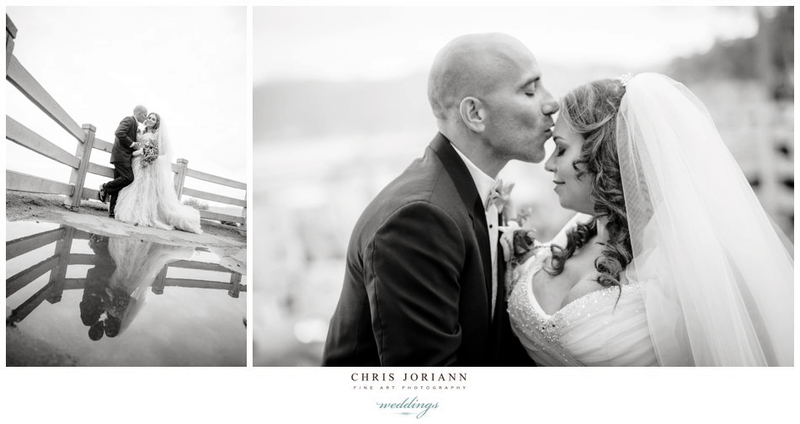 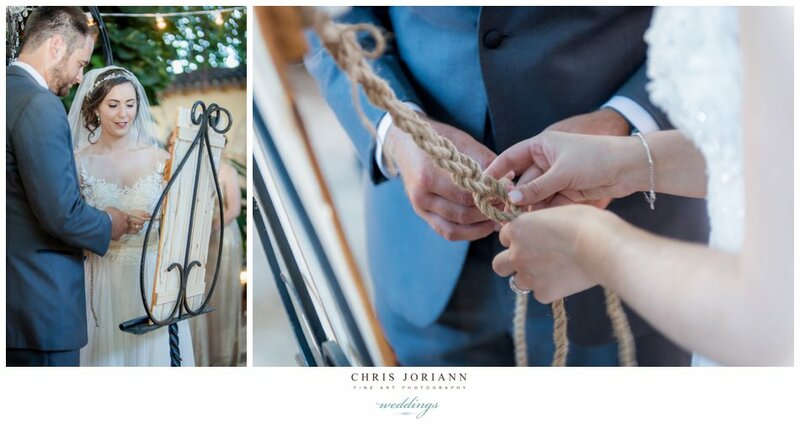 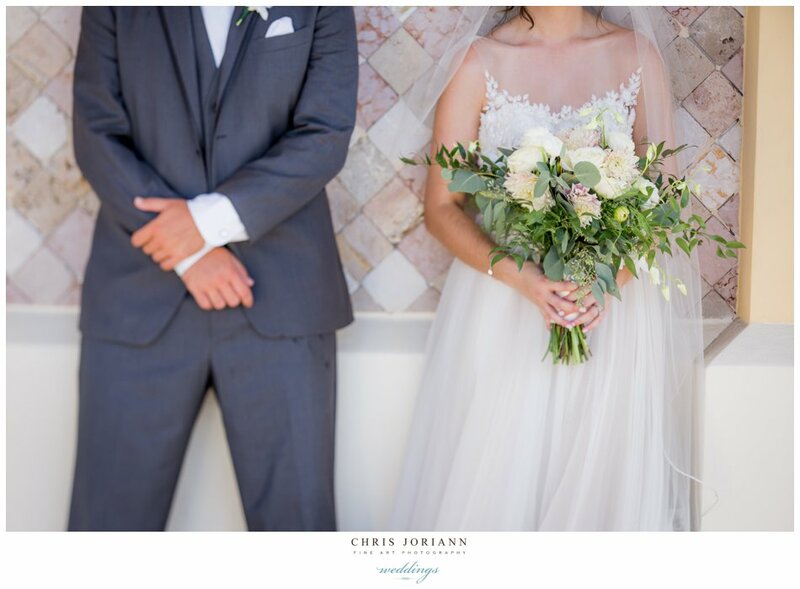 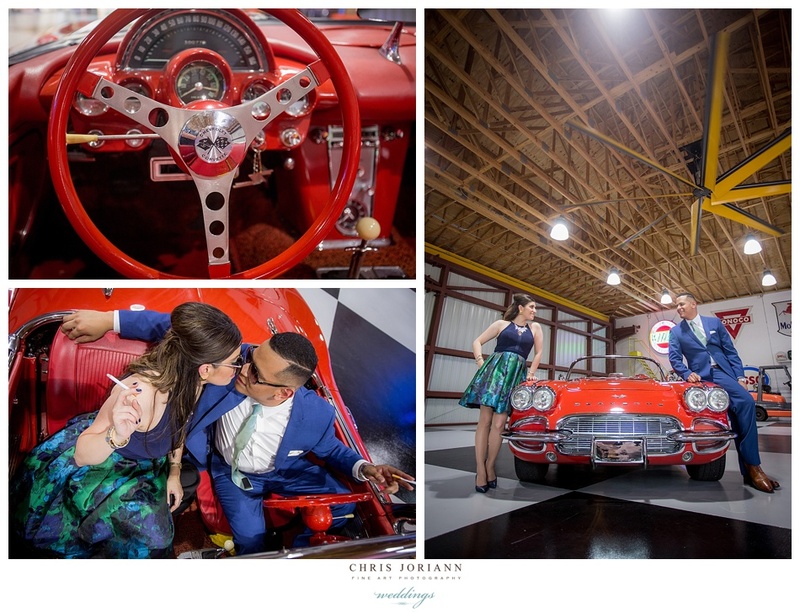 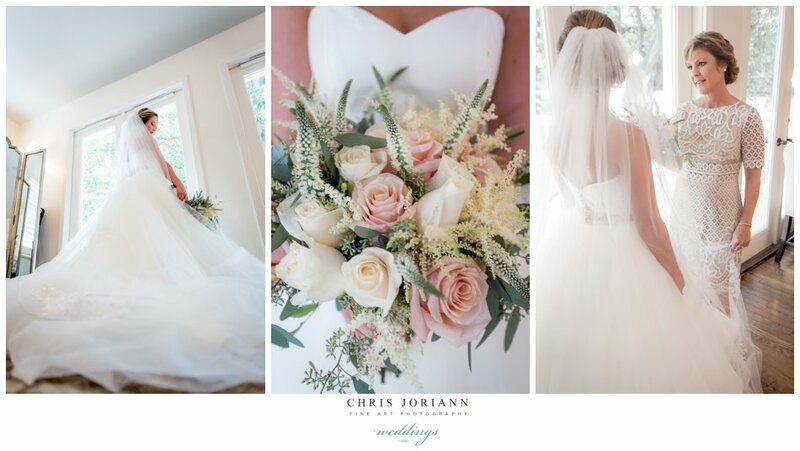 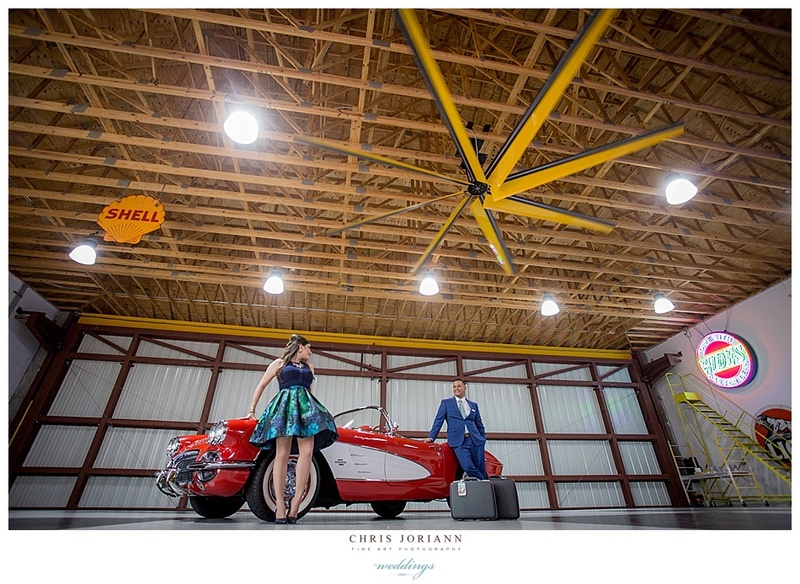 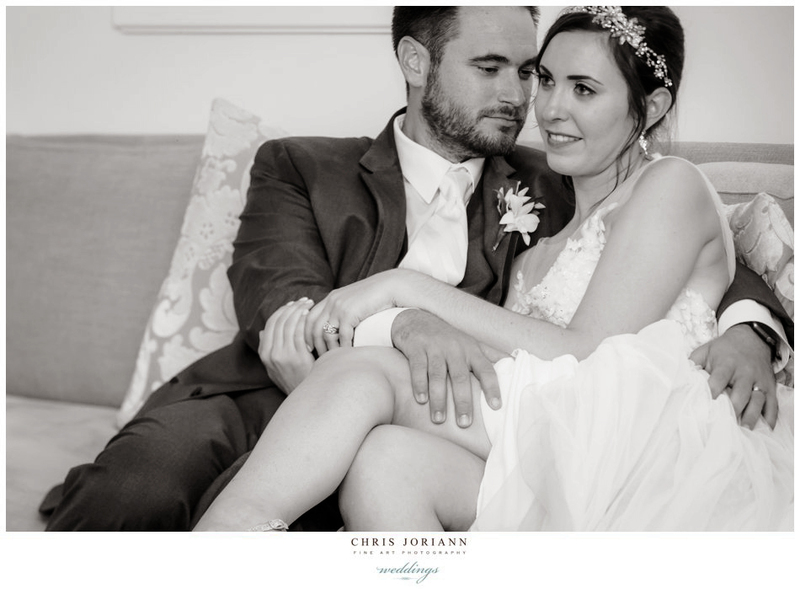 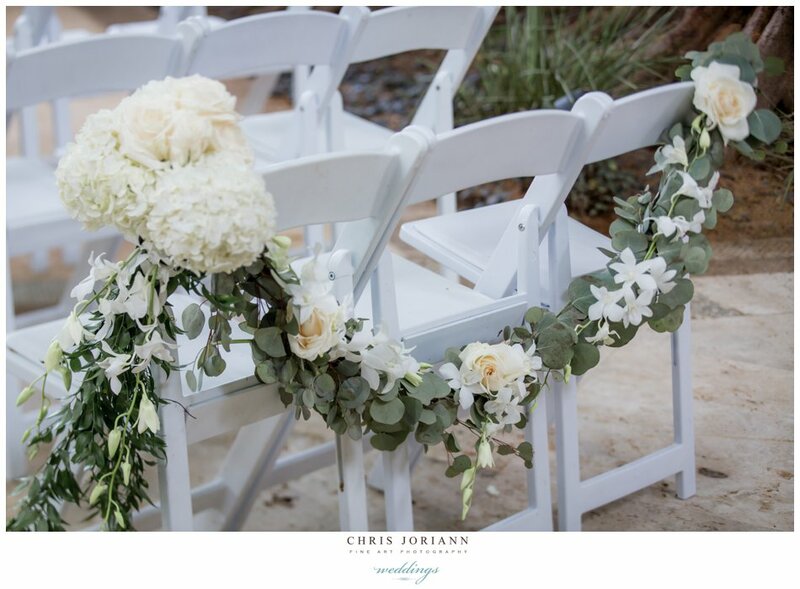 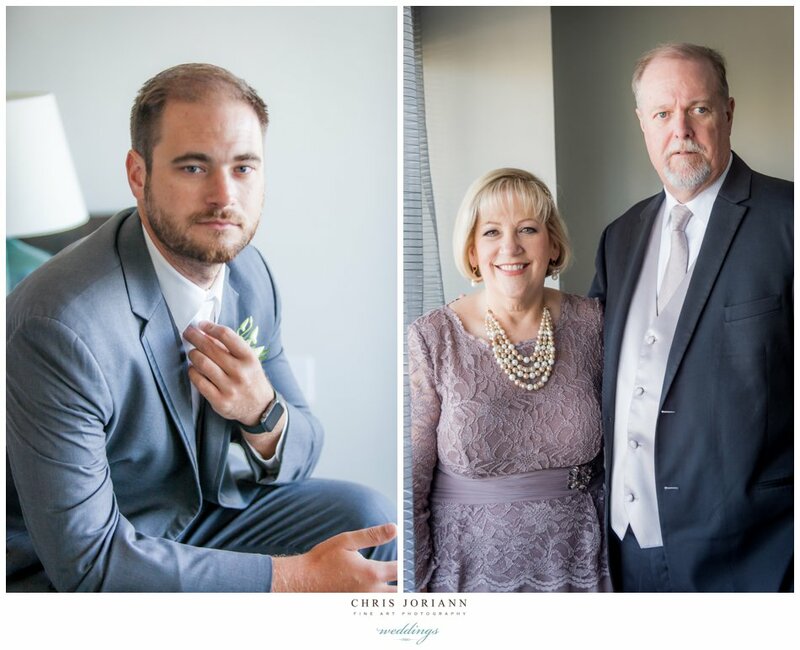 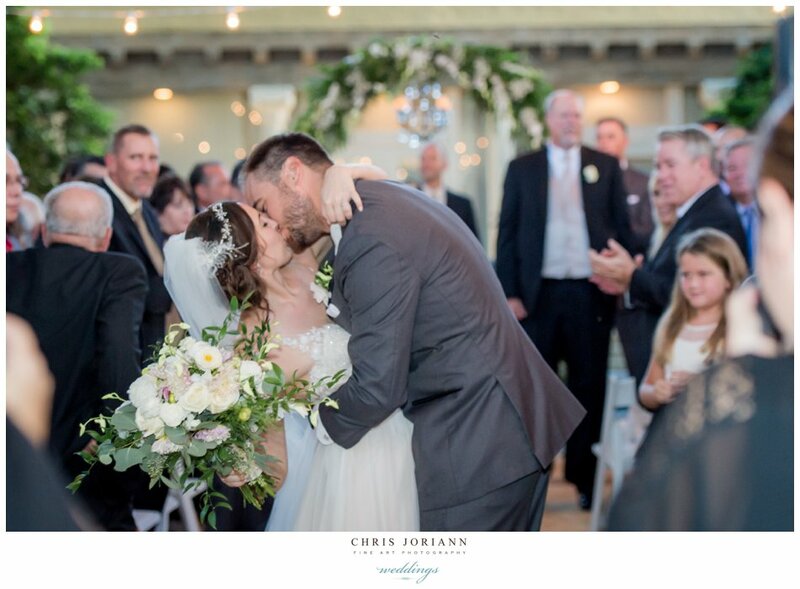 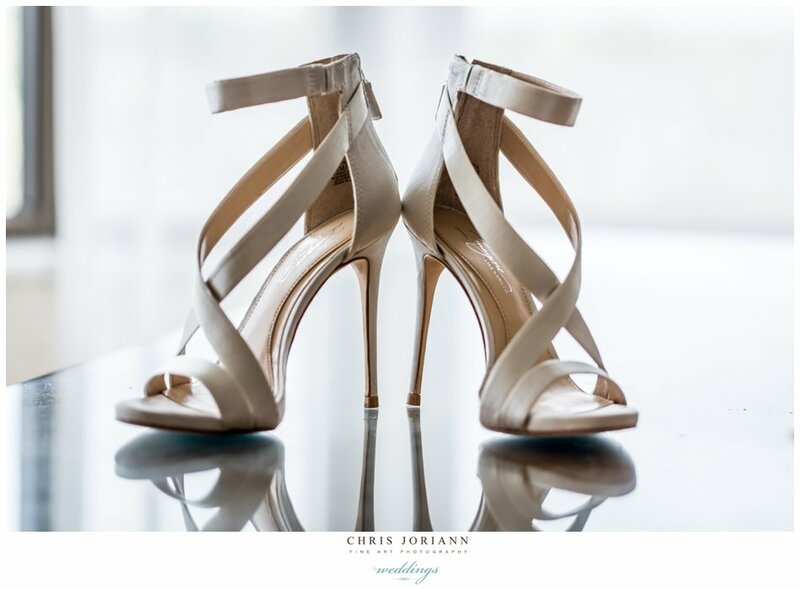 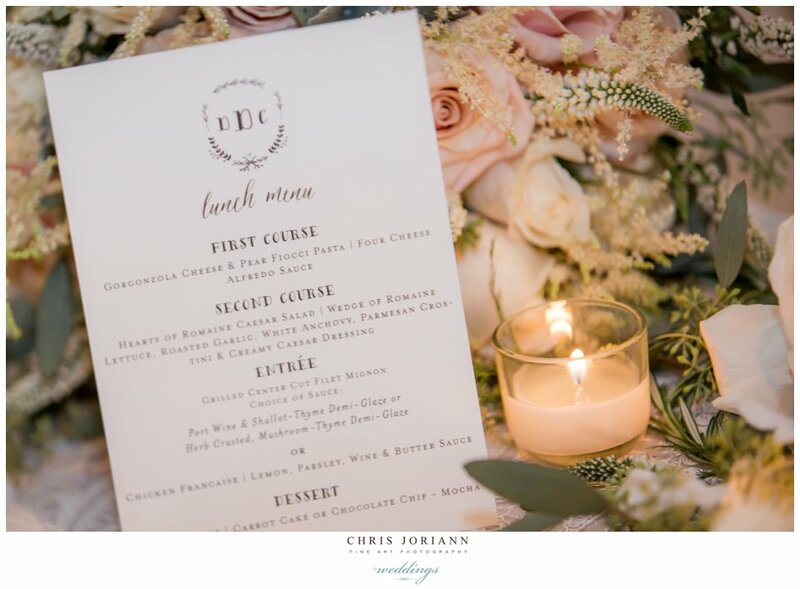 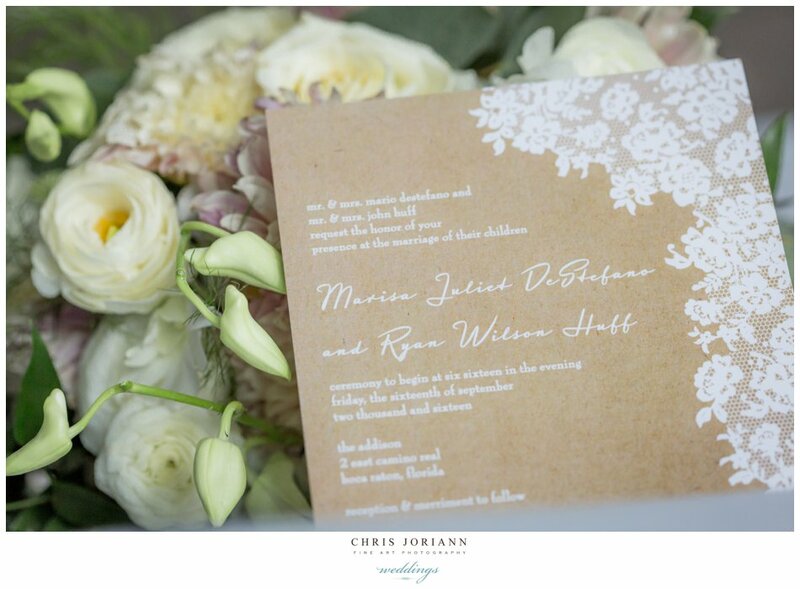 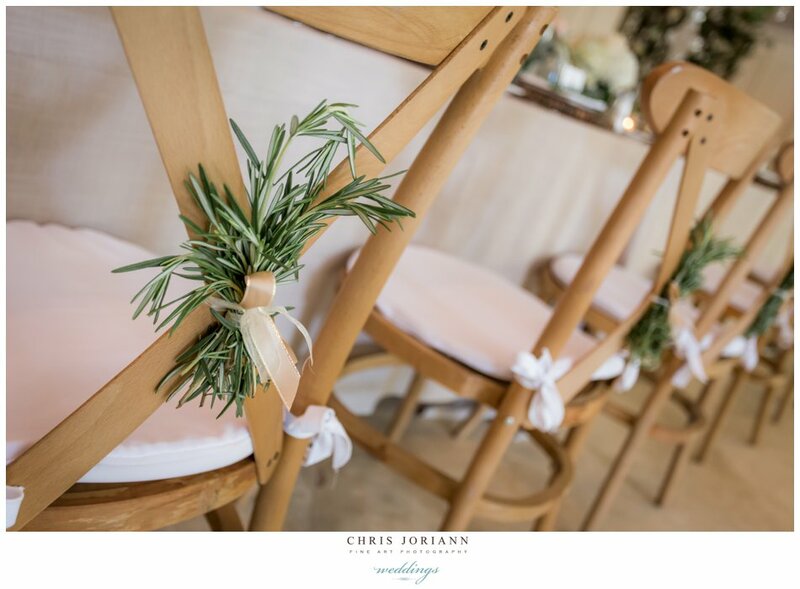 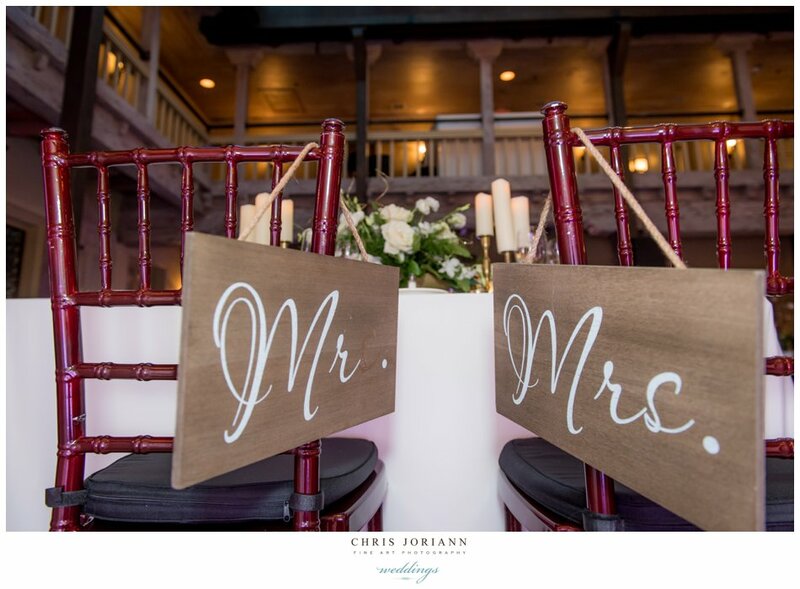 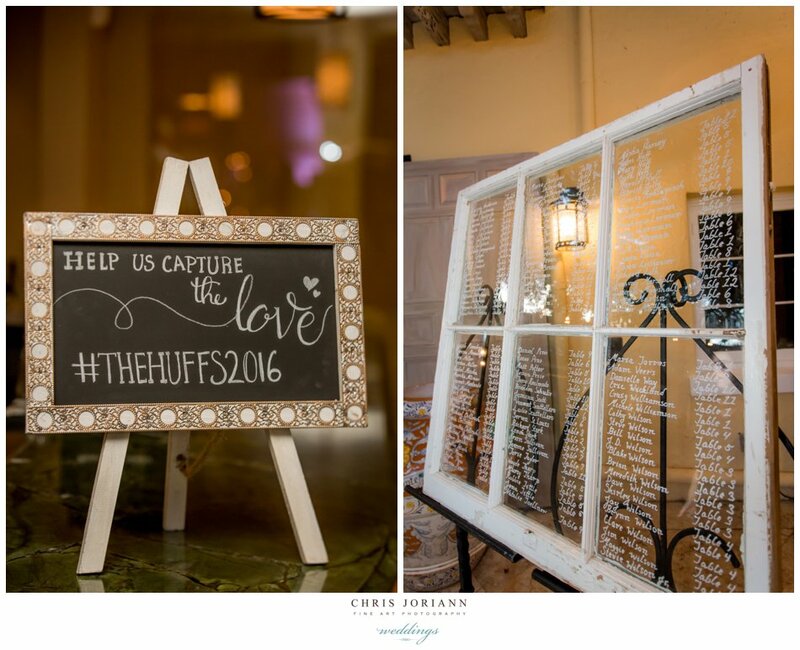 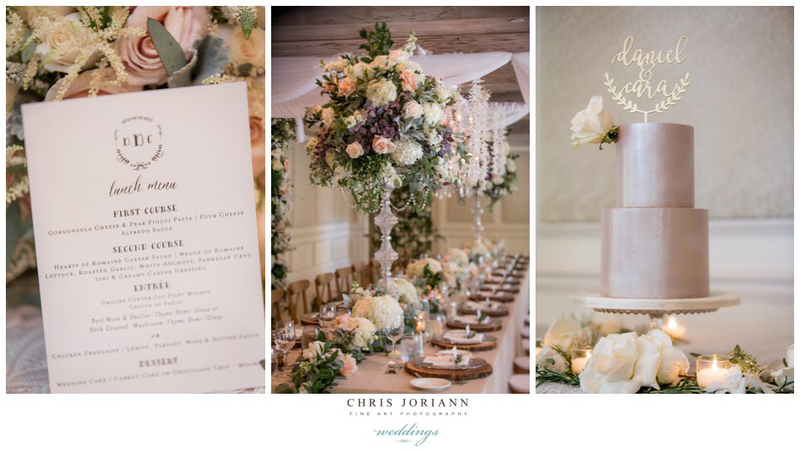 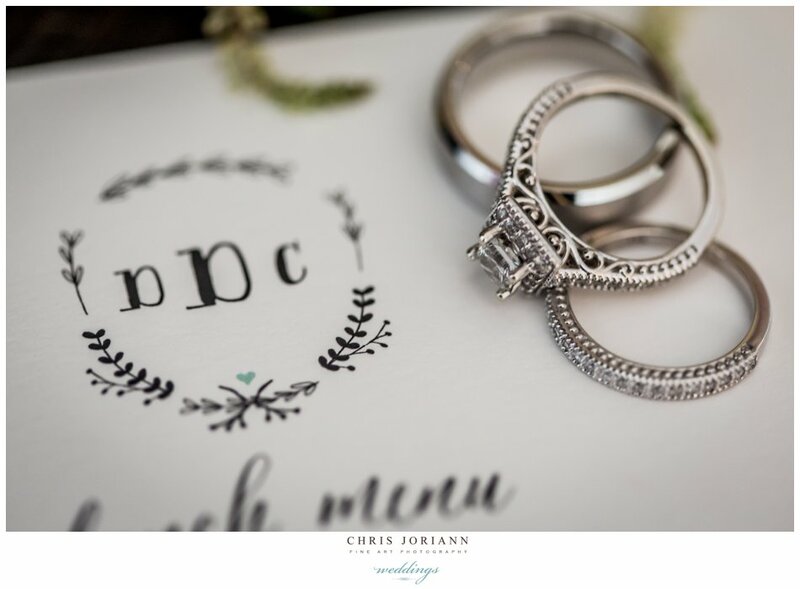 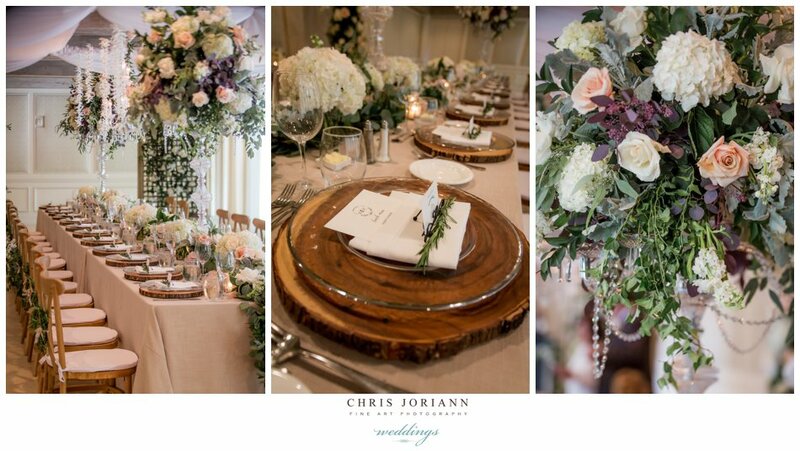 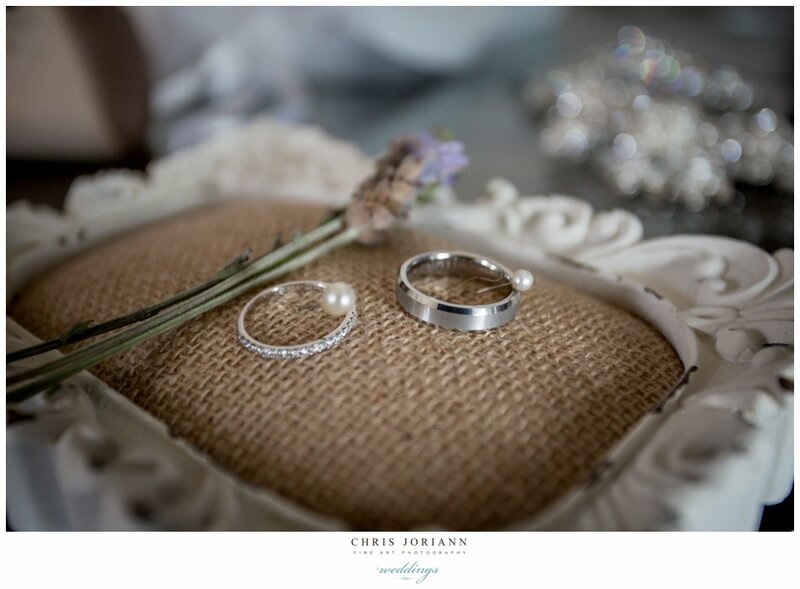 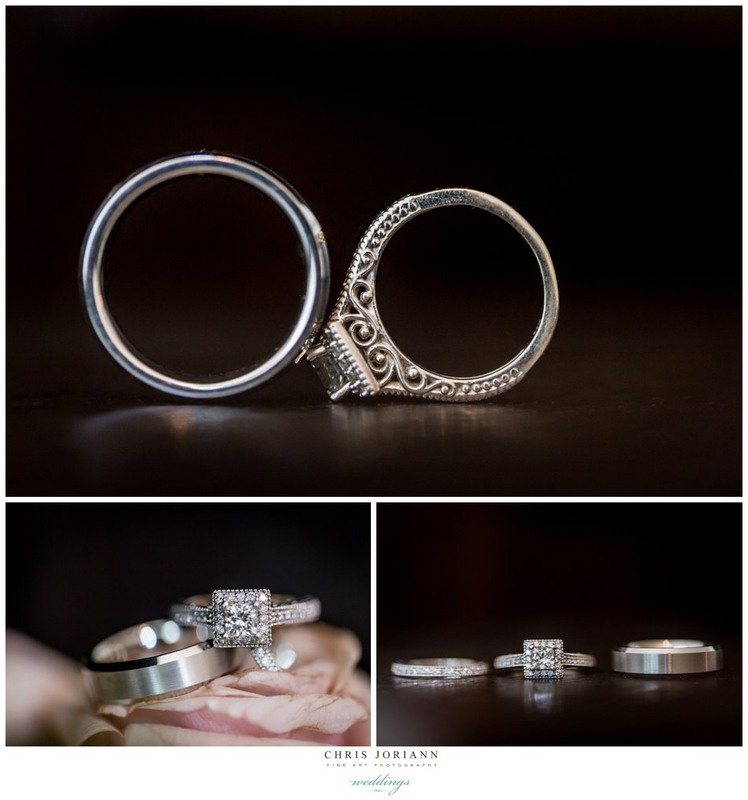 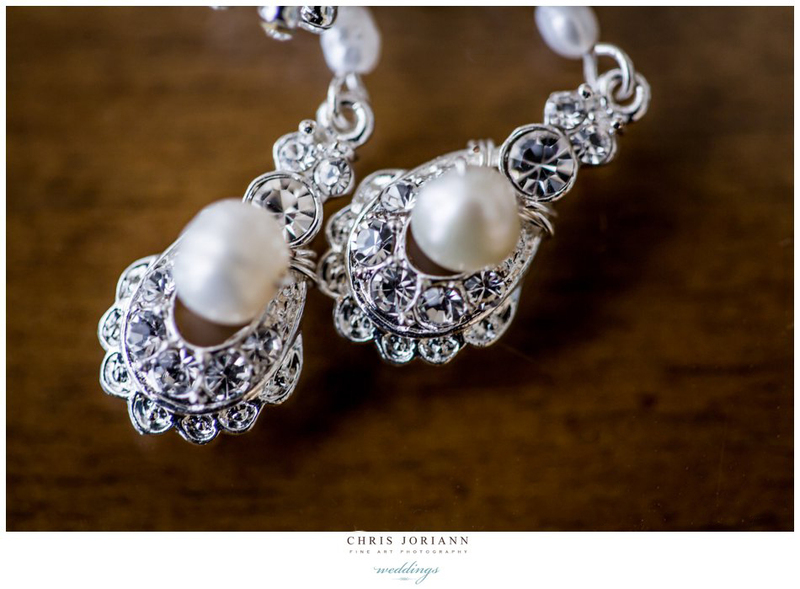 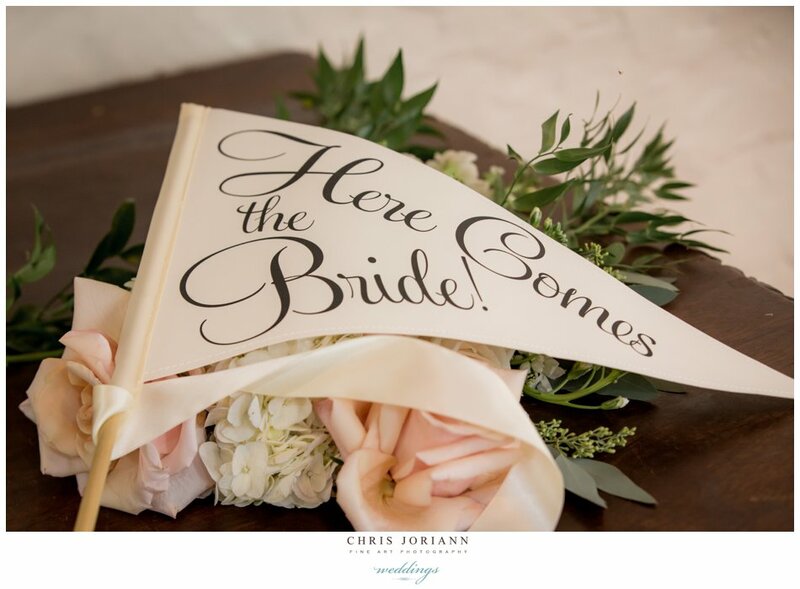 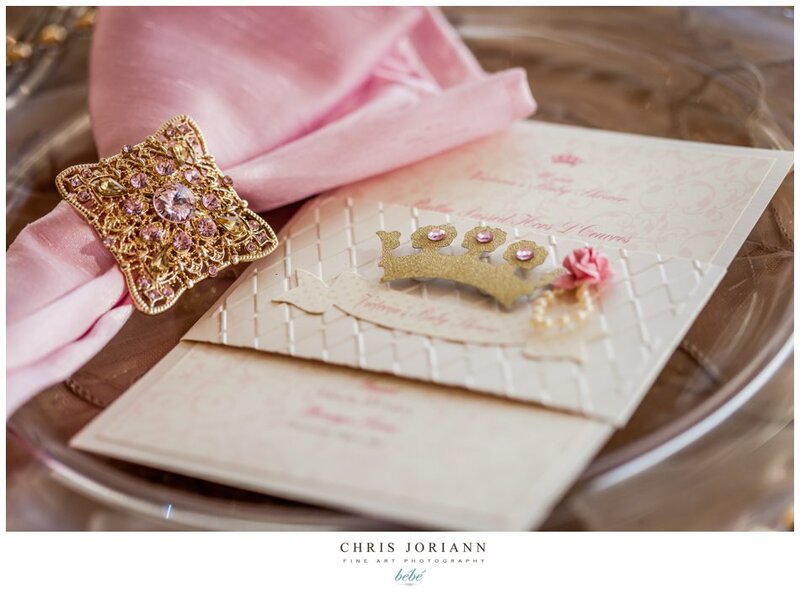 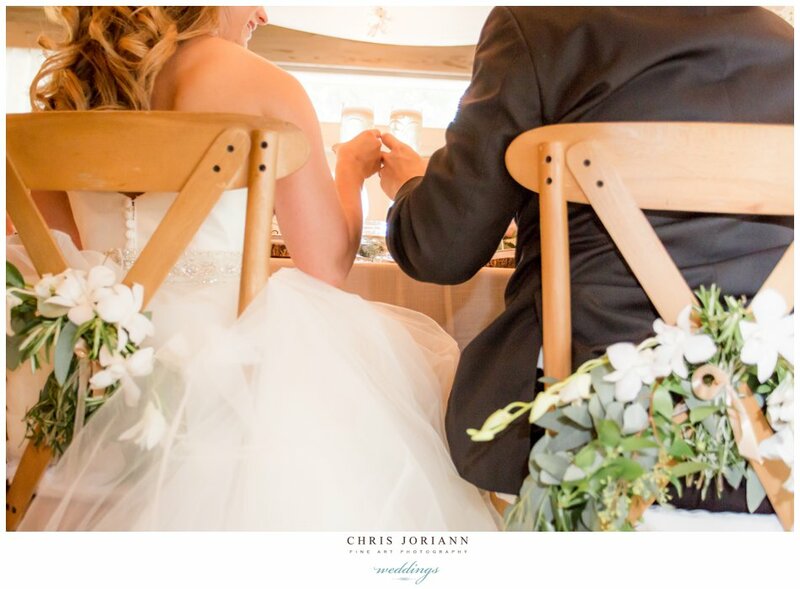 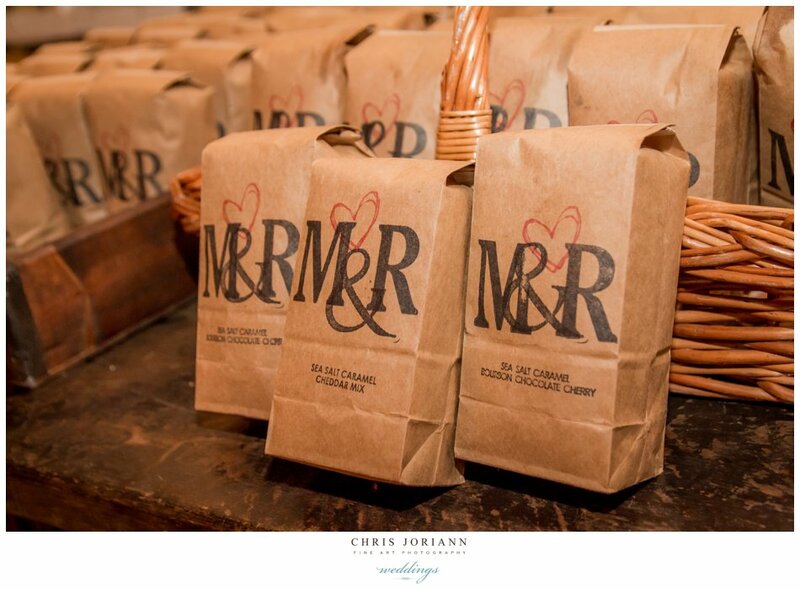 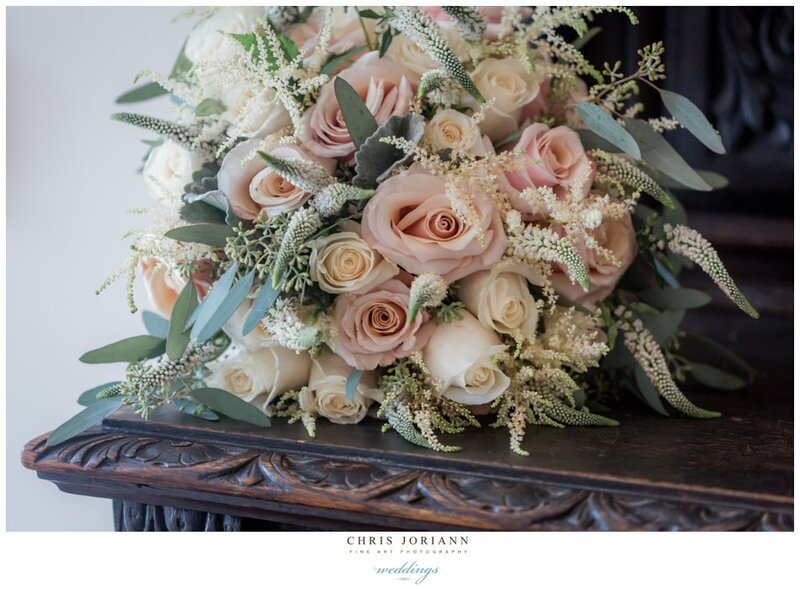 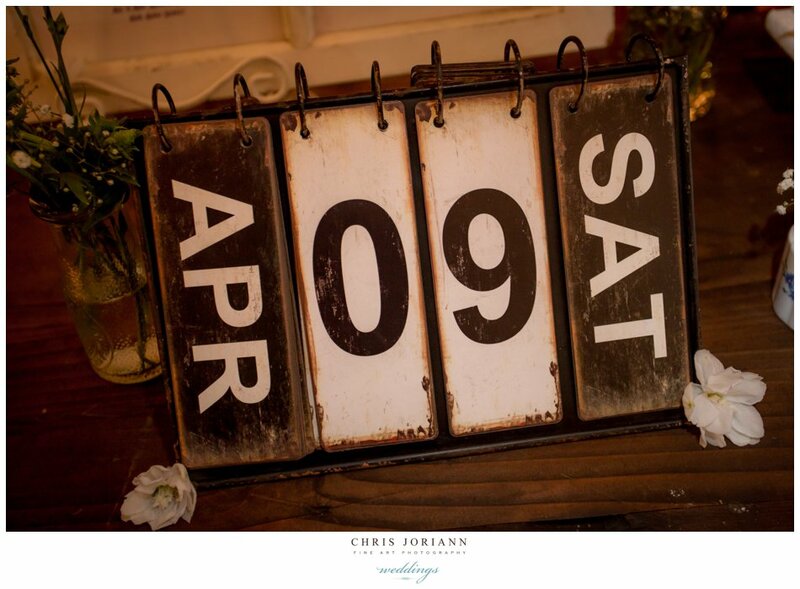 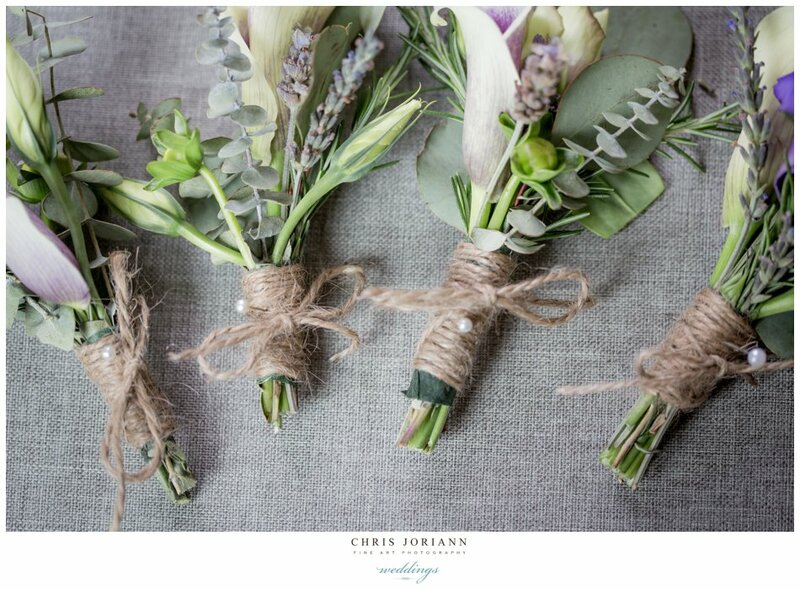 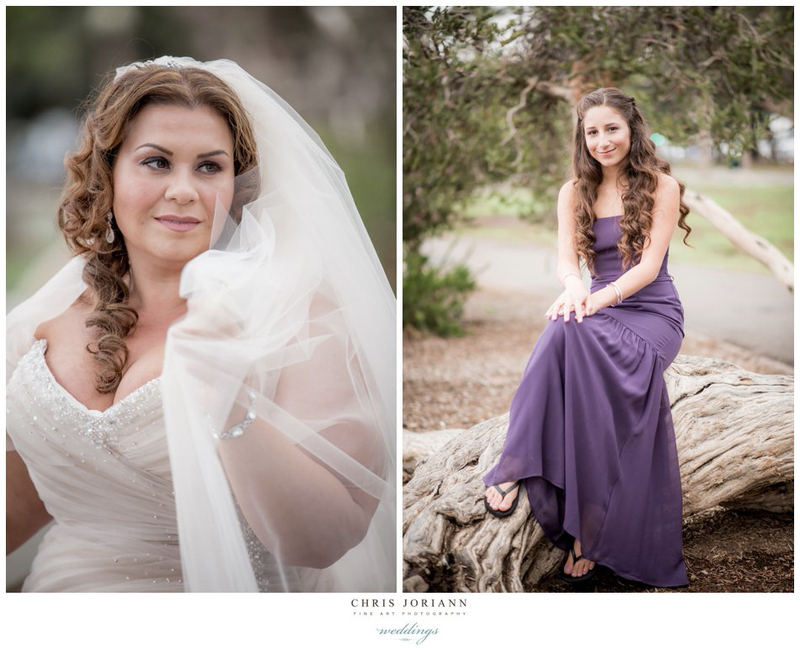 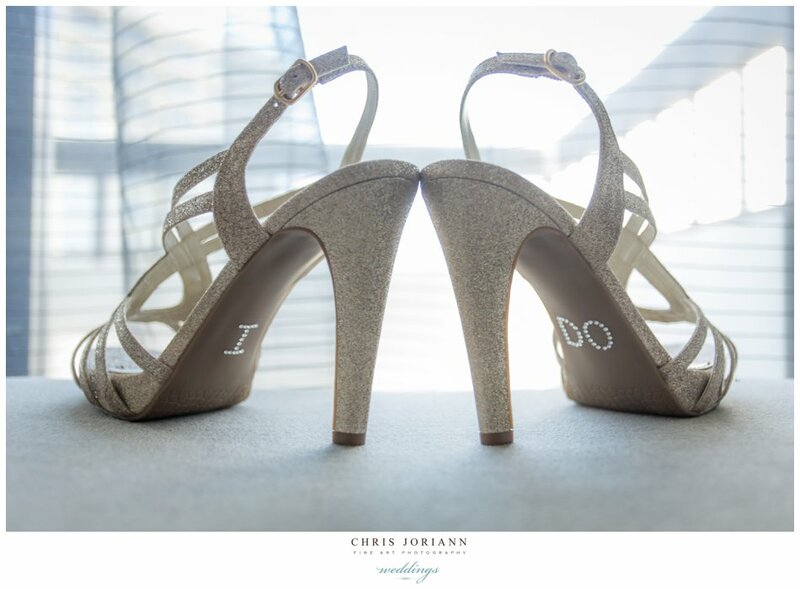 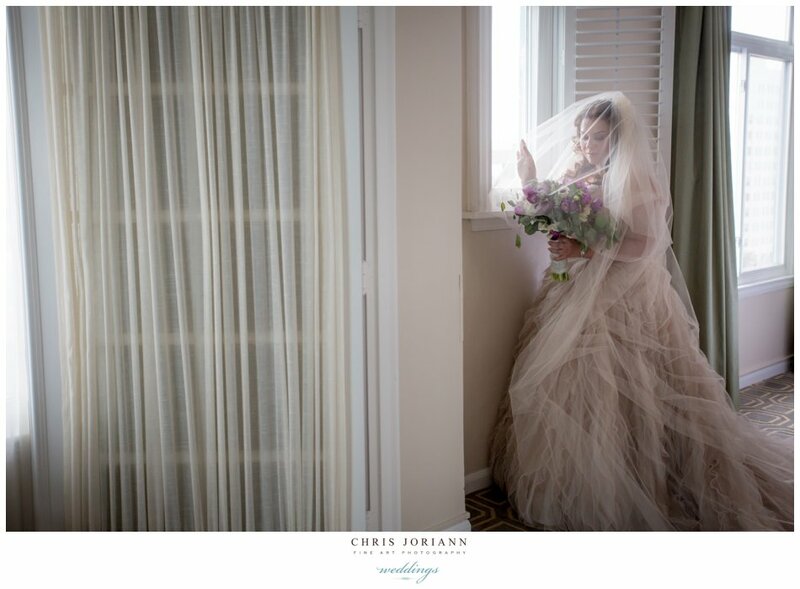 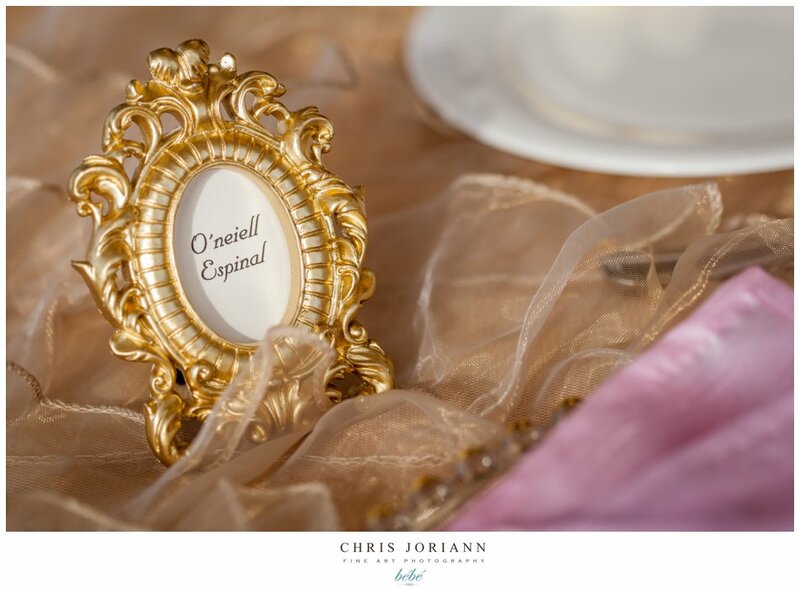 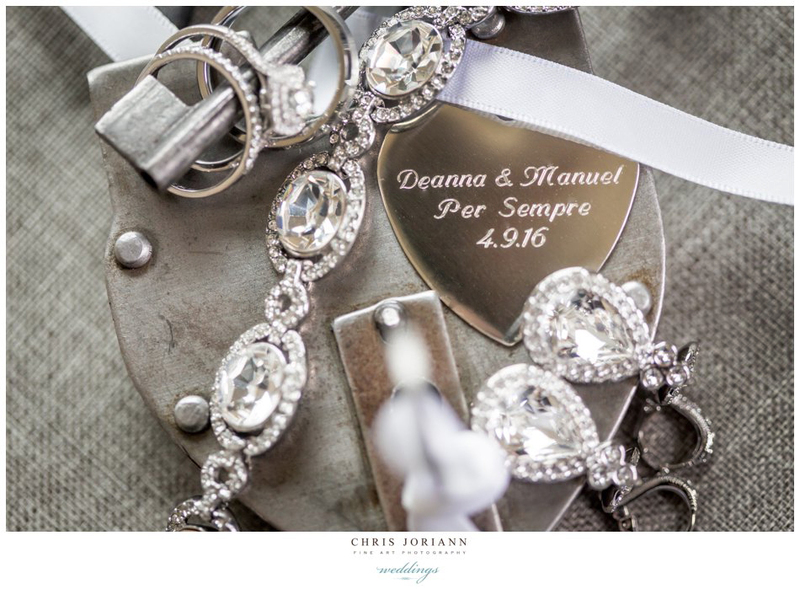 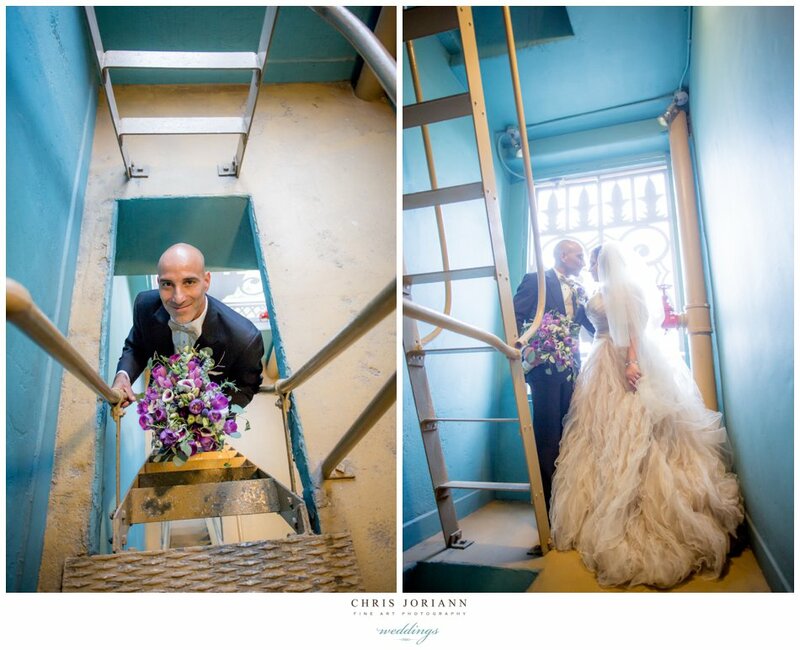 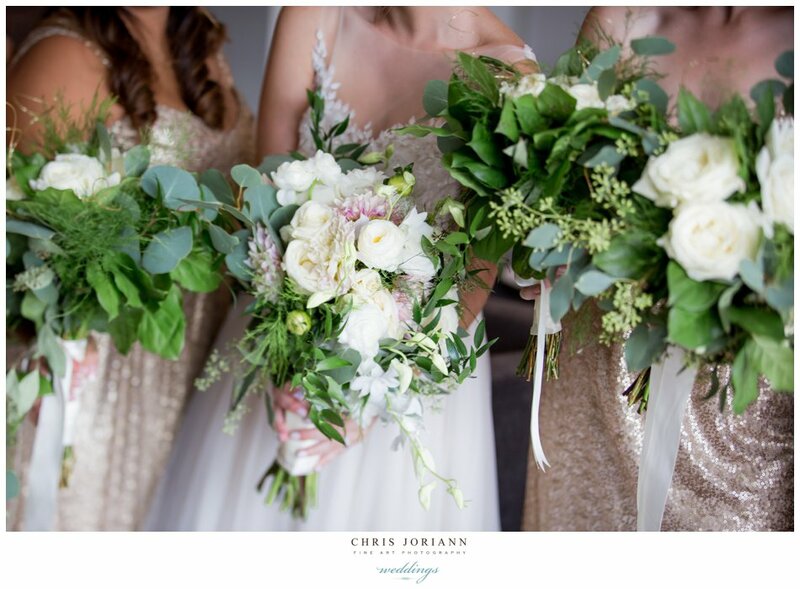 Cara + Daniel’s nuptials were inspired by rustic vintage romance! 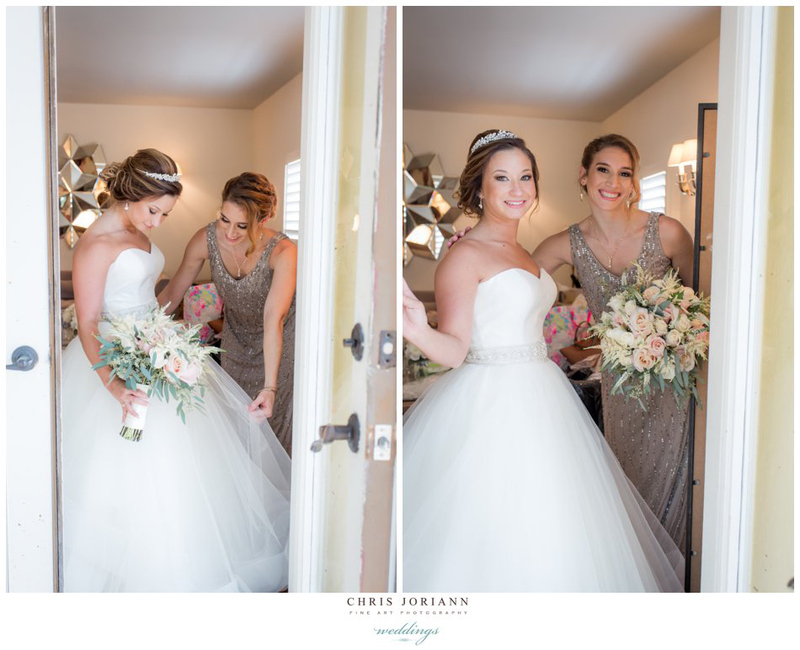 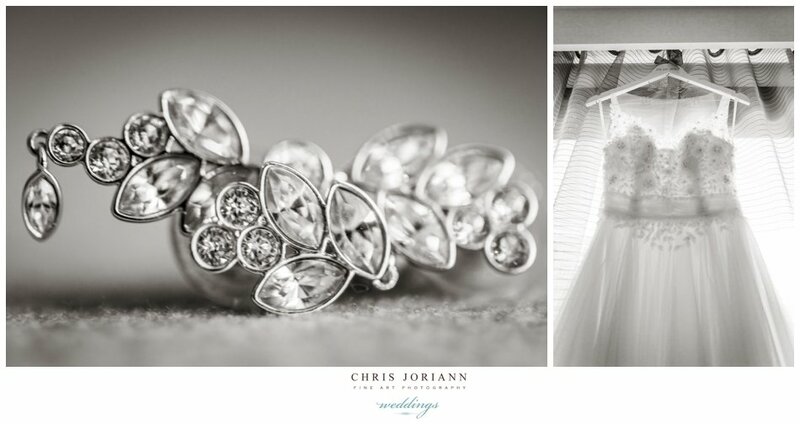 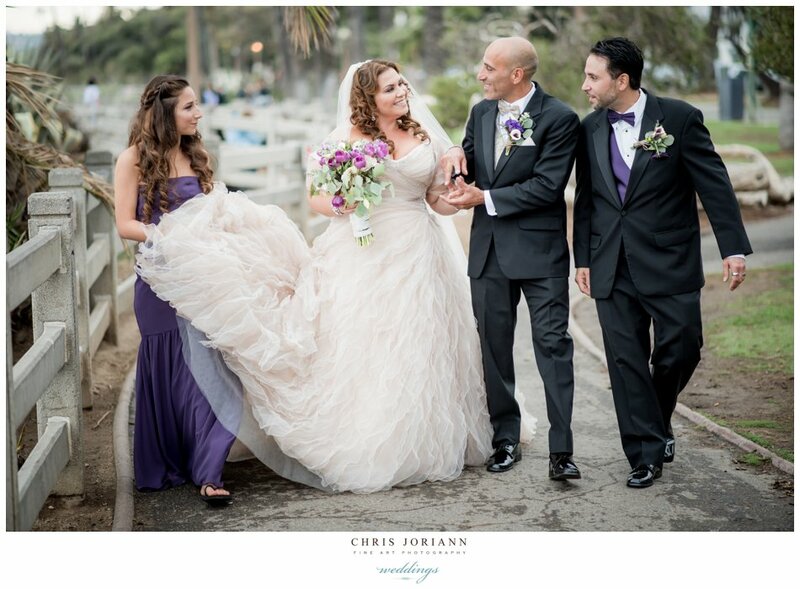 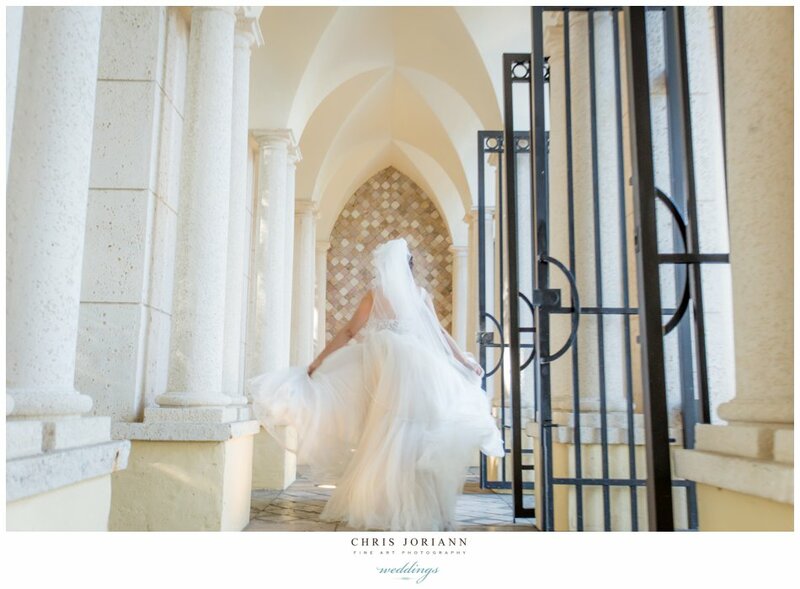 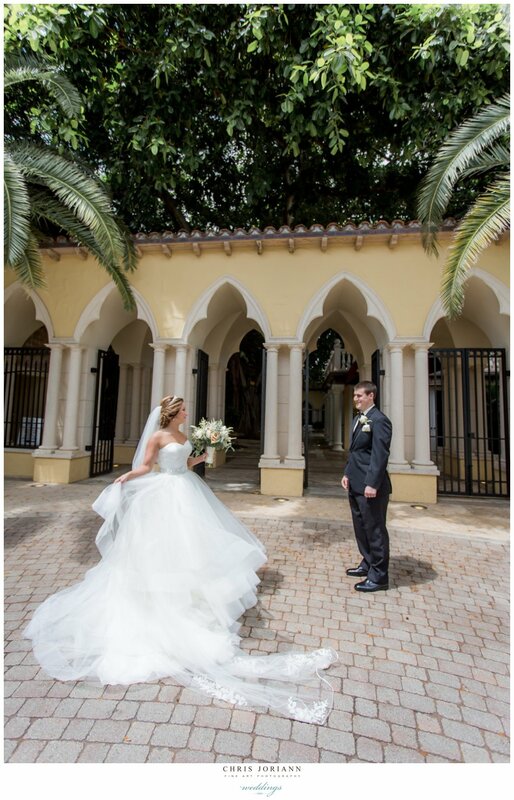 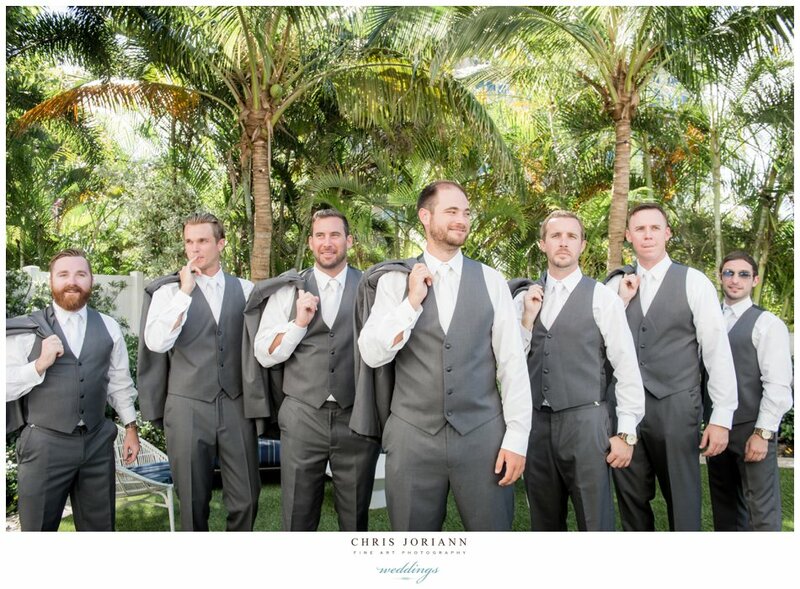 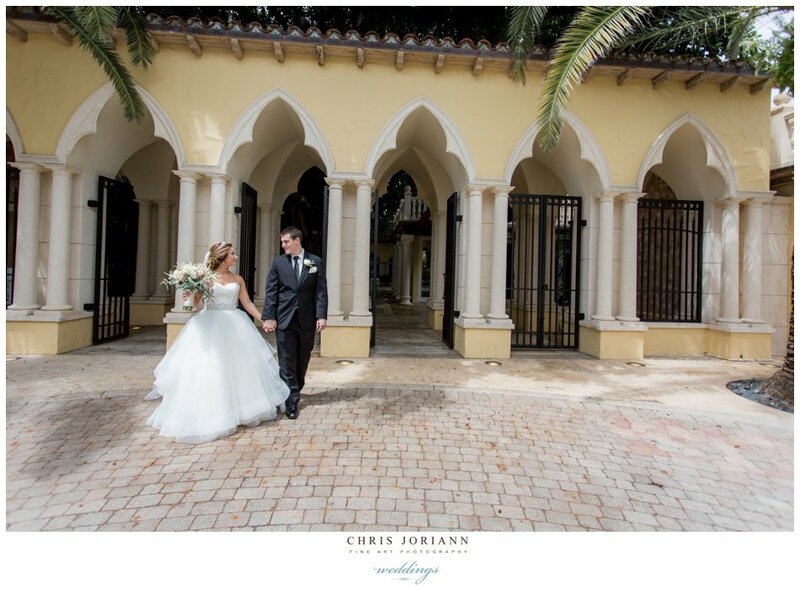 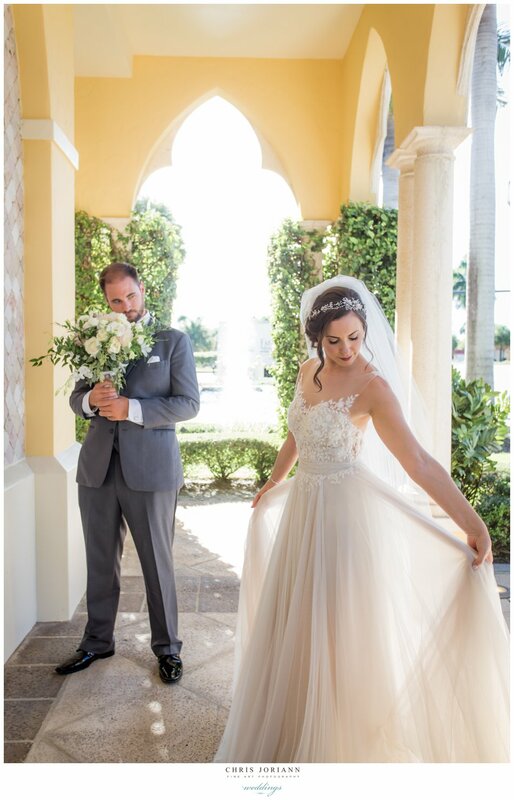 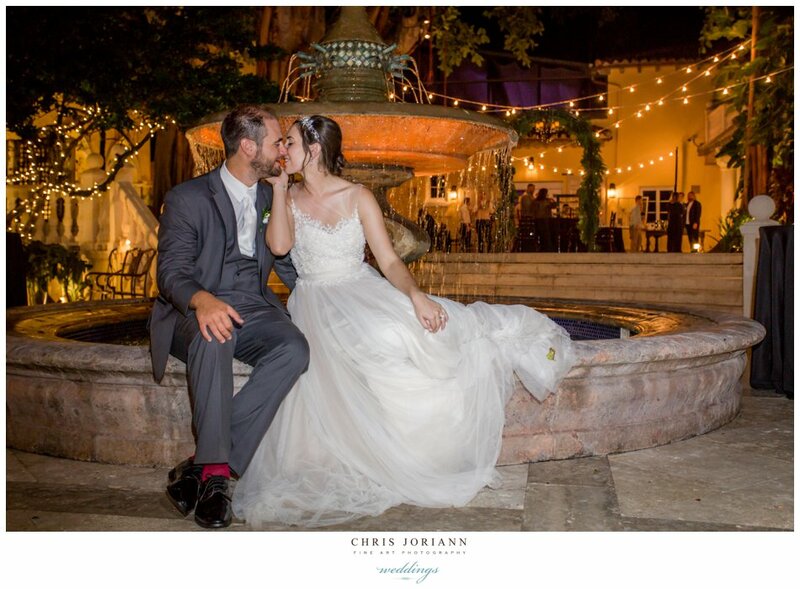 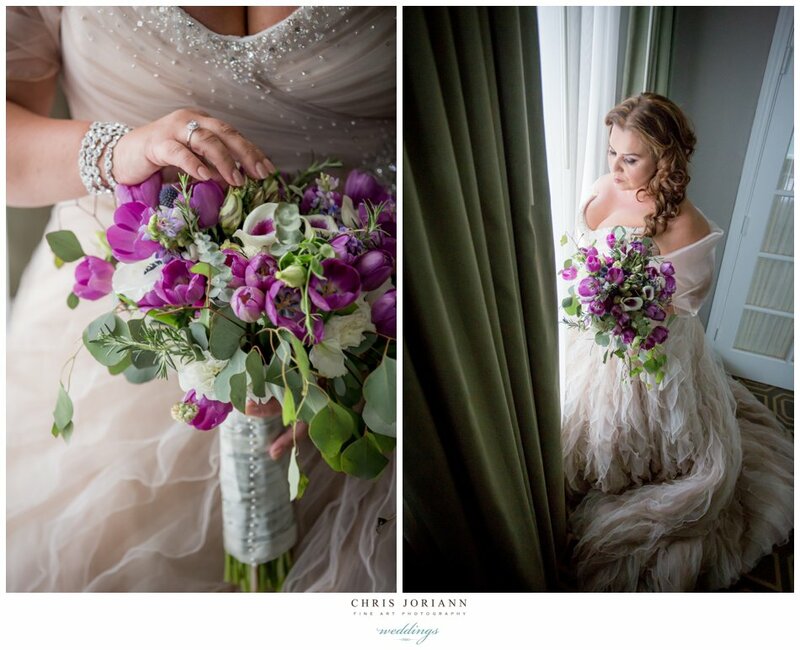 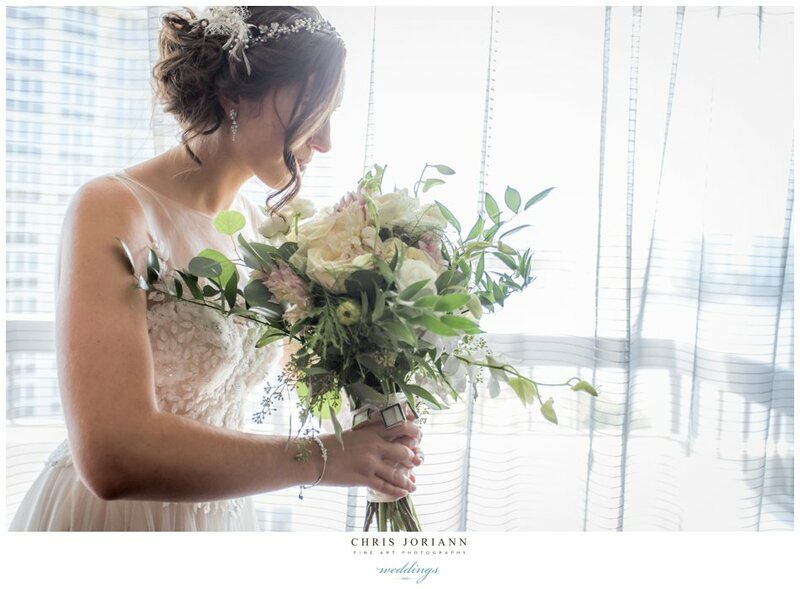 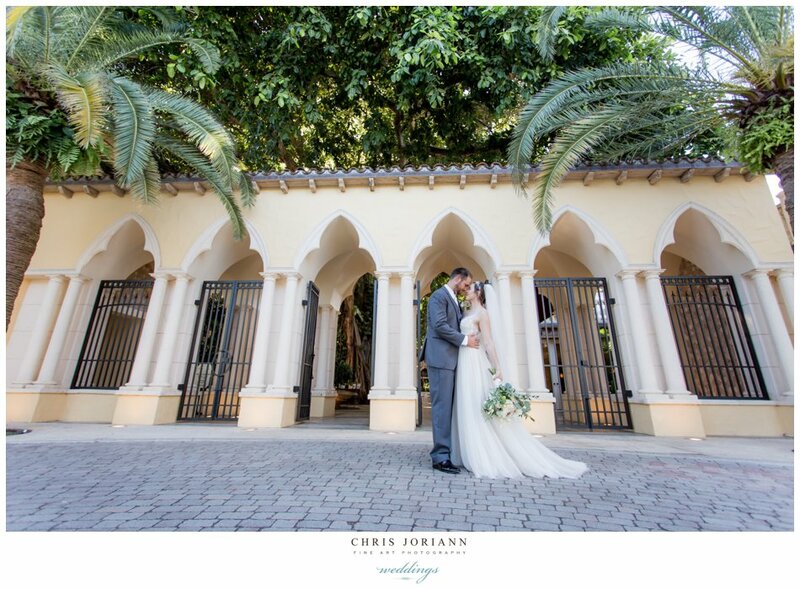 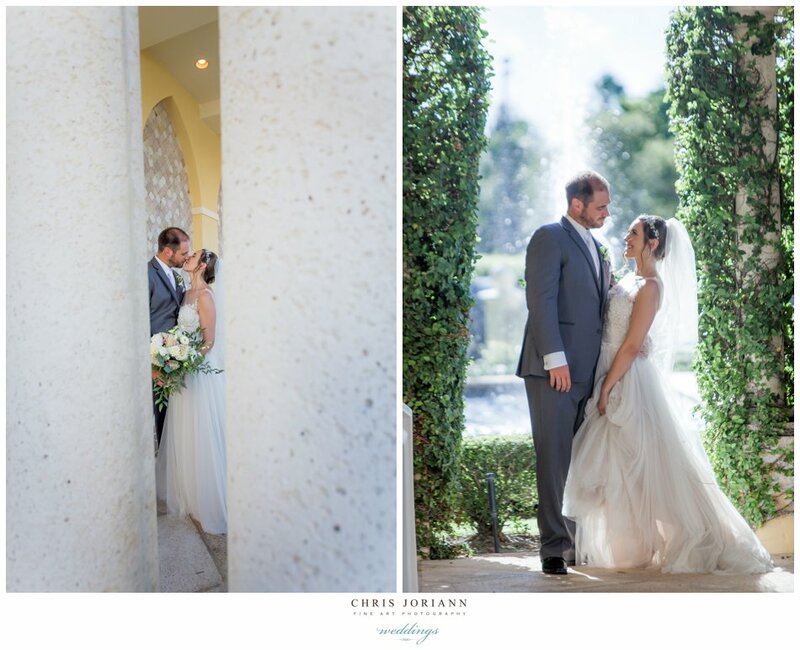 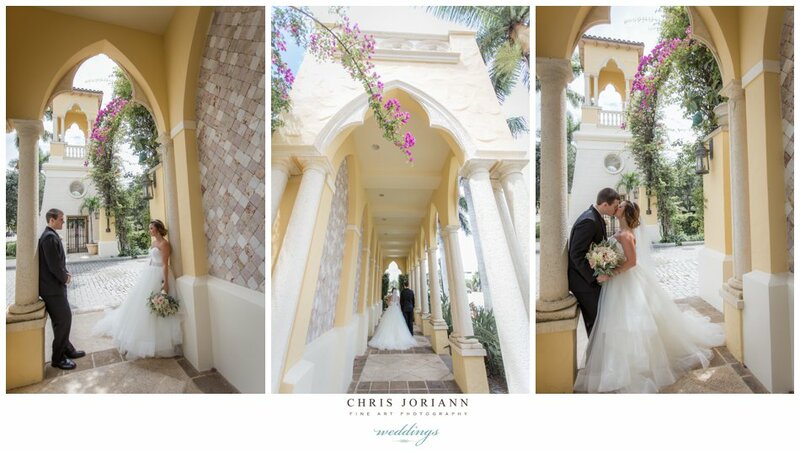 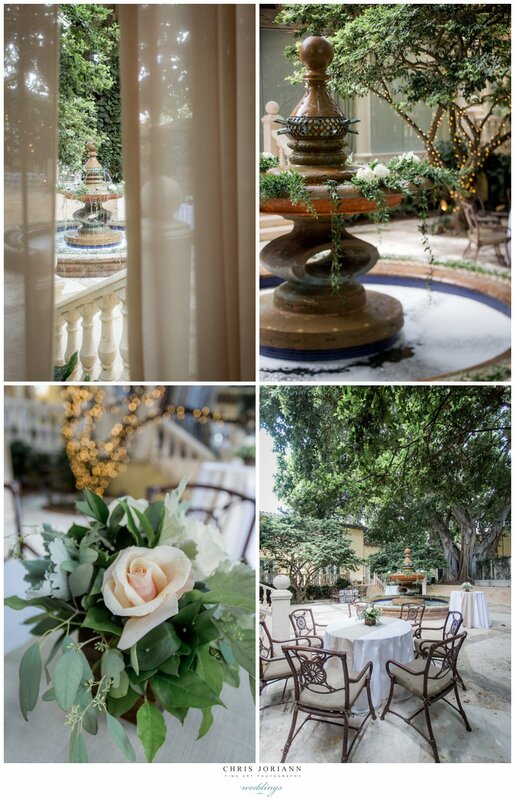 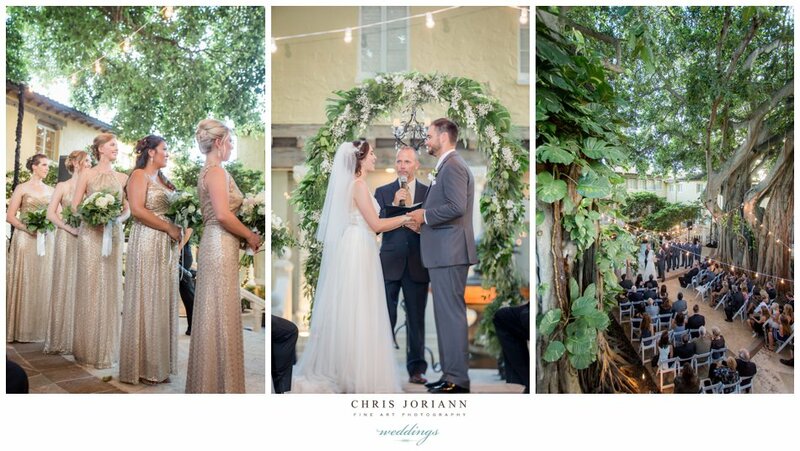 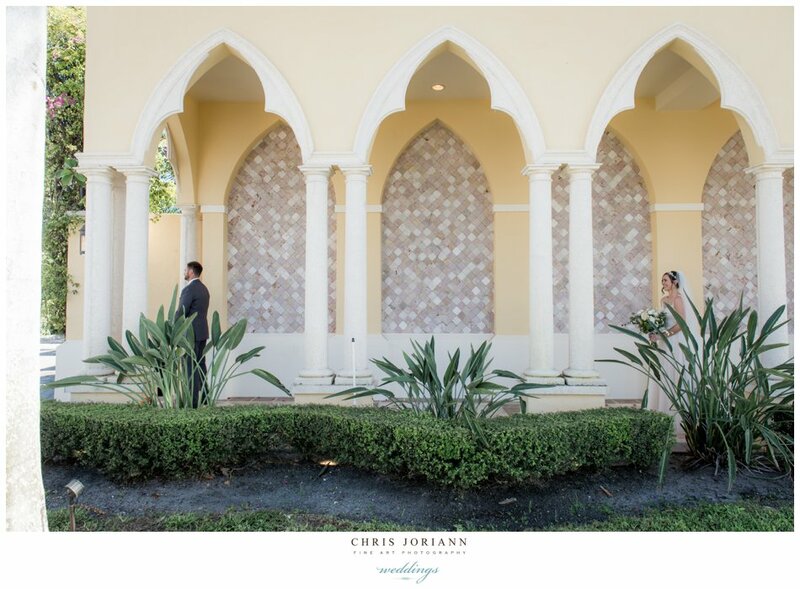 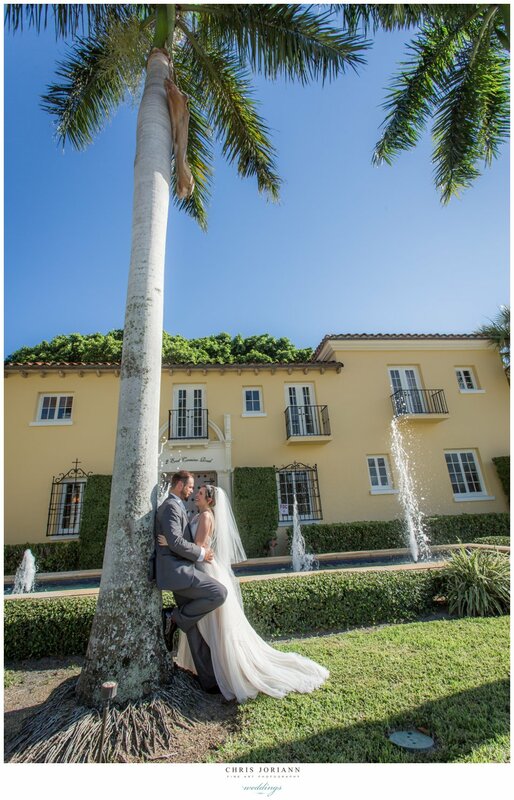 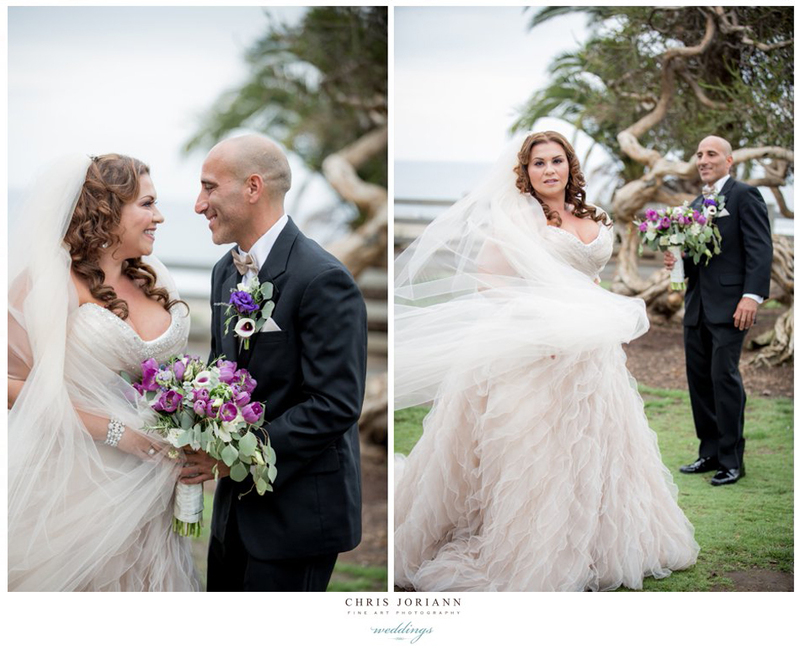 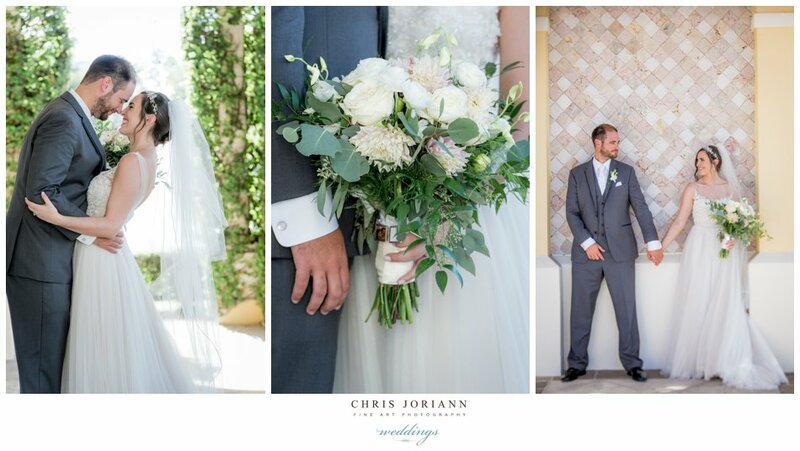 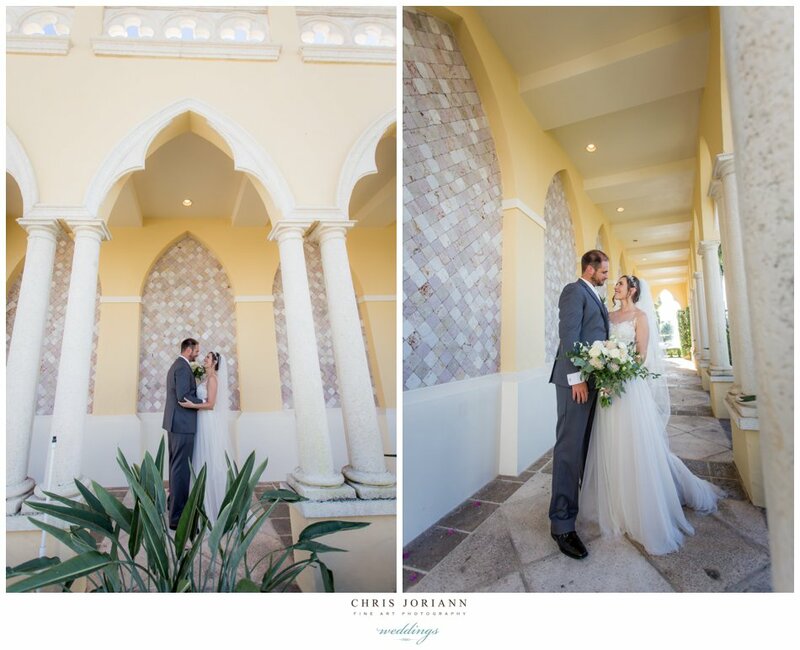 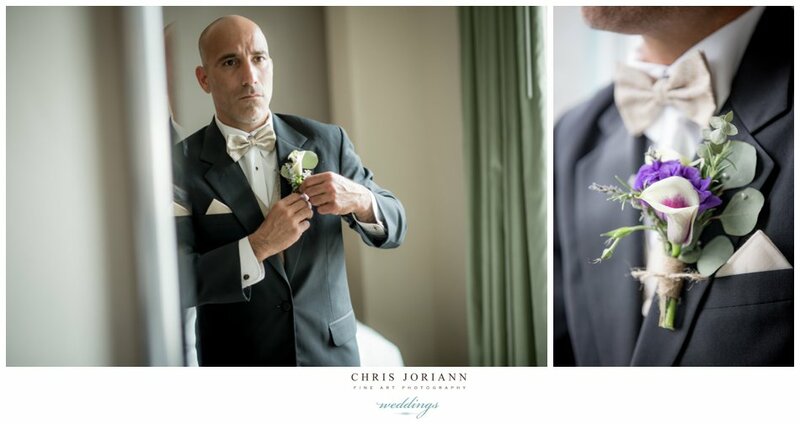 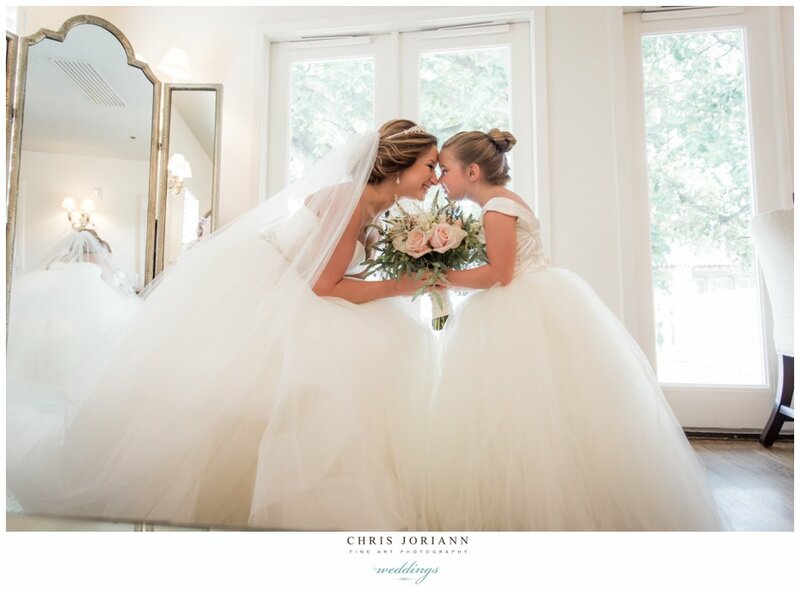 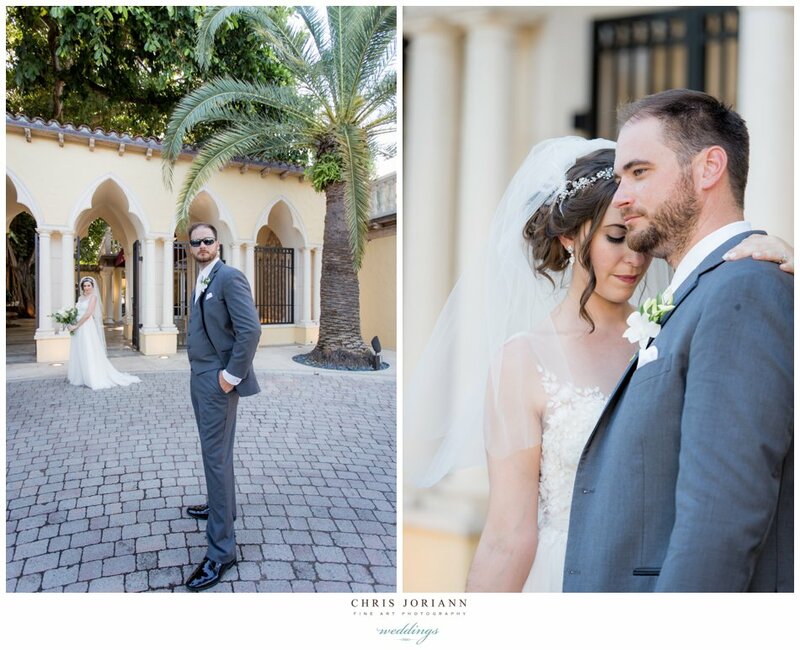 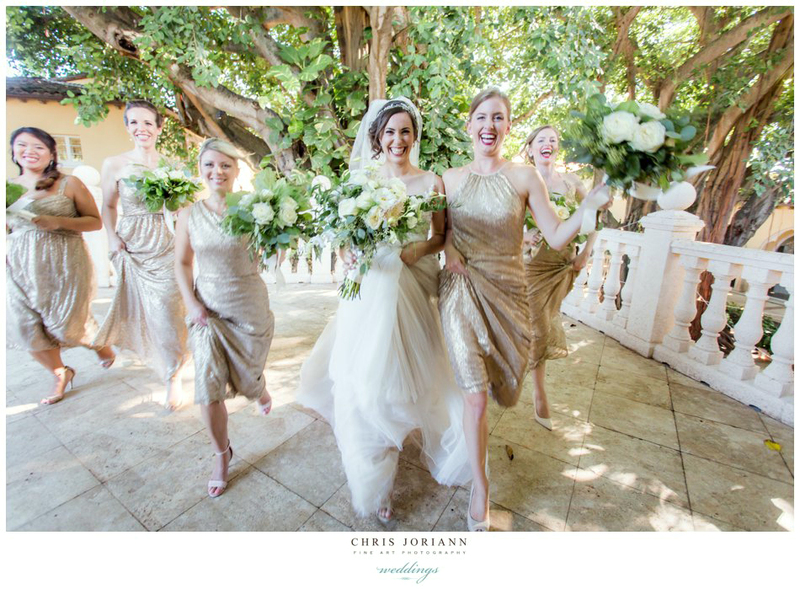 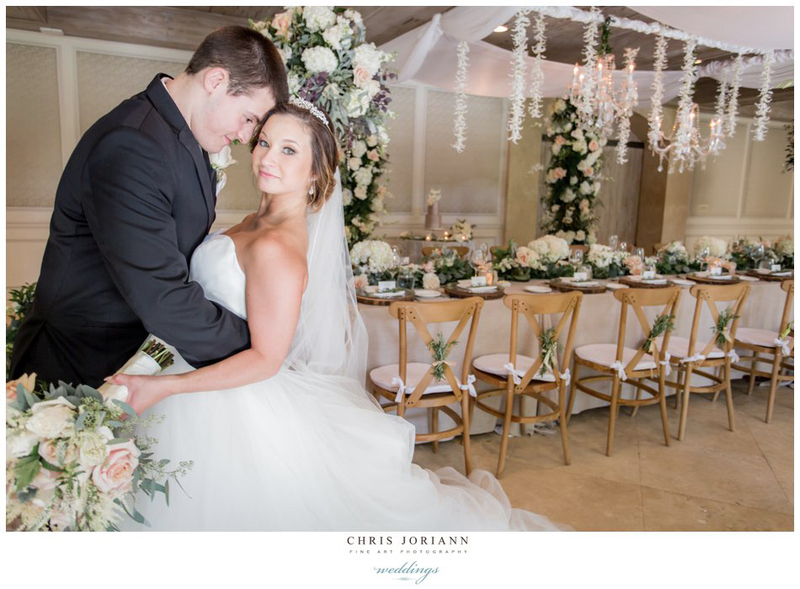 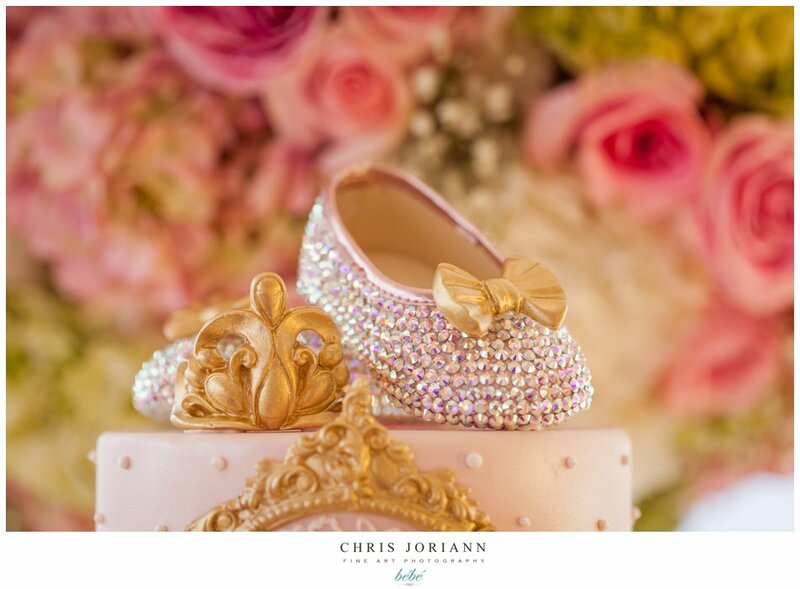 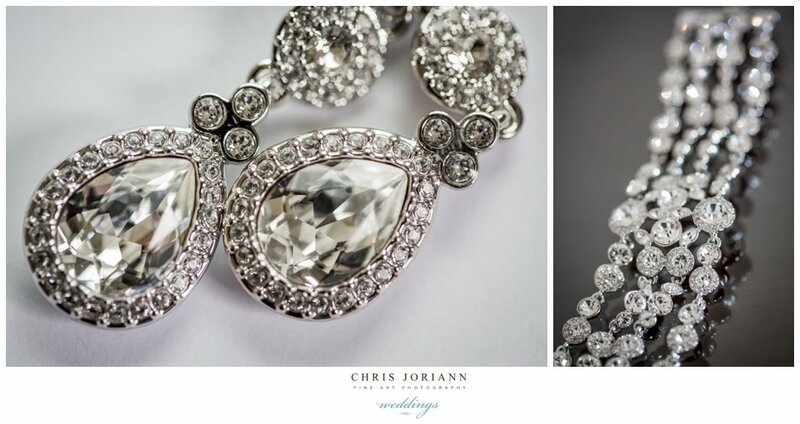 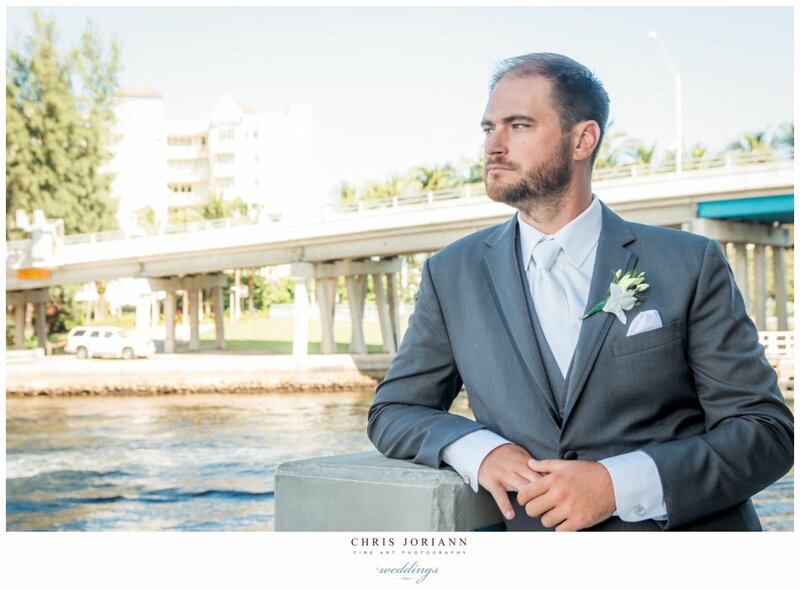 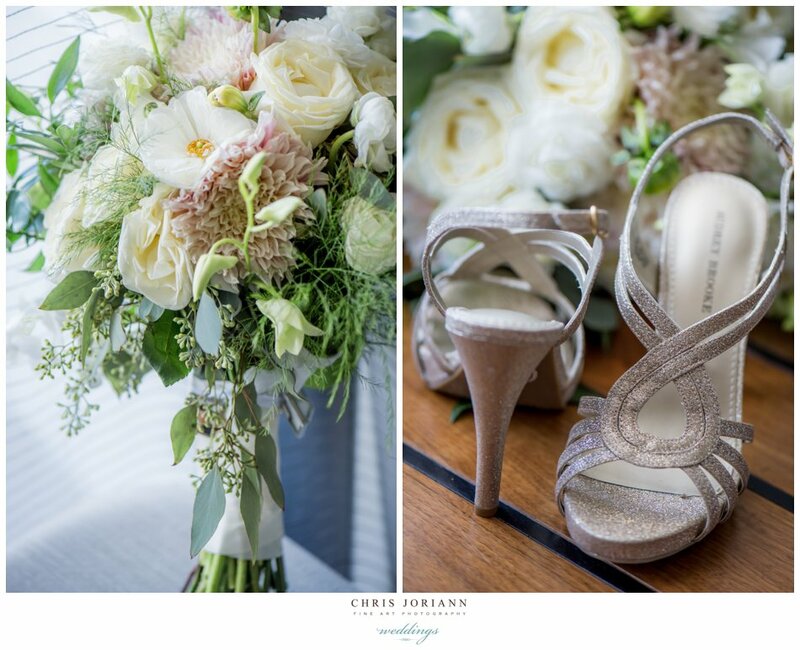 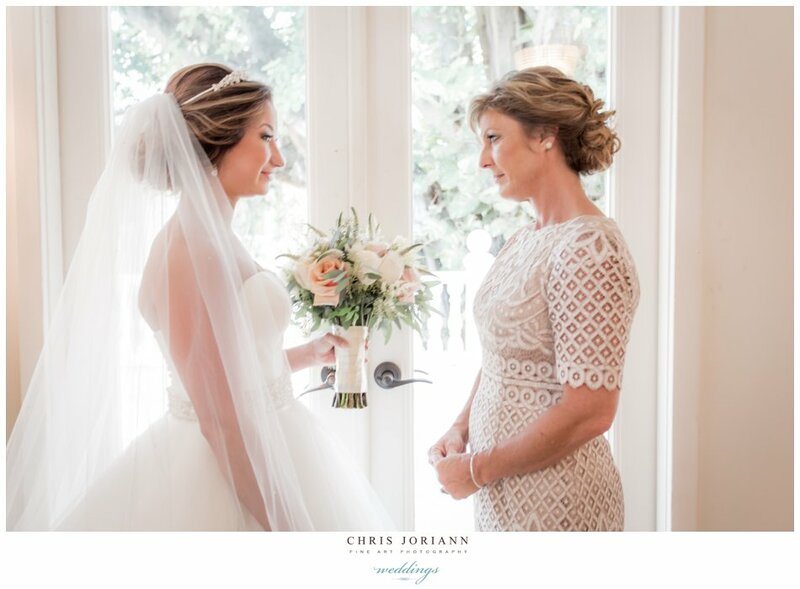 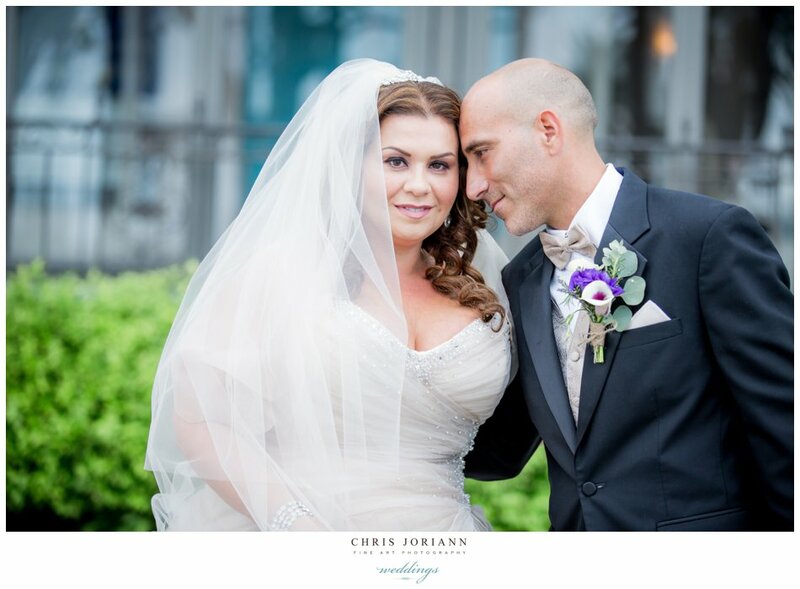 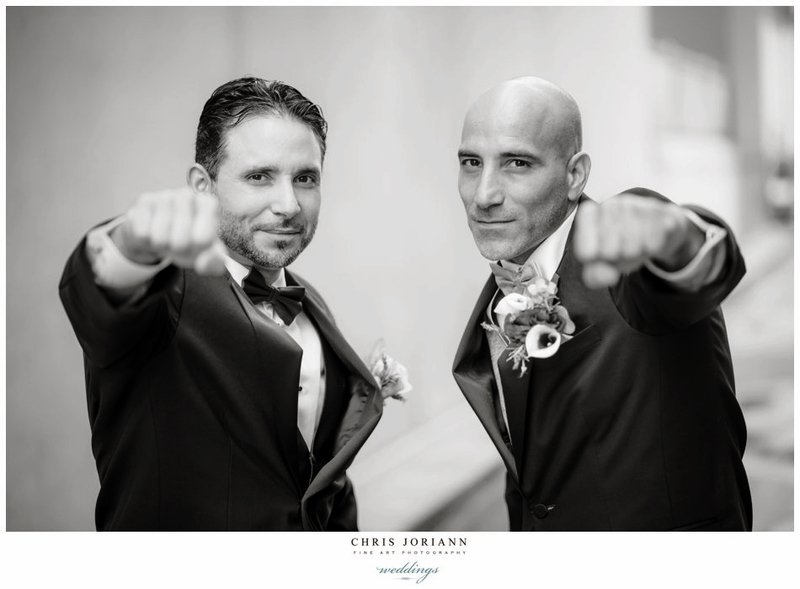 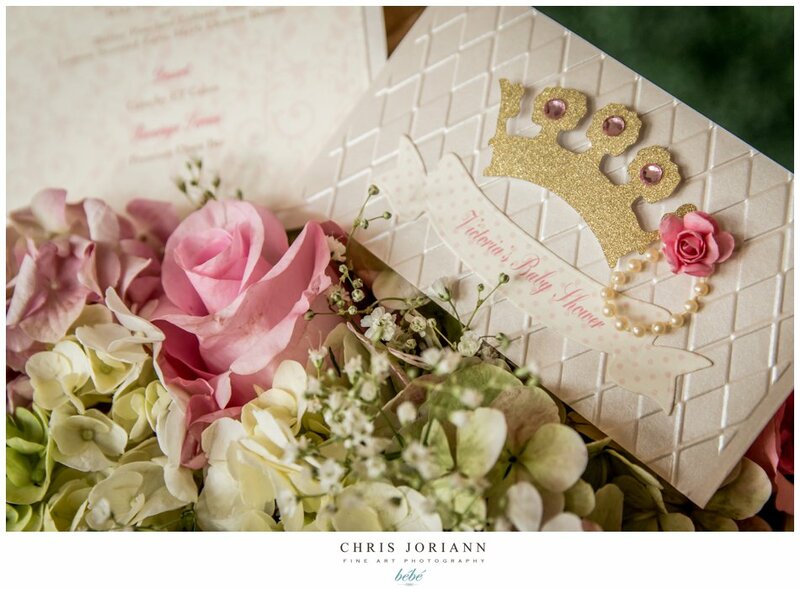 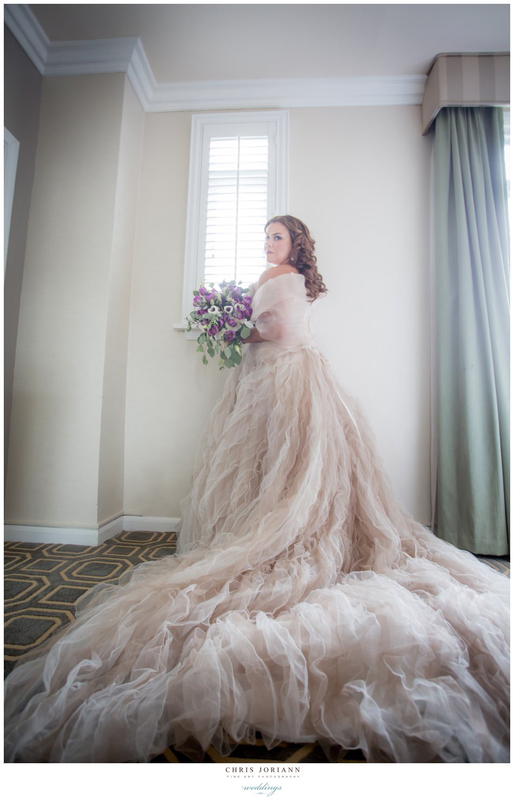 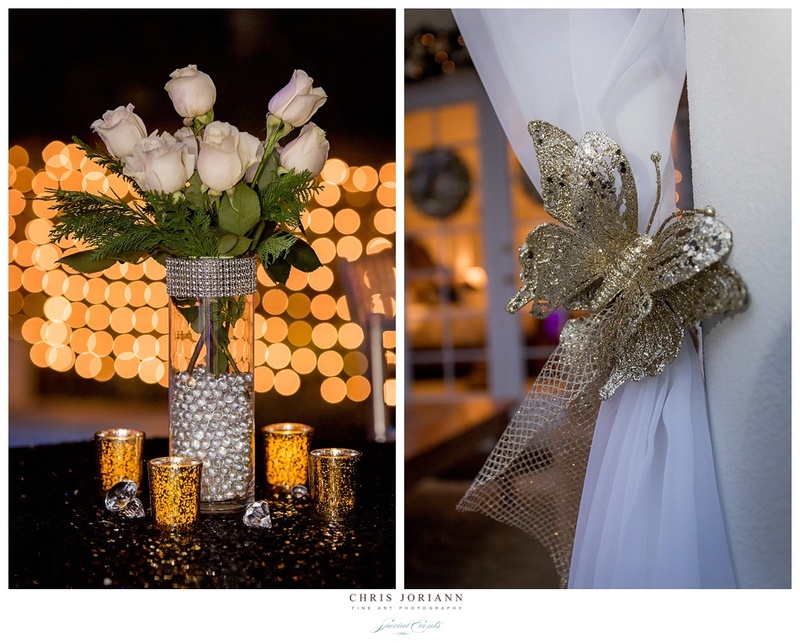 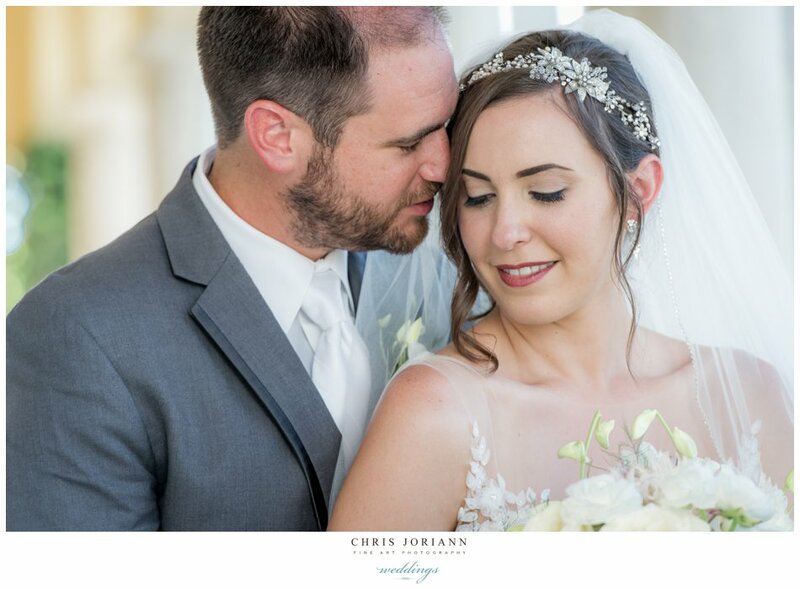 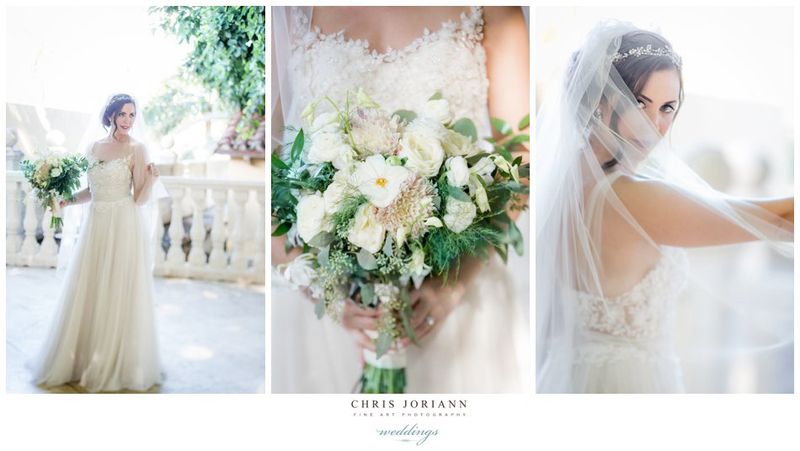 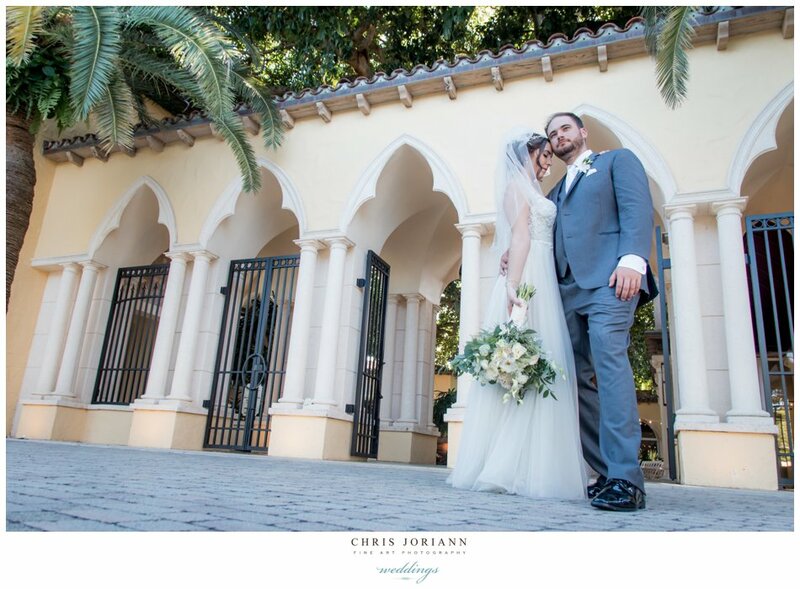 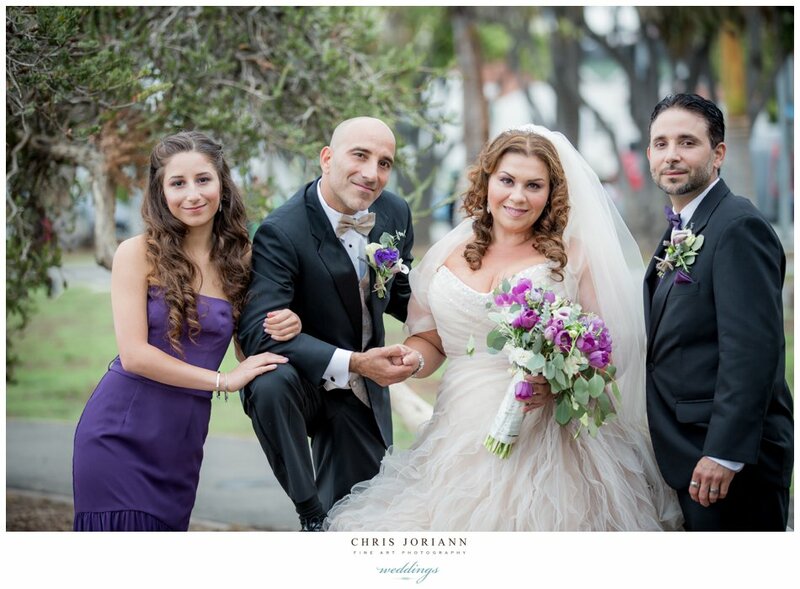 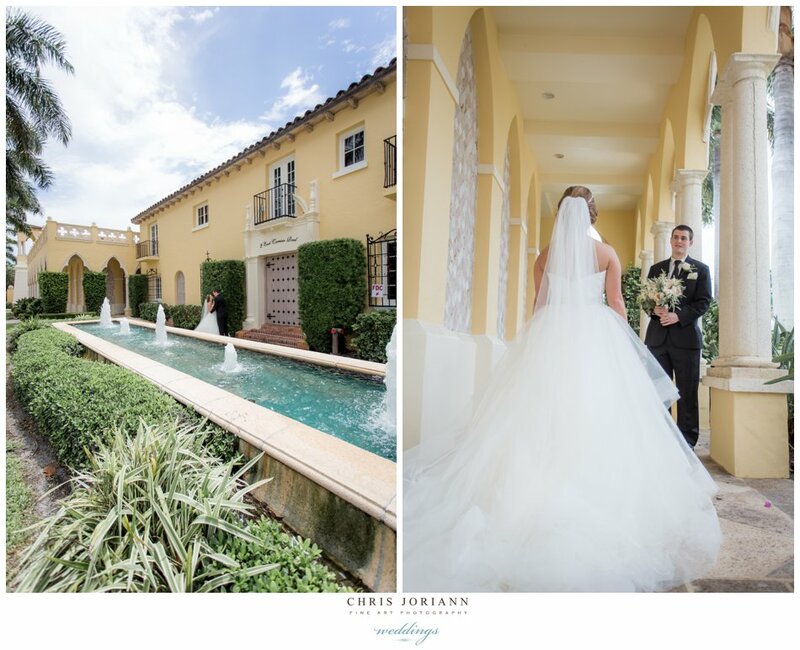 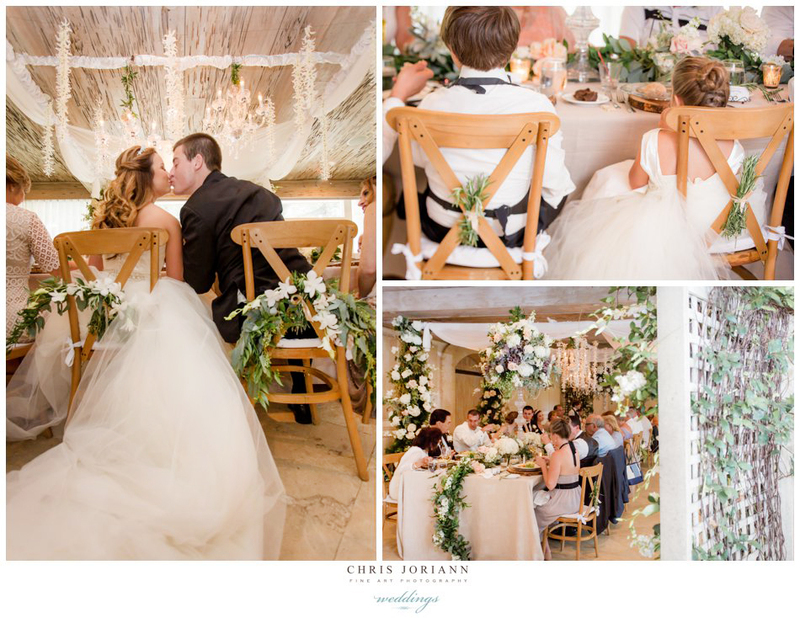 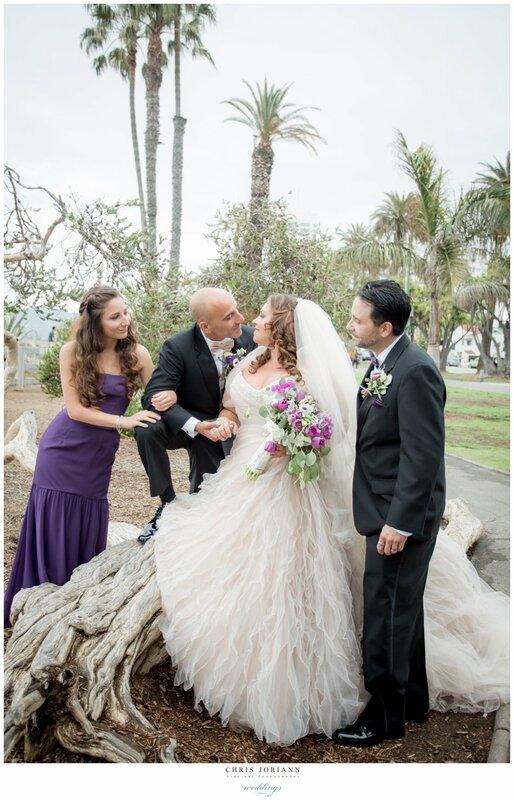 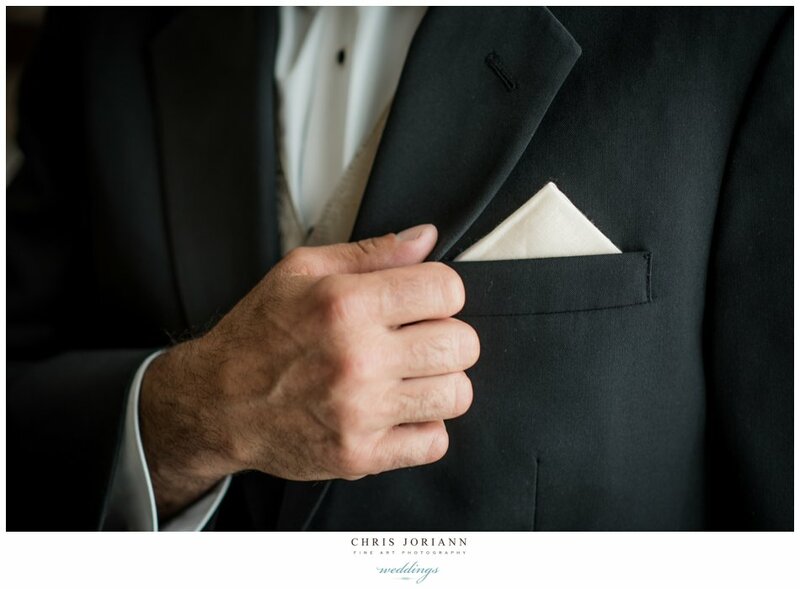 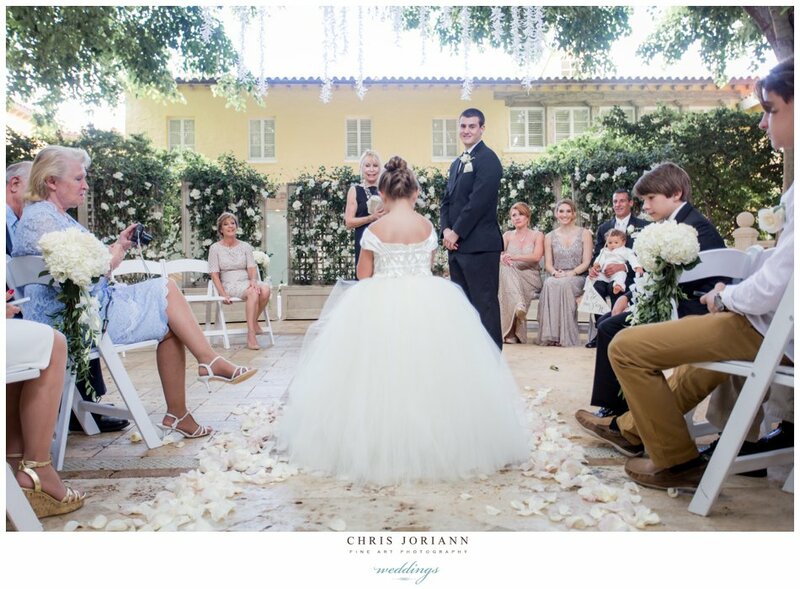 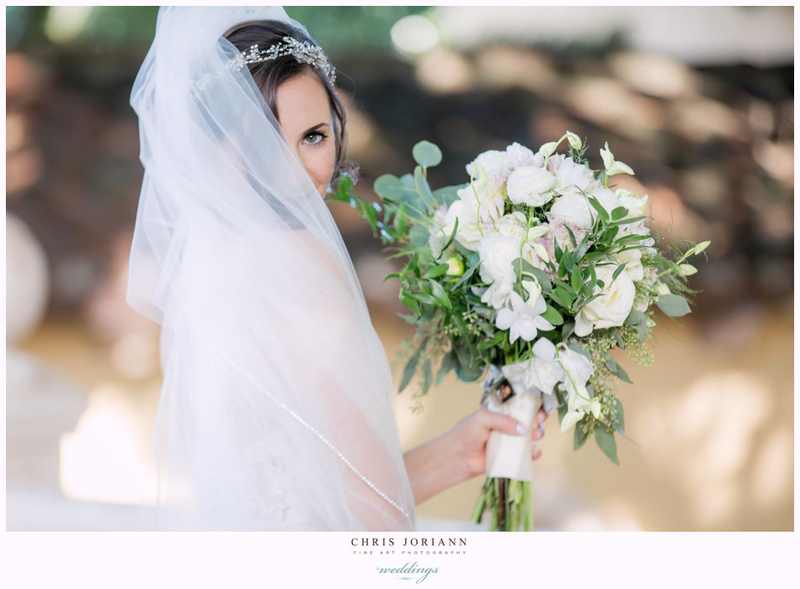 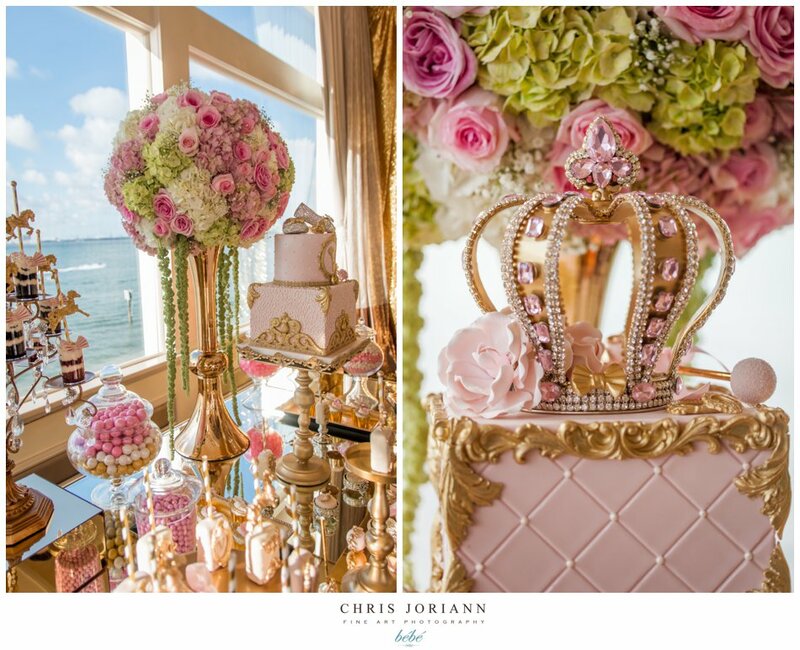 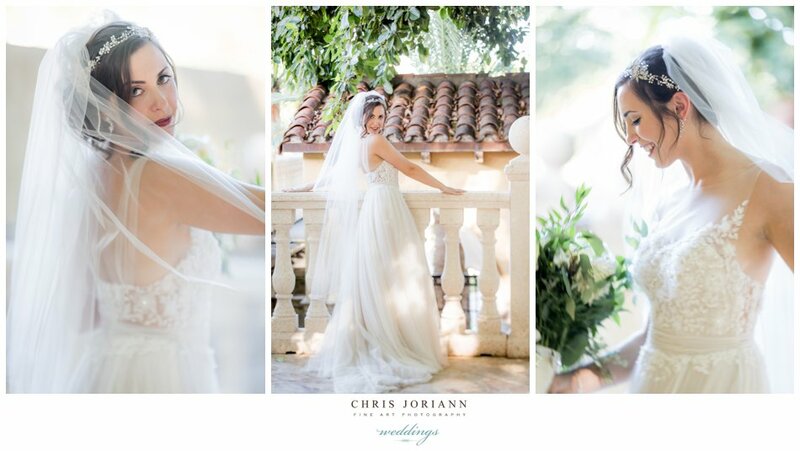 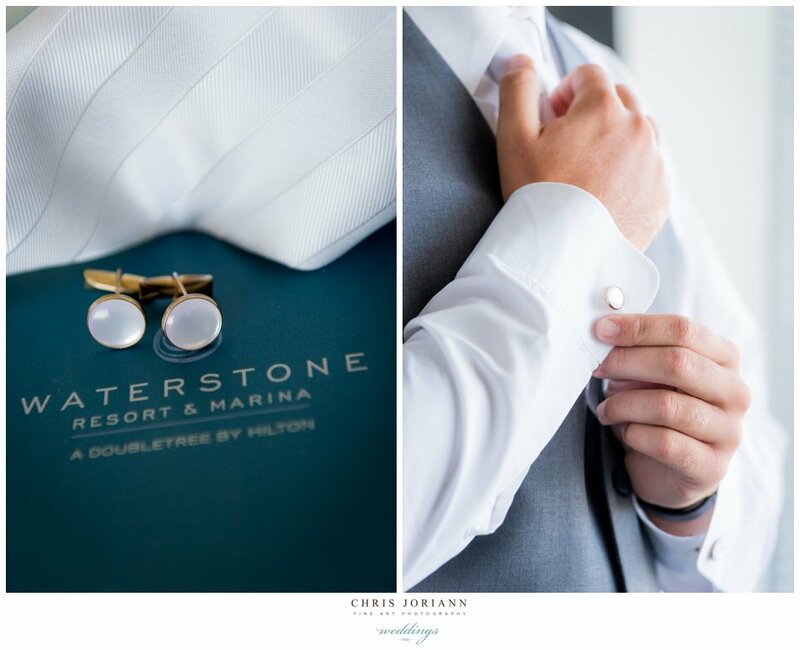 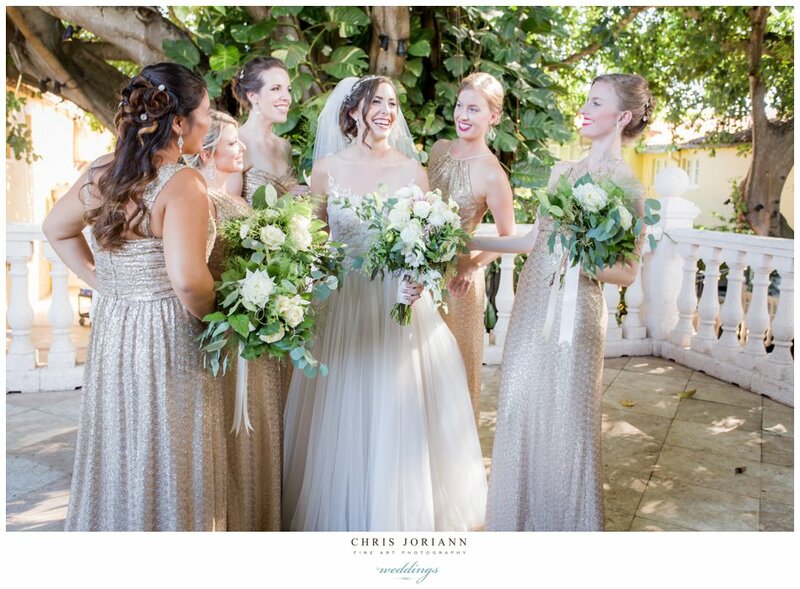 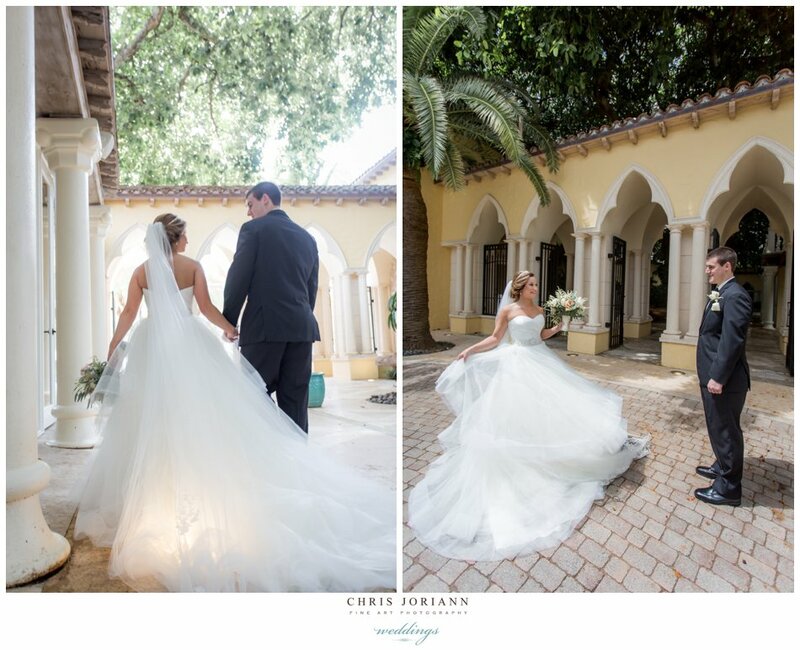 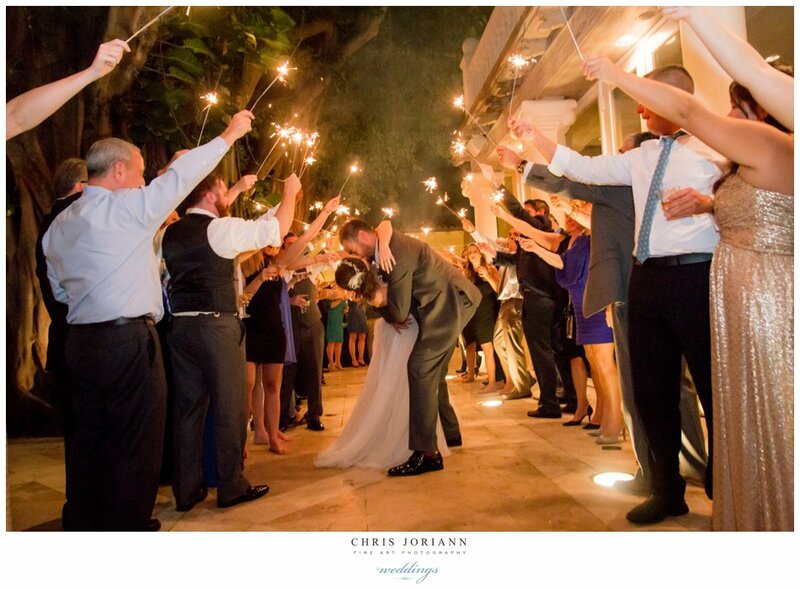 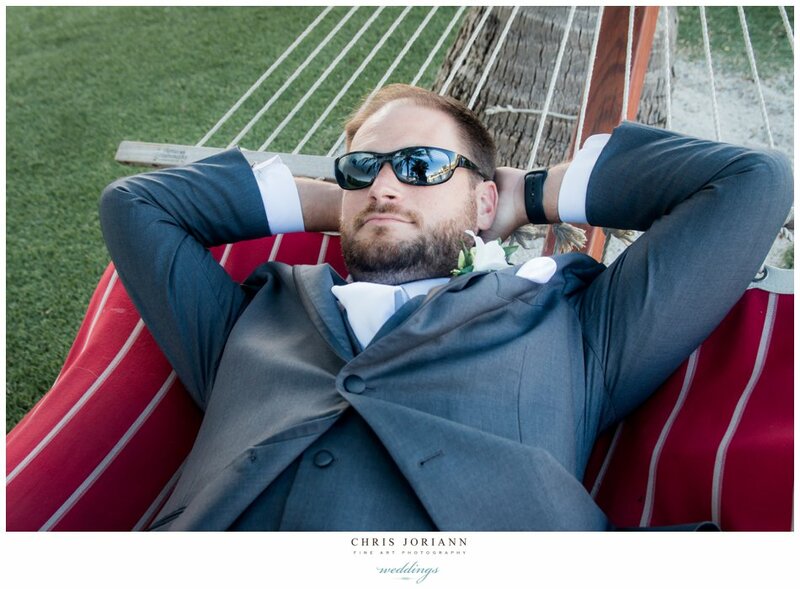 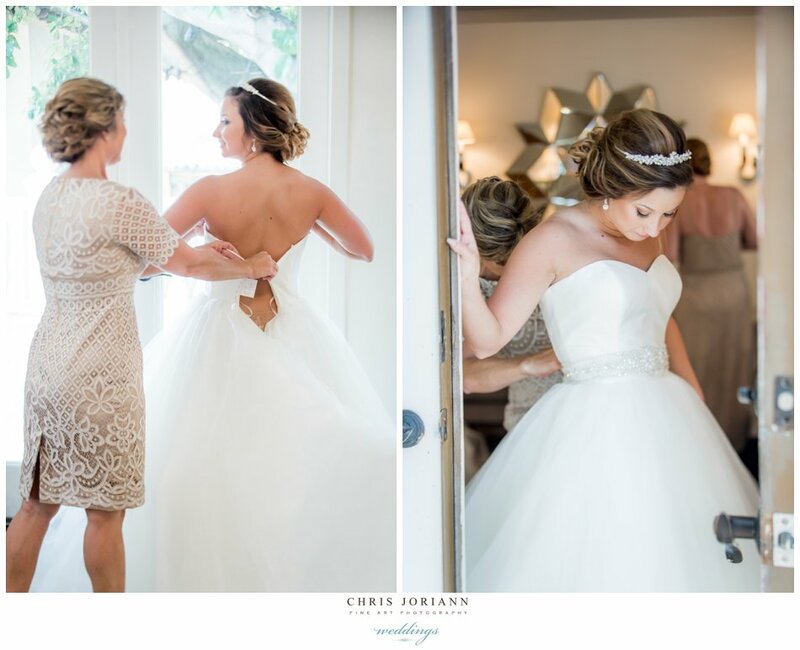 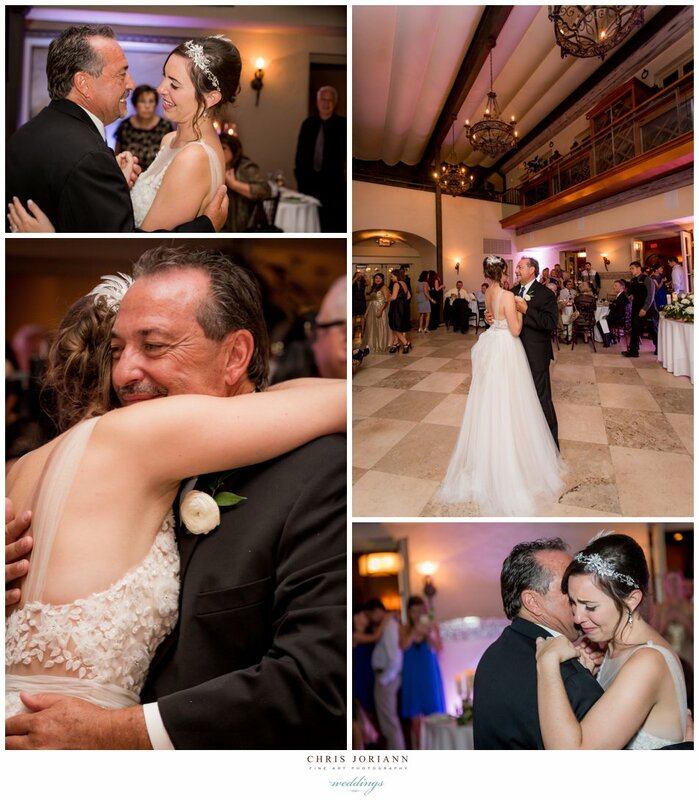 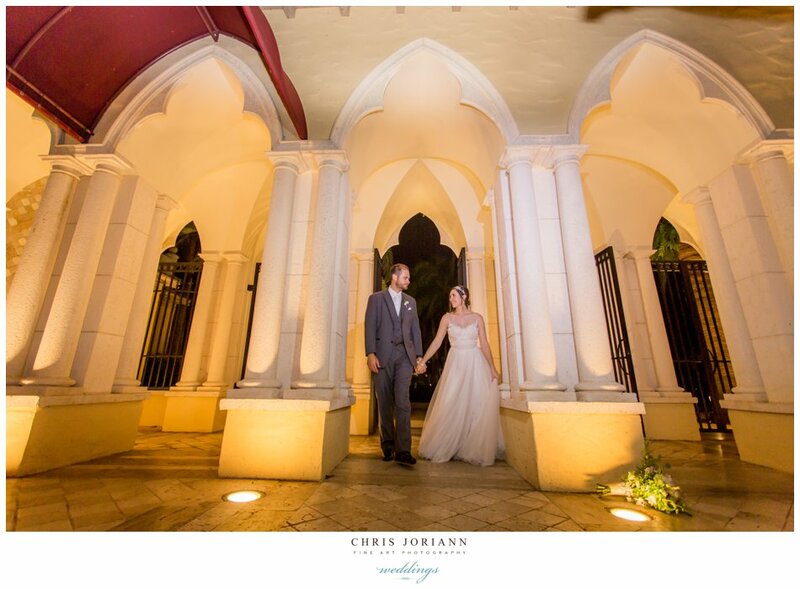 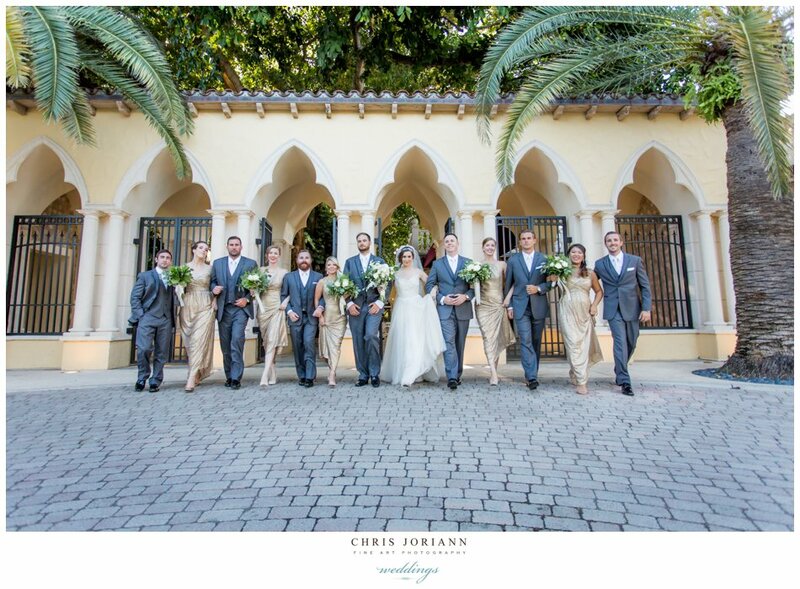 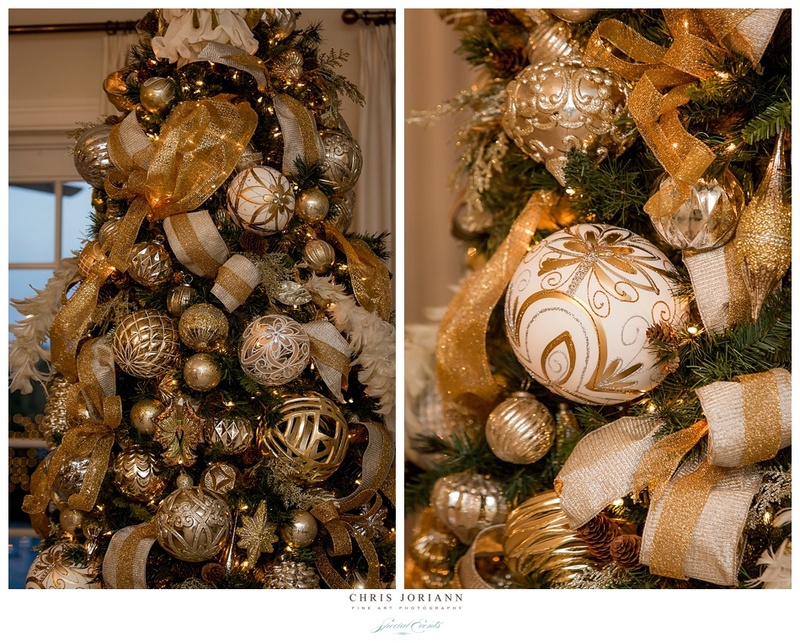 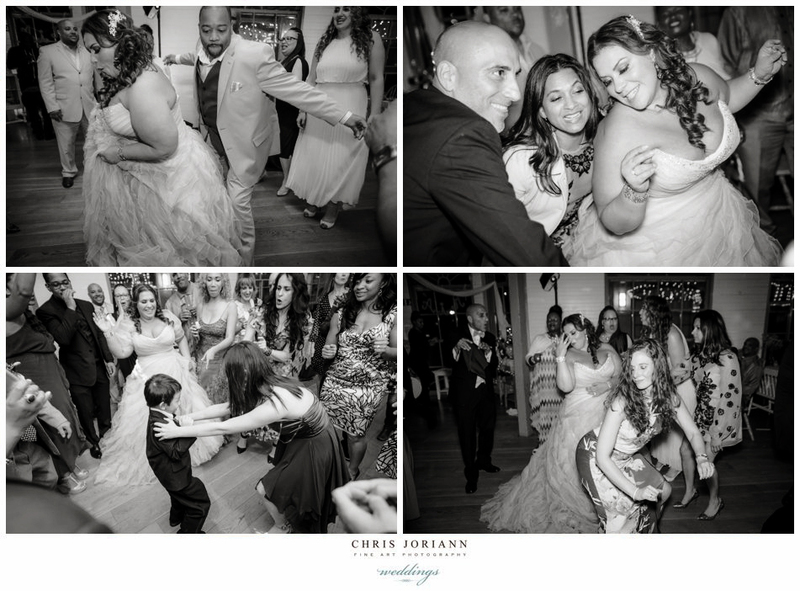 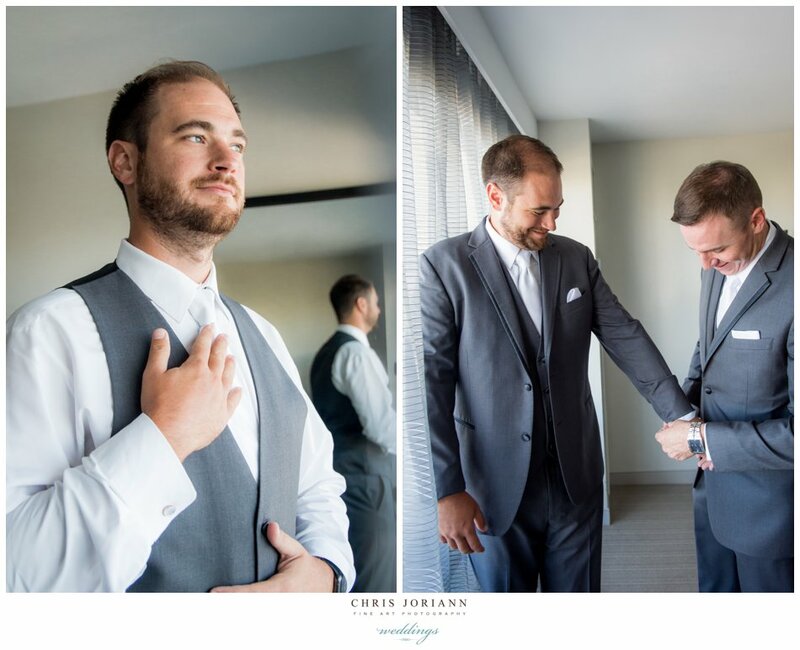 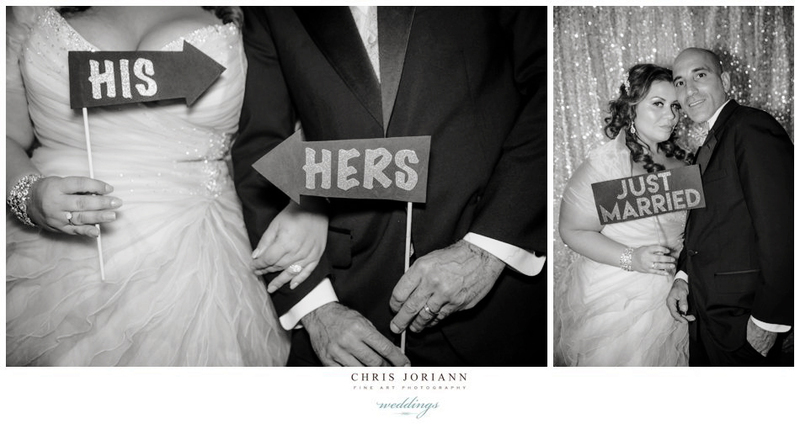 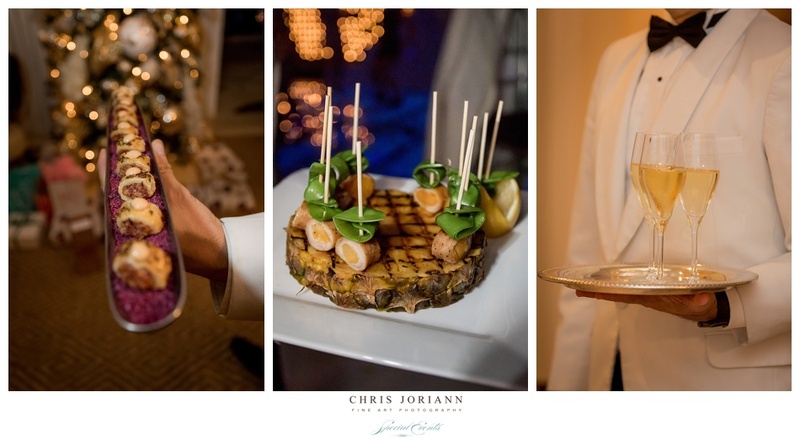 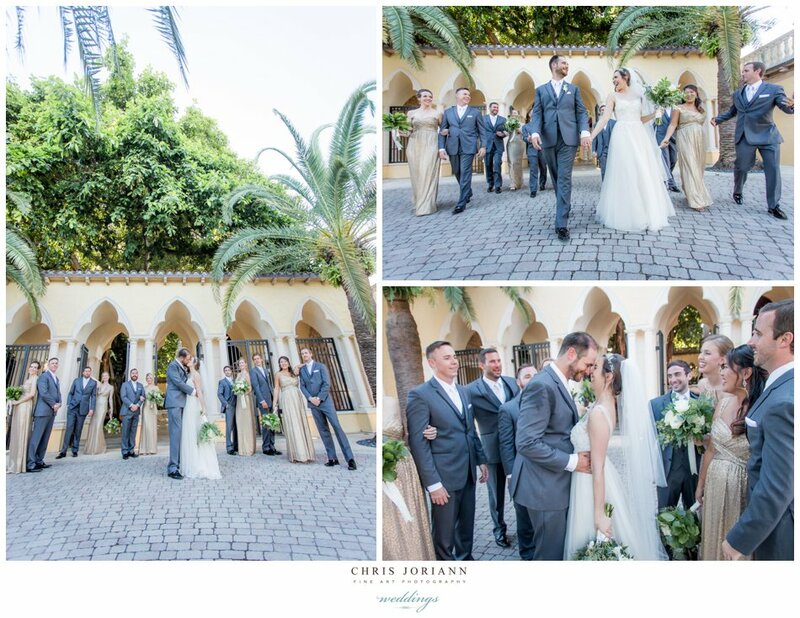 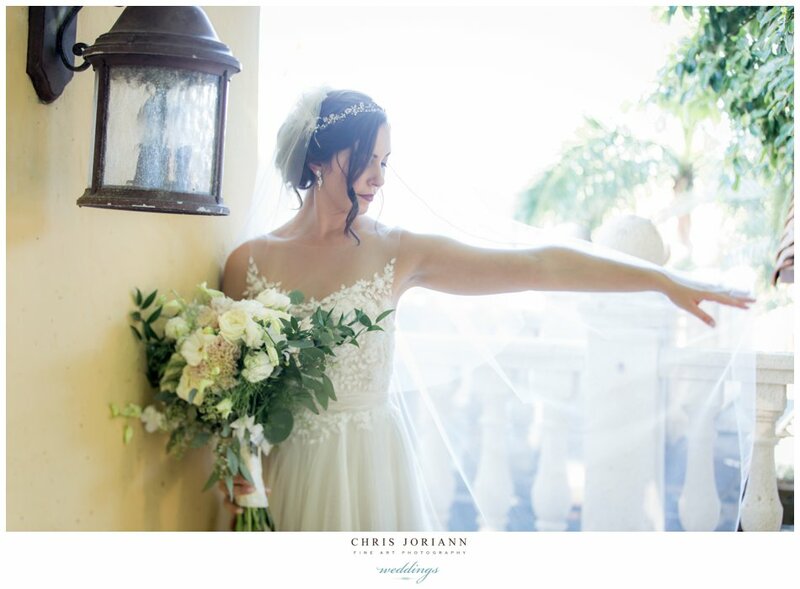 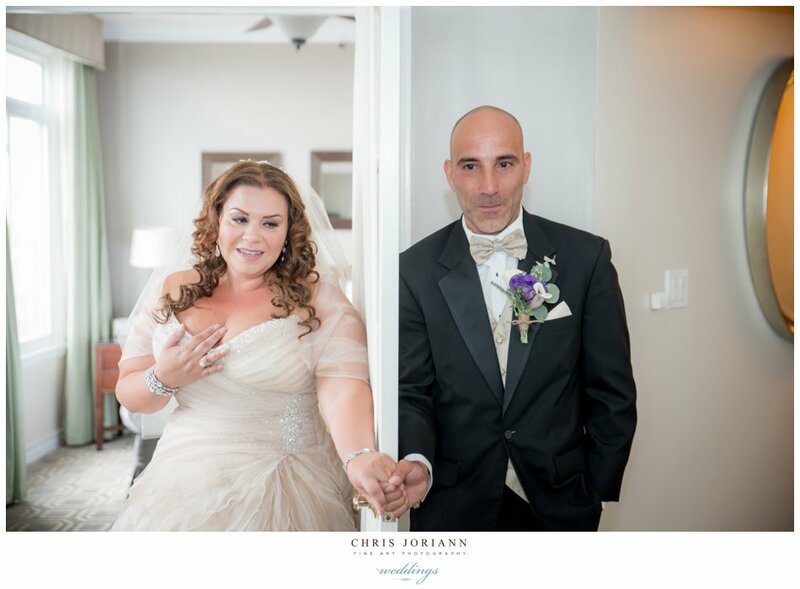 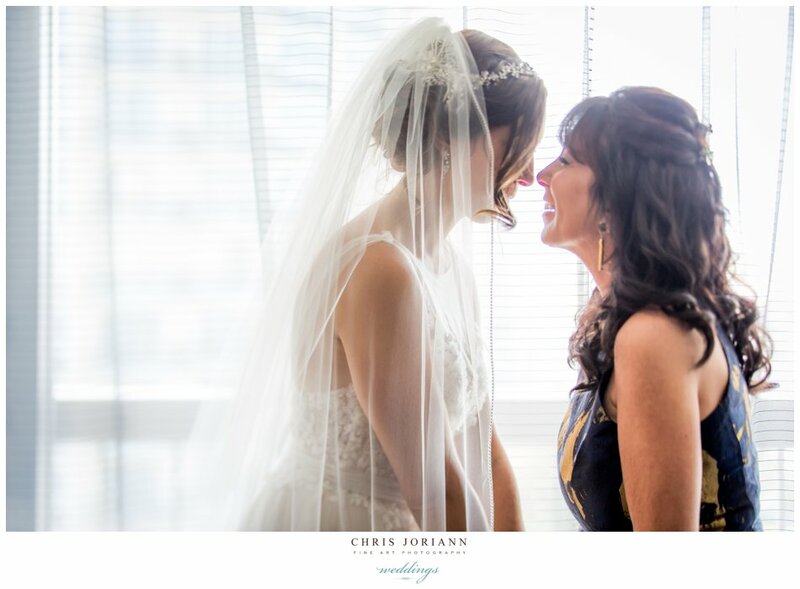 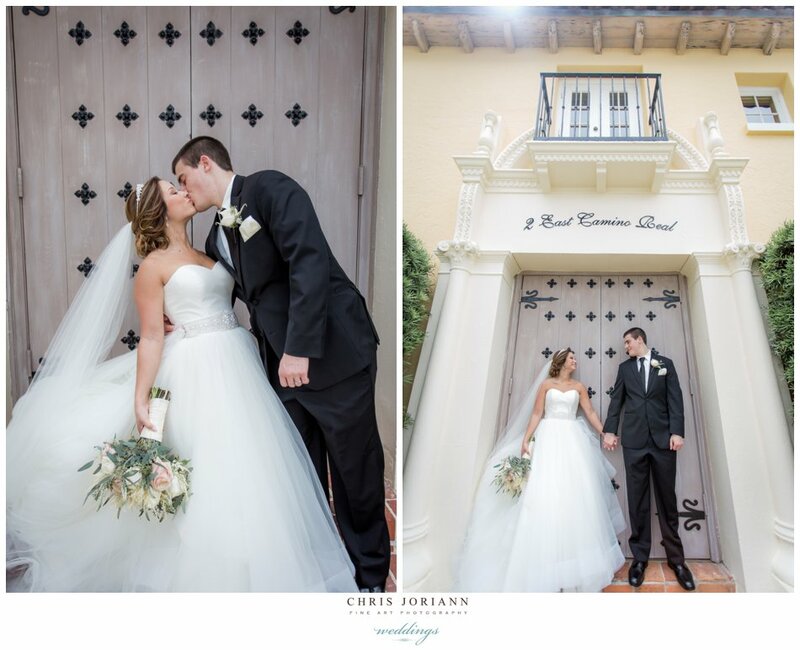 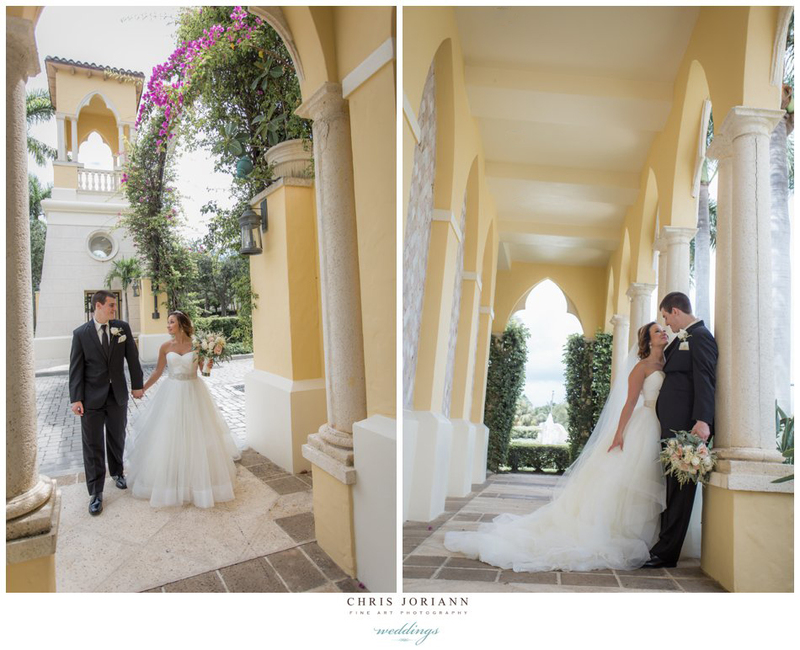 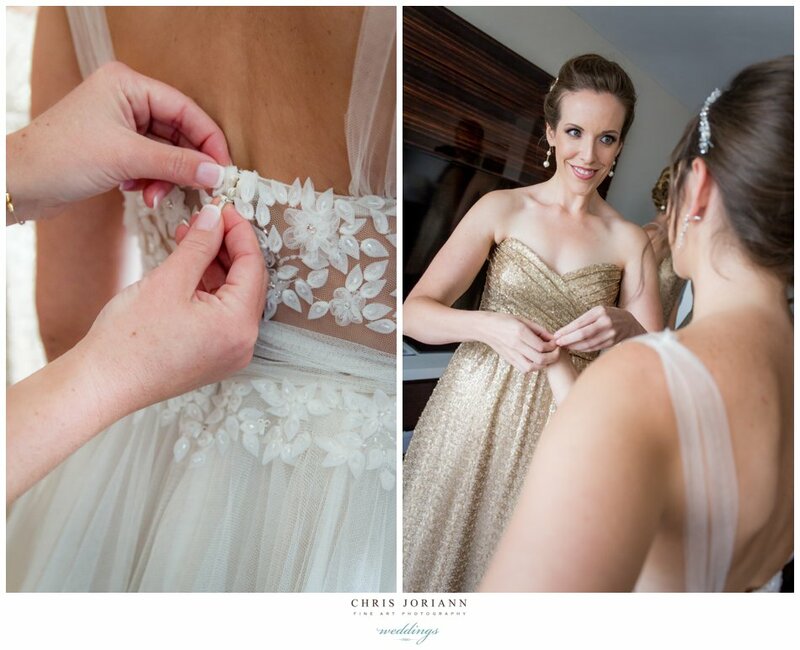 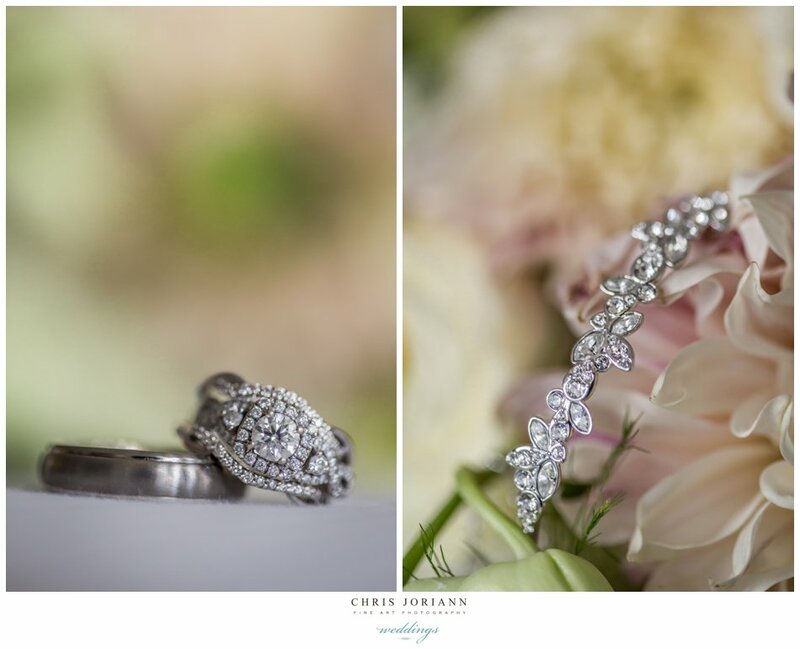 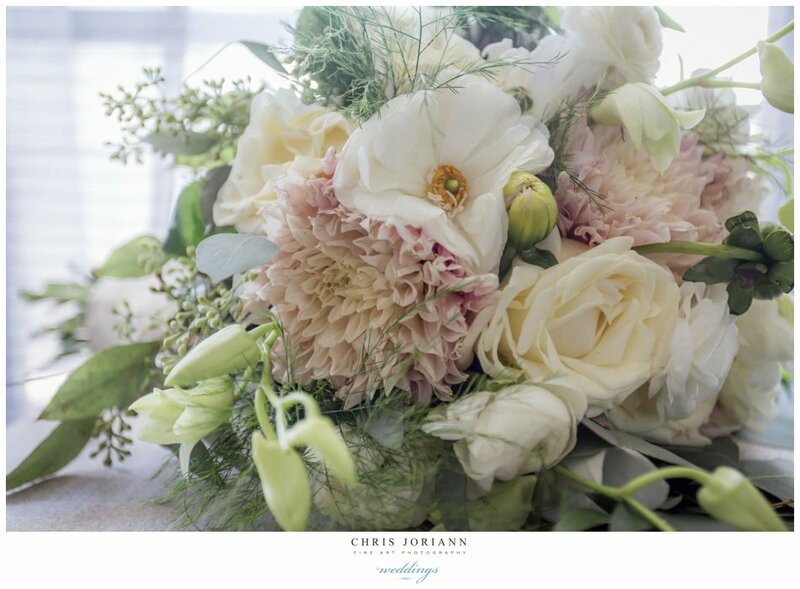 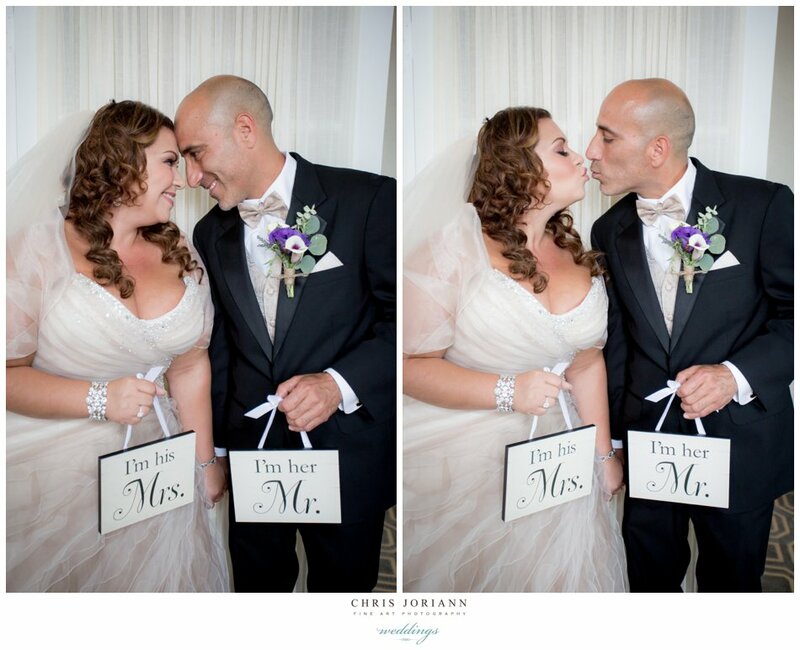 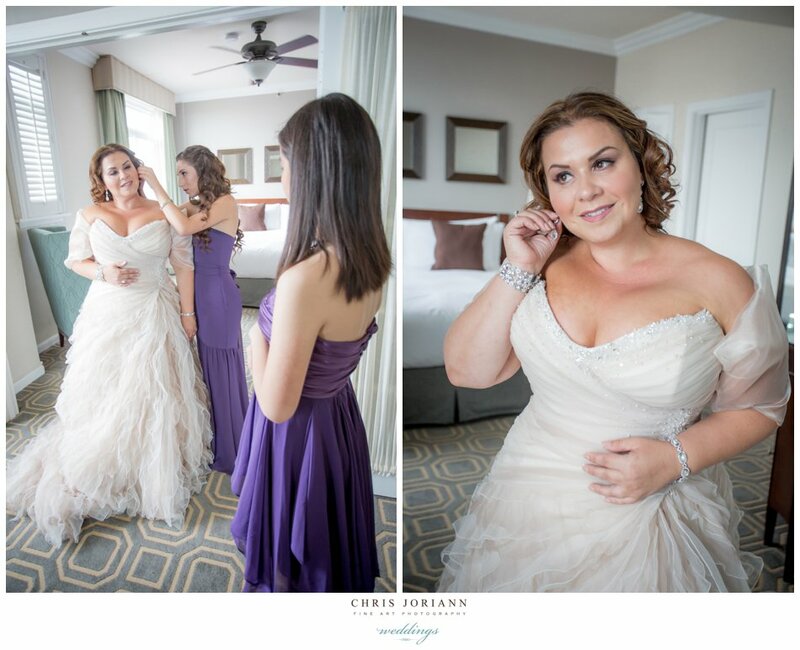 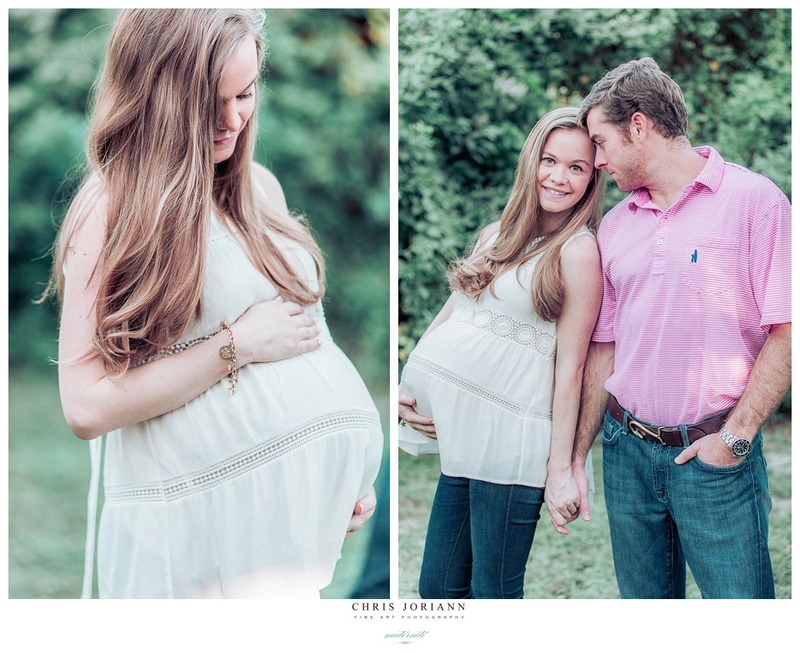 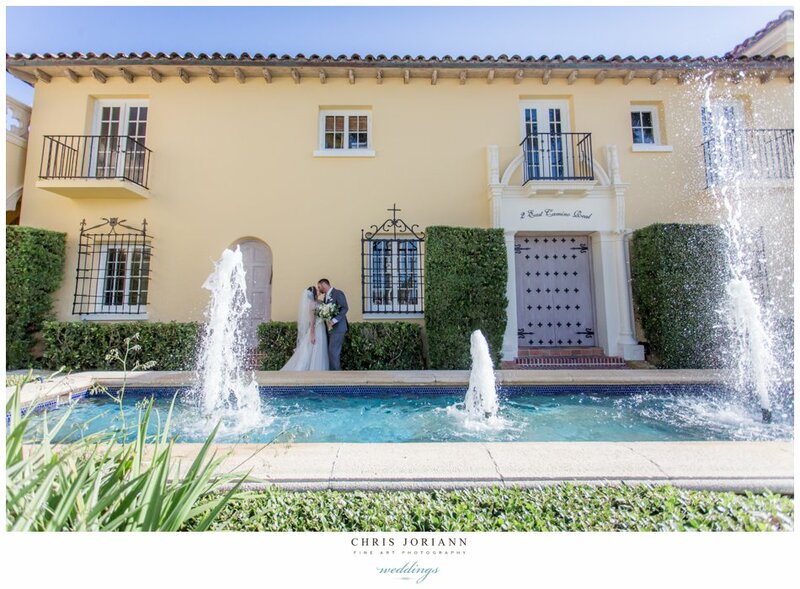 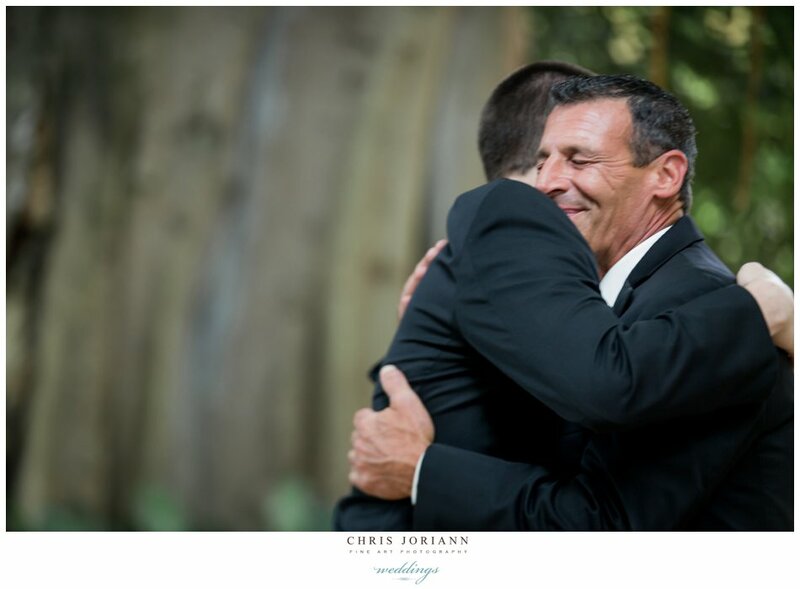 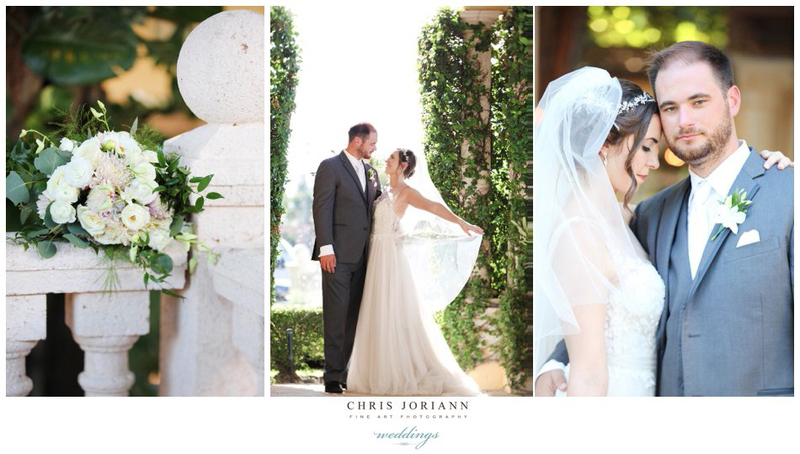 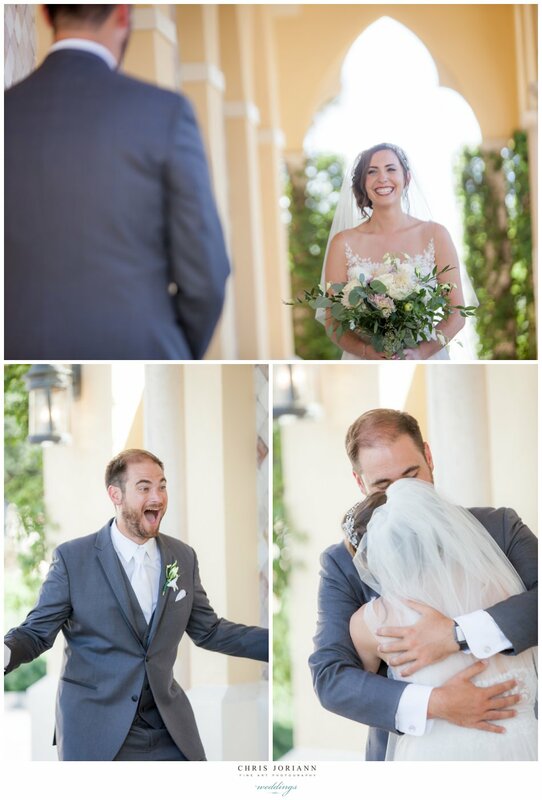 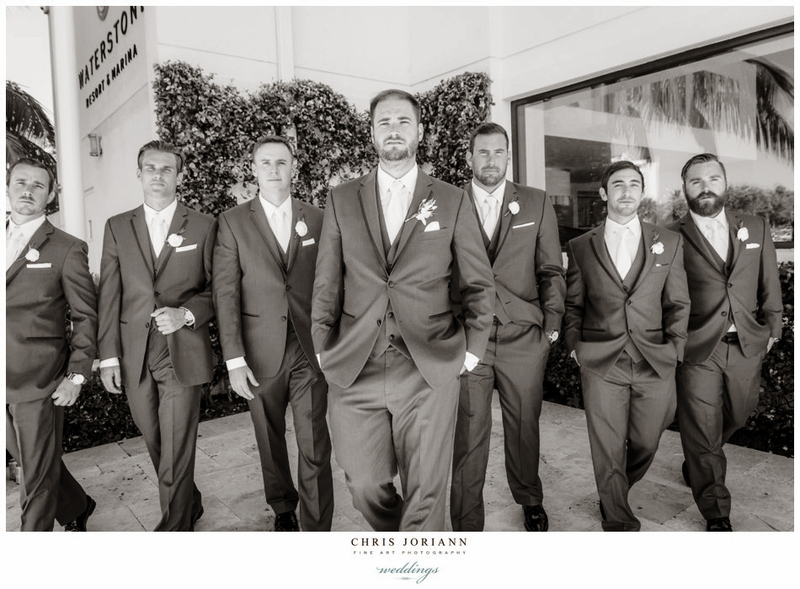 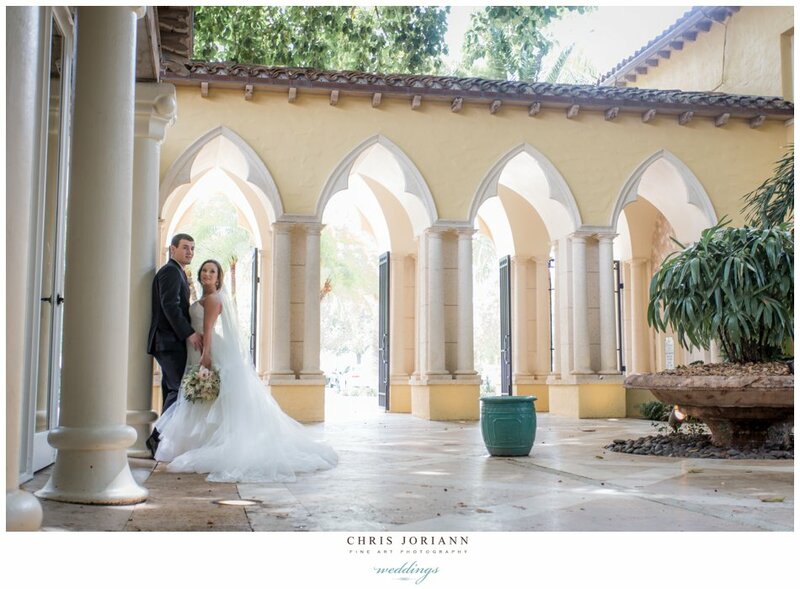 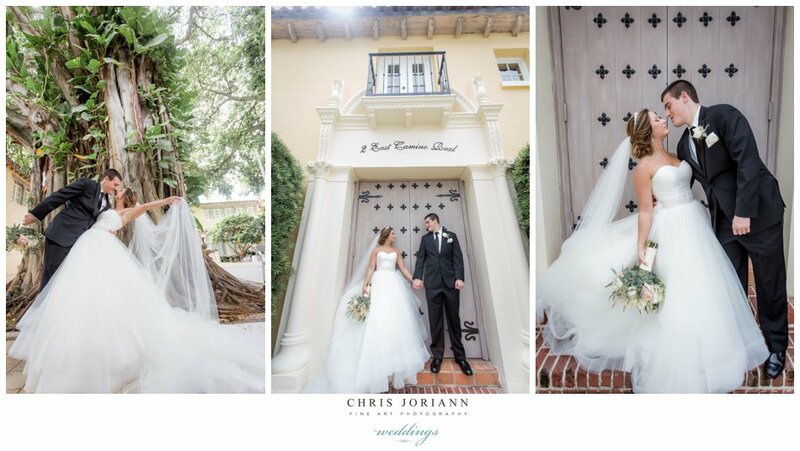 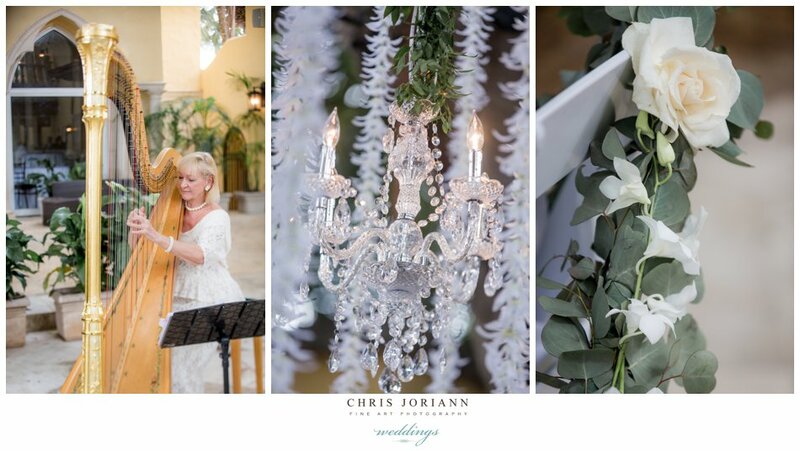 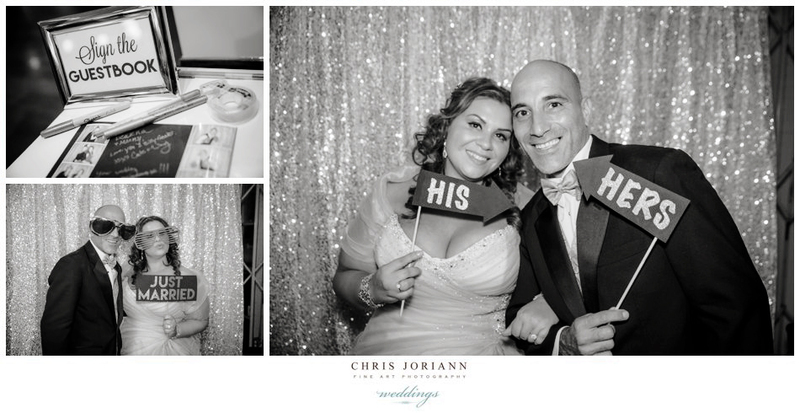 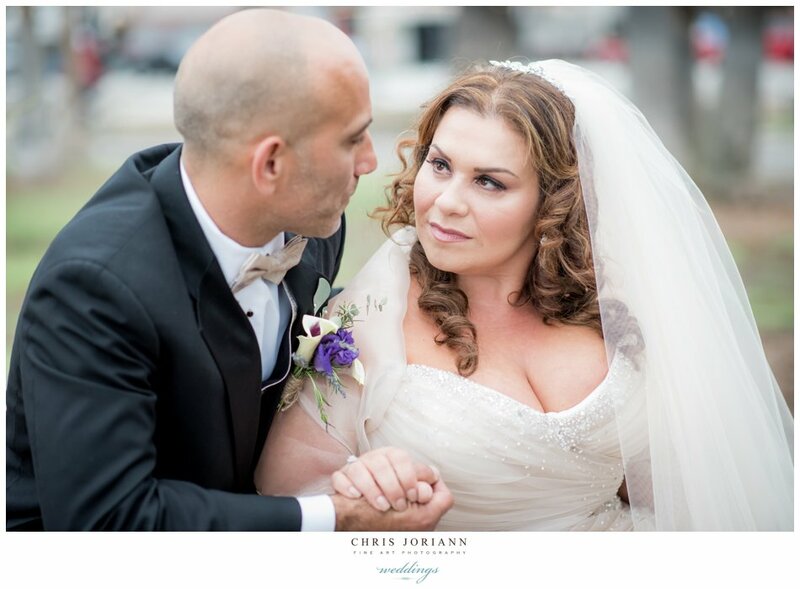 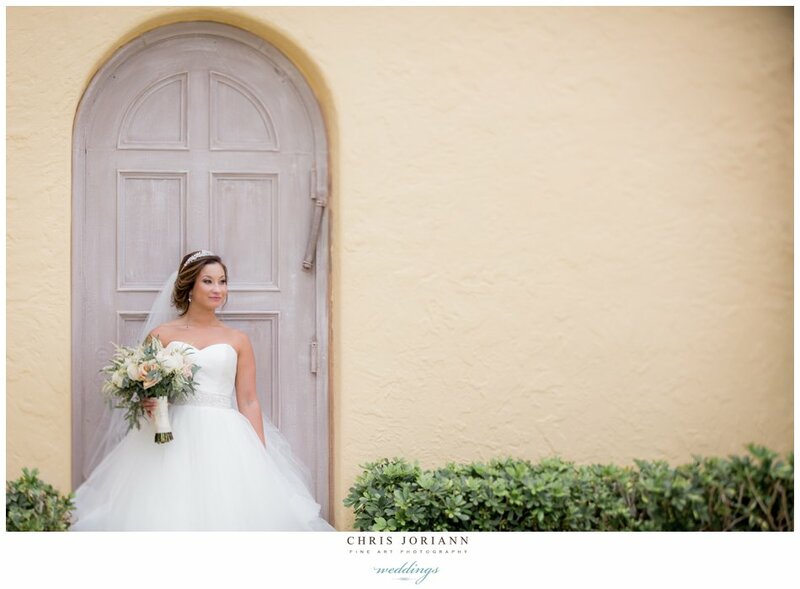 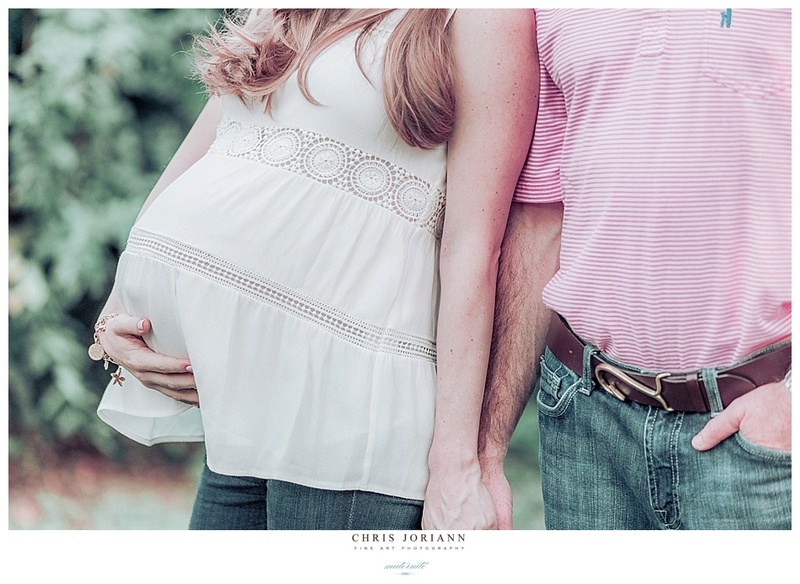 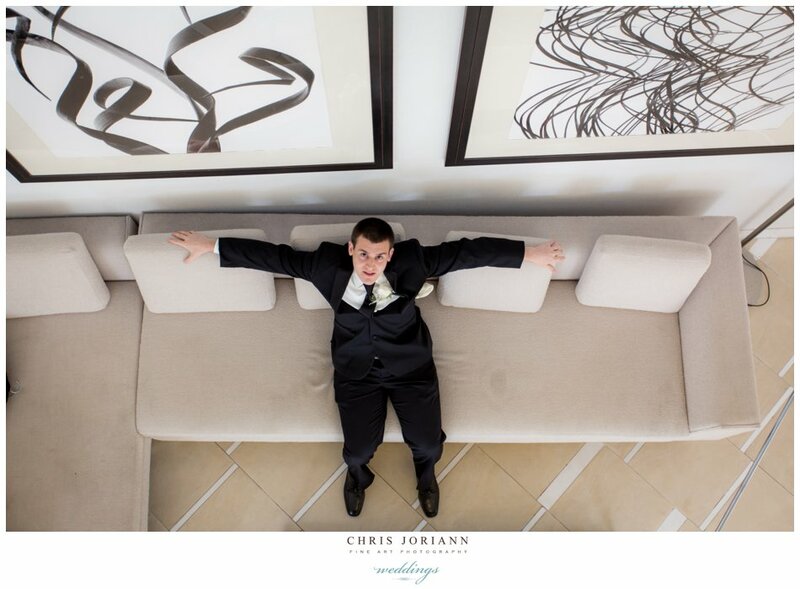 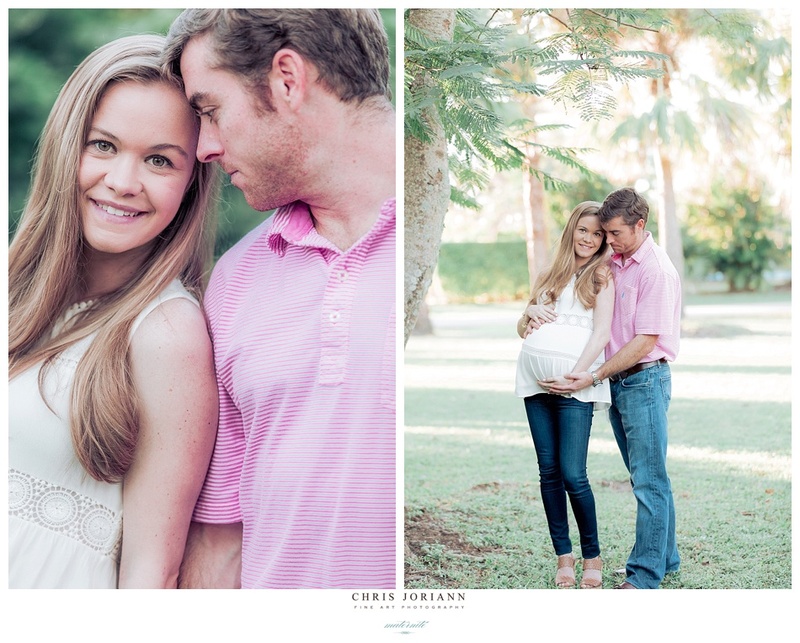 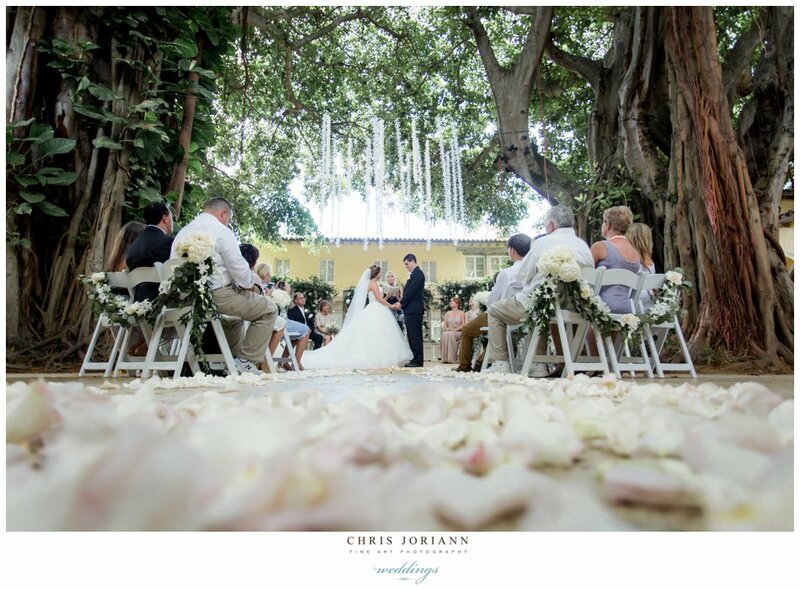 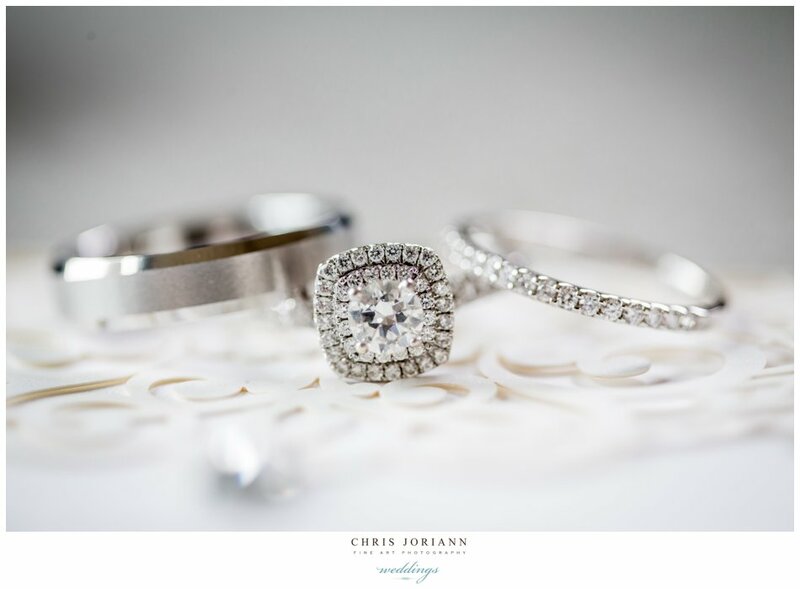 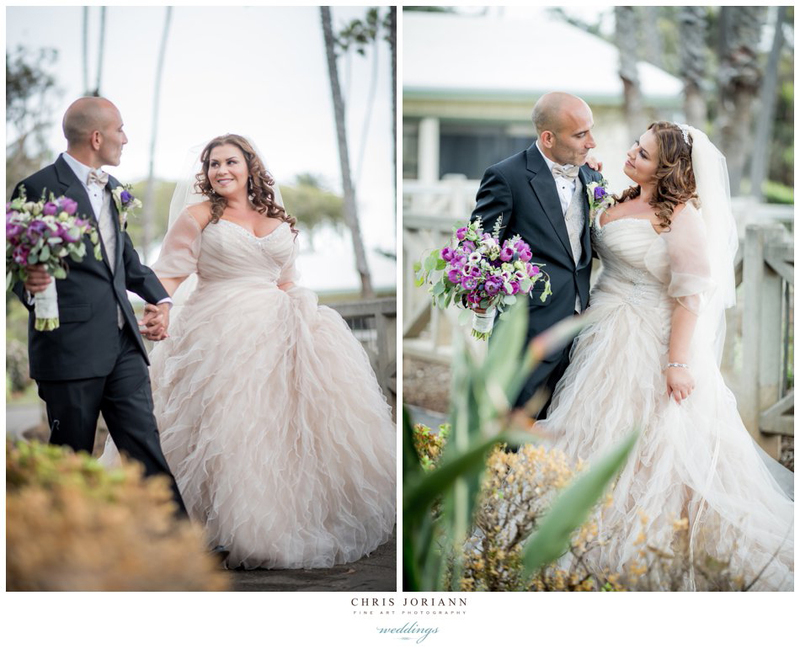 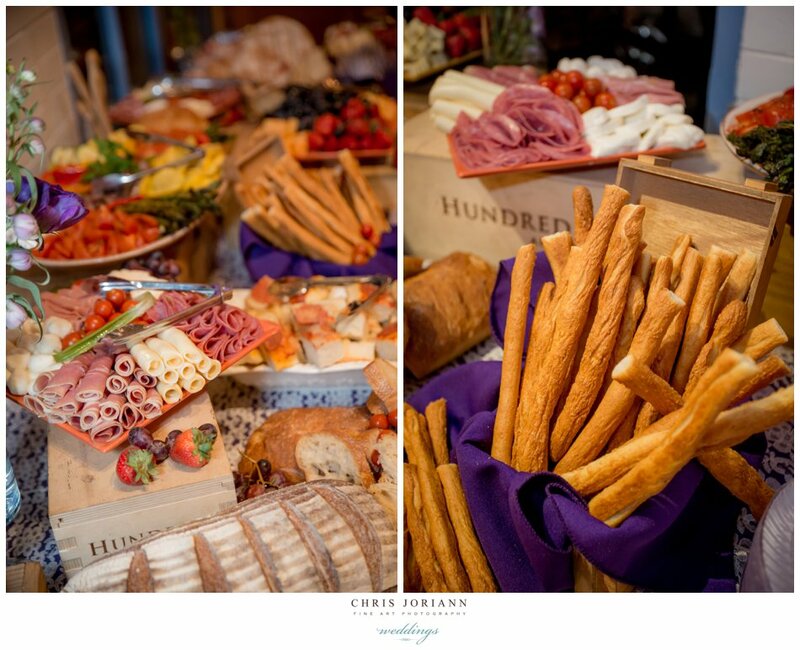 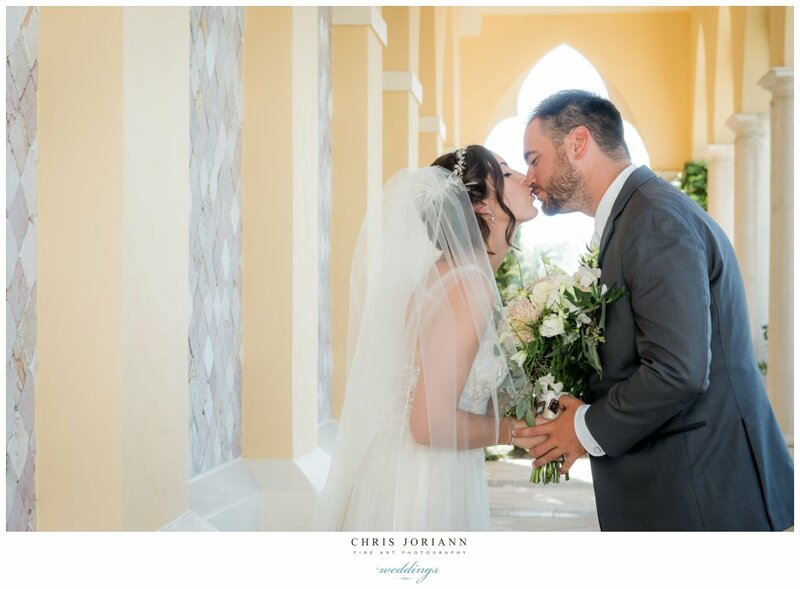 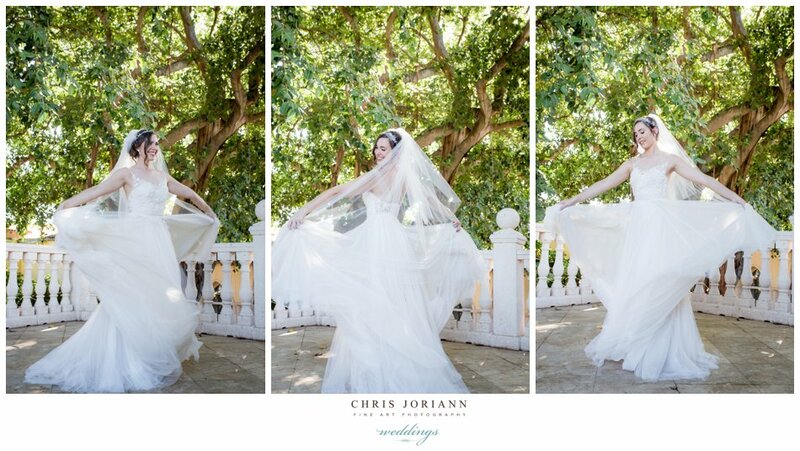 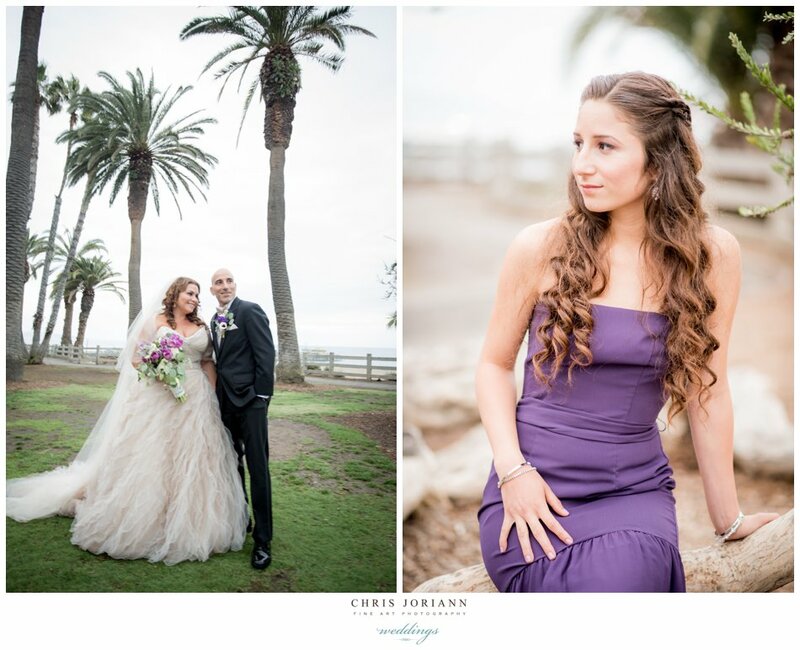 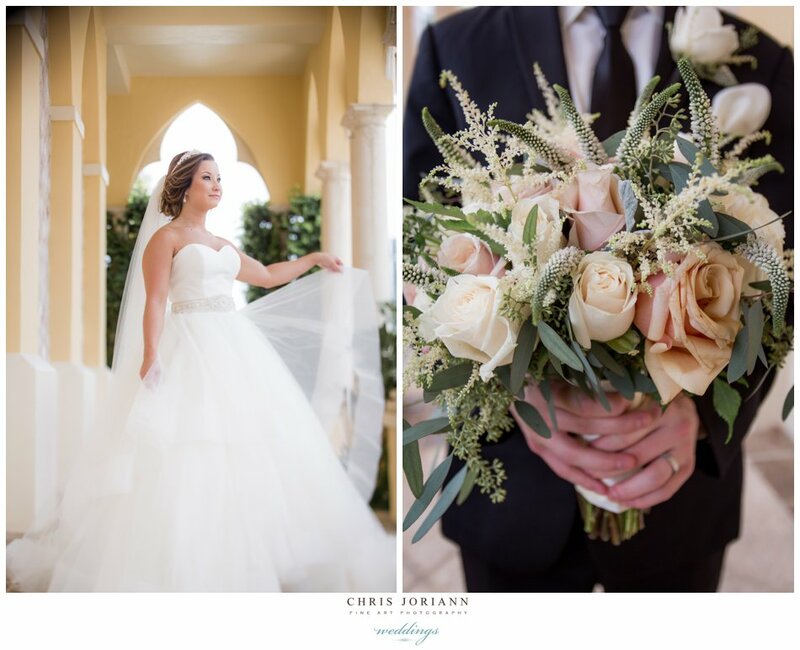 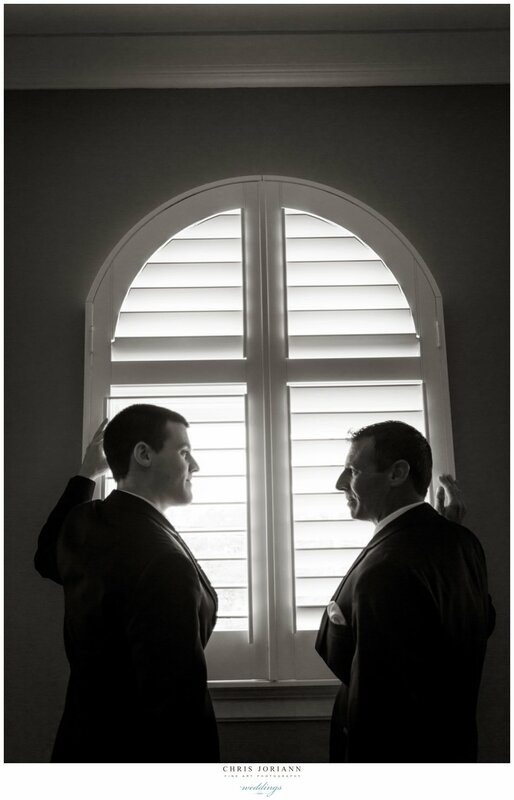 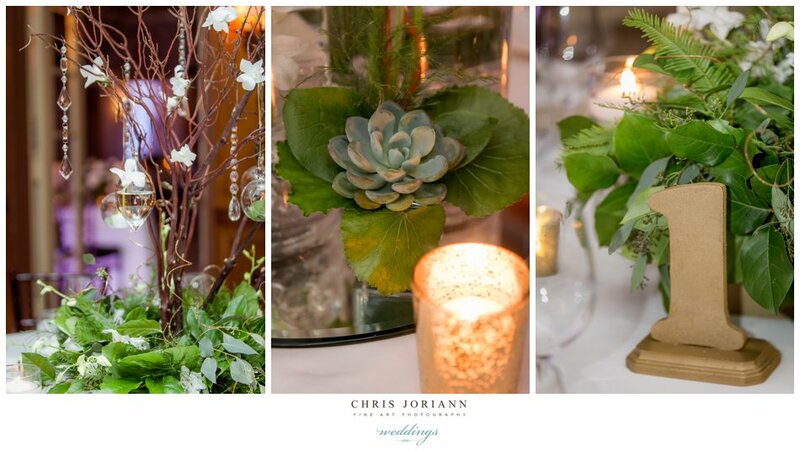 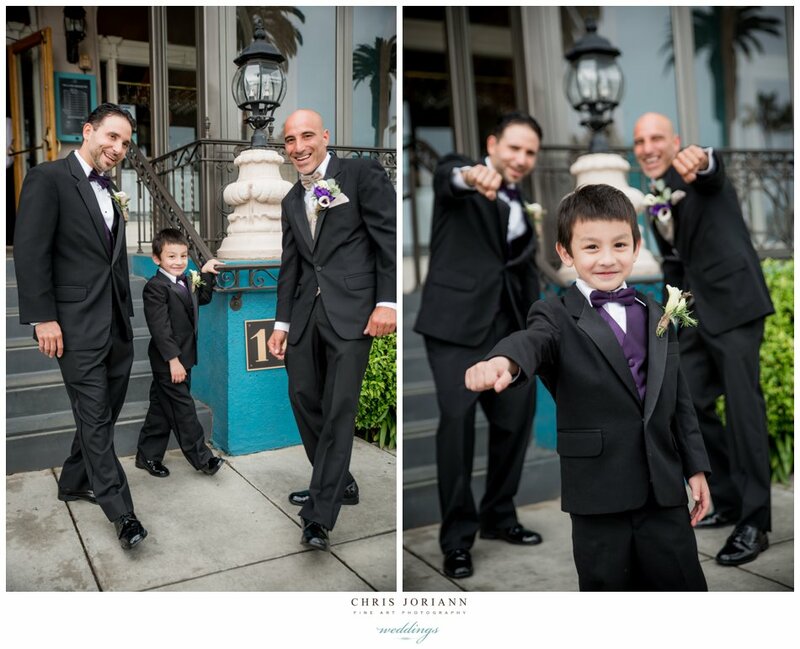 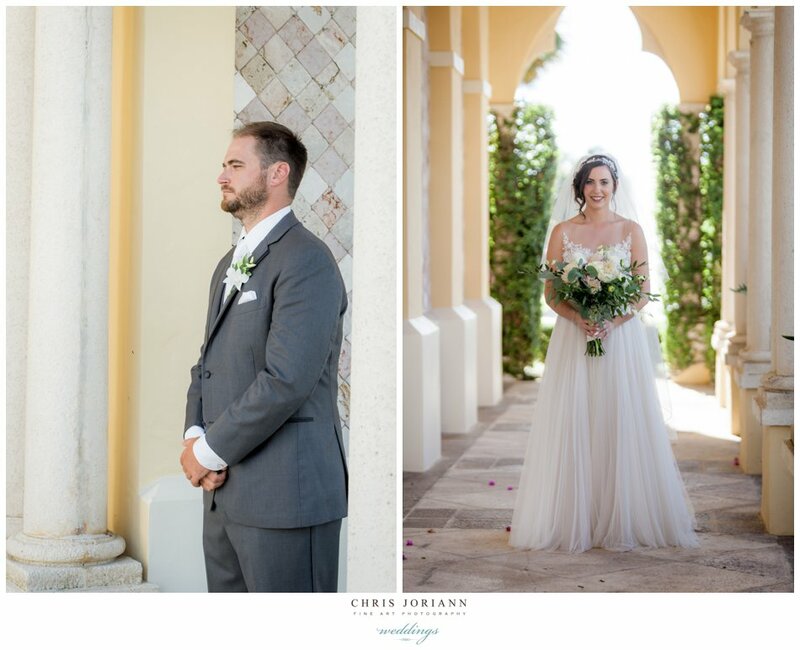 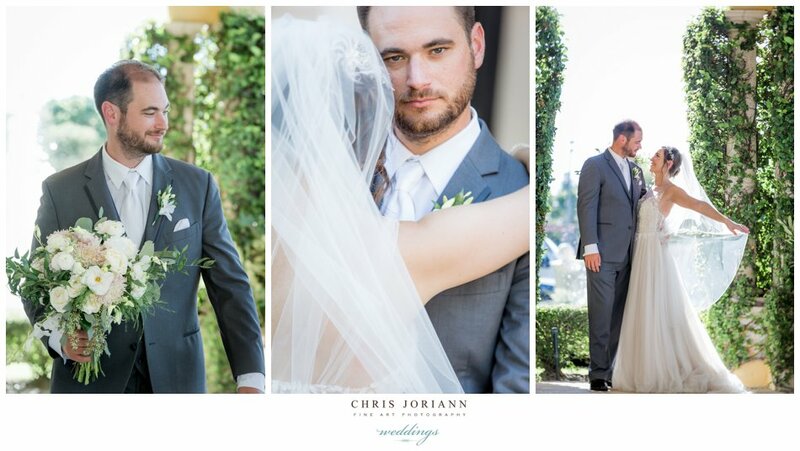 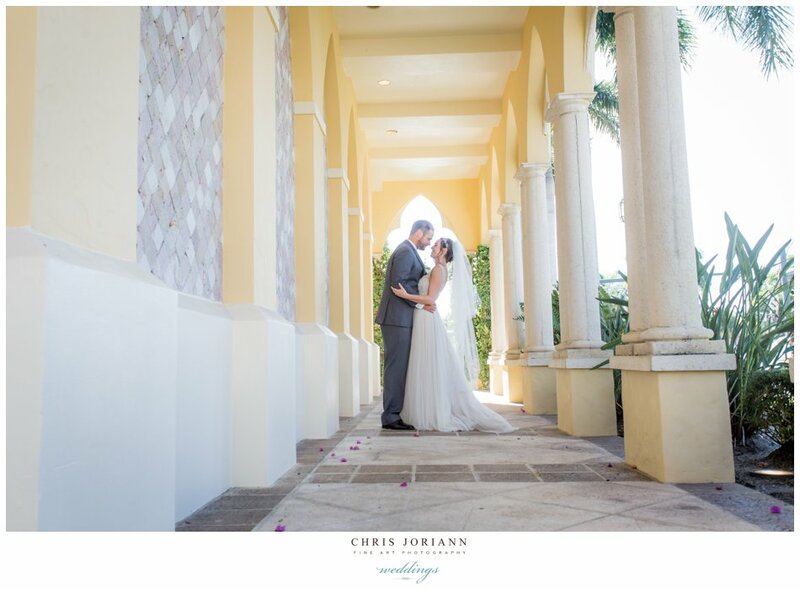 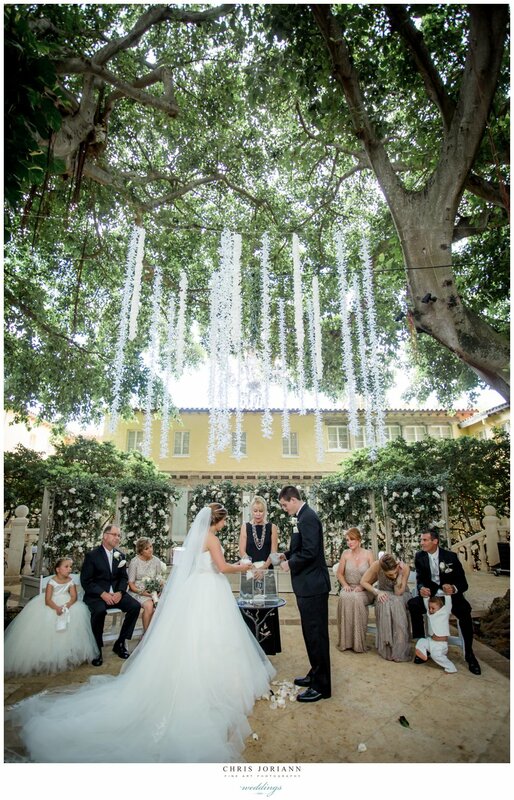 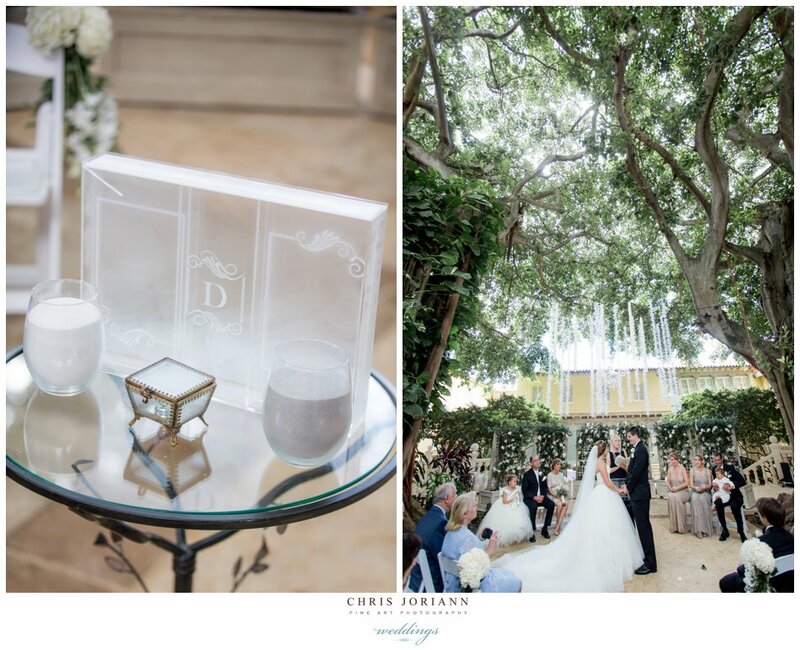 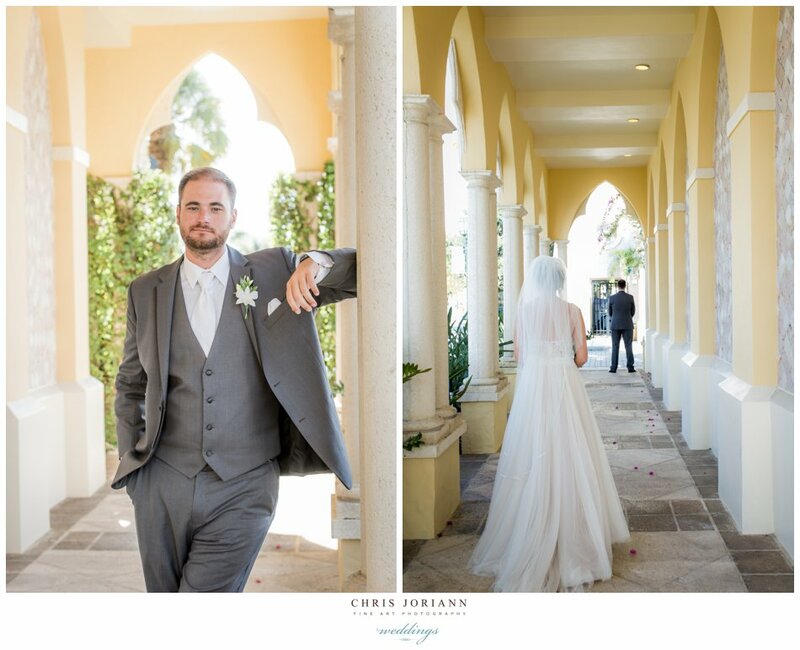 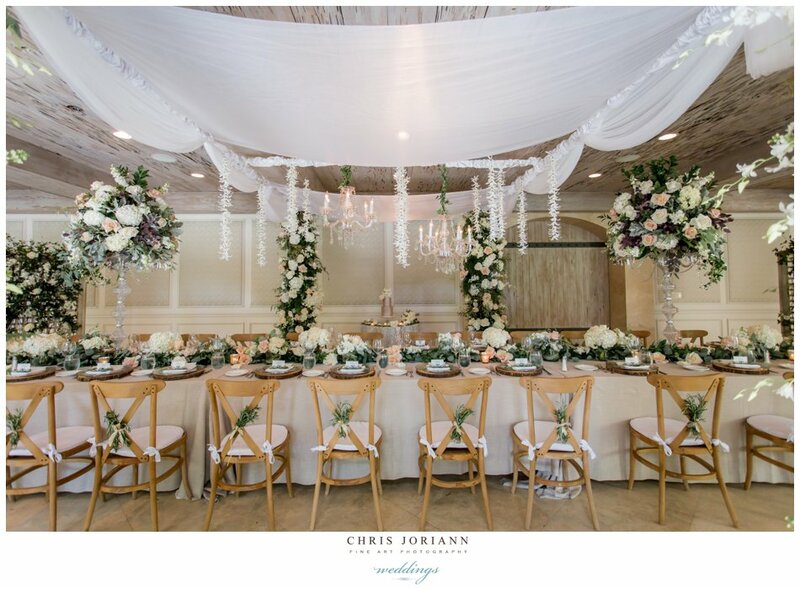 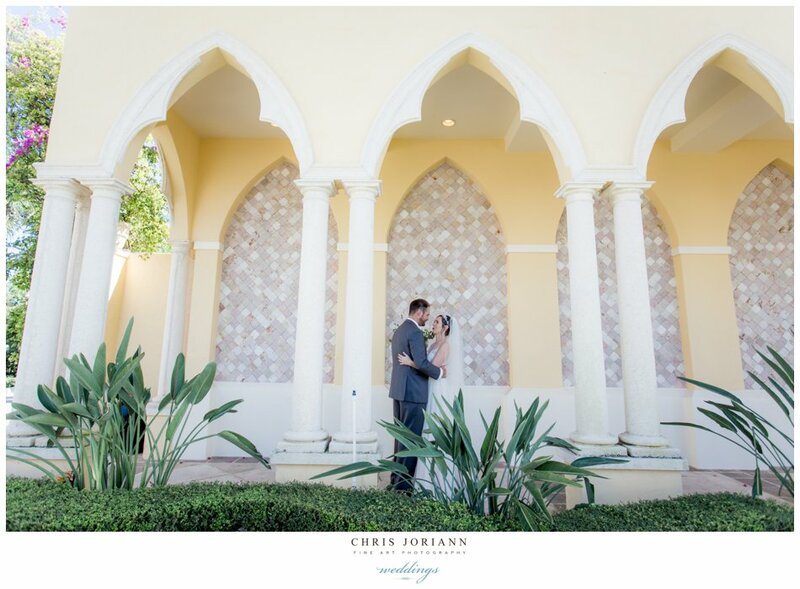 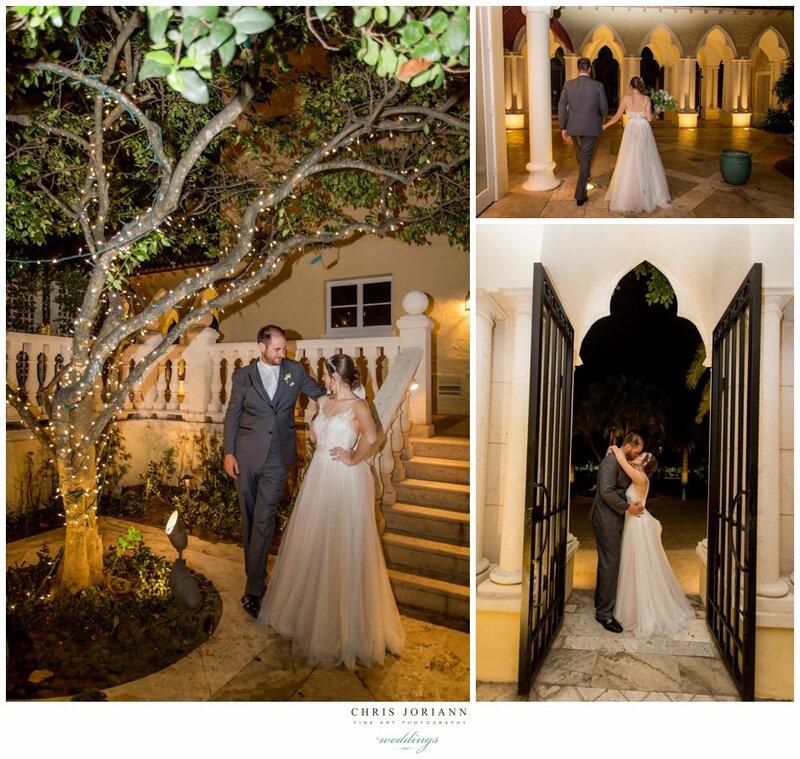 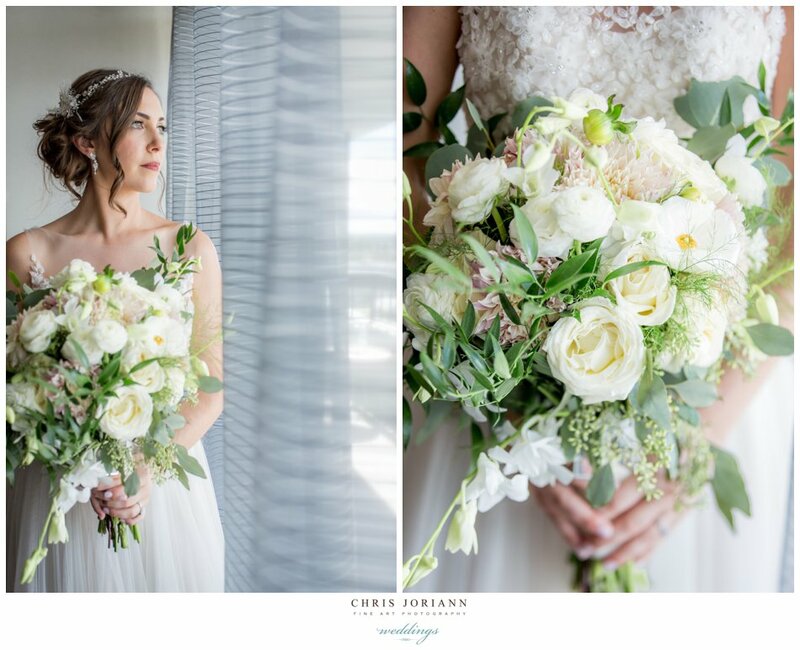 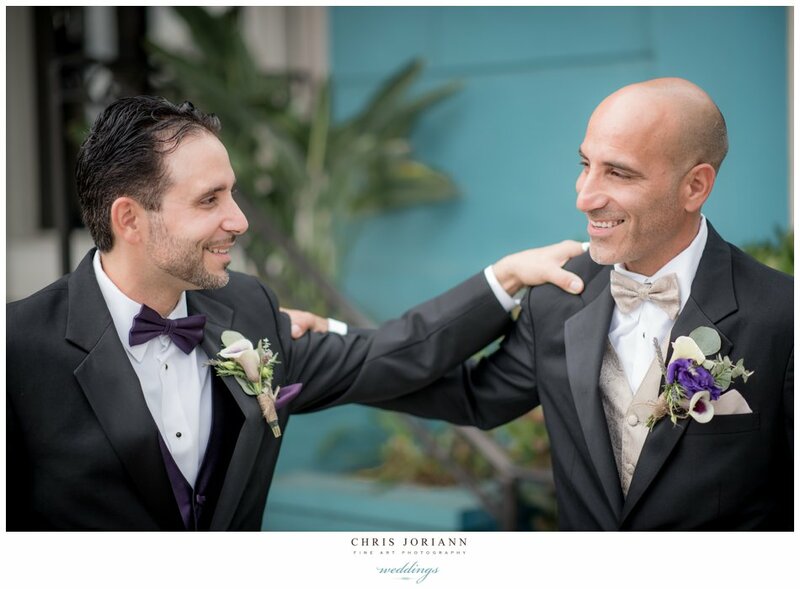 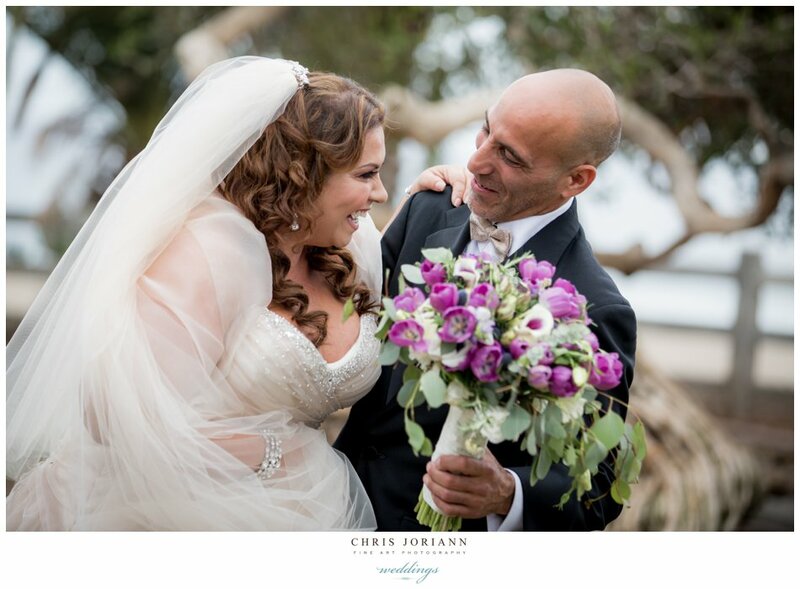 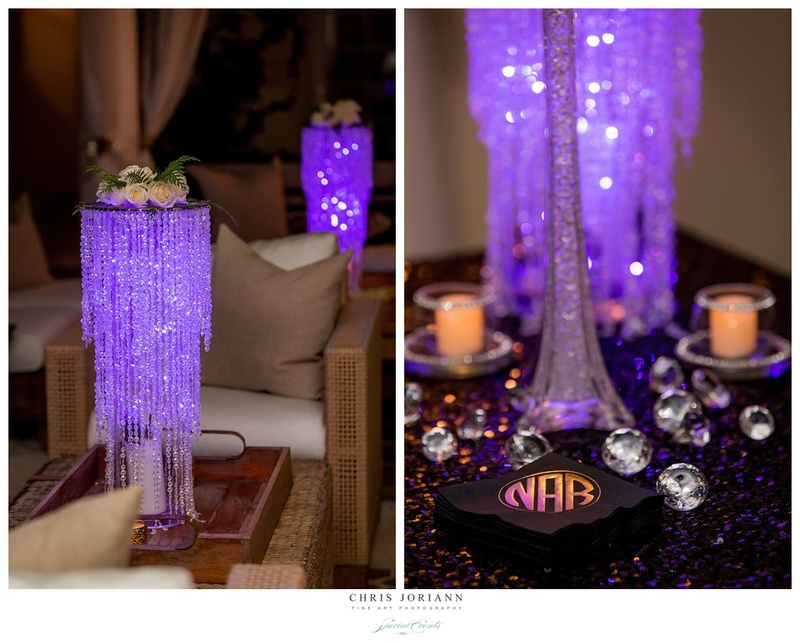 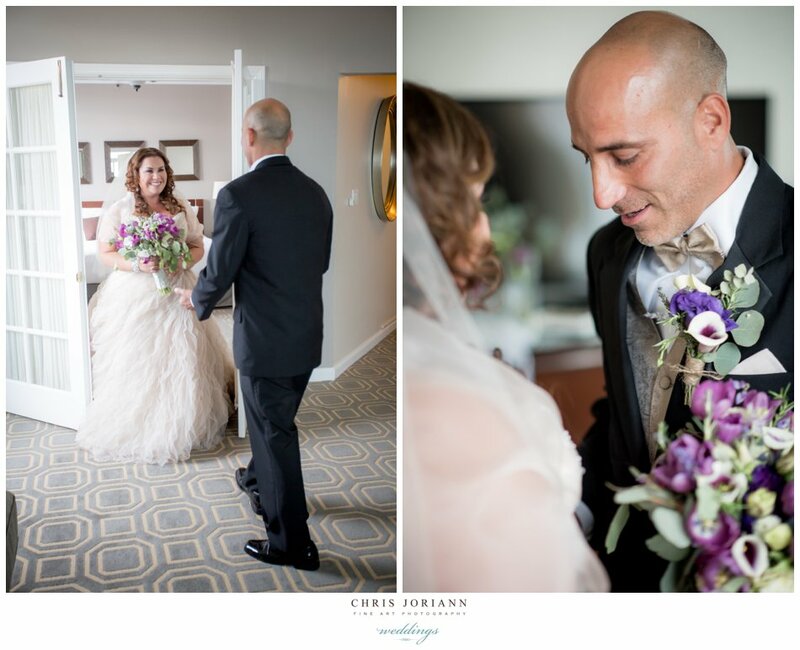 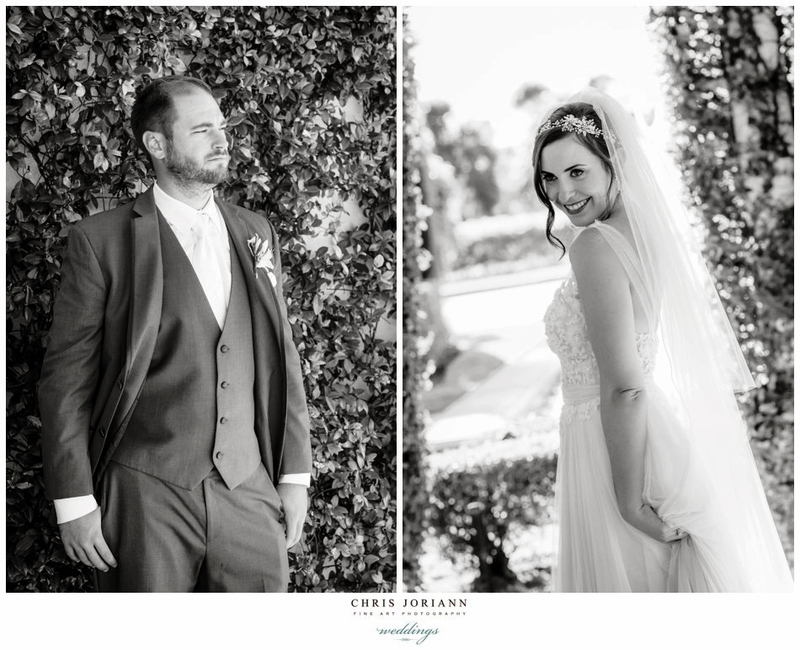 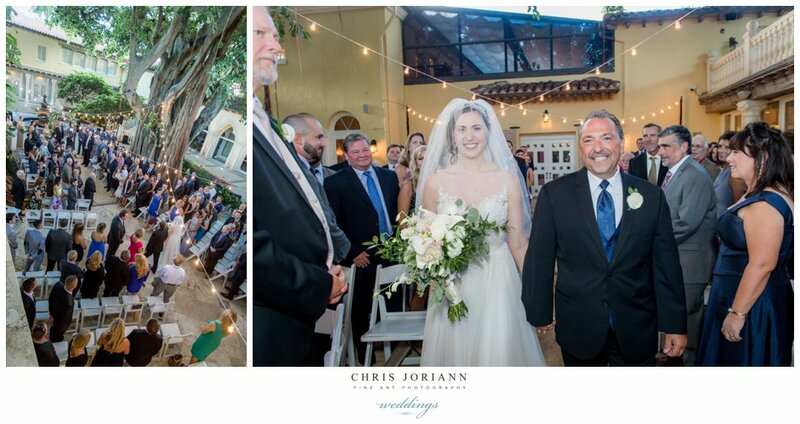 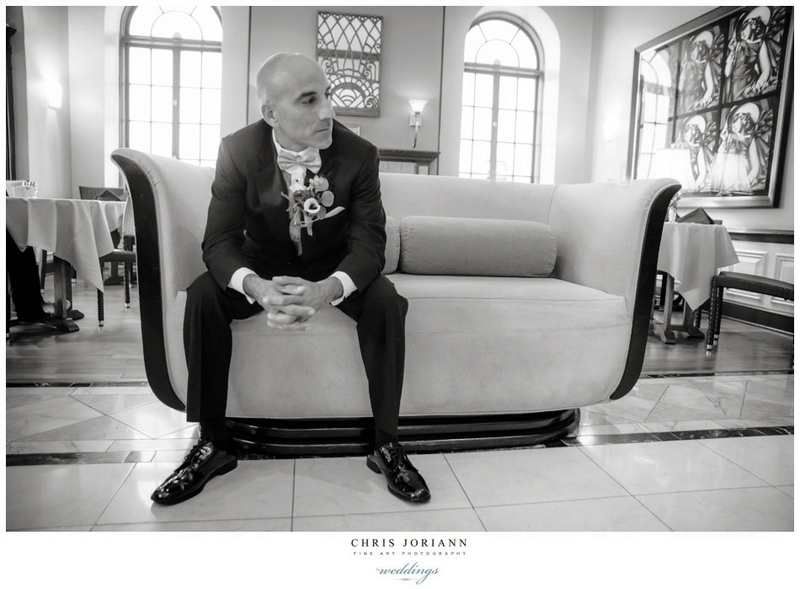 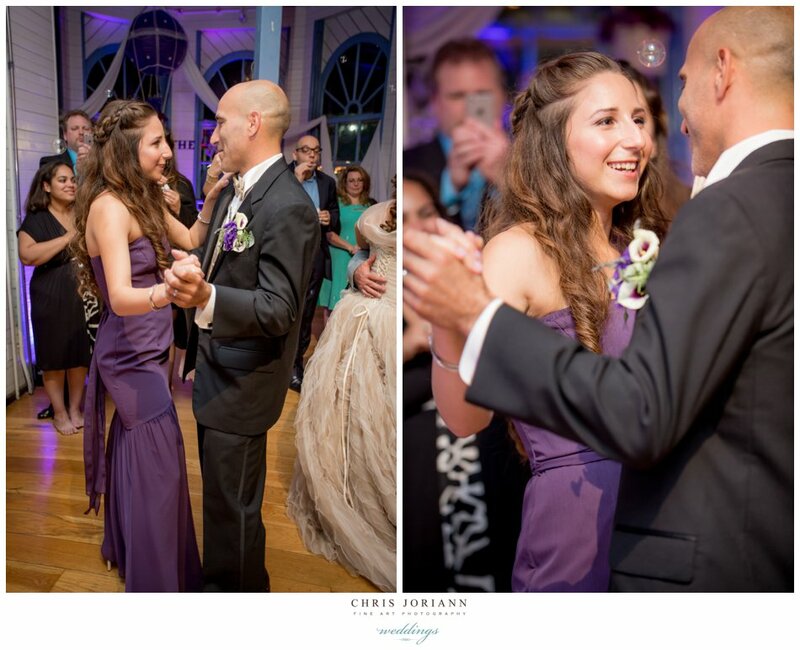 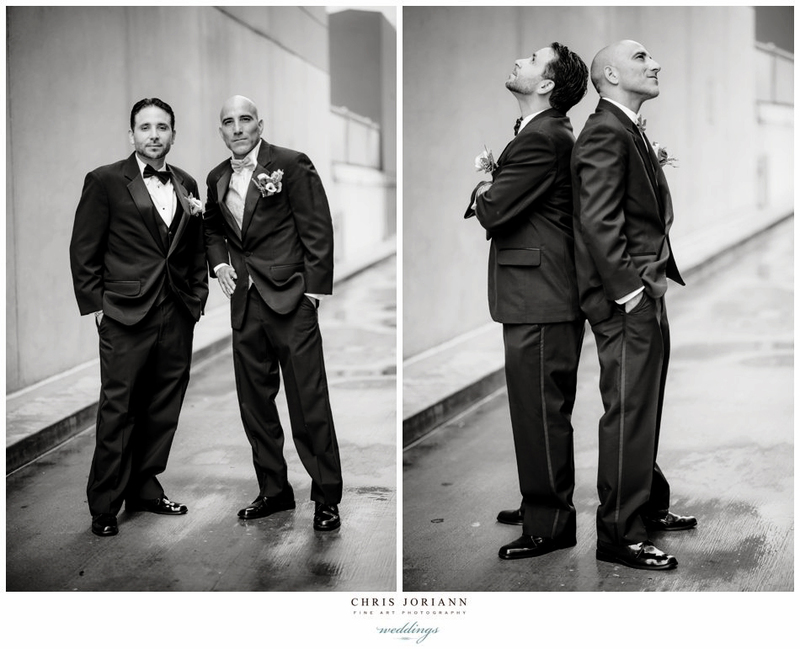 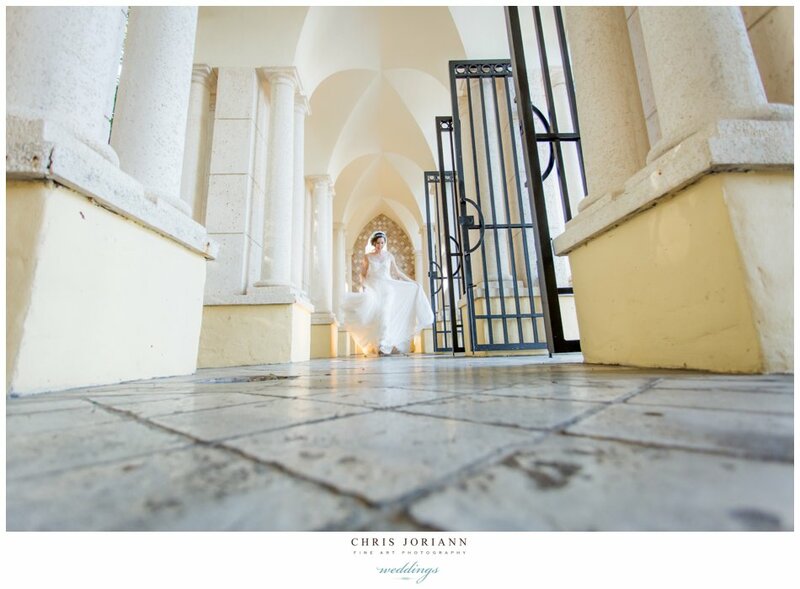 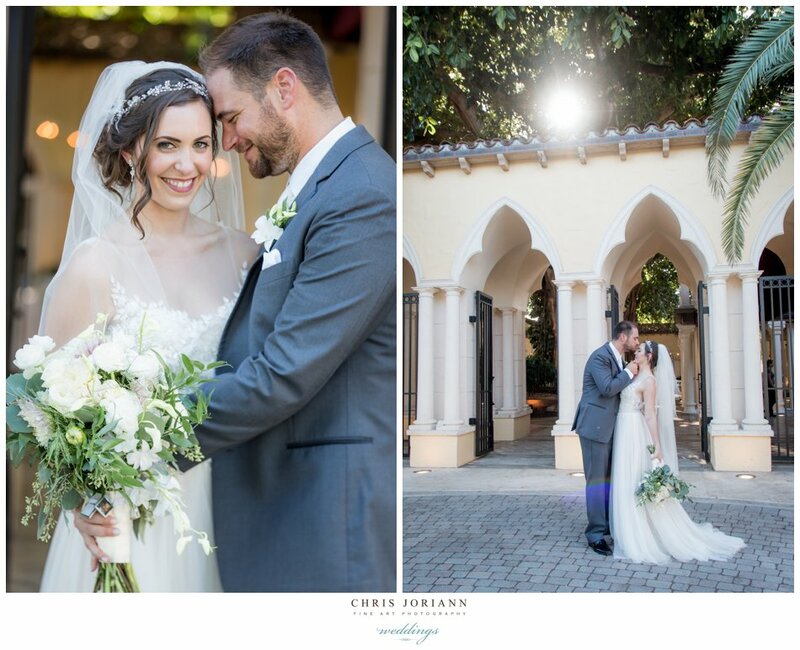 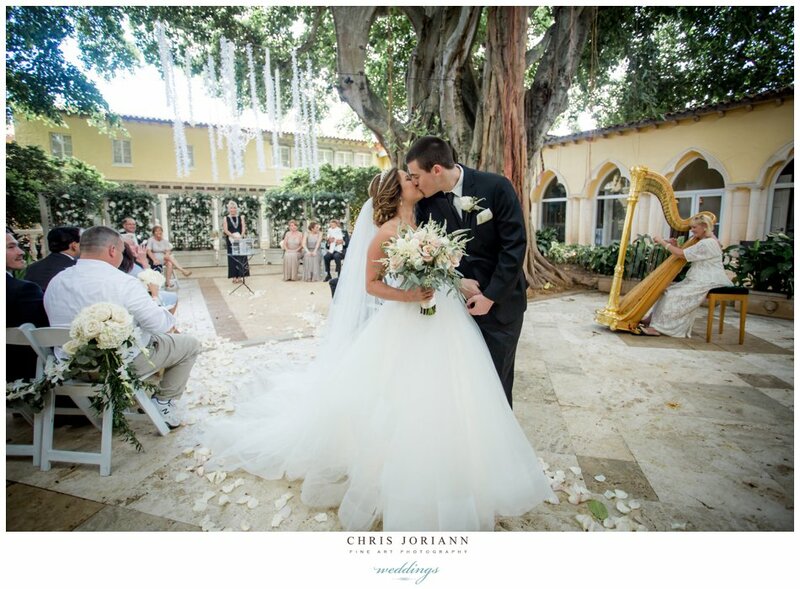 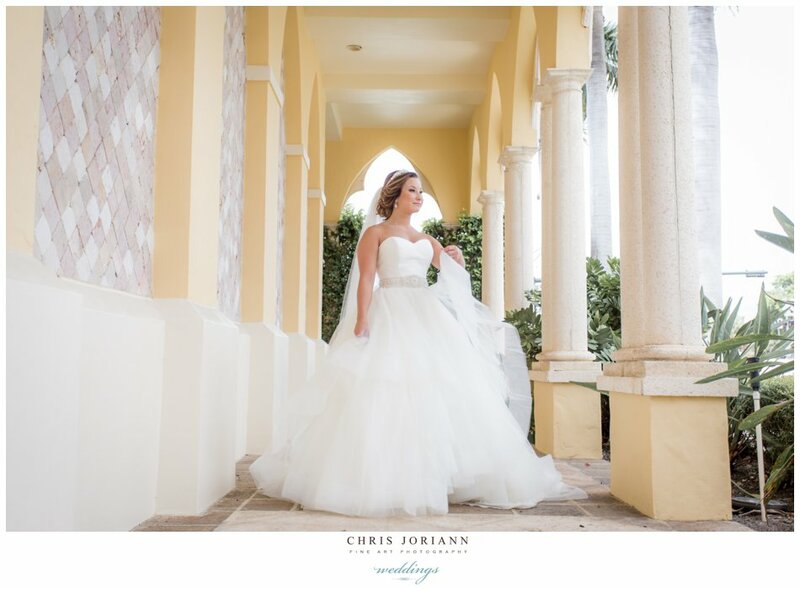 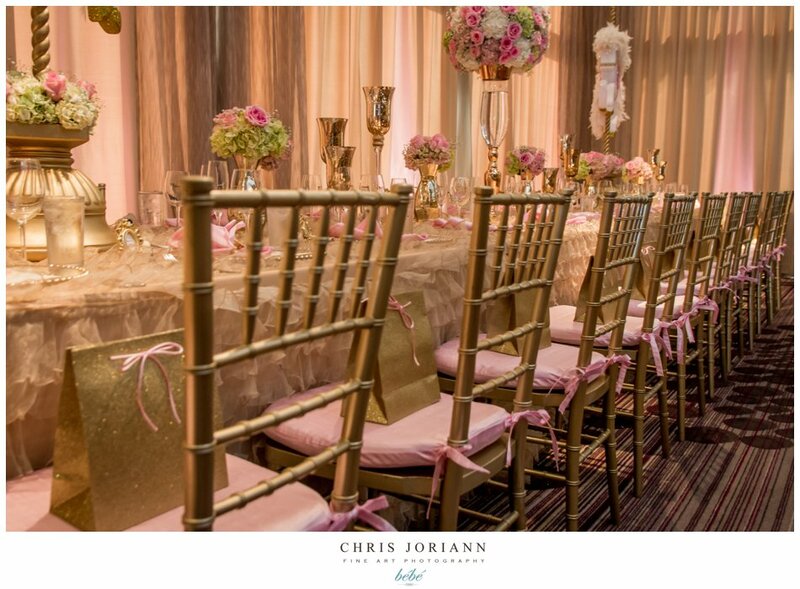 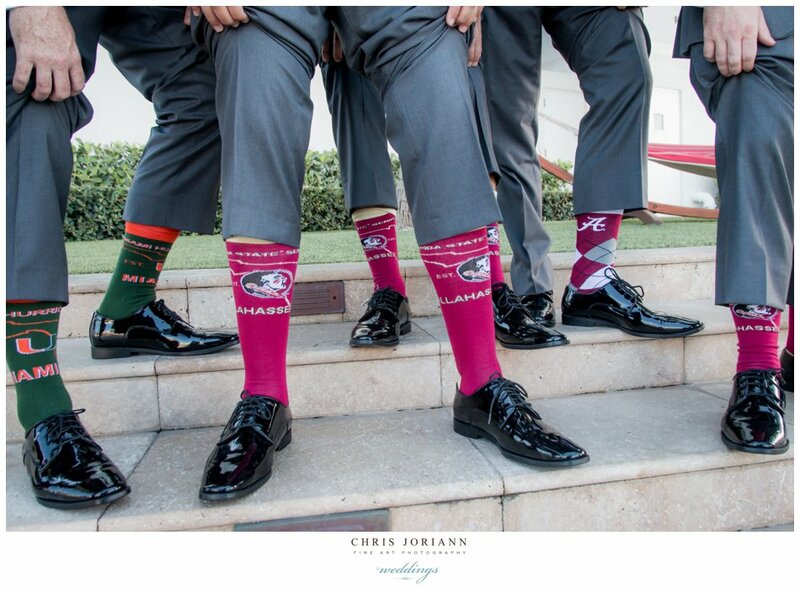 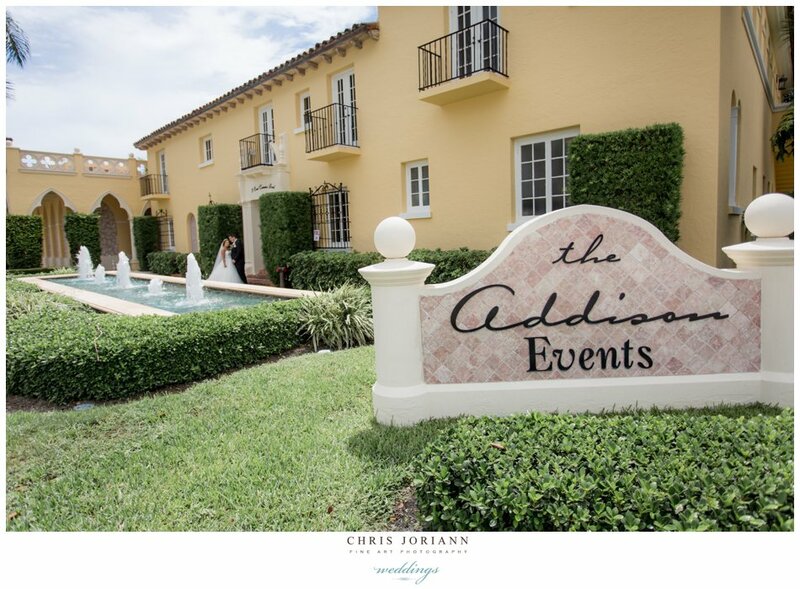 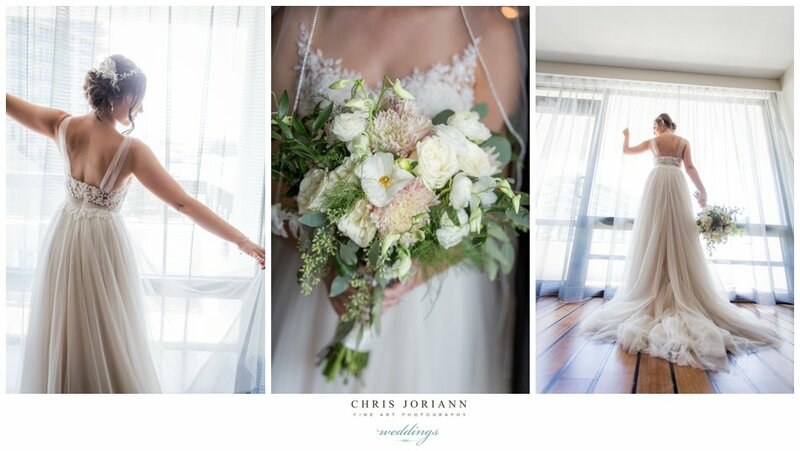 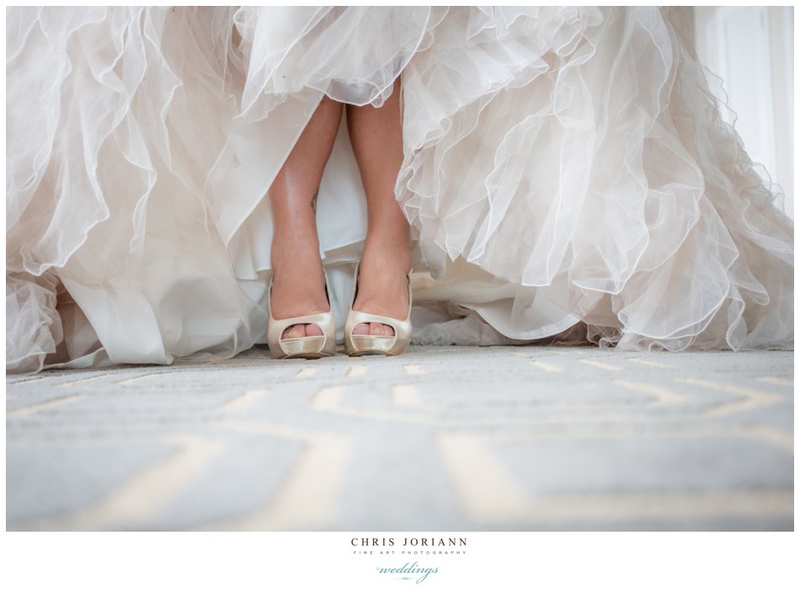 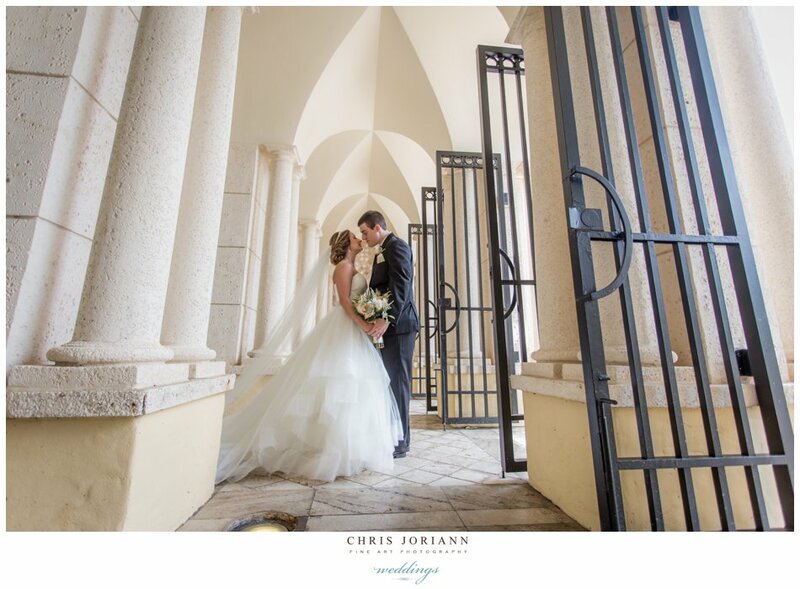 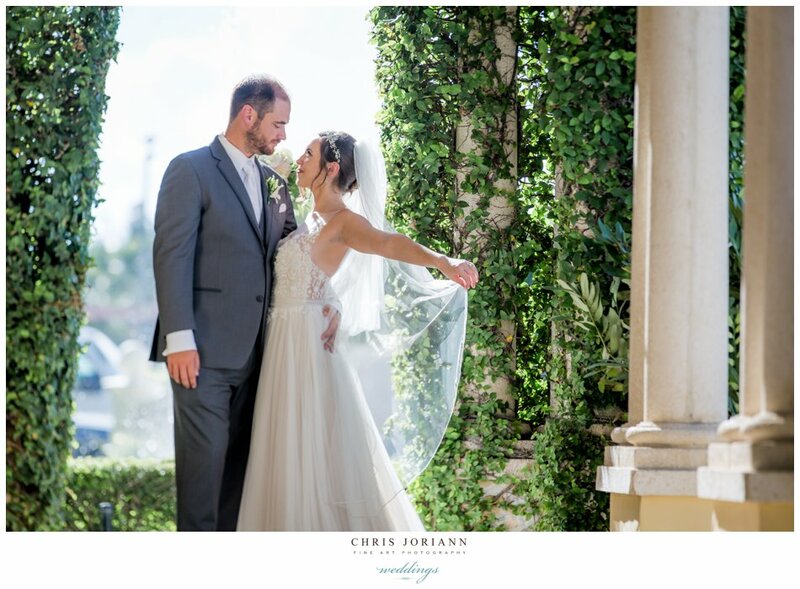 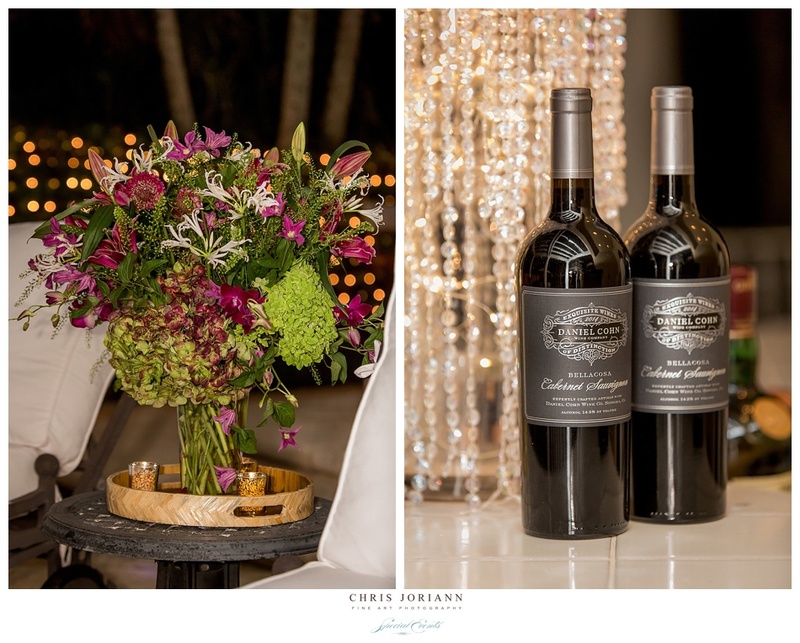 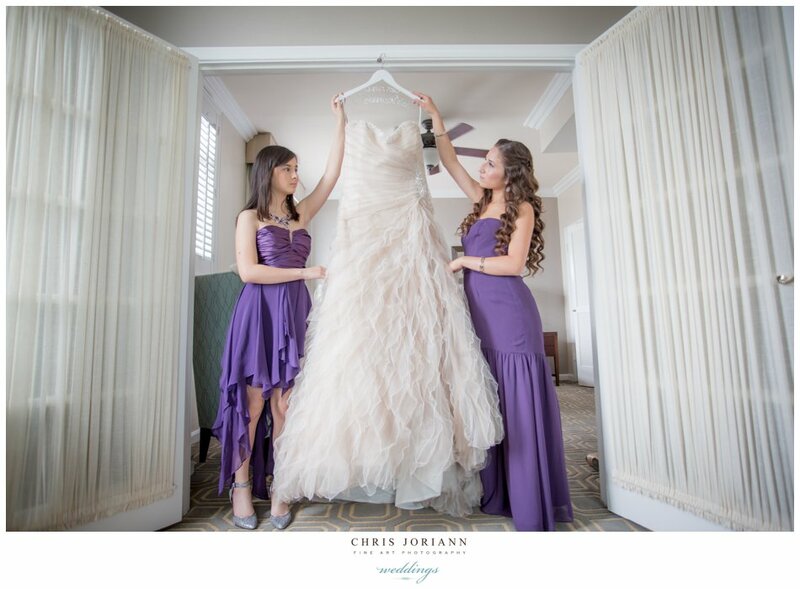 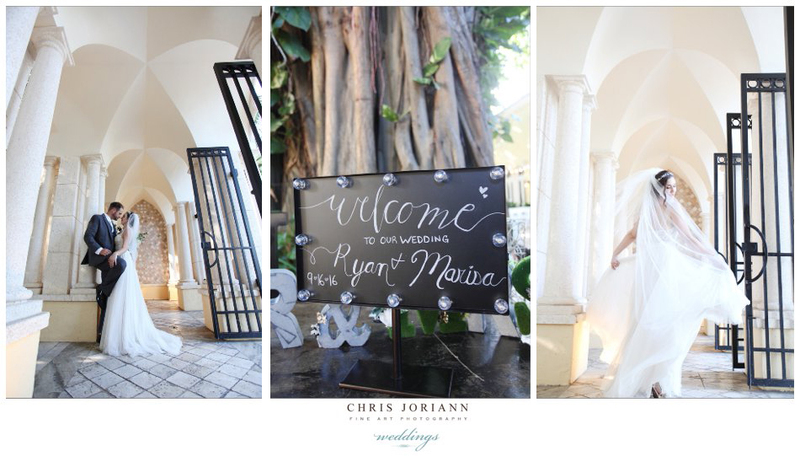 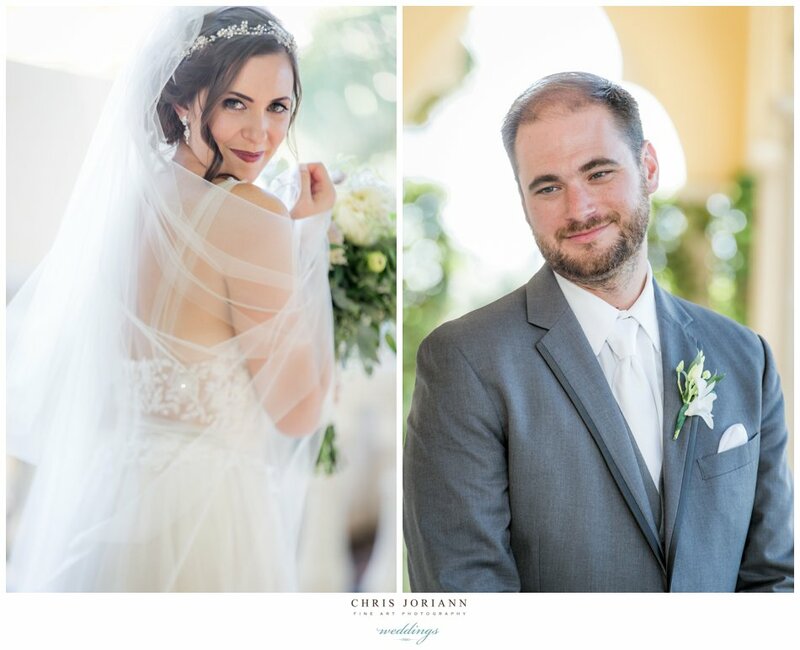 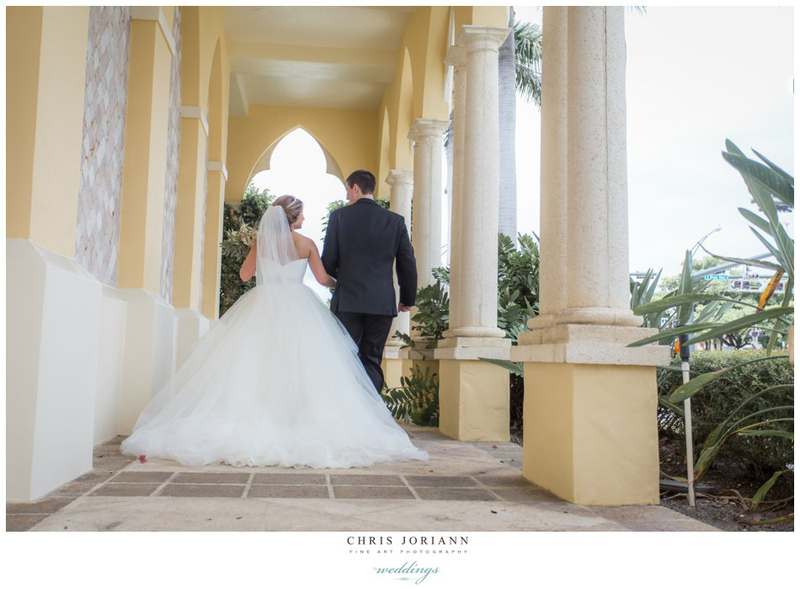 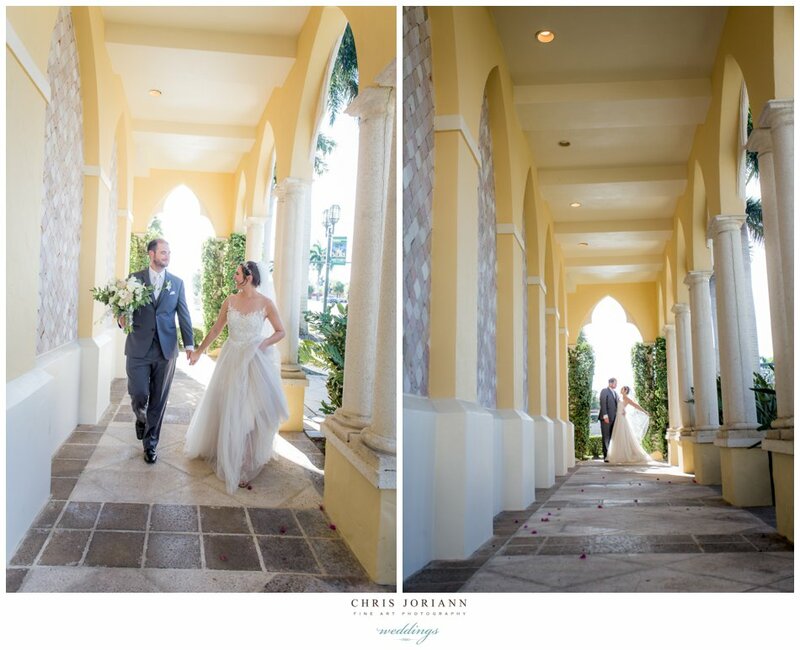 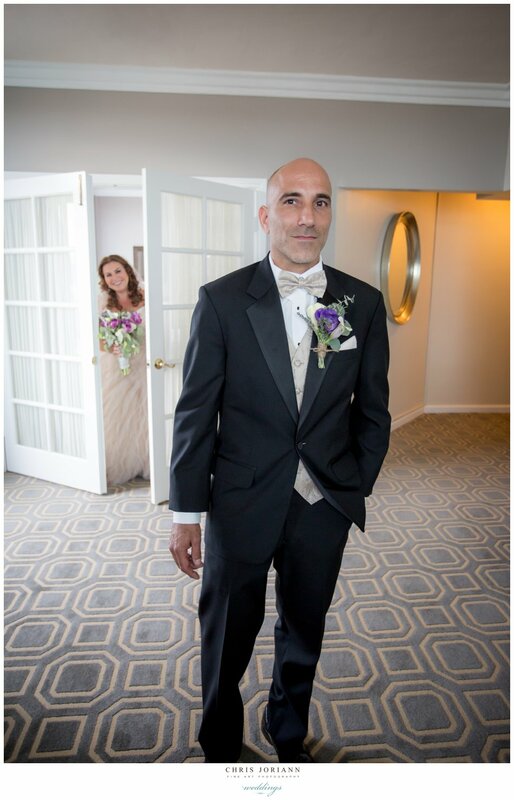 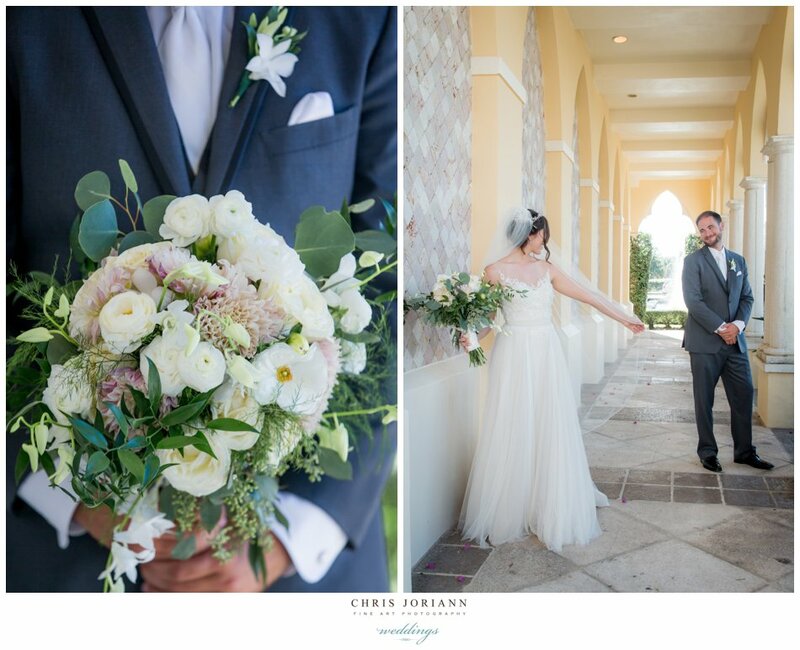 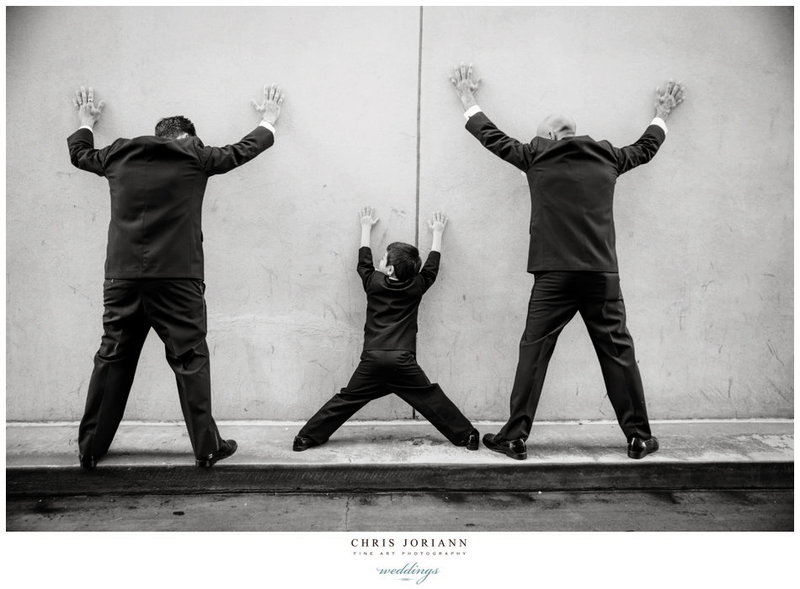 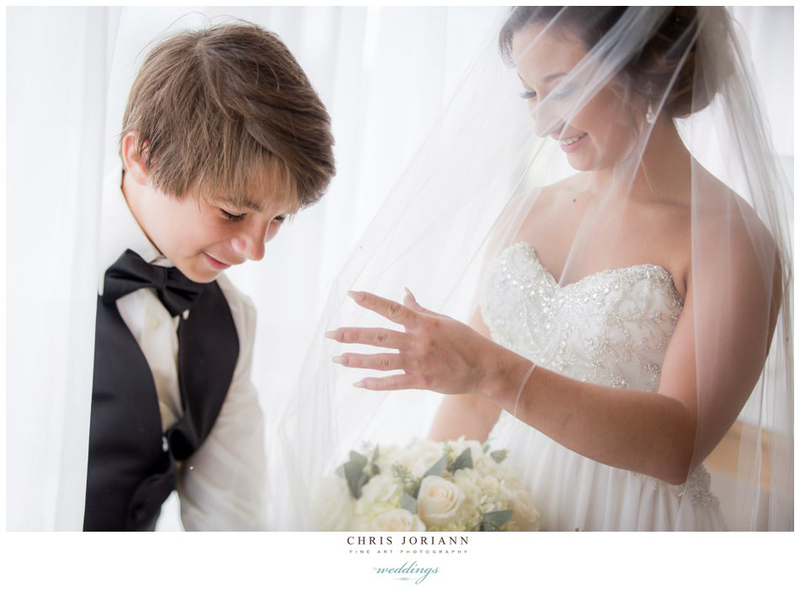 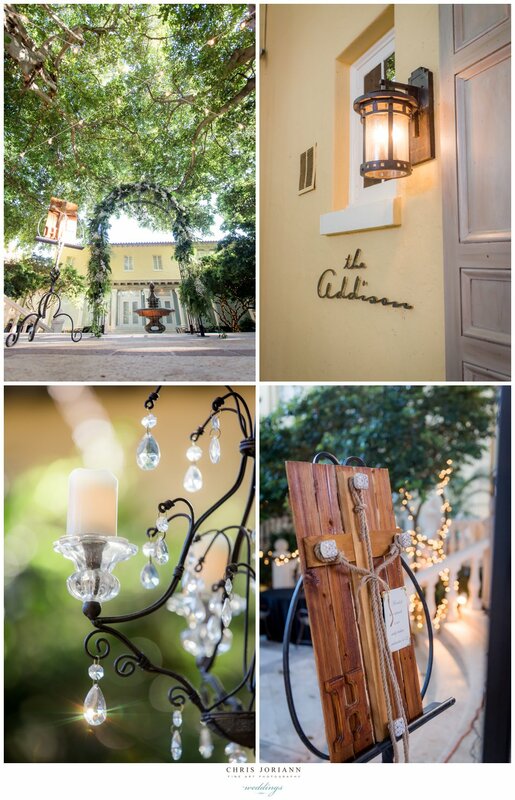 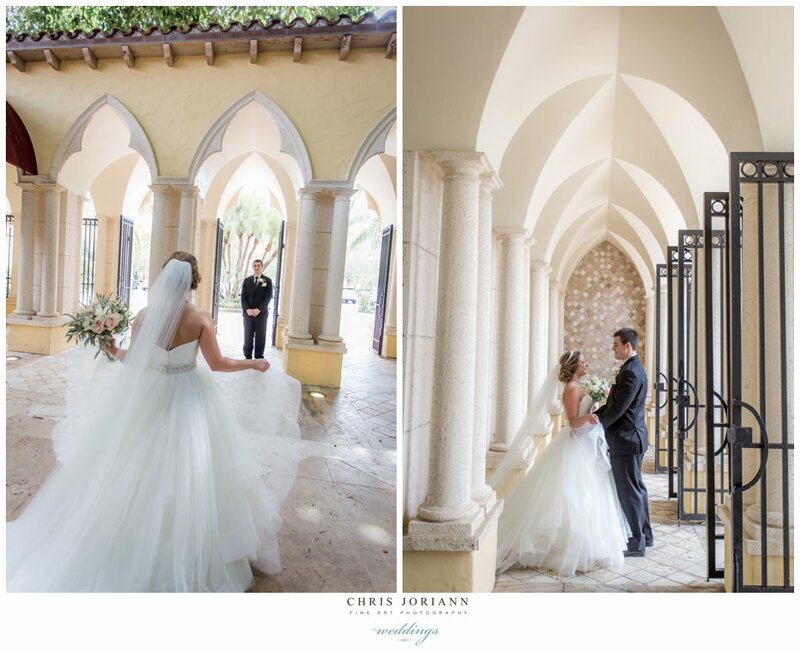 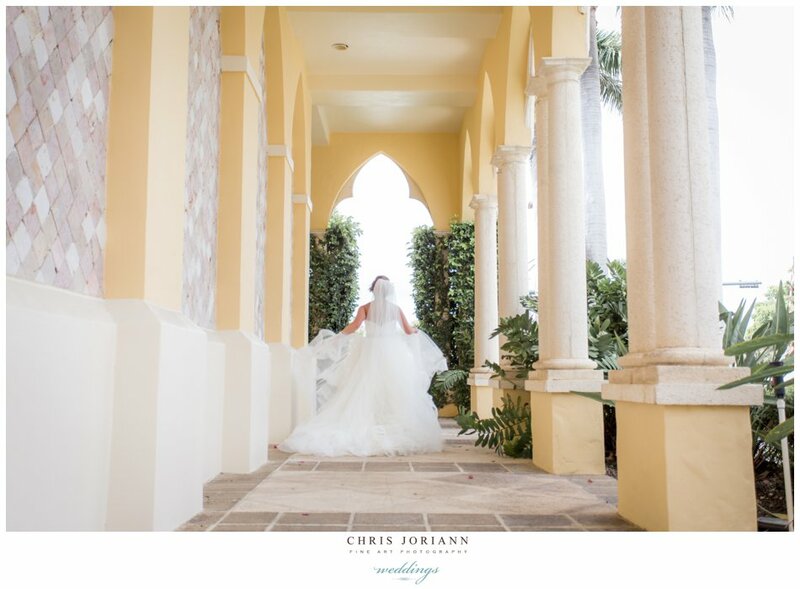 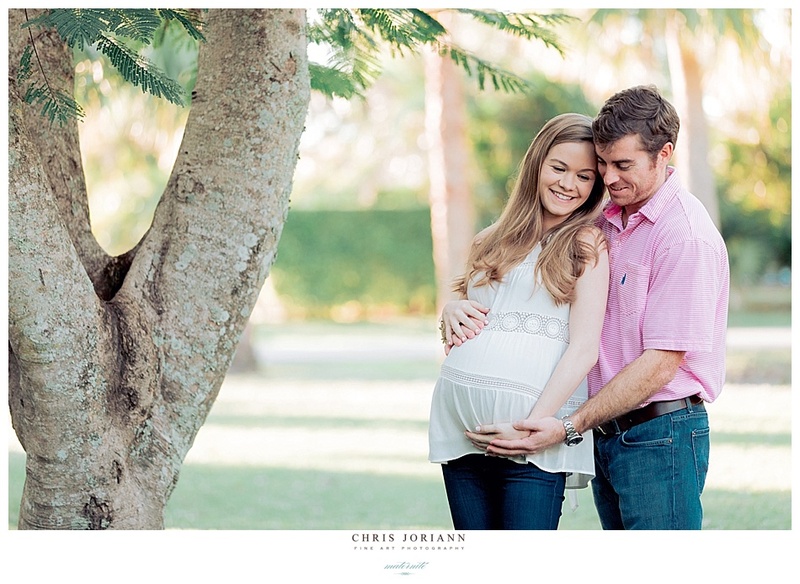 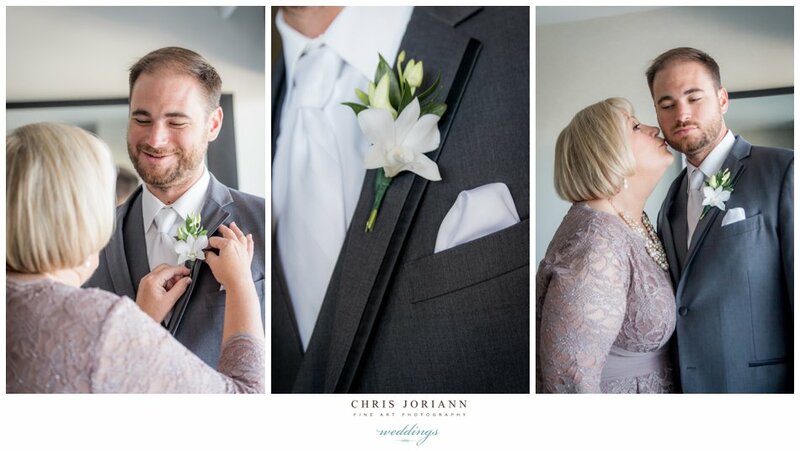 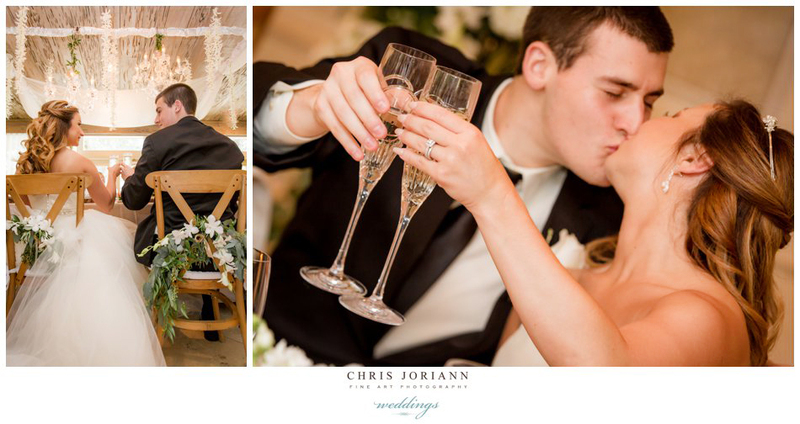 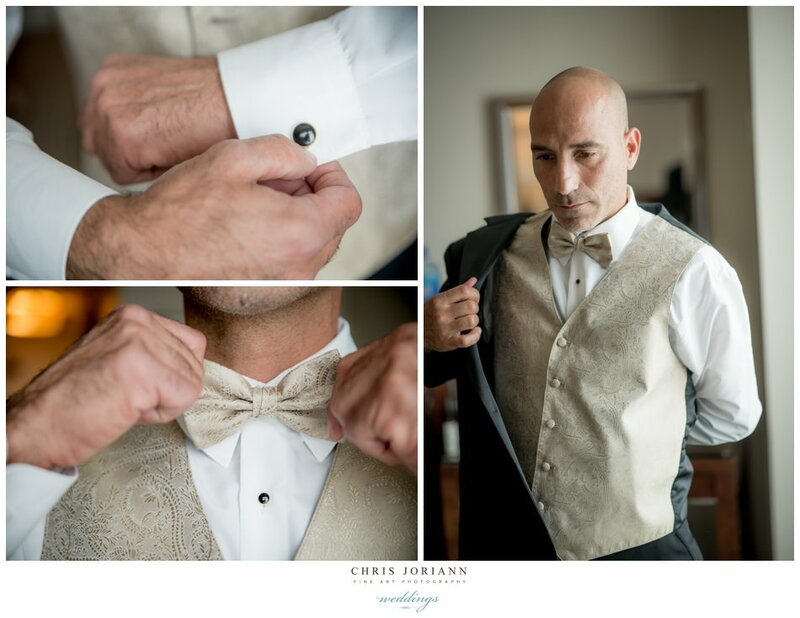 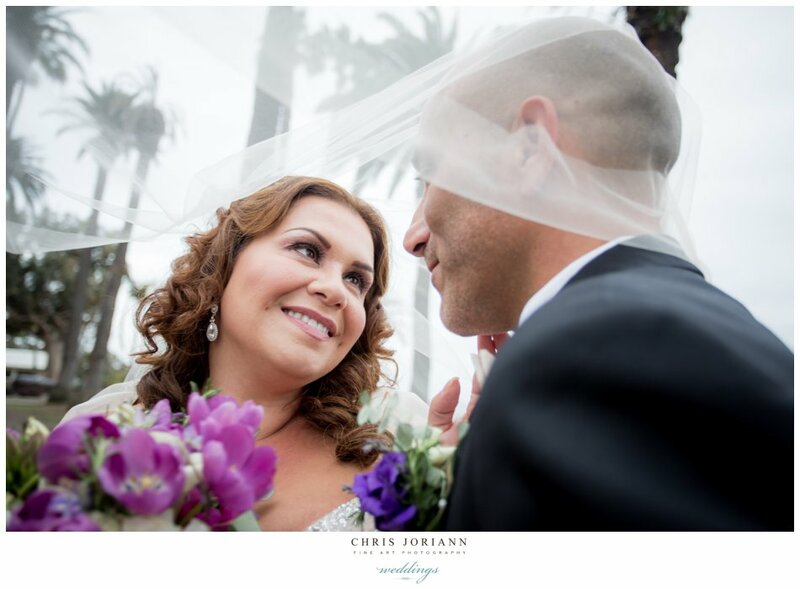 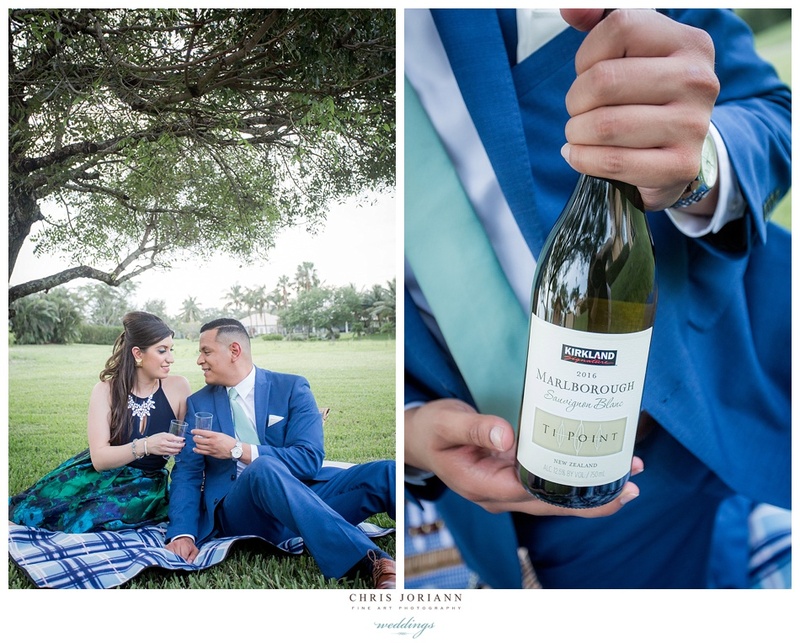 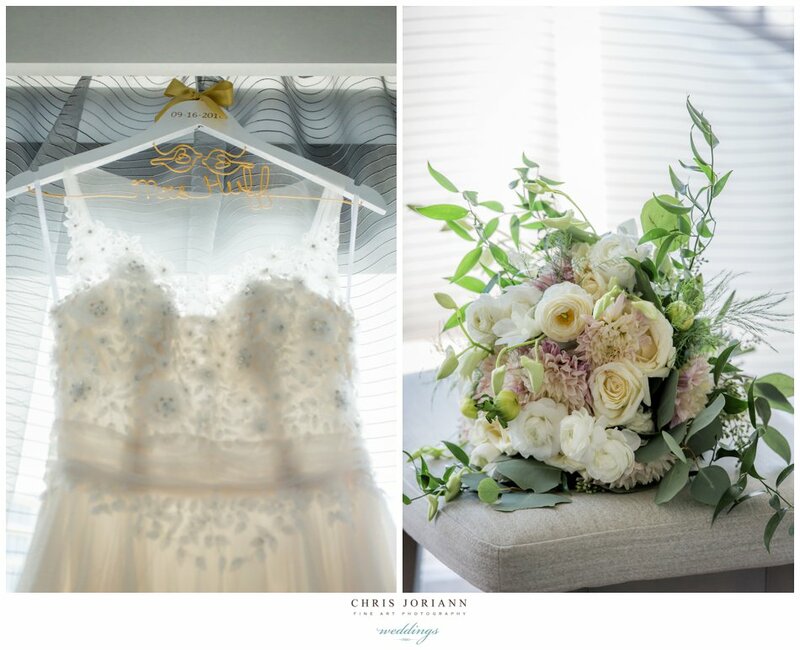 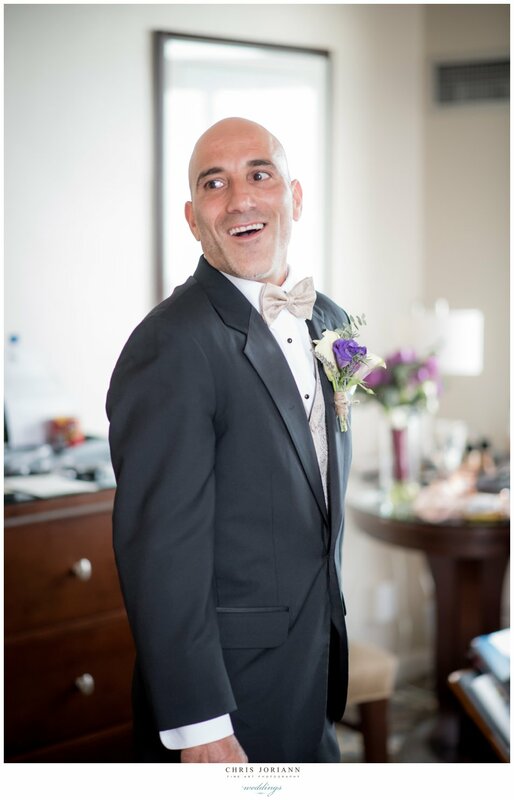 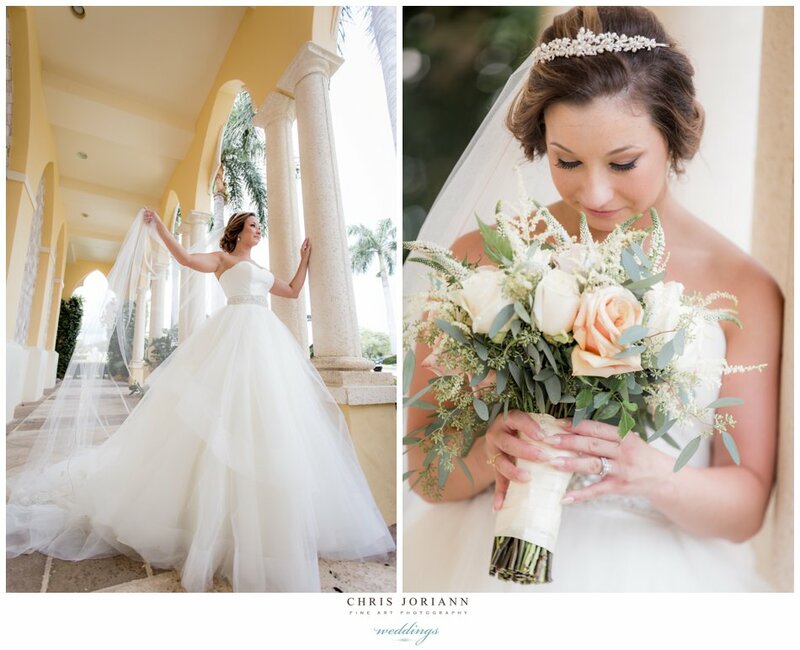 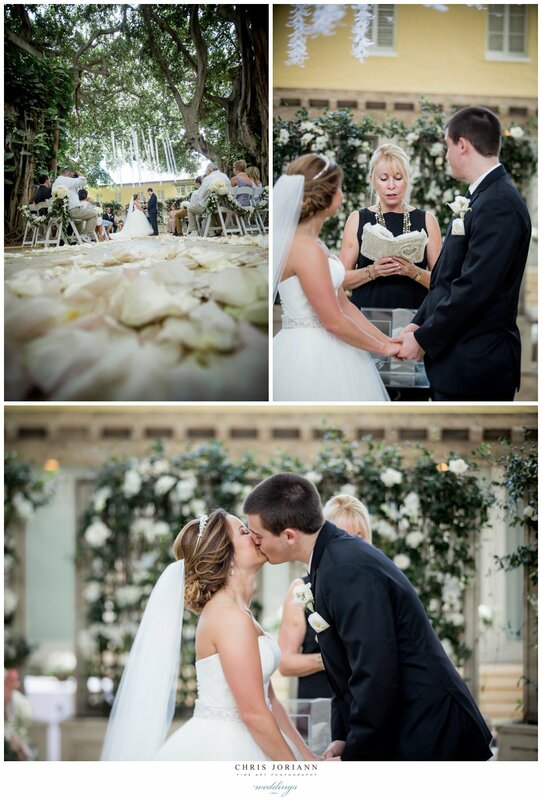 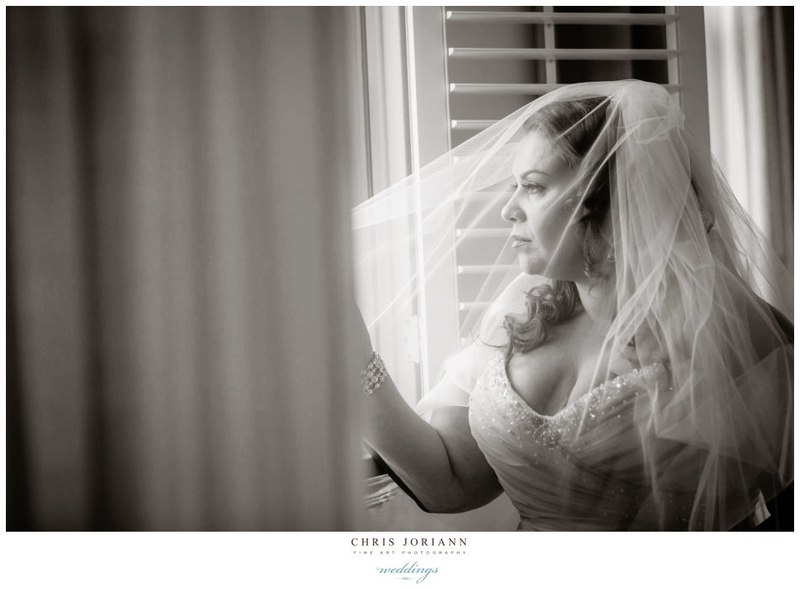 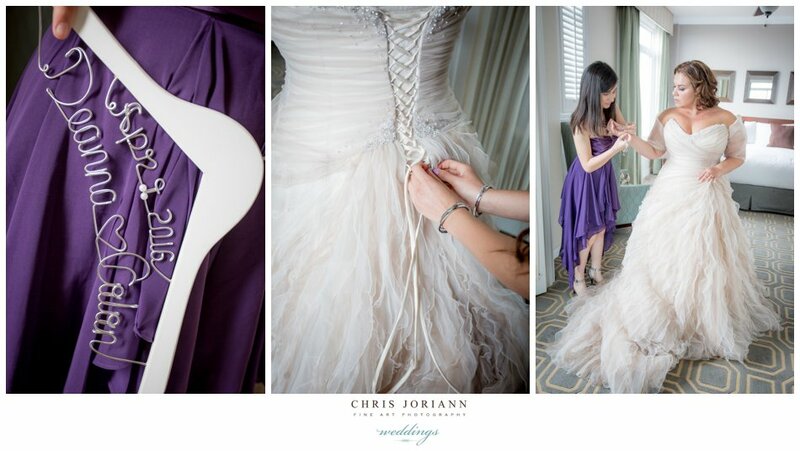 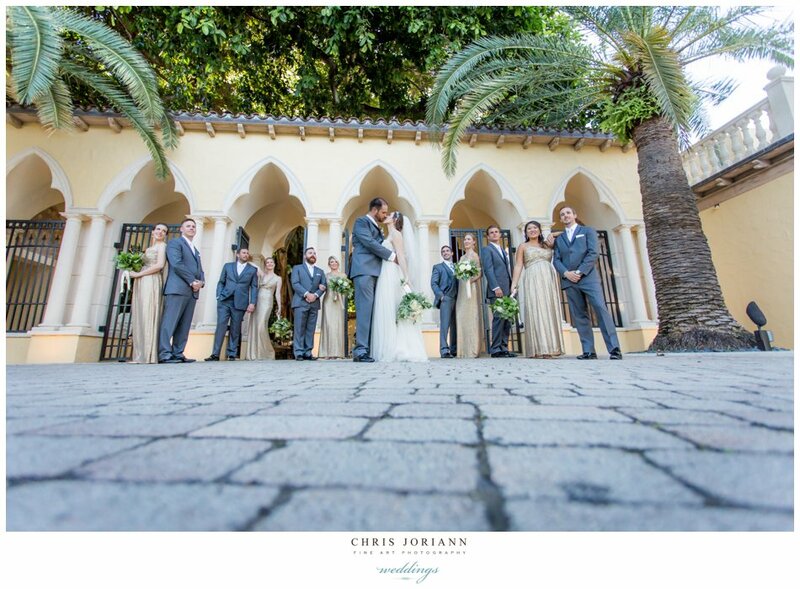 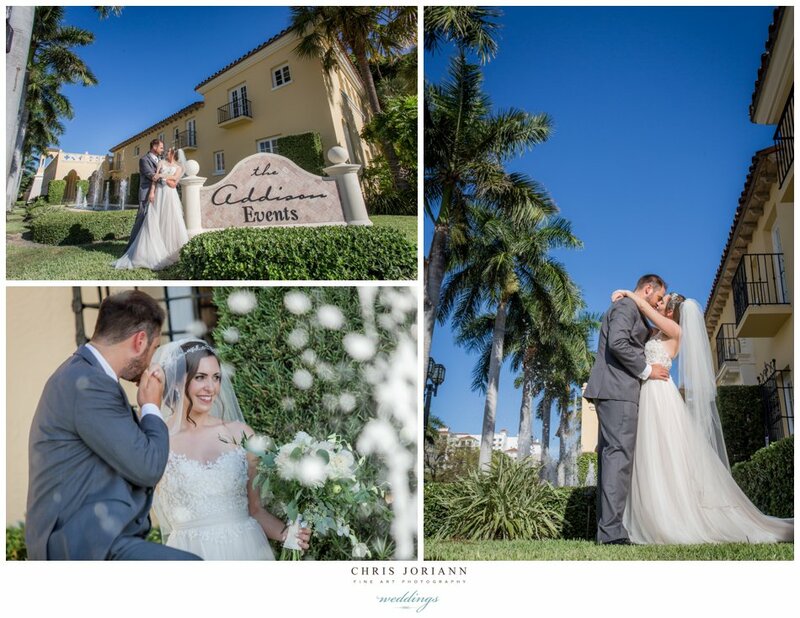 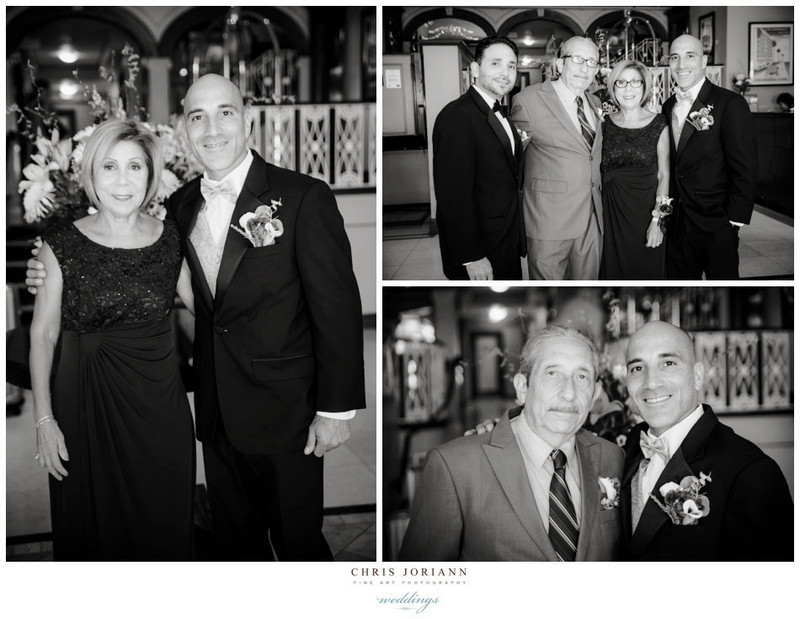 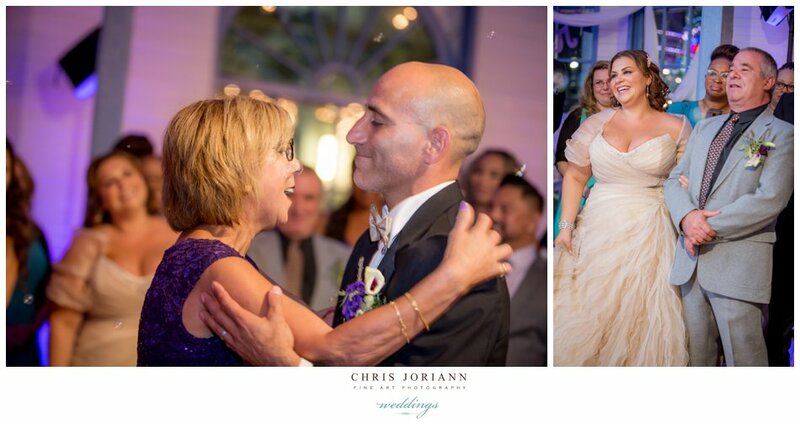 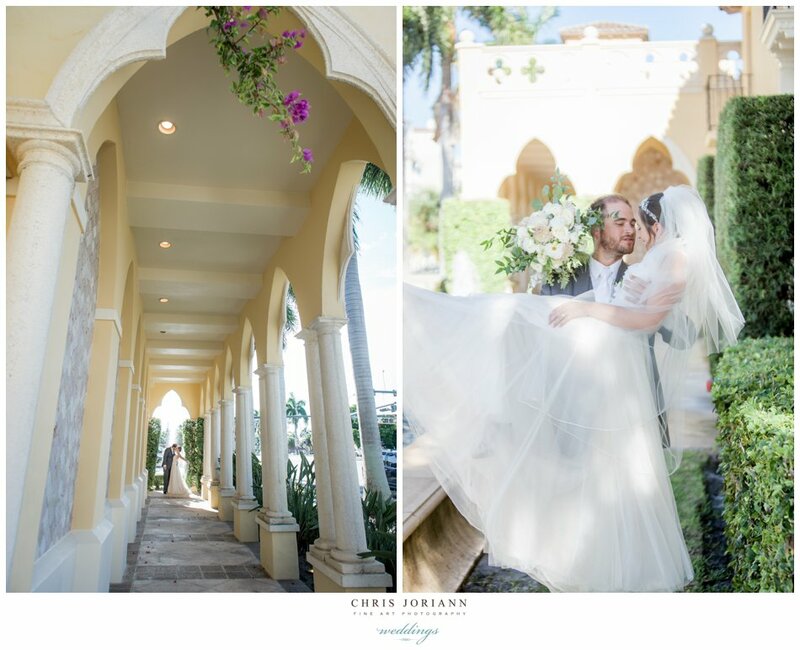 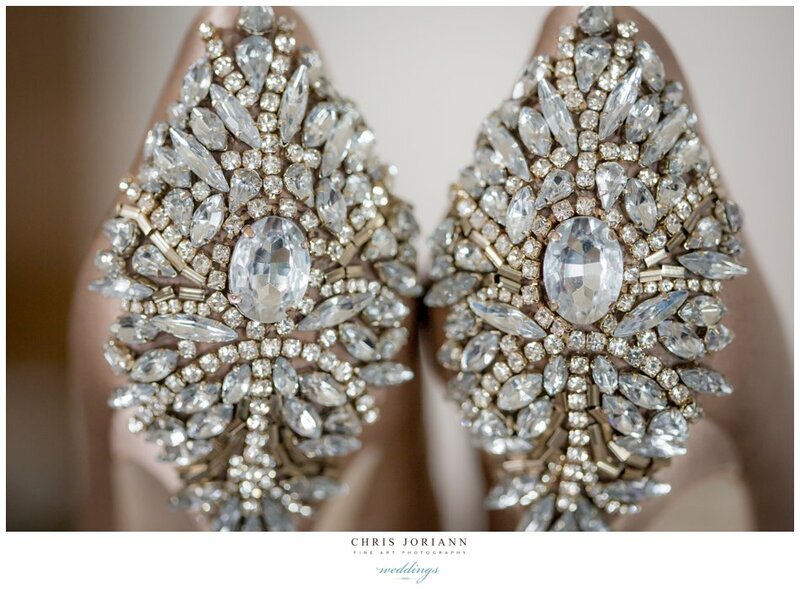 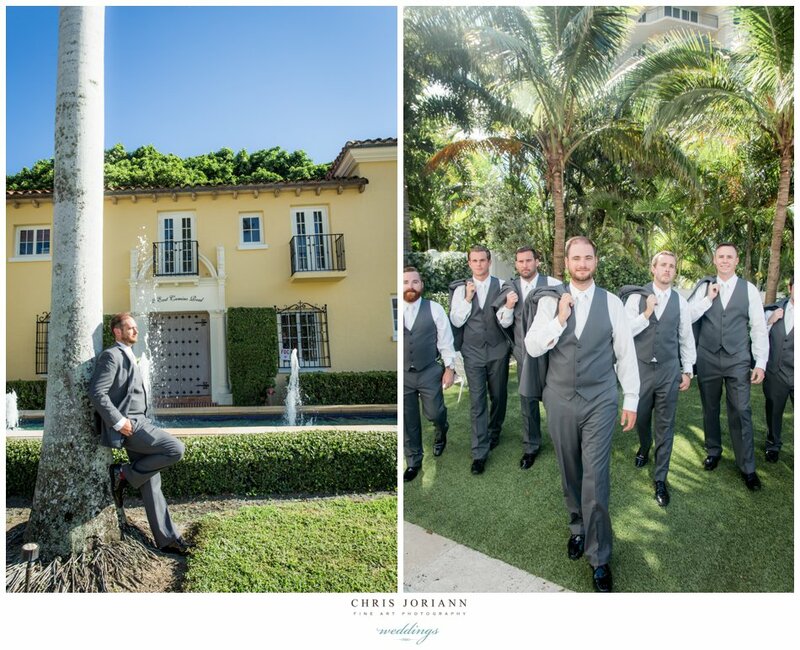 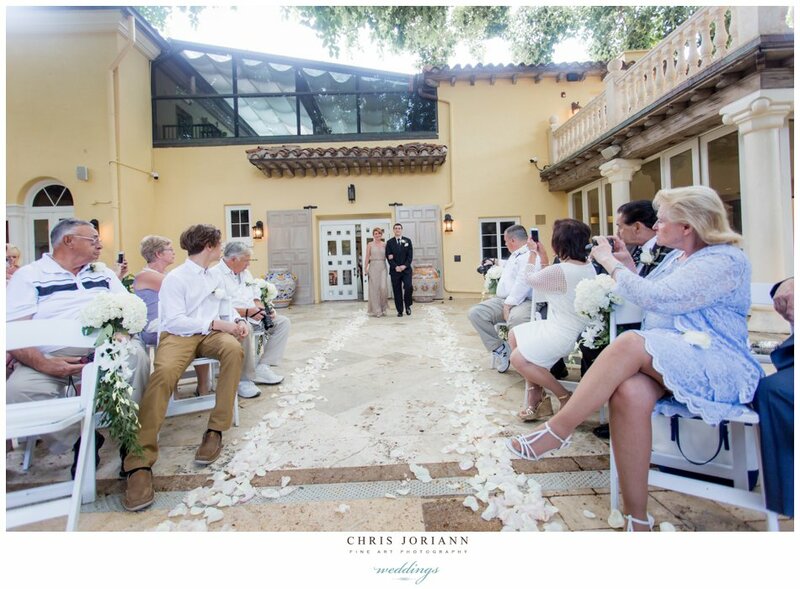 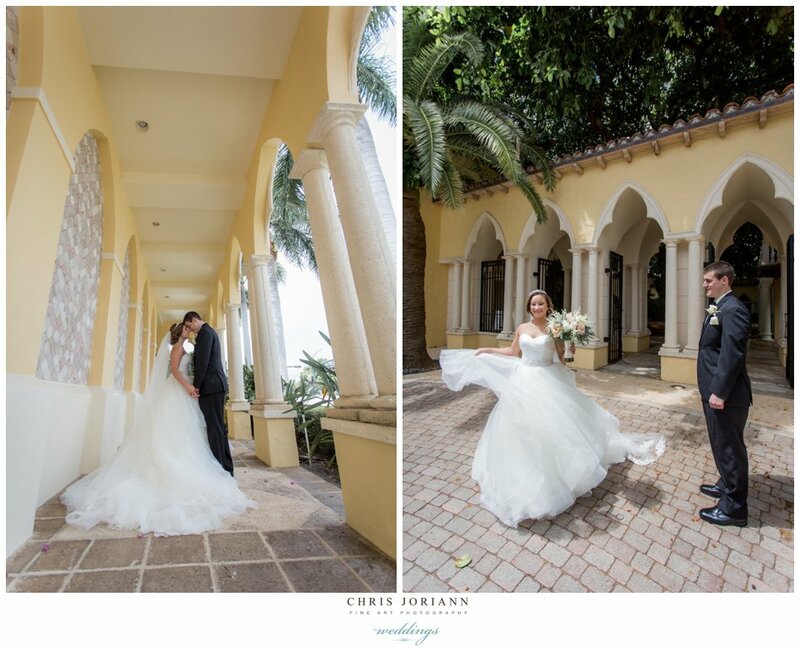 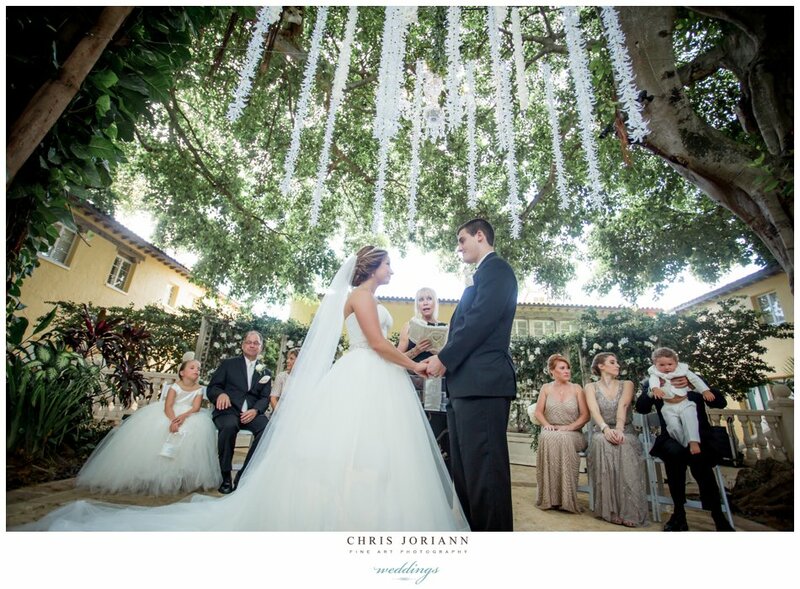 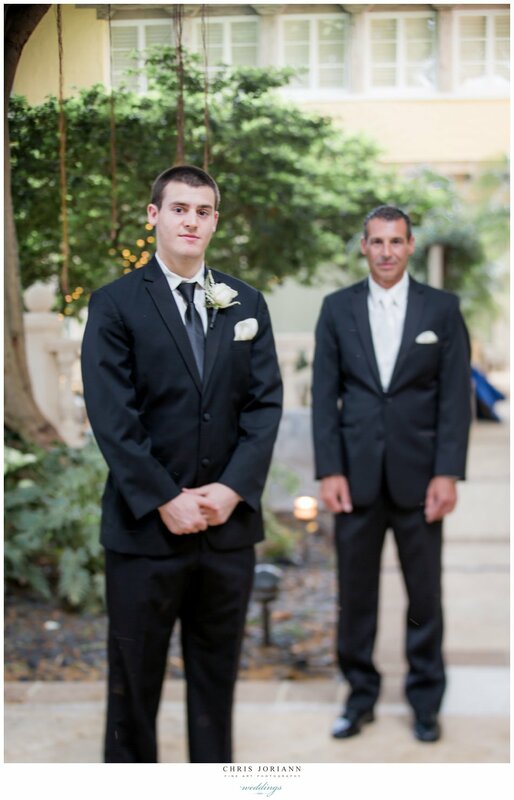 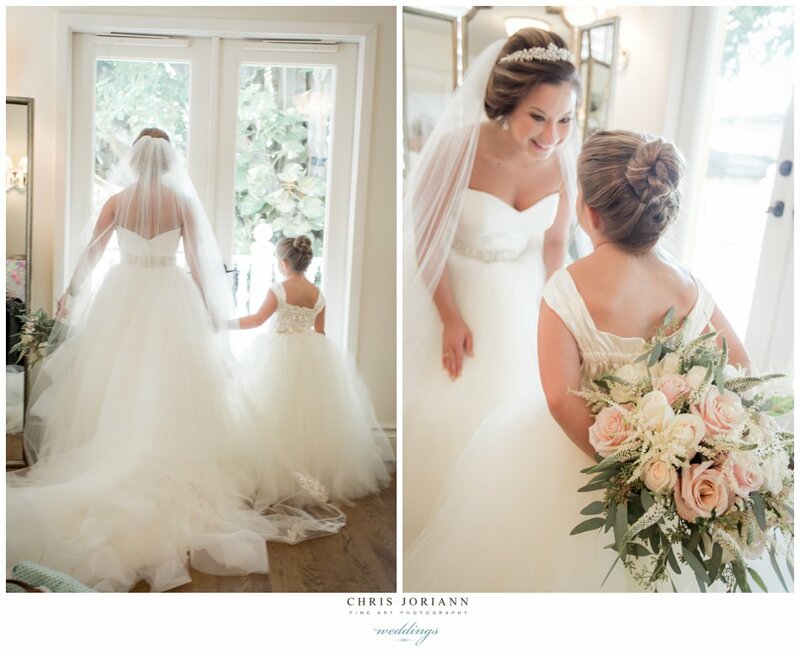 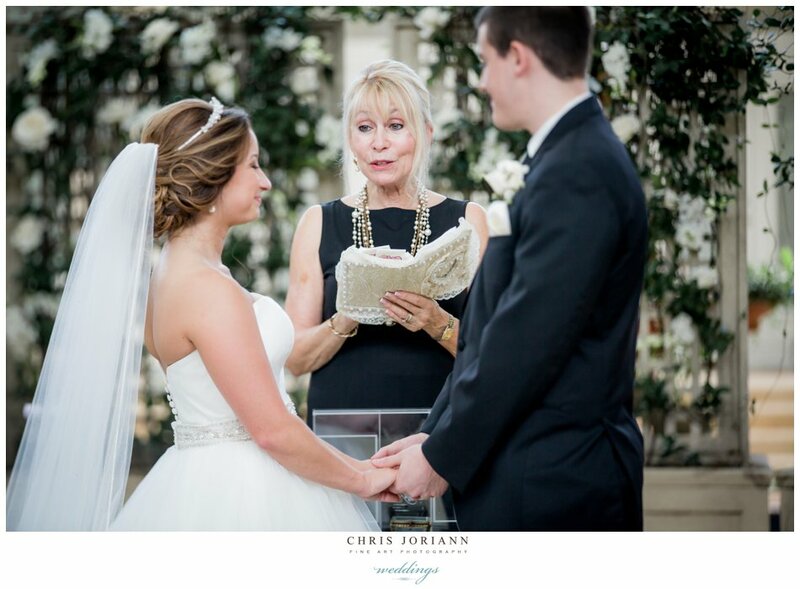 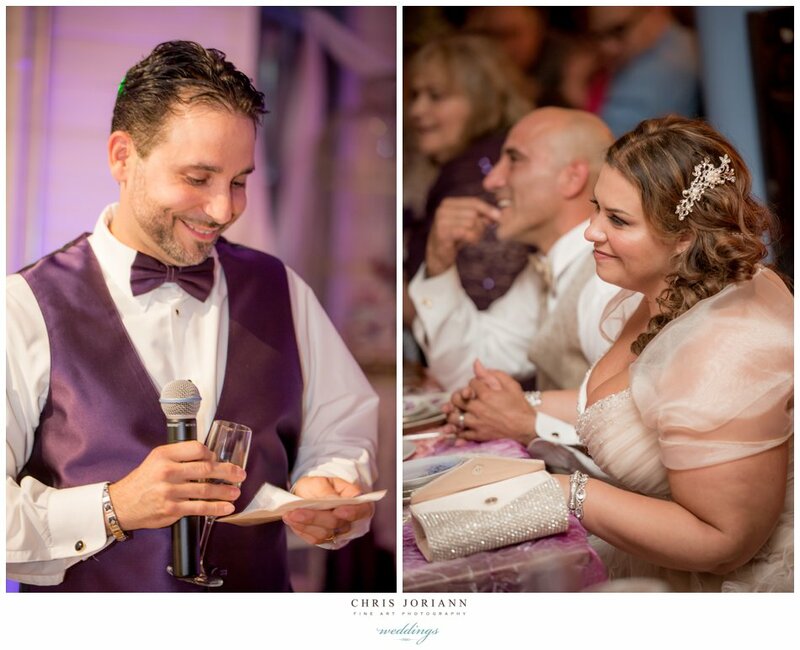 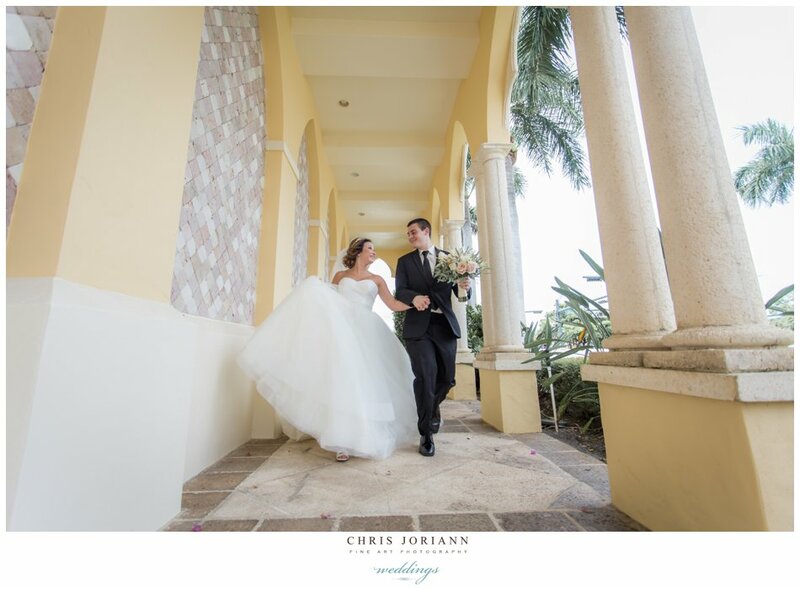 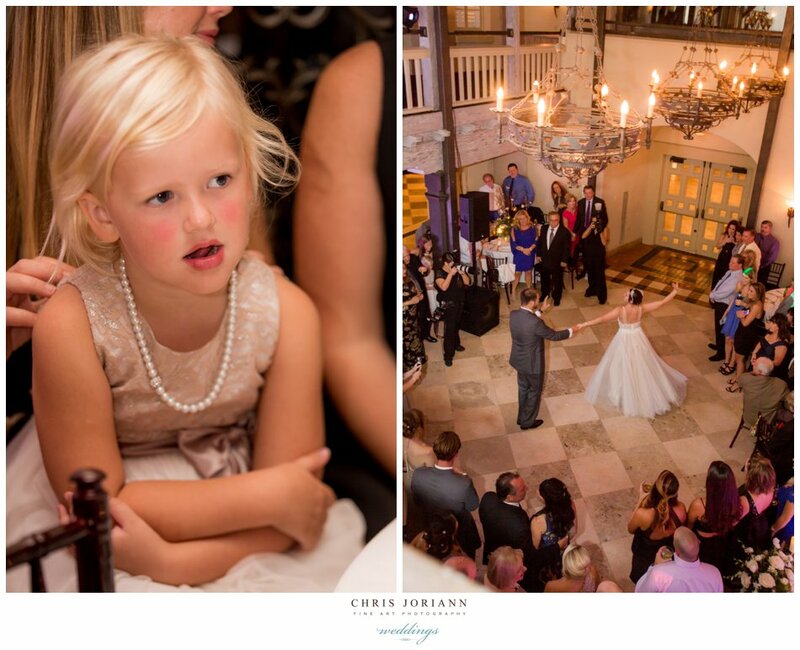 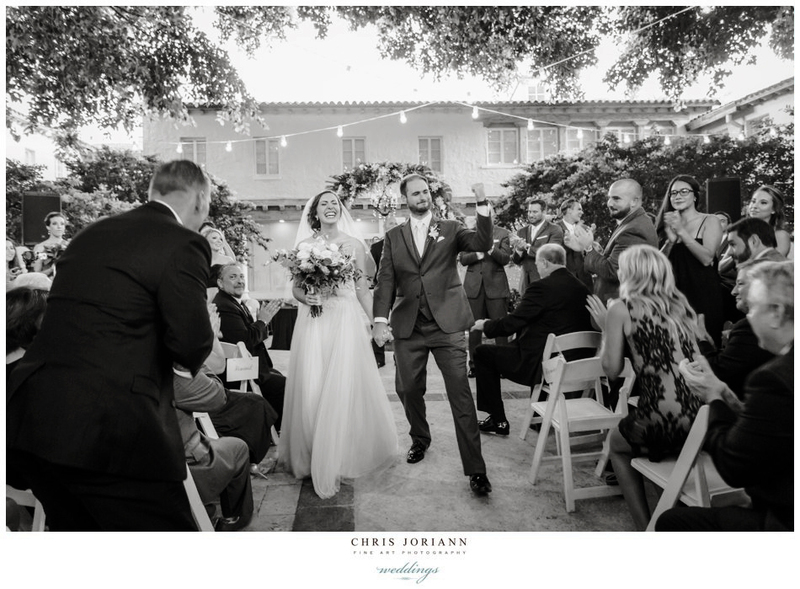 Their fabulous garden wedding was held at The Addison in Boca Raton. 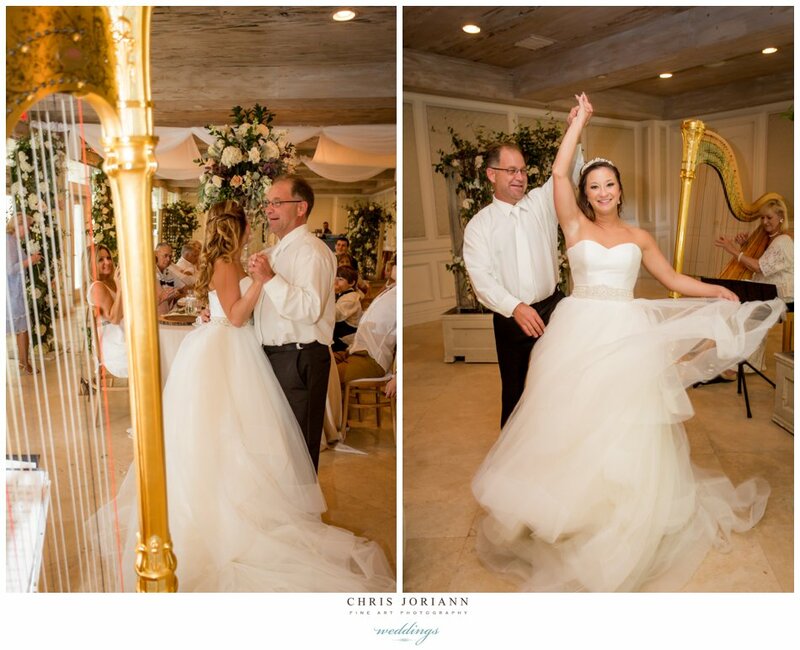 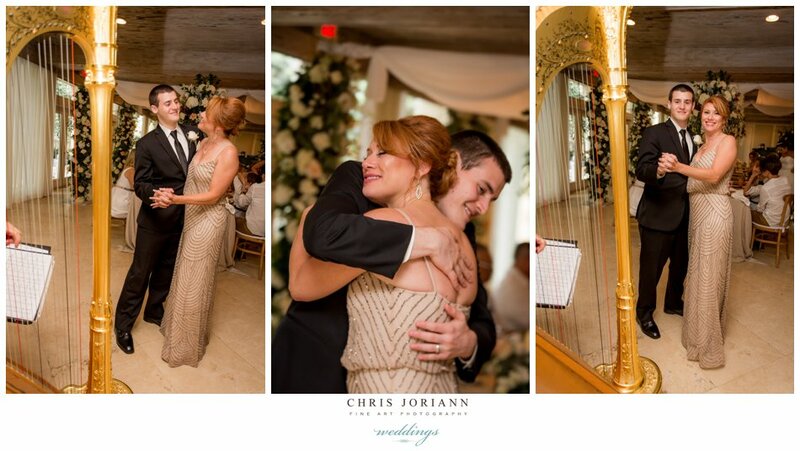 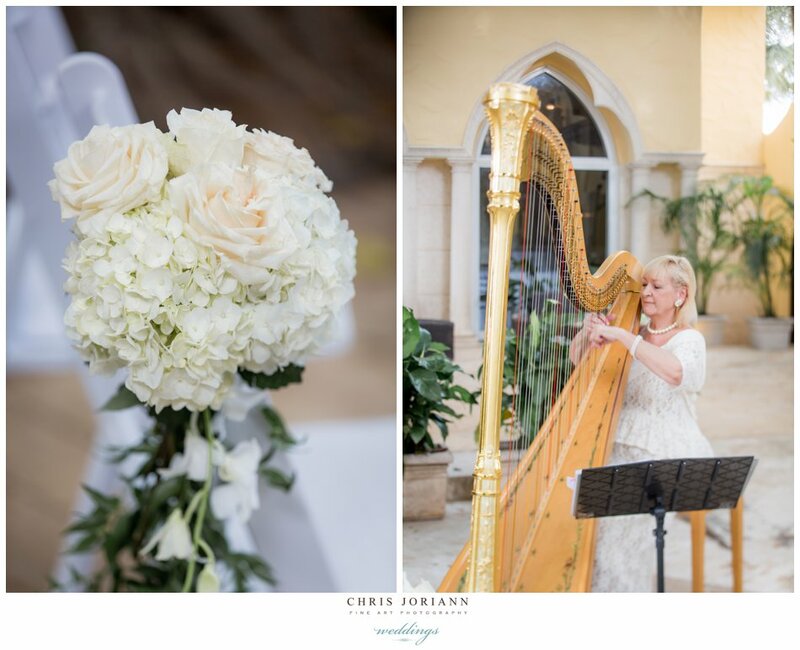 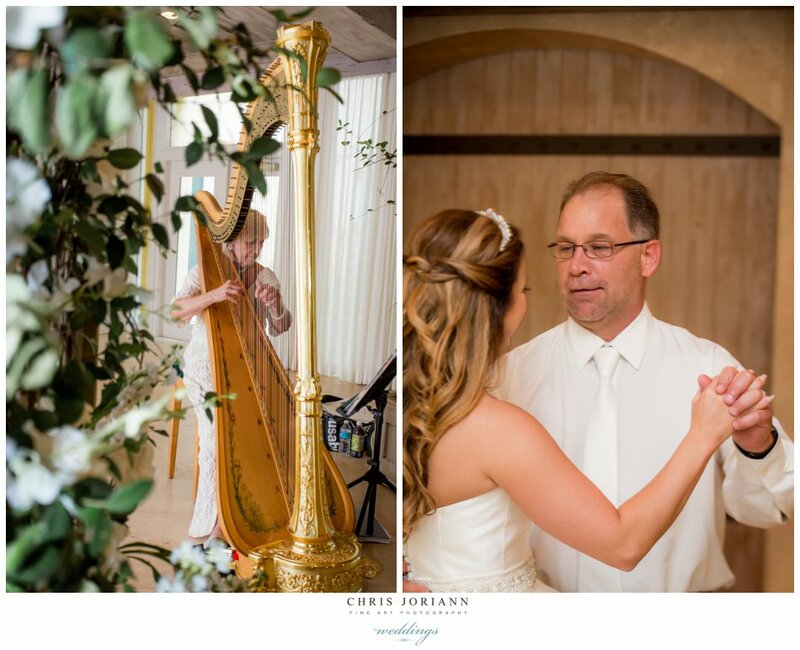 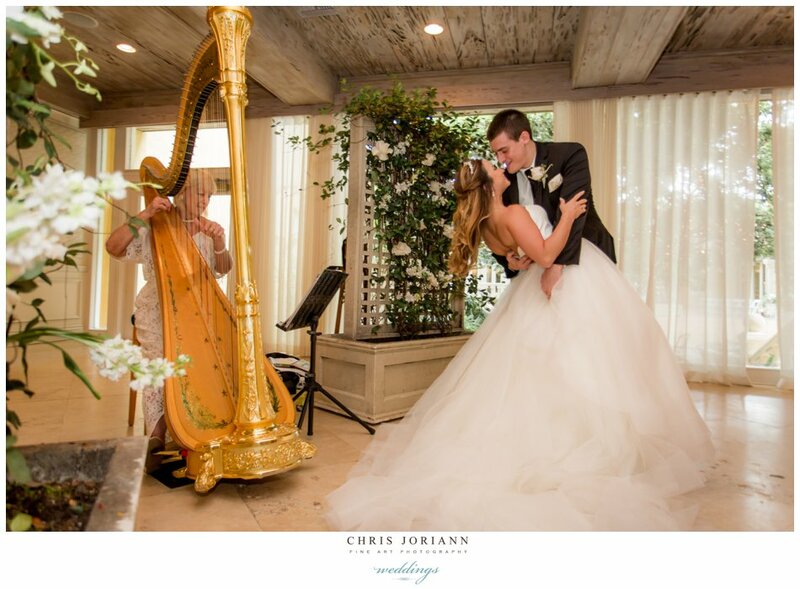 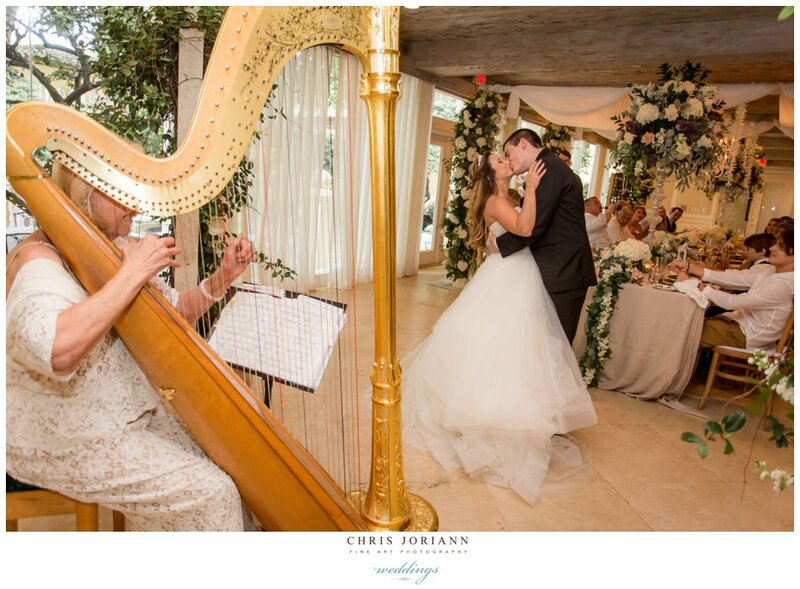 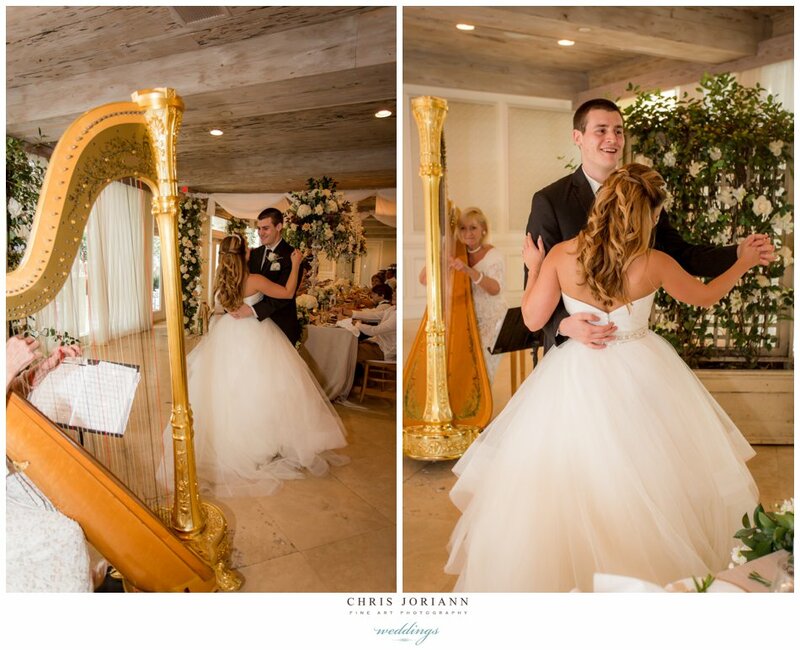 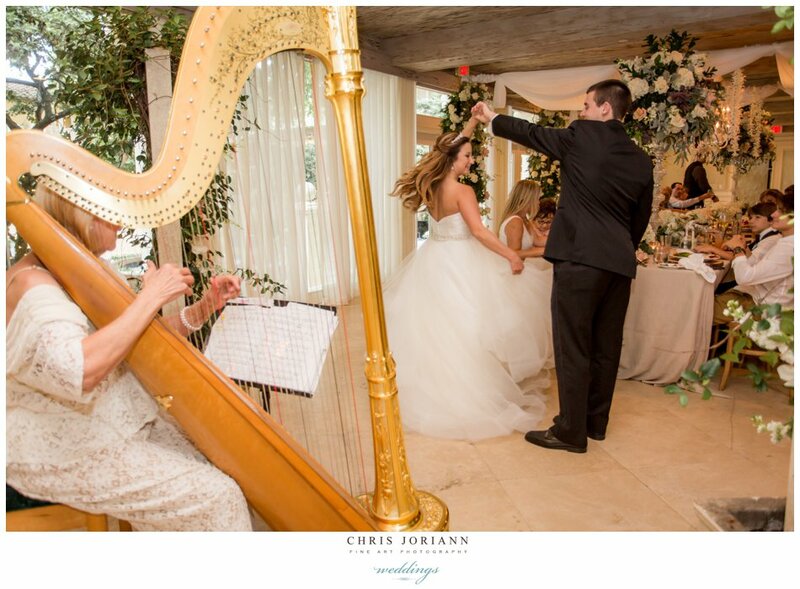 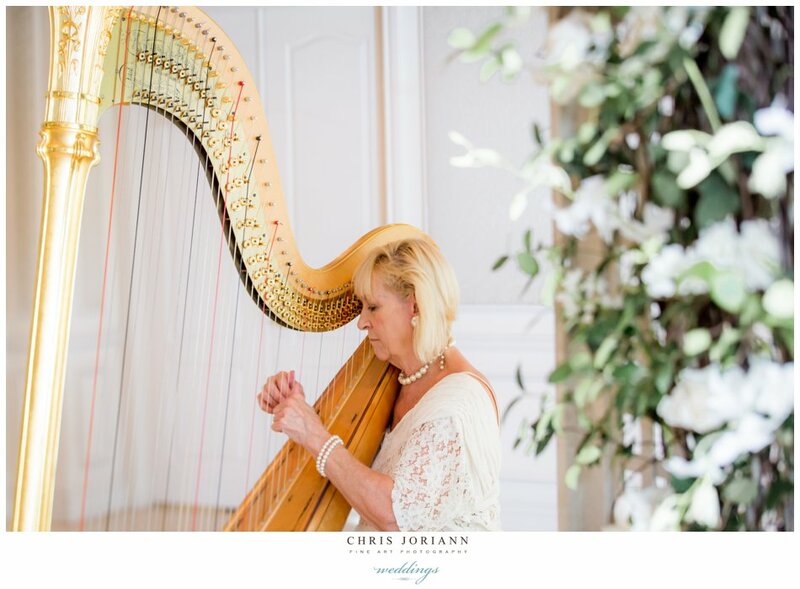 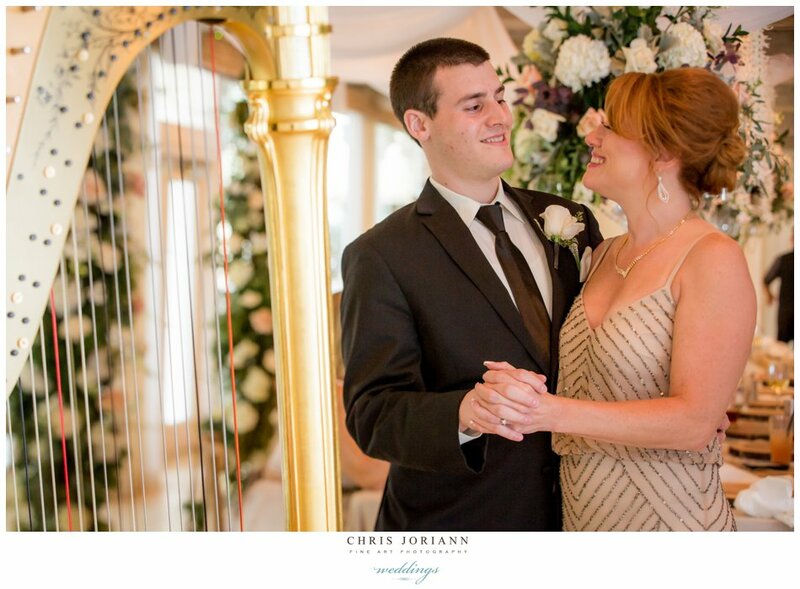 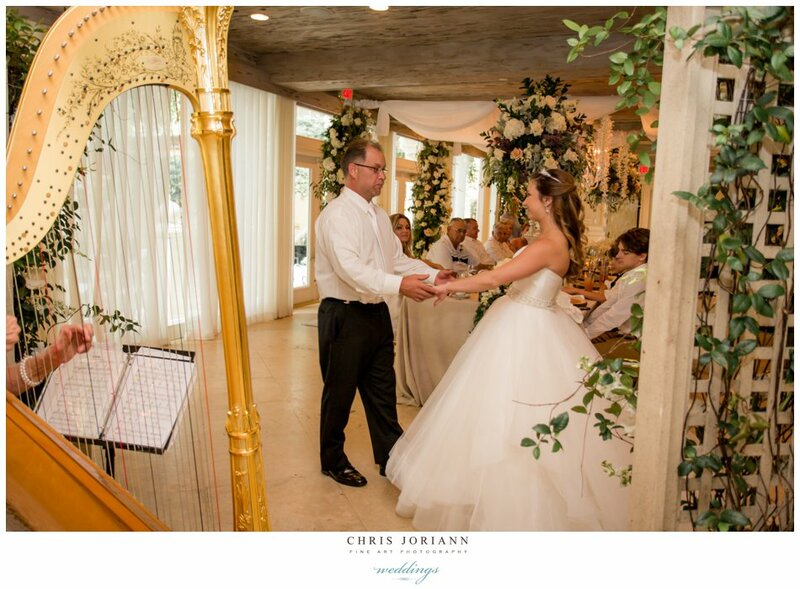 As the harpist played, the bride glided thru the petals in an ivory tulle couture gown. 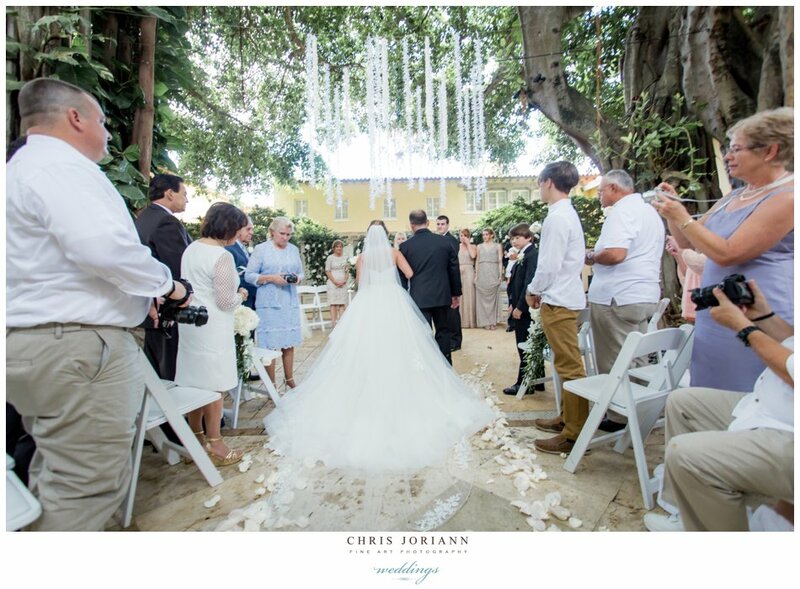 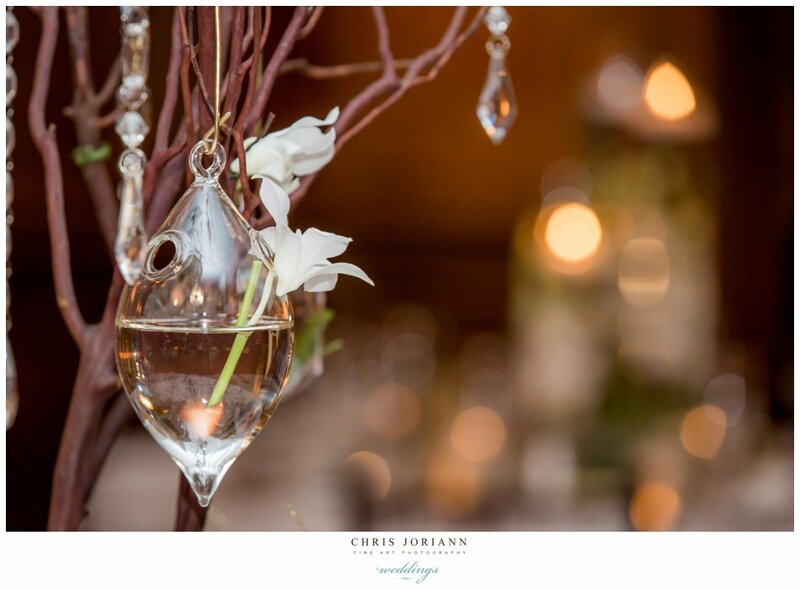 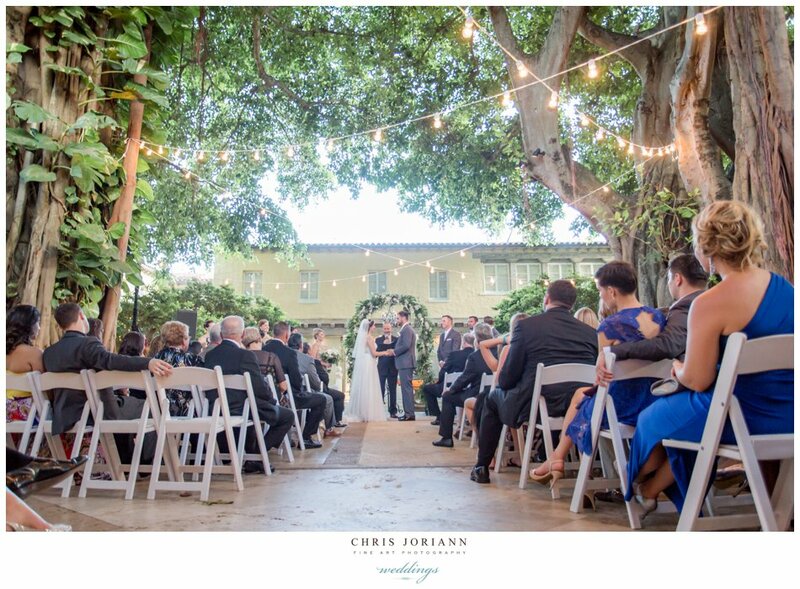 The couple exchanged vows in the courtyard, beneath a canopy of dripping orchids, then guests enjoyed cocktails around the fountain. 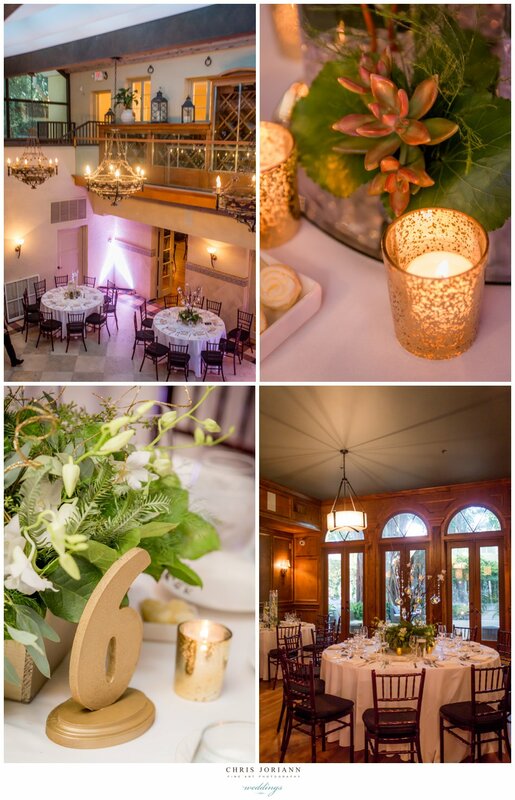 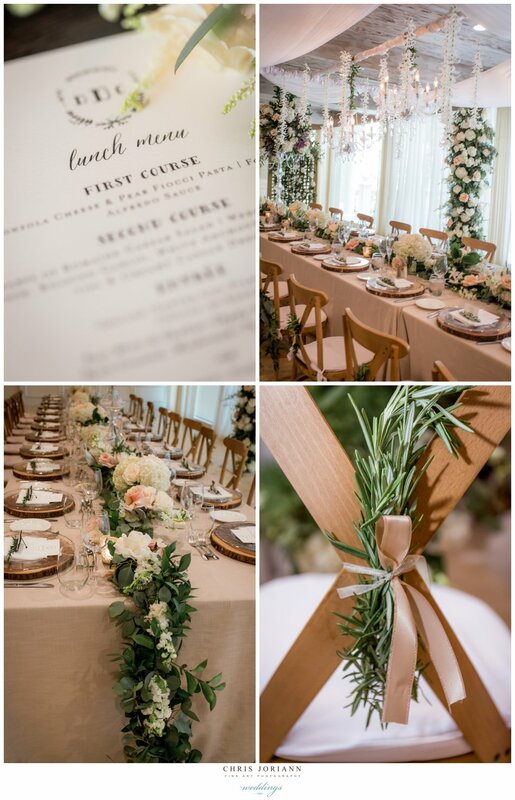 The creative team at Boca by Design transformed the Salano Ballroom into an old world garden, complete w. flower and vined trellises. 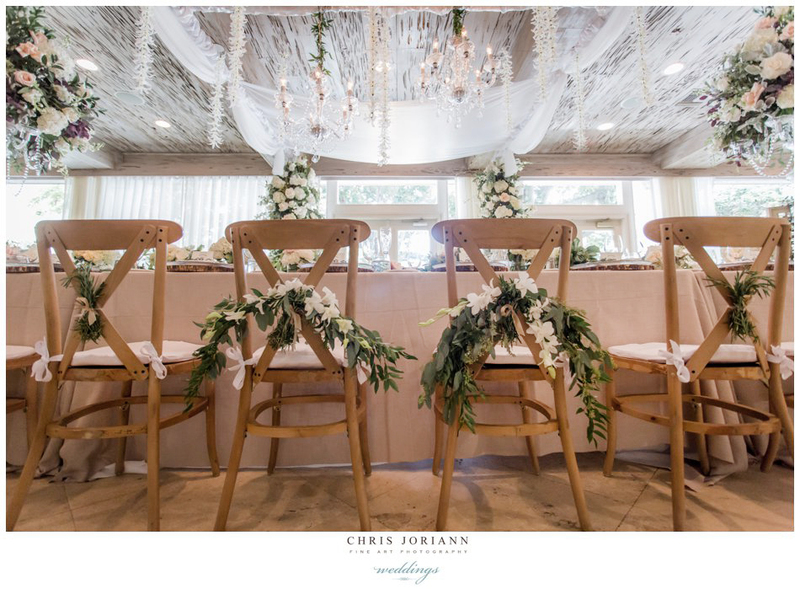 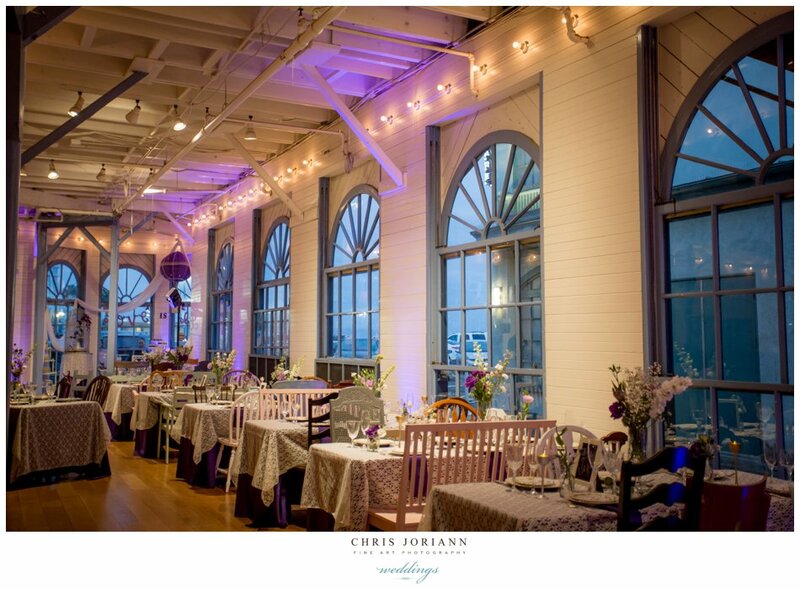 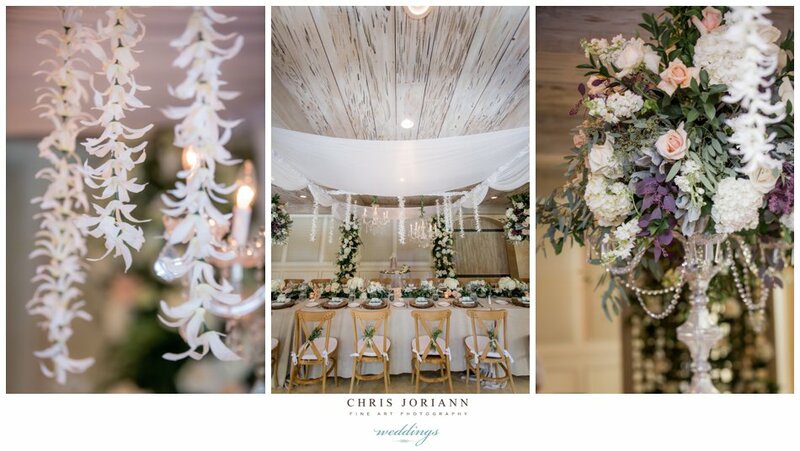 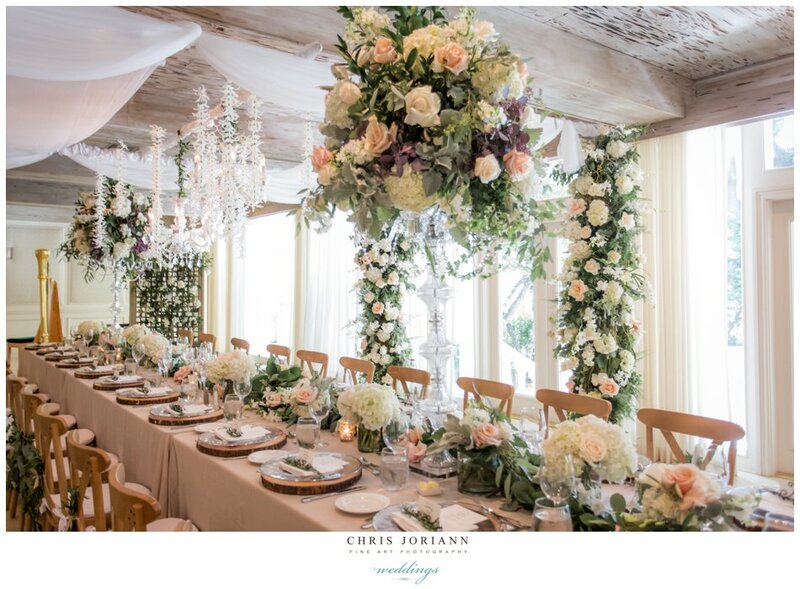 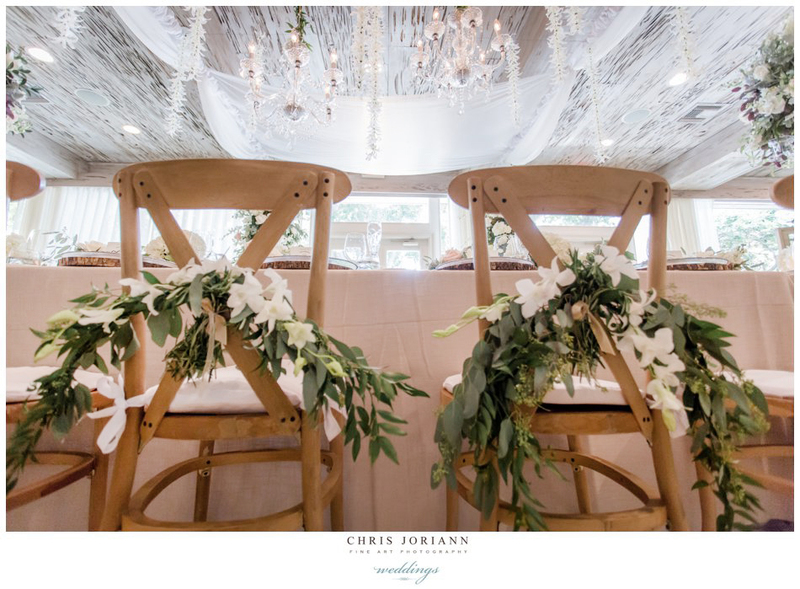 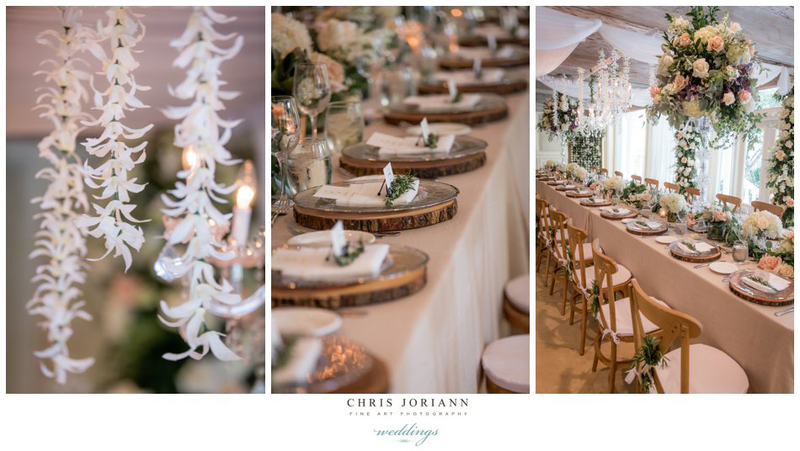 Under the rustic white washed beamed ceiling, sat a stunning table for twenty-seven, beneath a drape of crystalized orchids, the table scape featured crystal candelabras w. antiqued florals, wooden bark chargers, and cross back chairs tied with sprigs of rosemary. 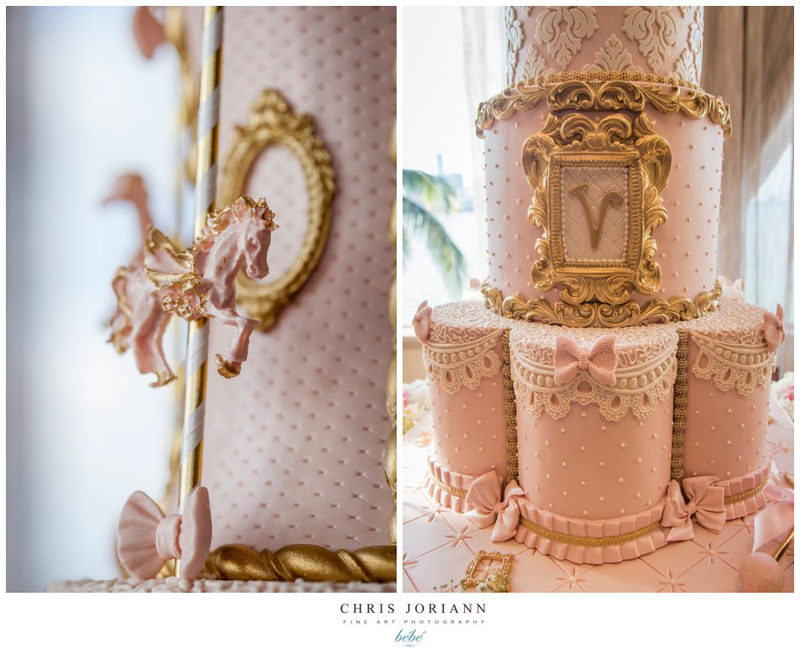 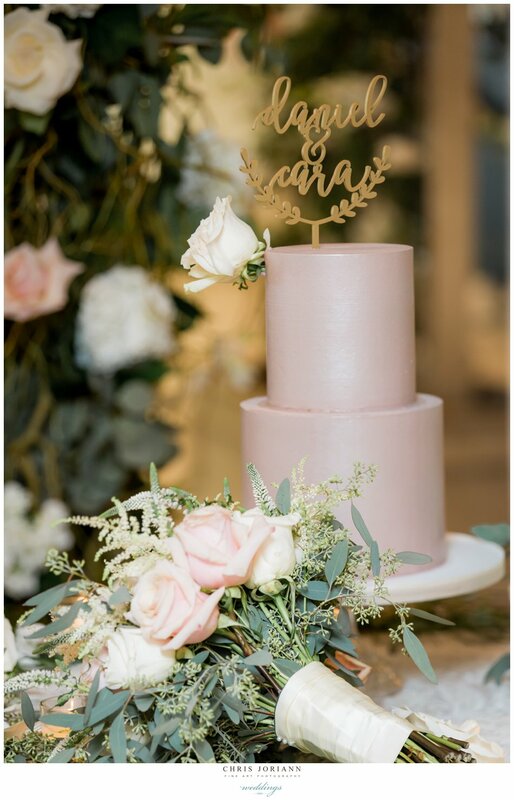 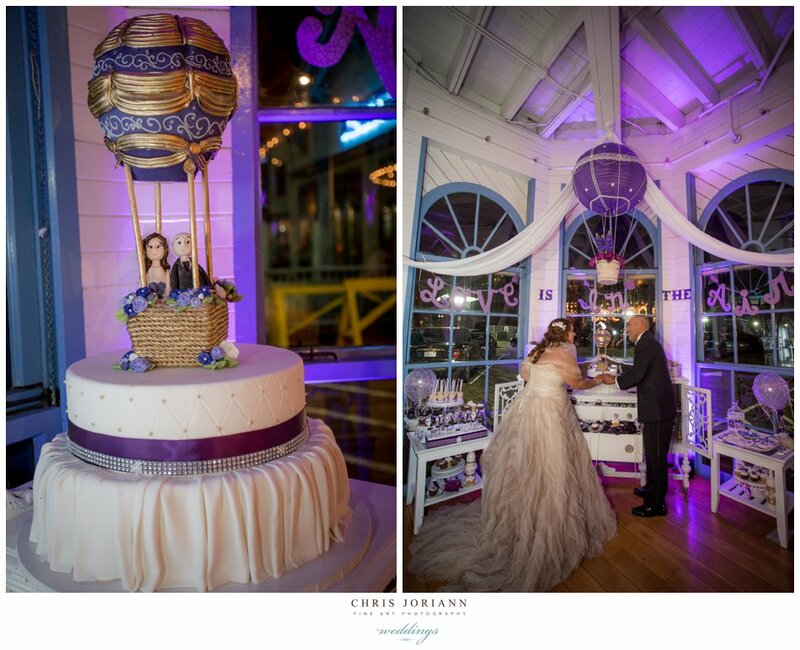 The cake by Earth and Sugar was a two-tiered, double height, cookie dough confection in muted mauve butter crème. 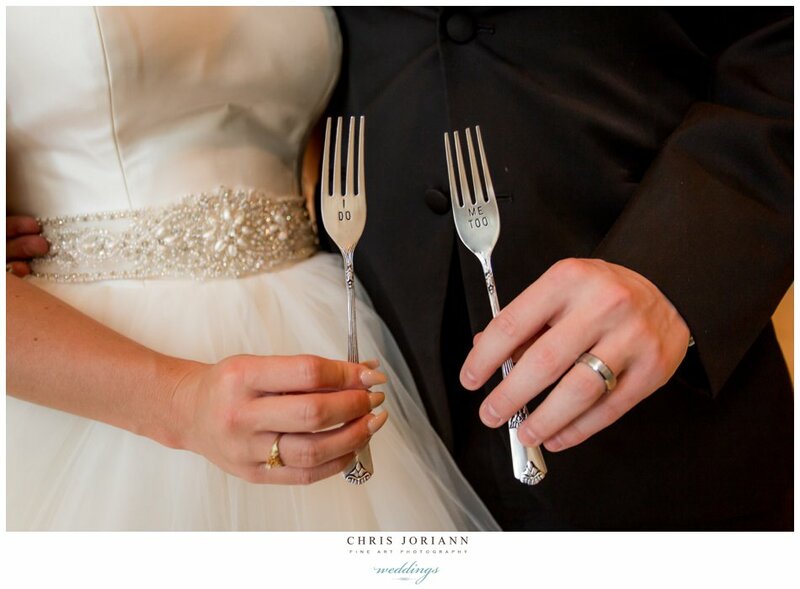 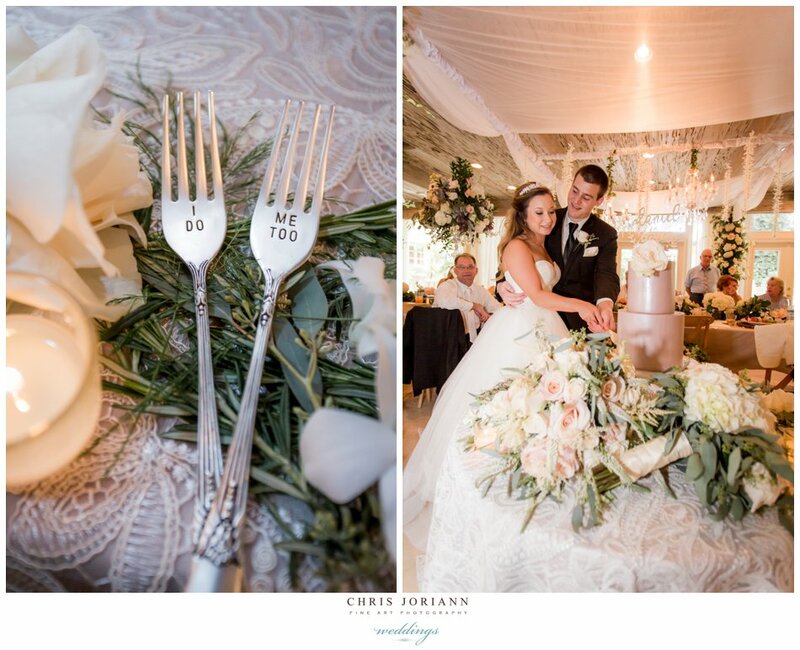 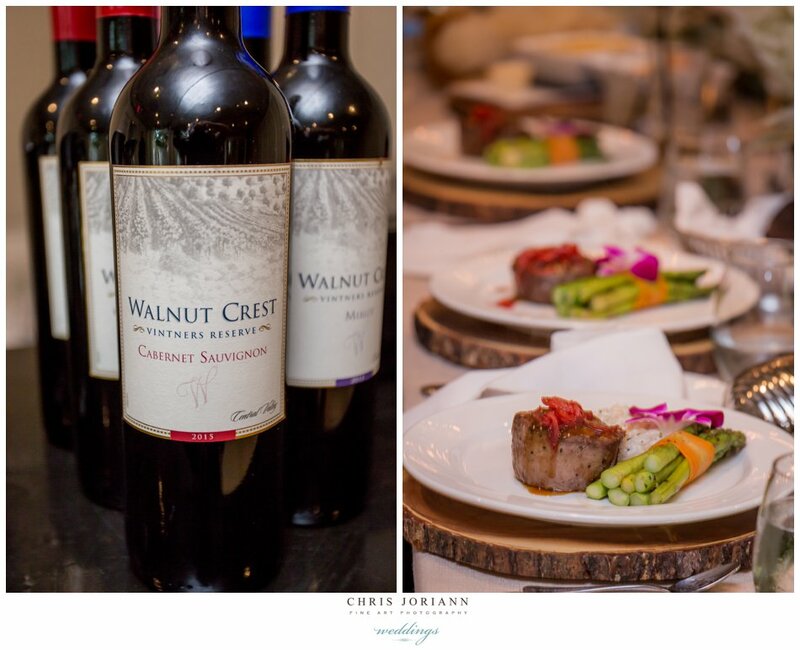 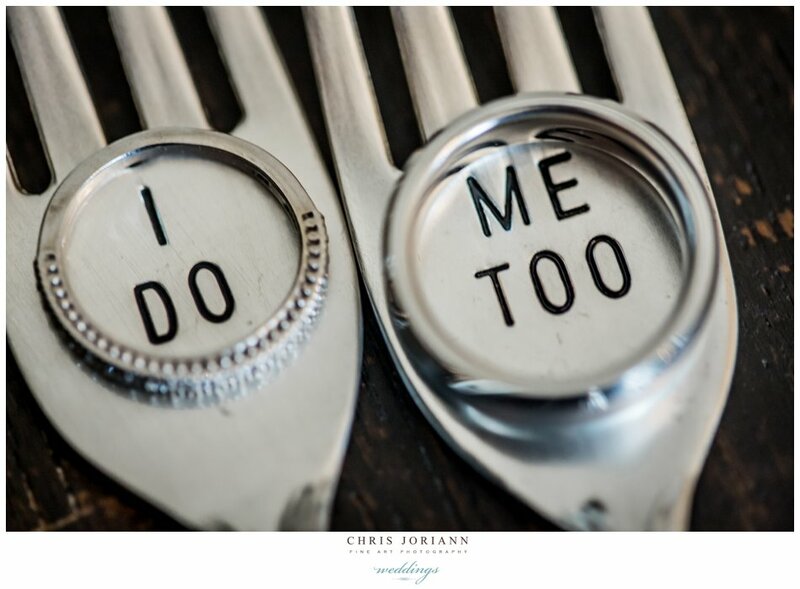 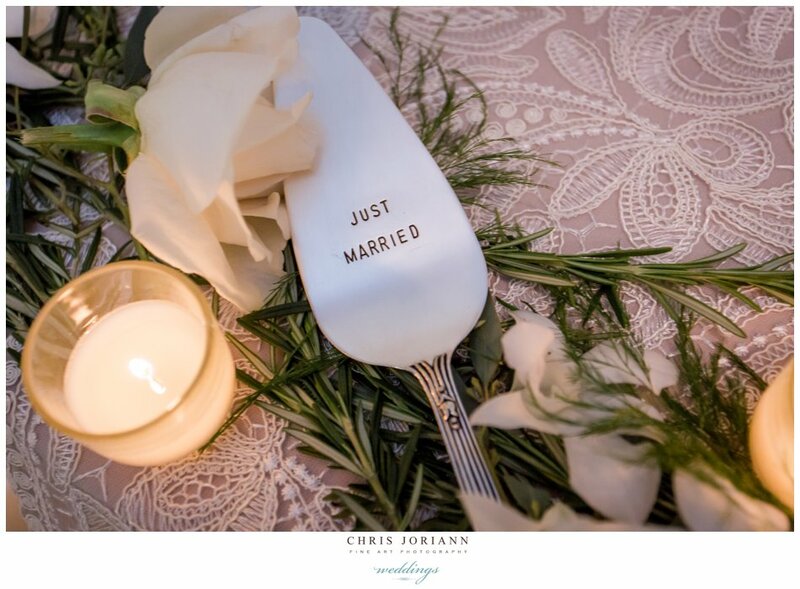 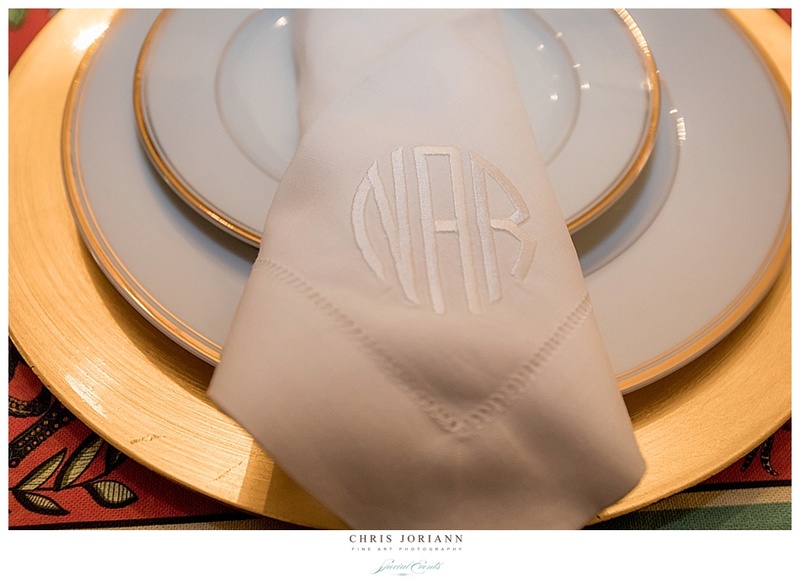 The custom imprinted forks and cake server added the perfect touch. 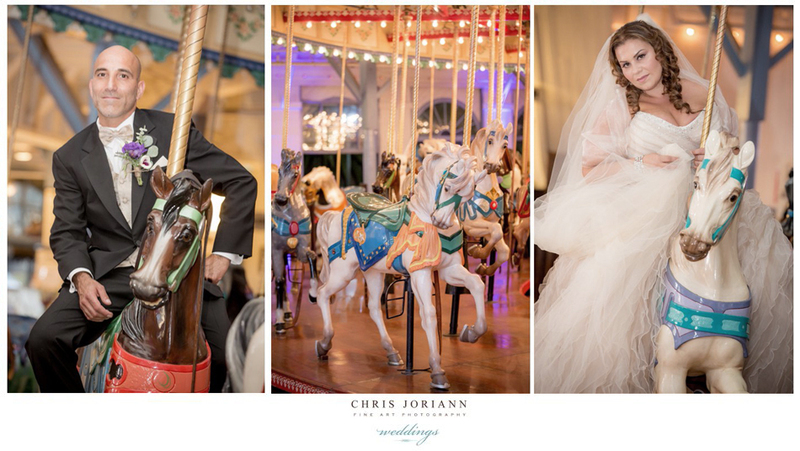 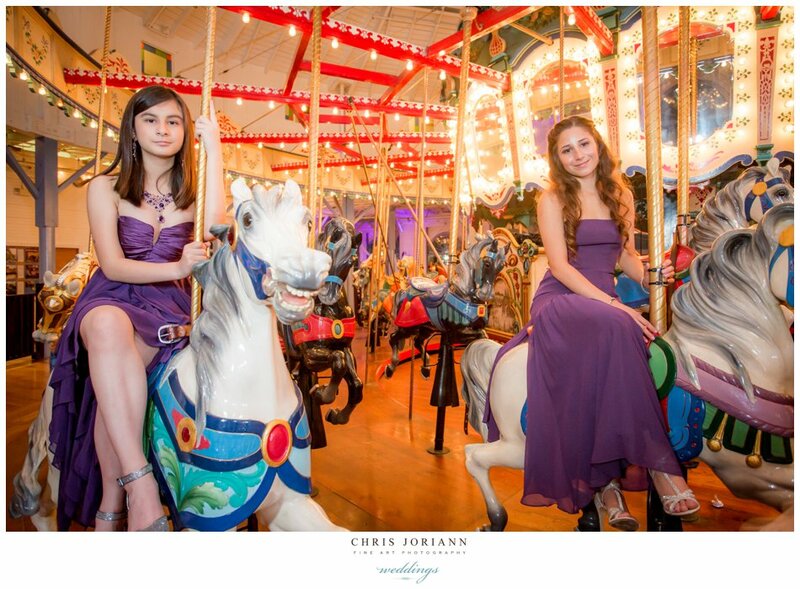 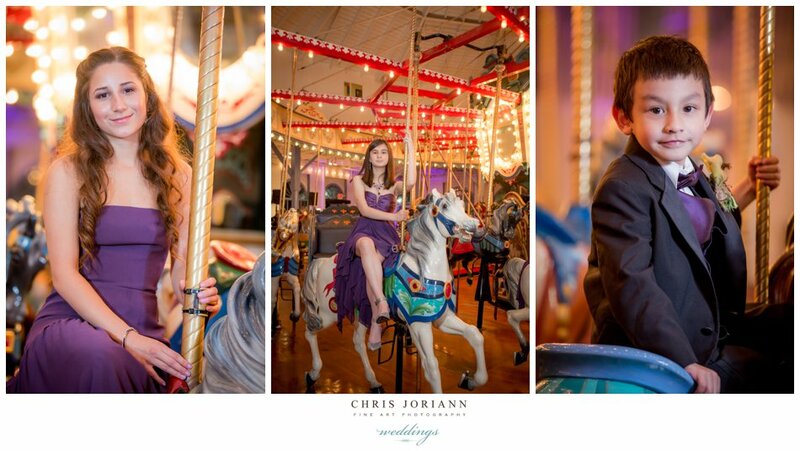 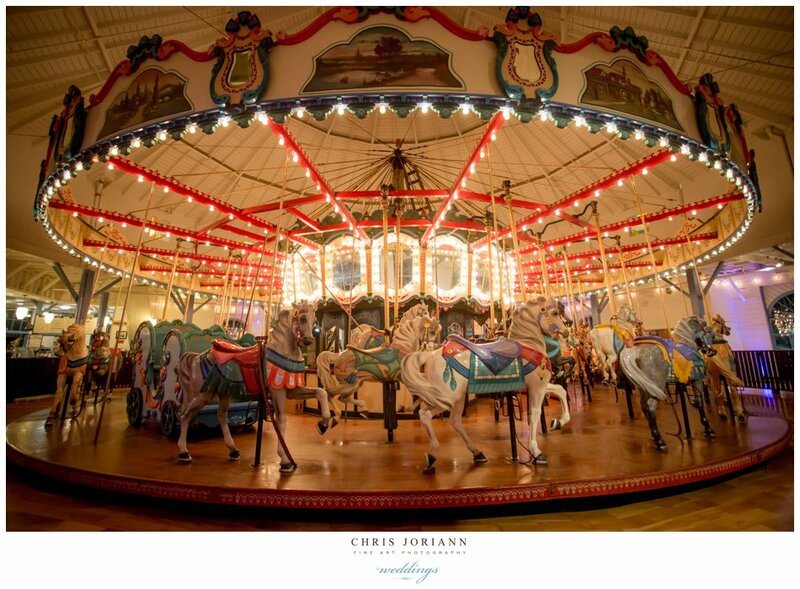 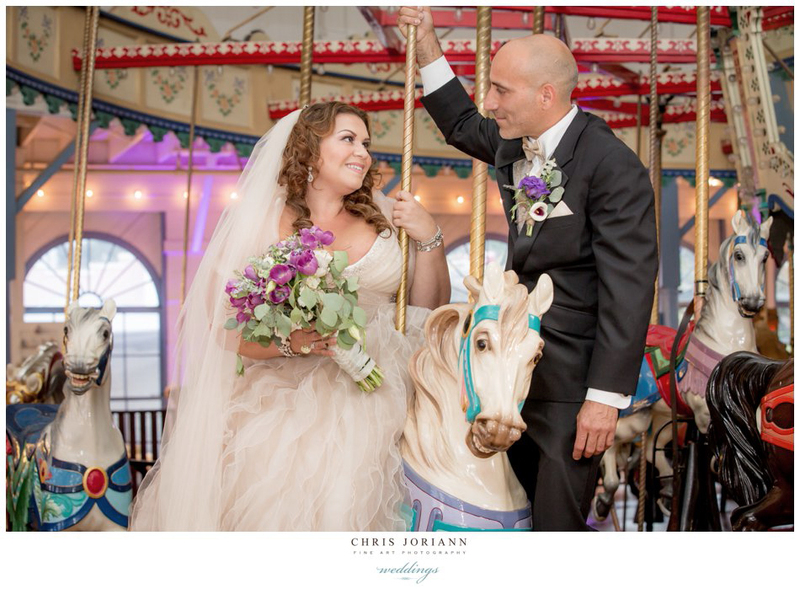 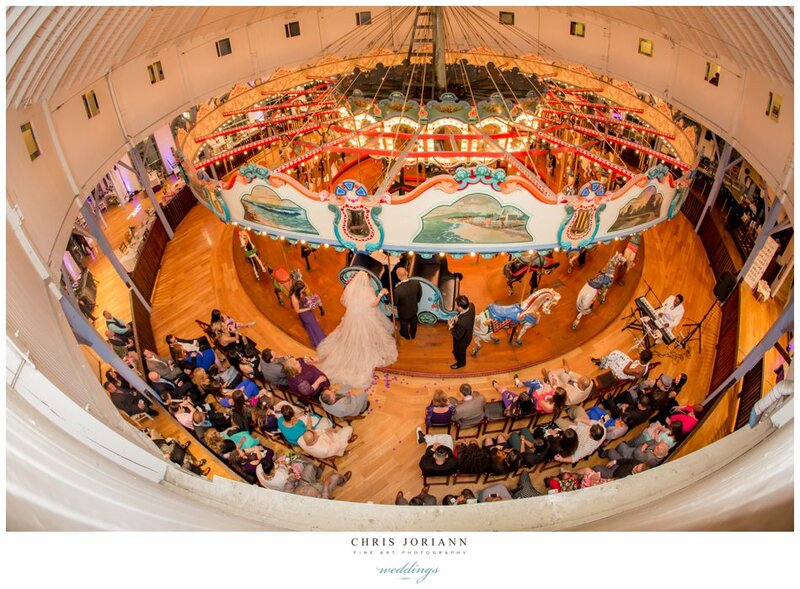 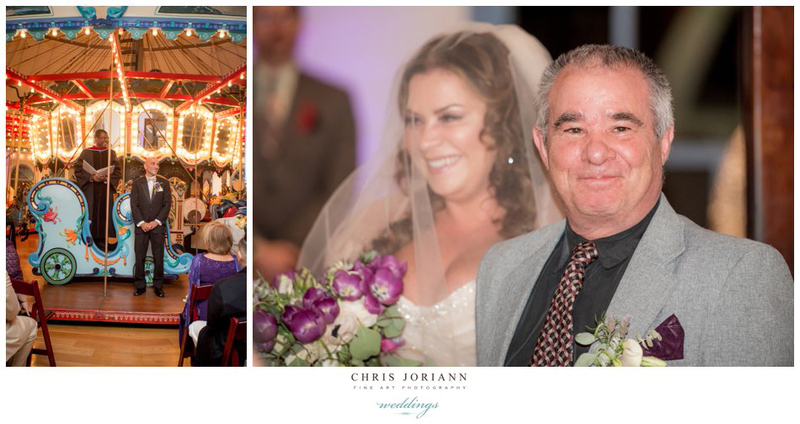 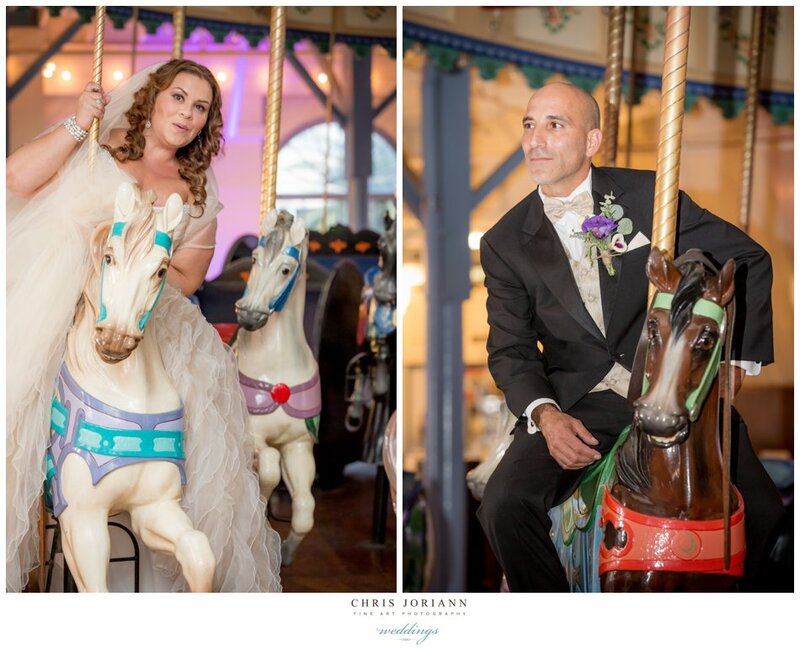 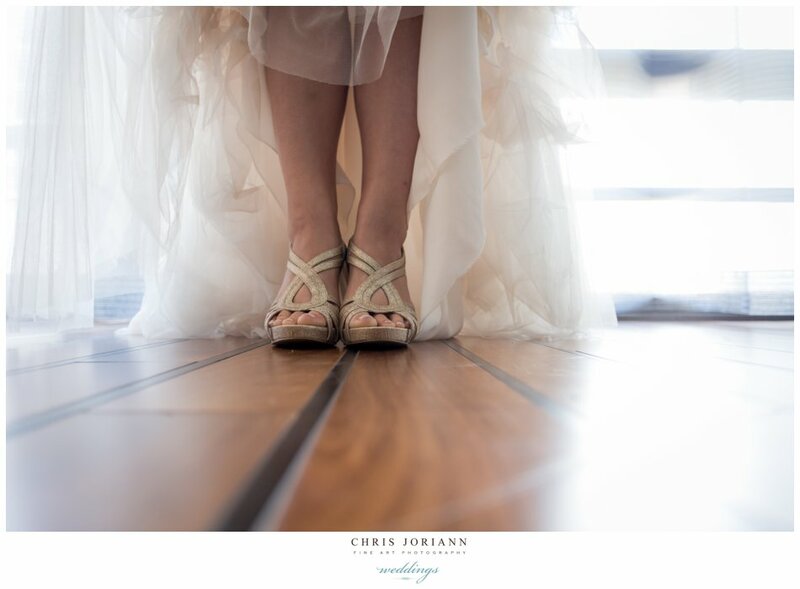 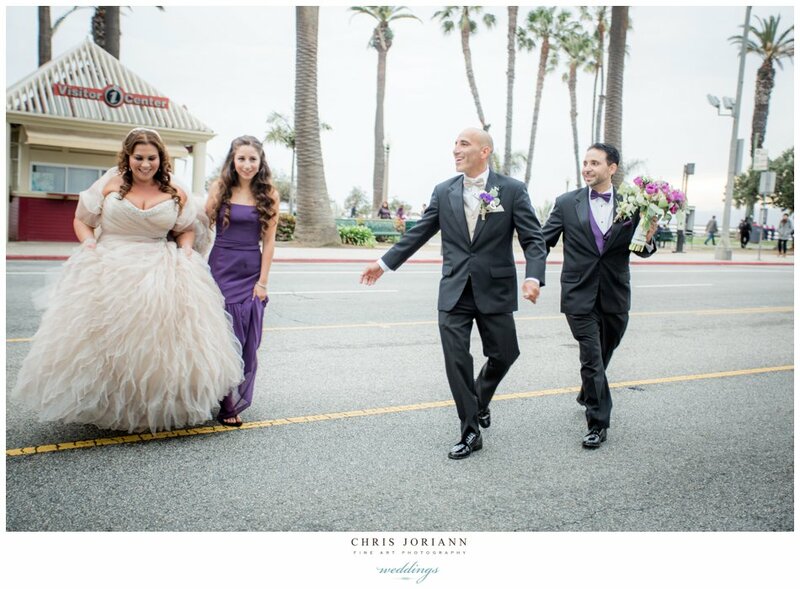 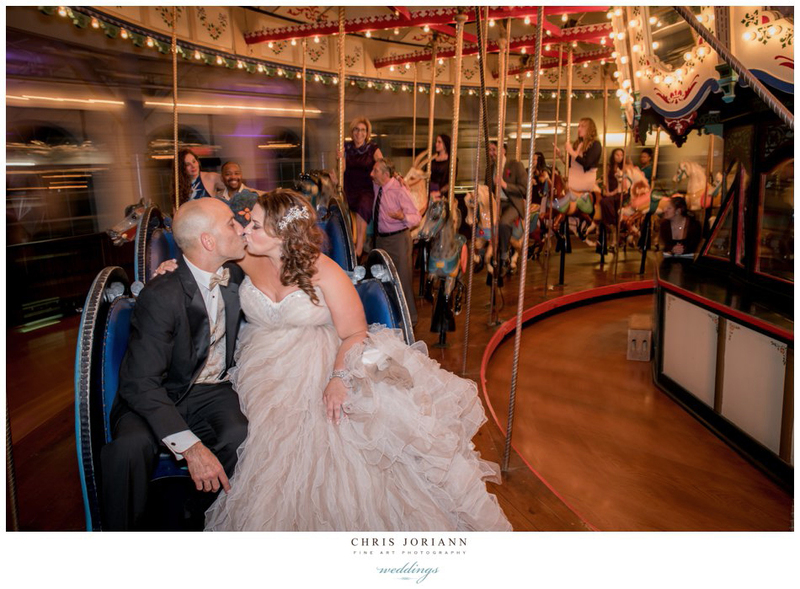 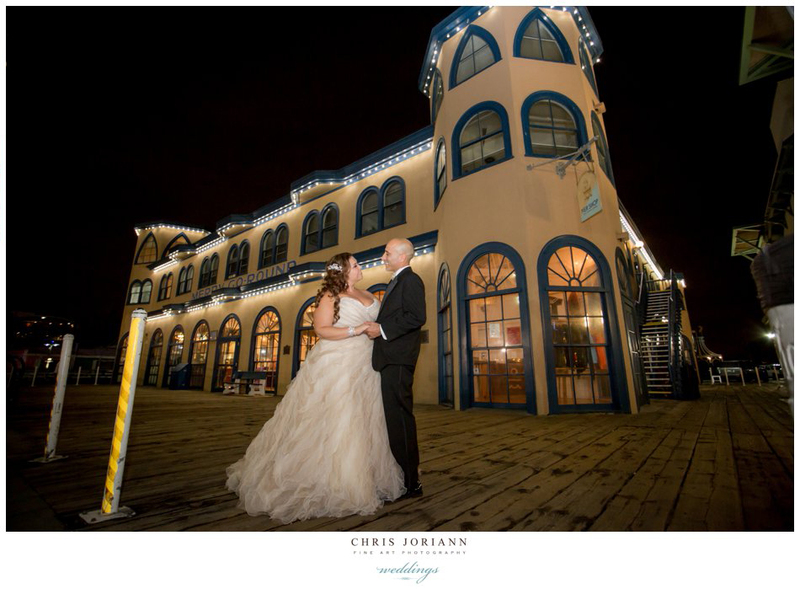 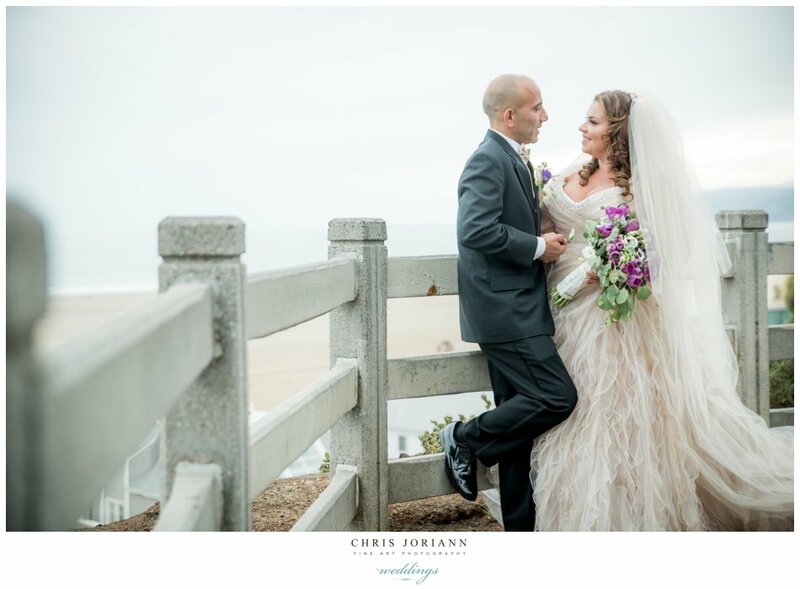 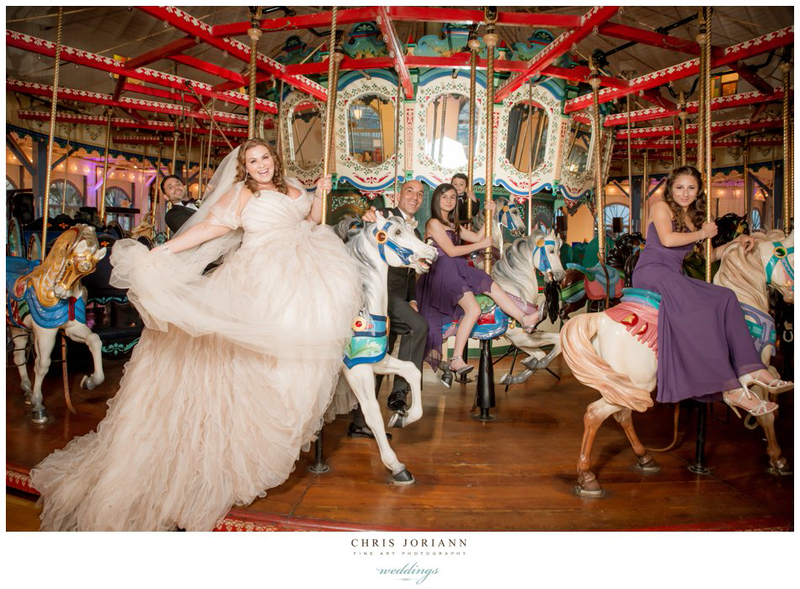 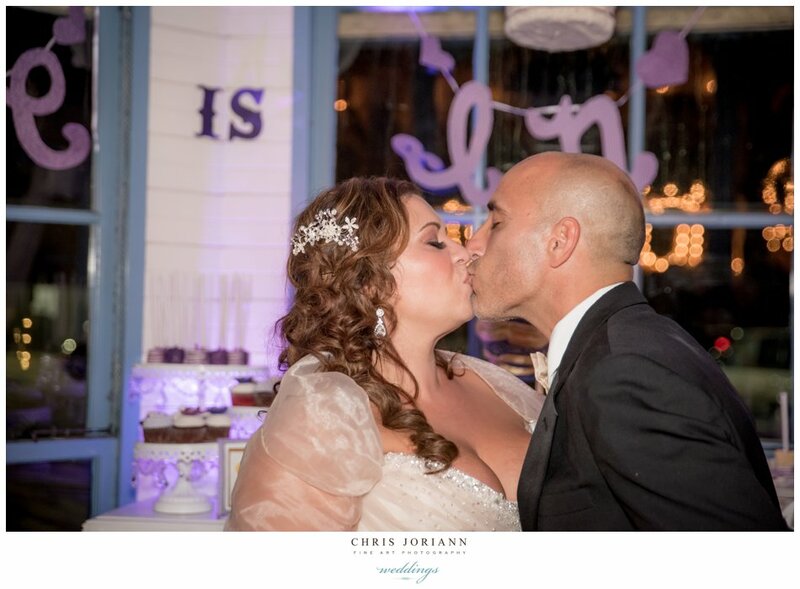 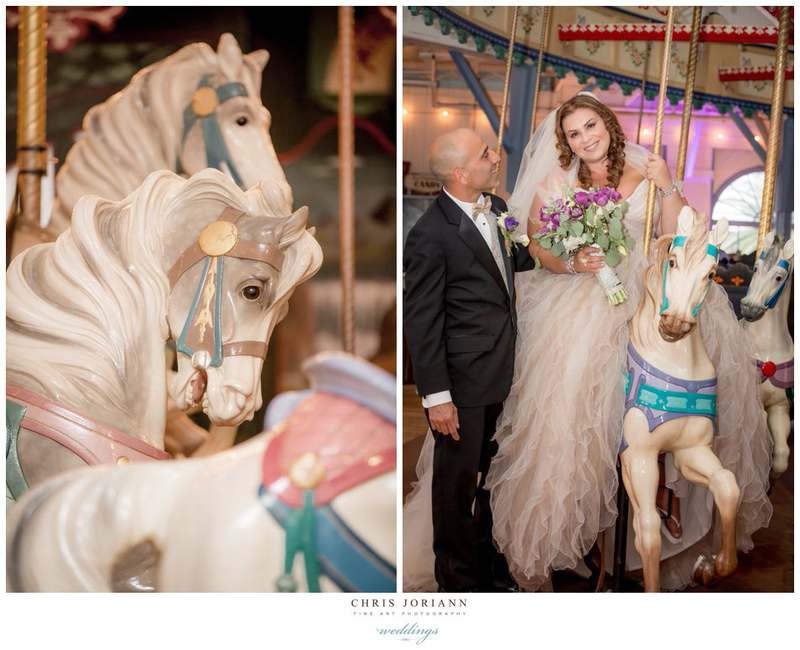 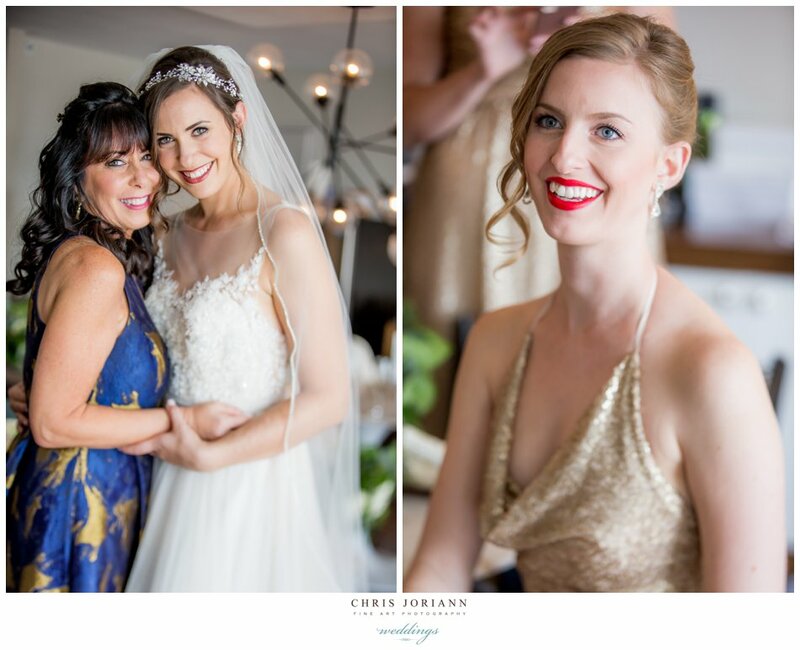 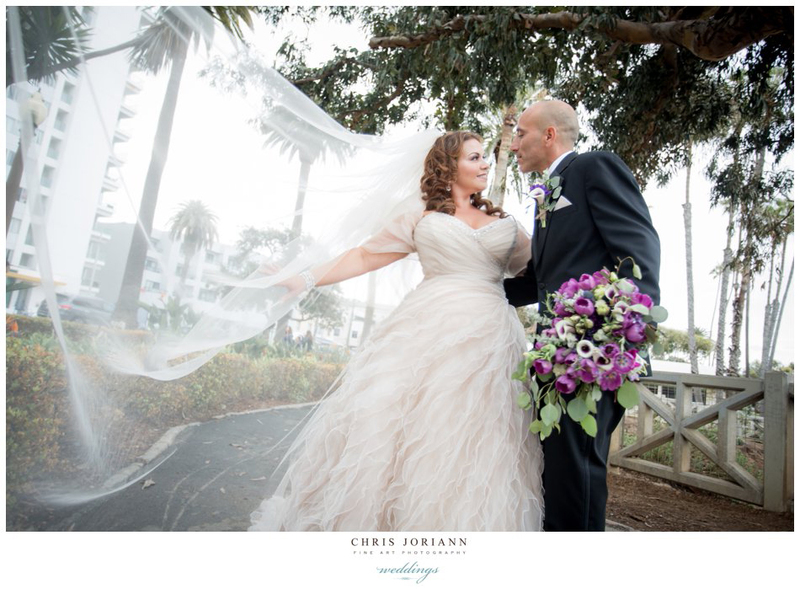 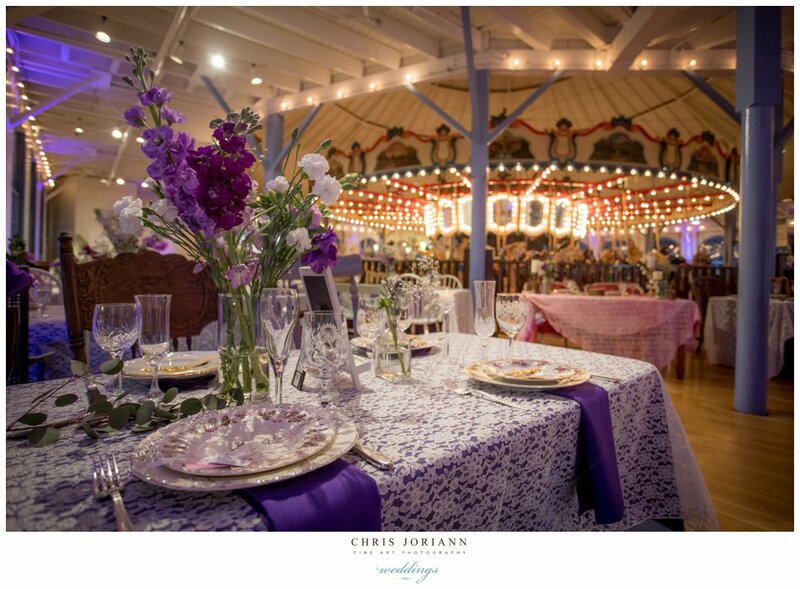 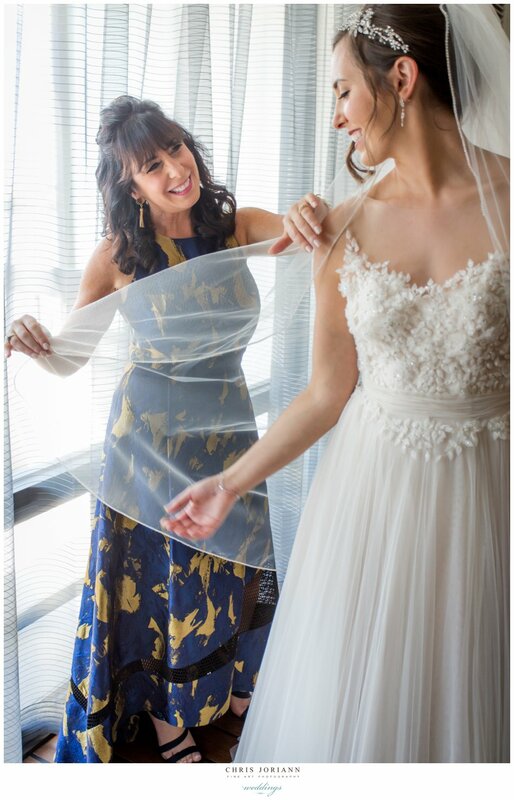 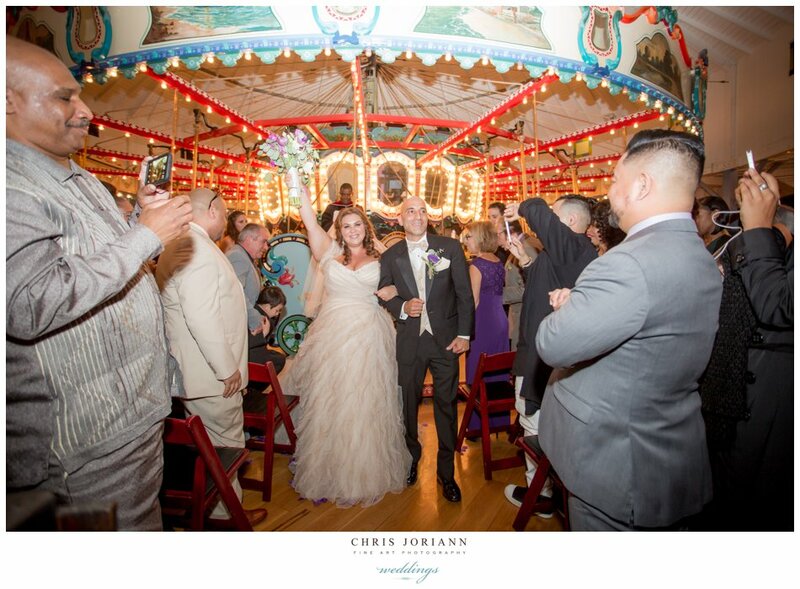 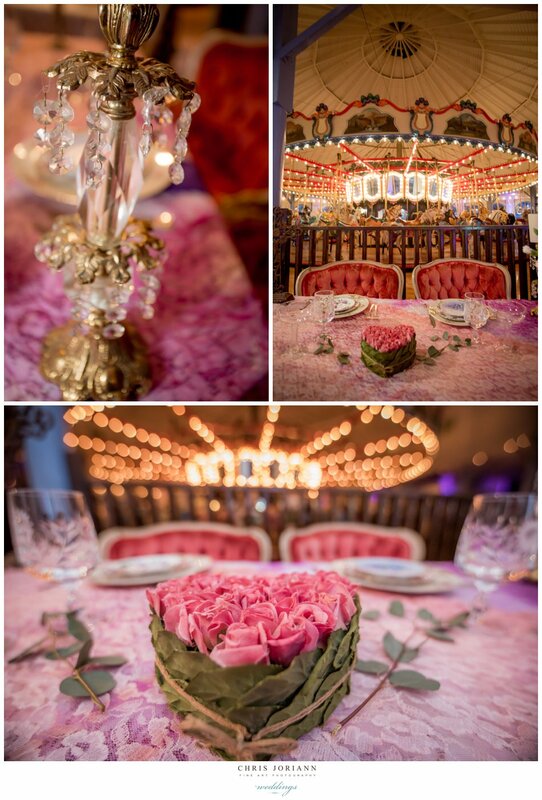 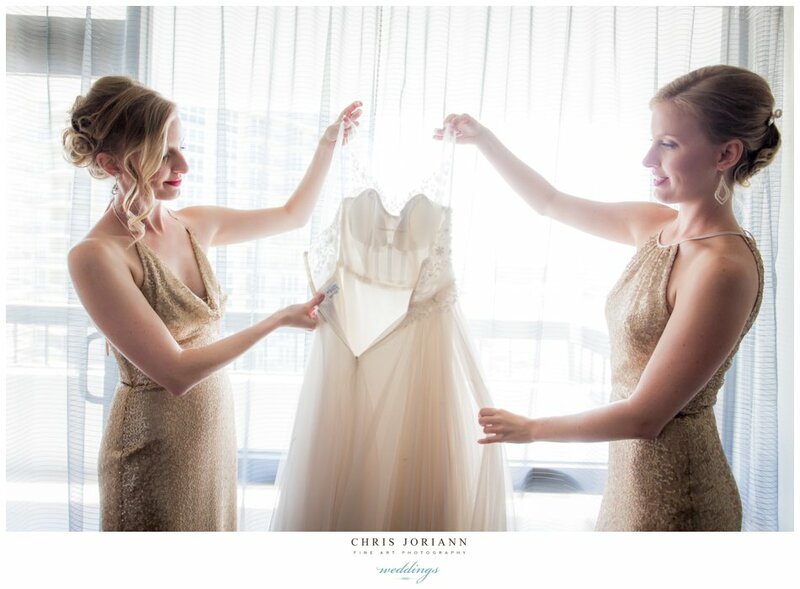 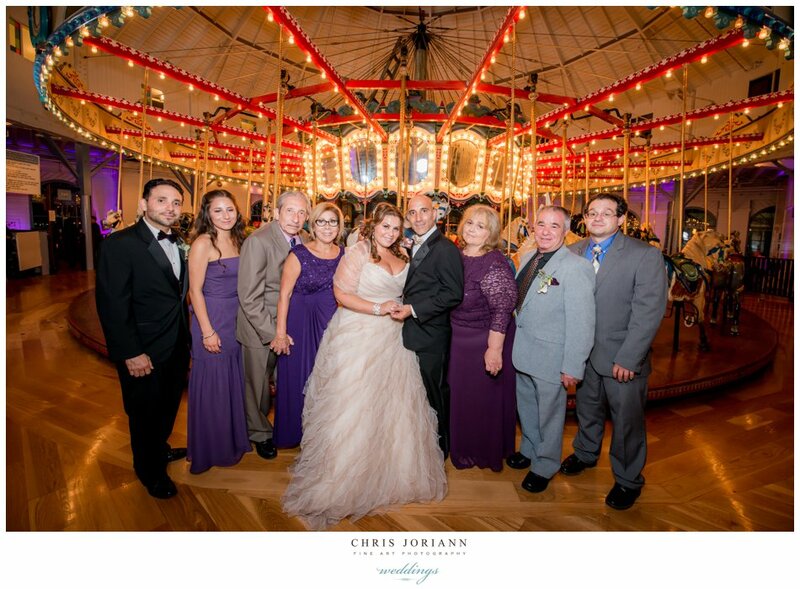 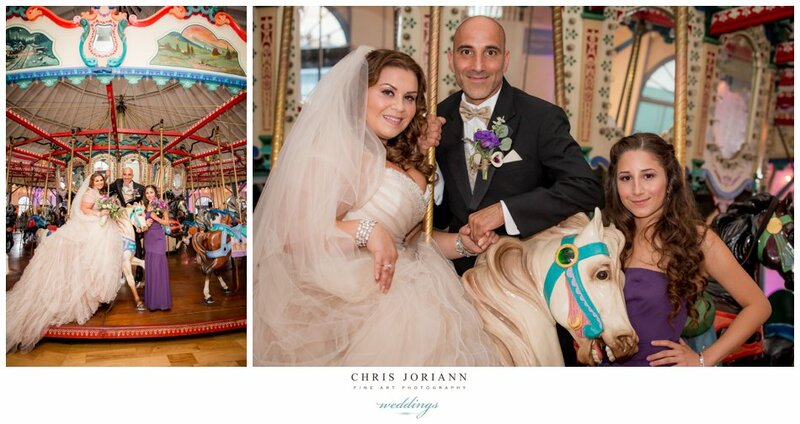 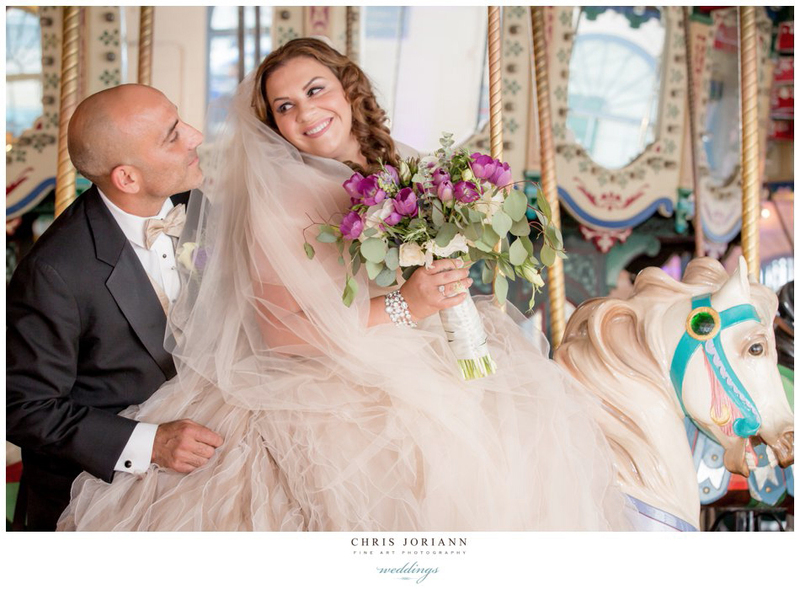 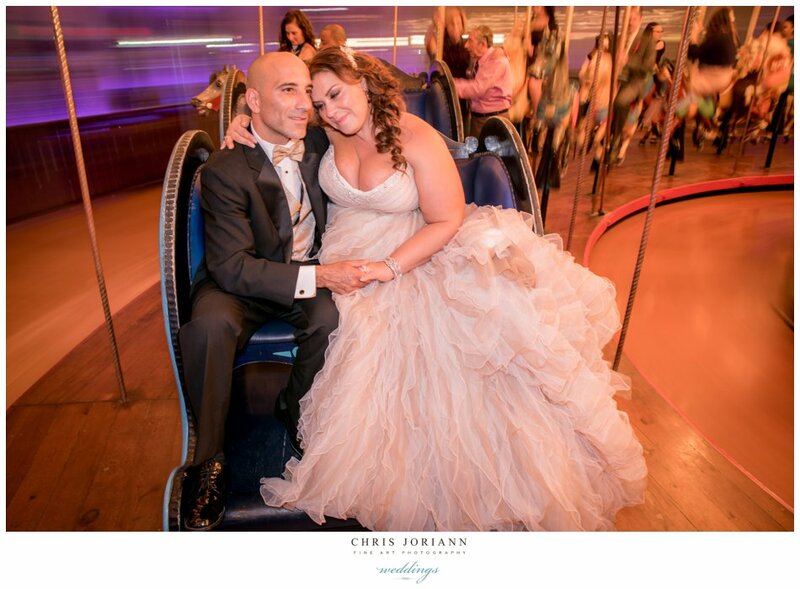 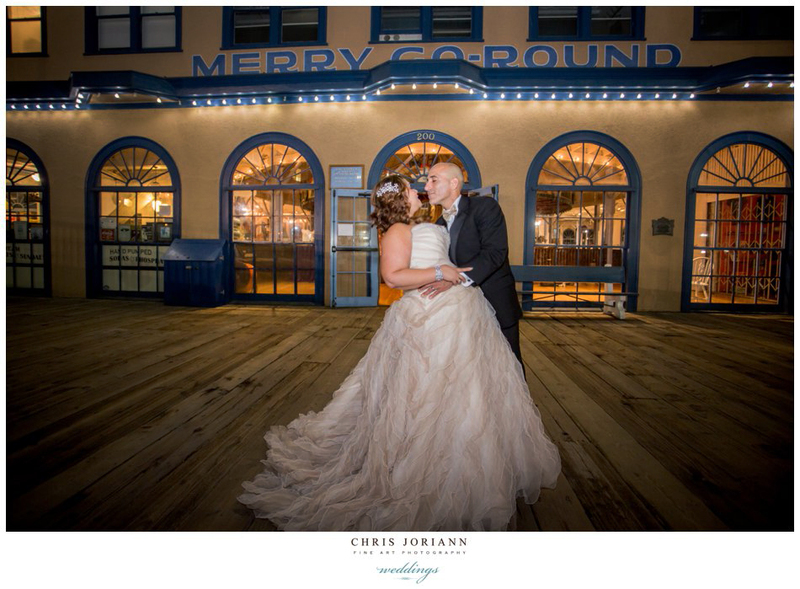 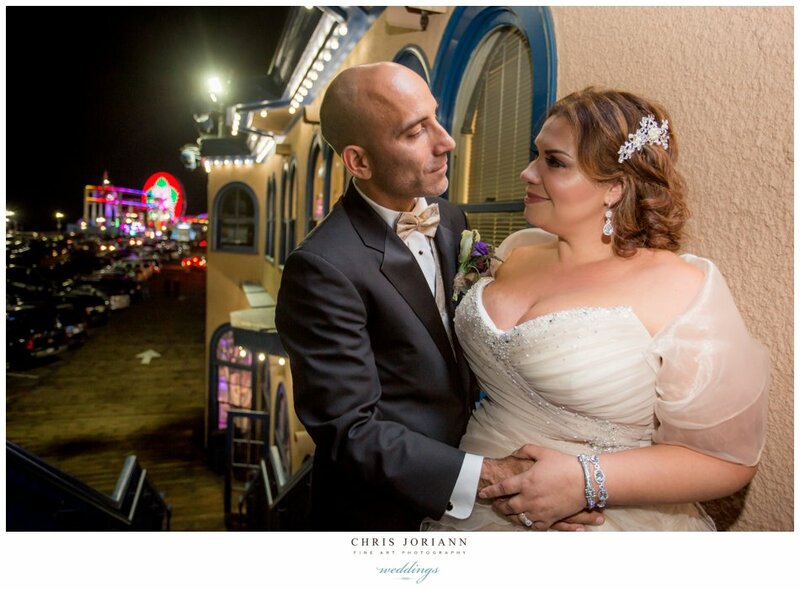 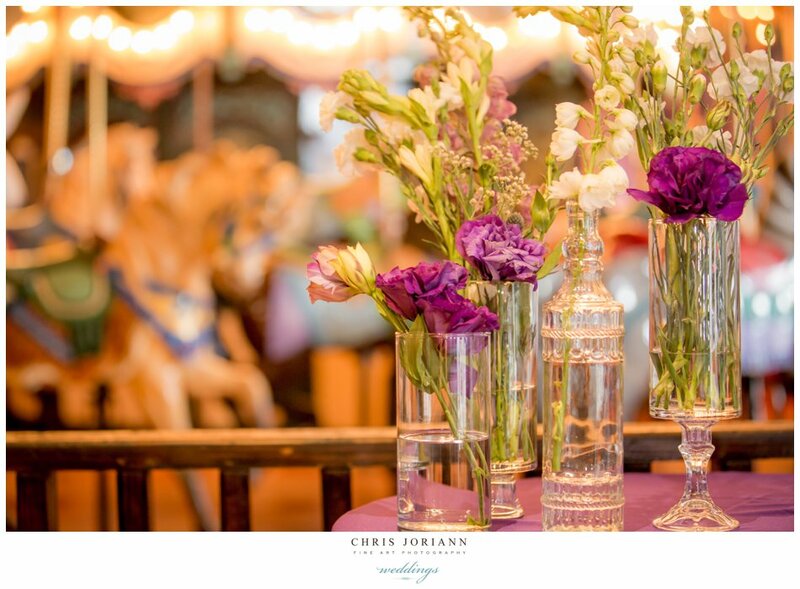 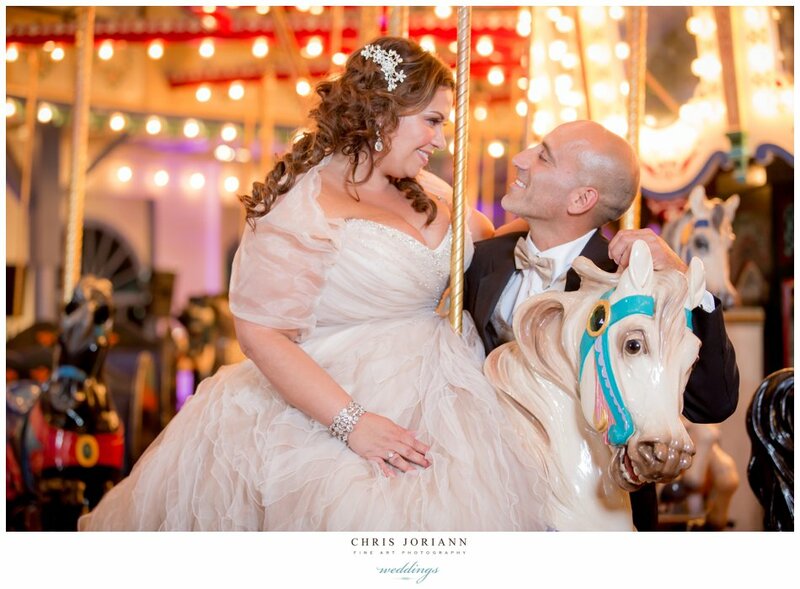 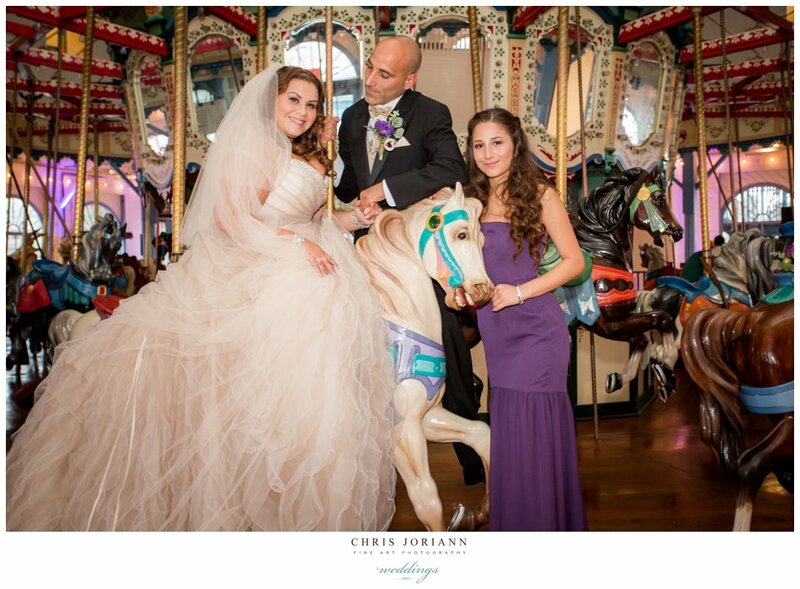 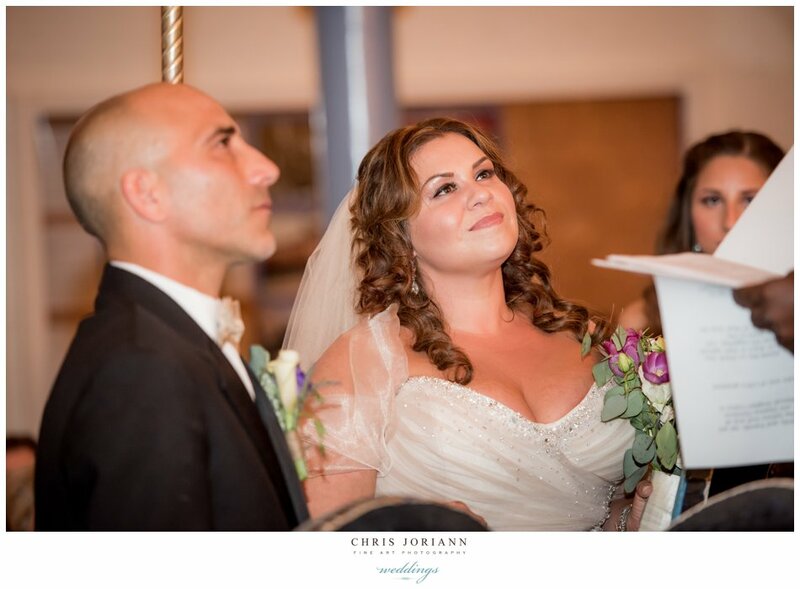 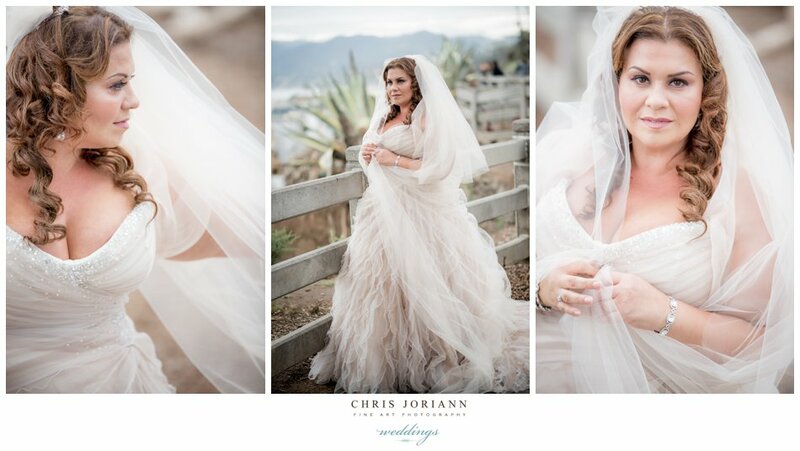 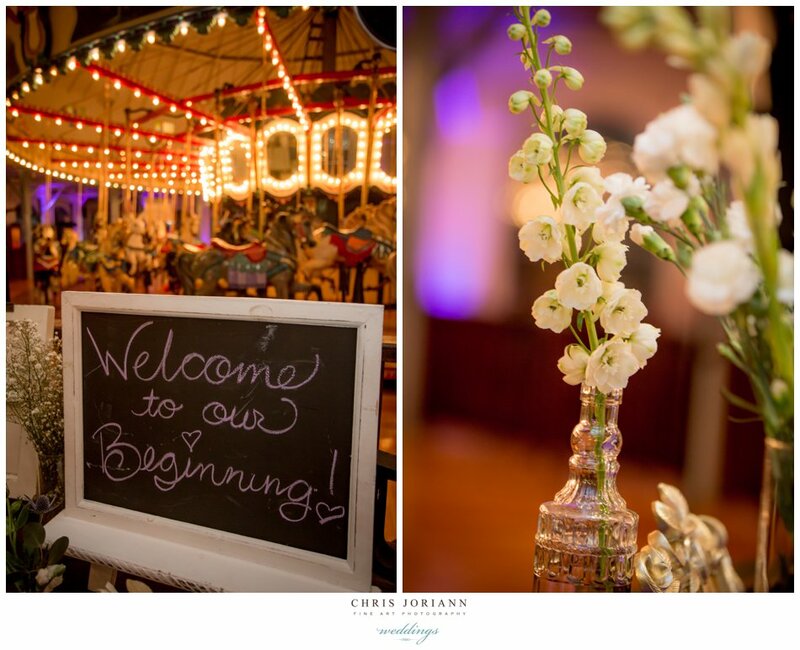 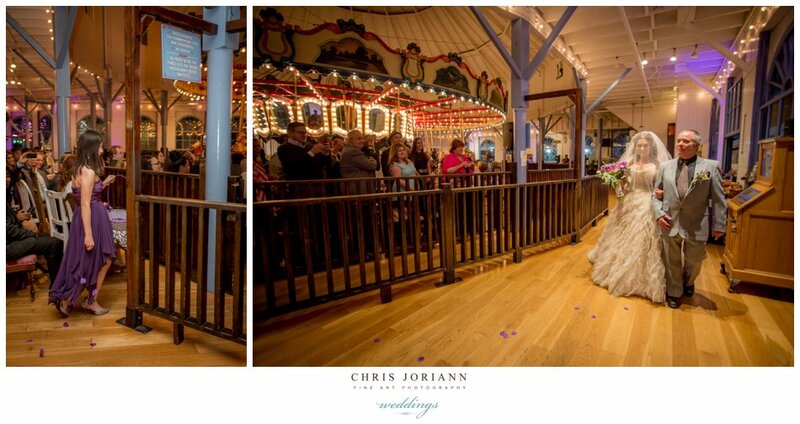 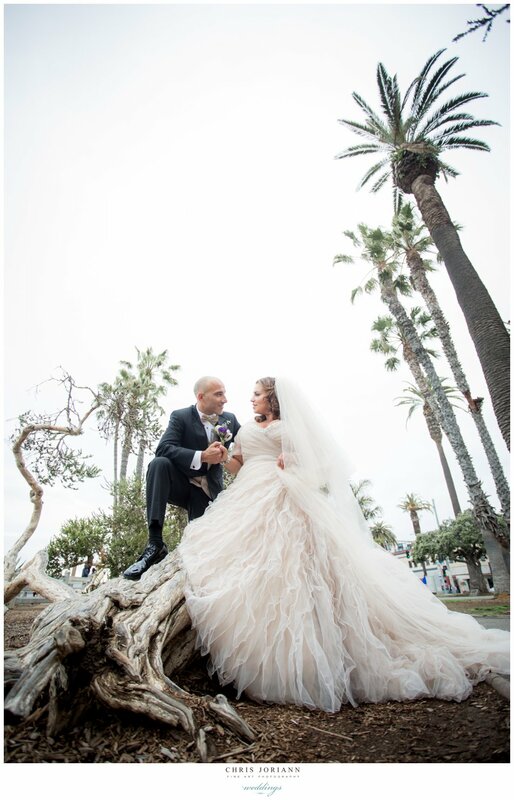 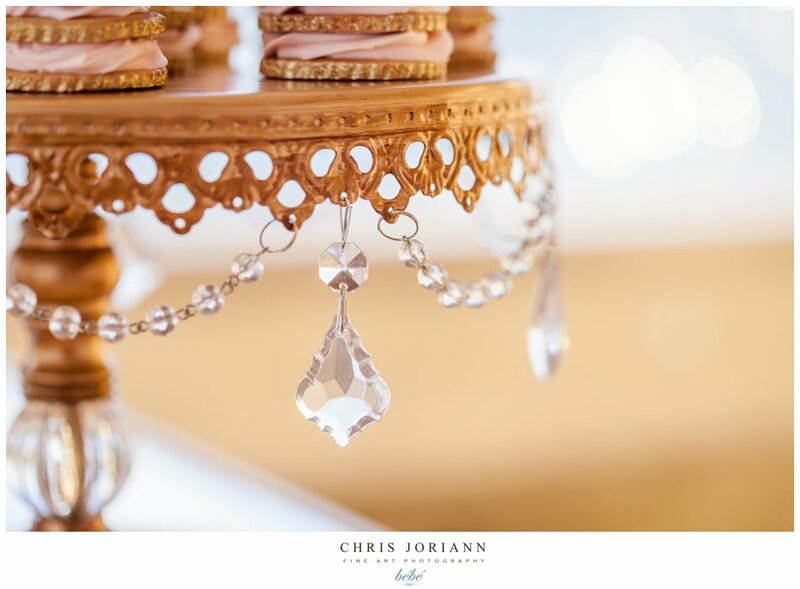 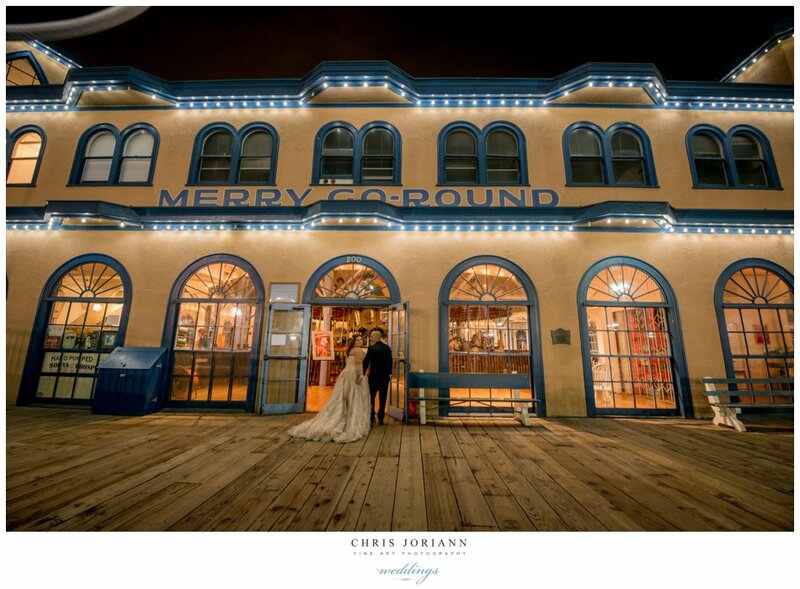 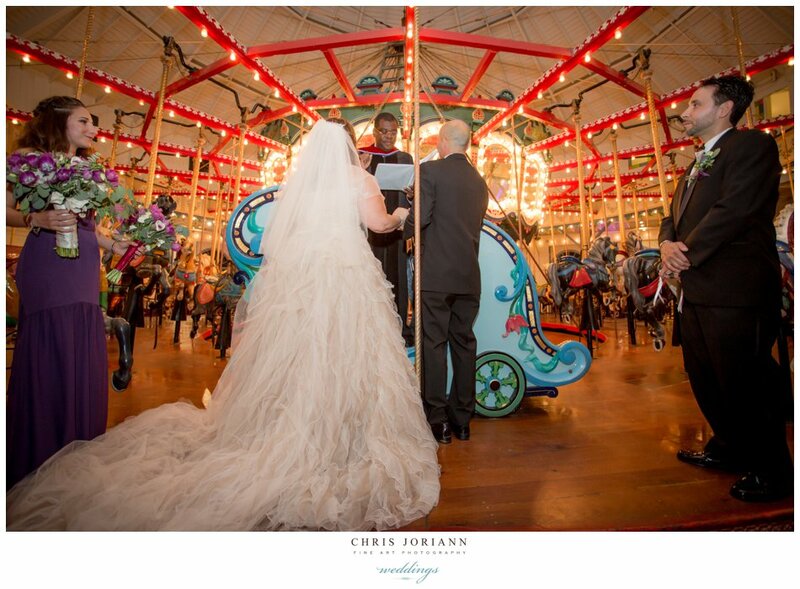 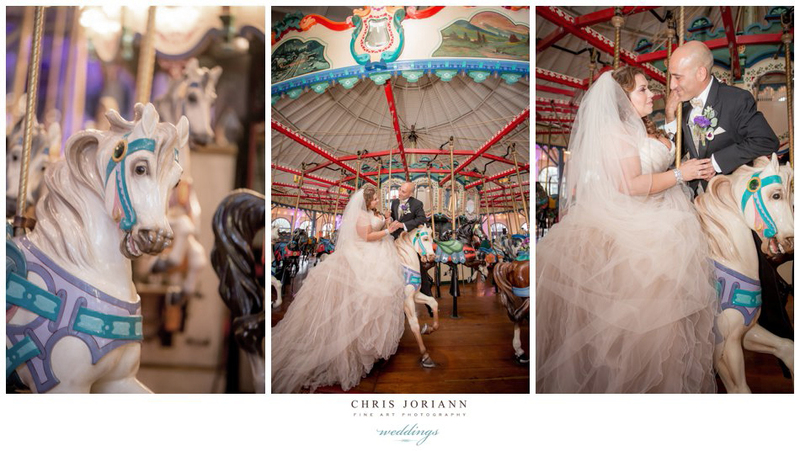 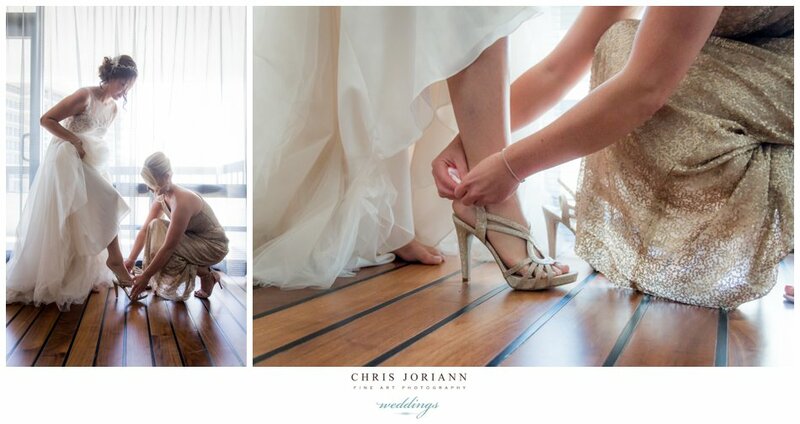 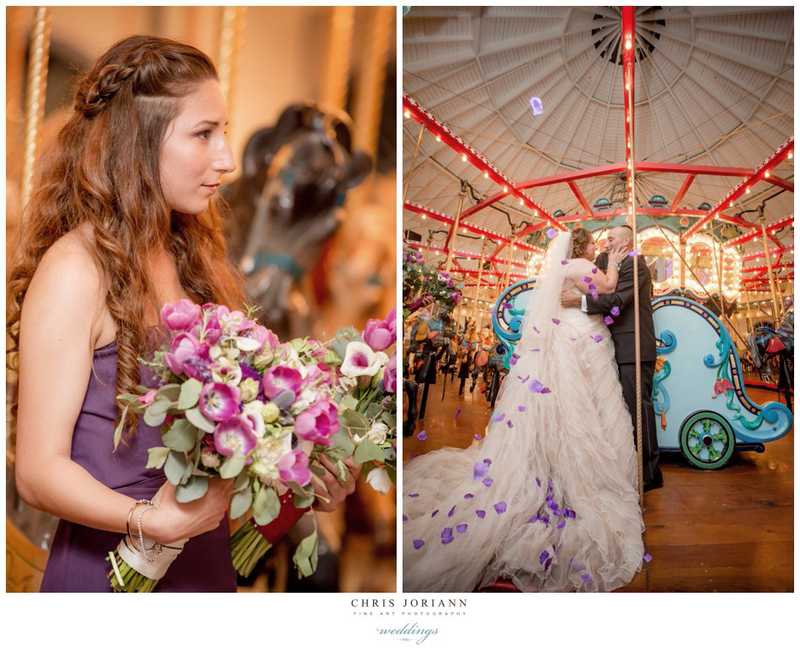 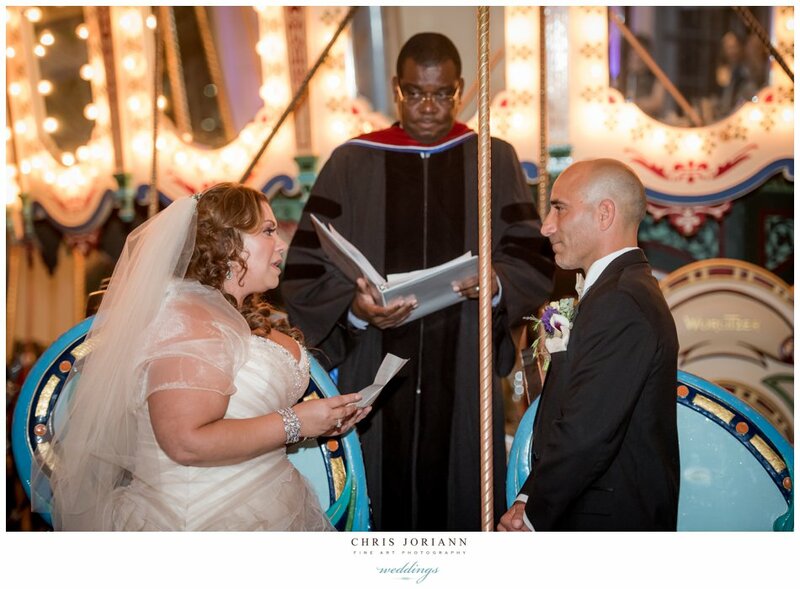 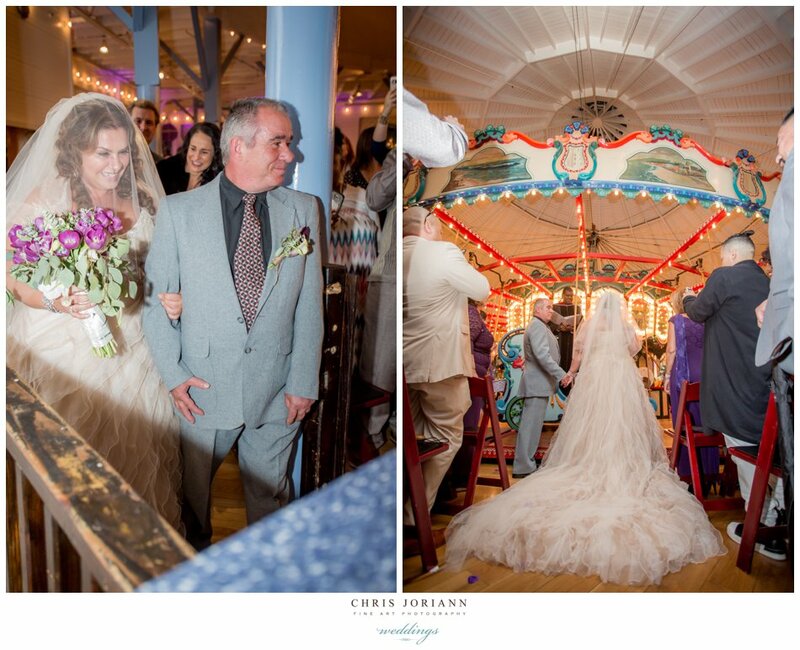 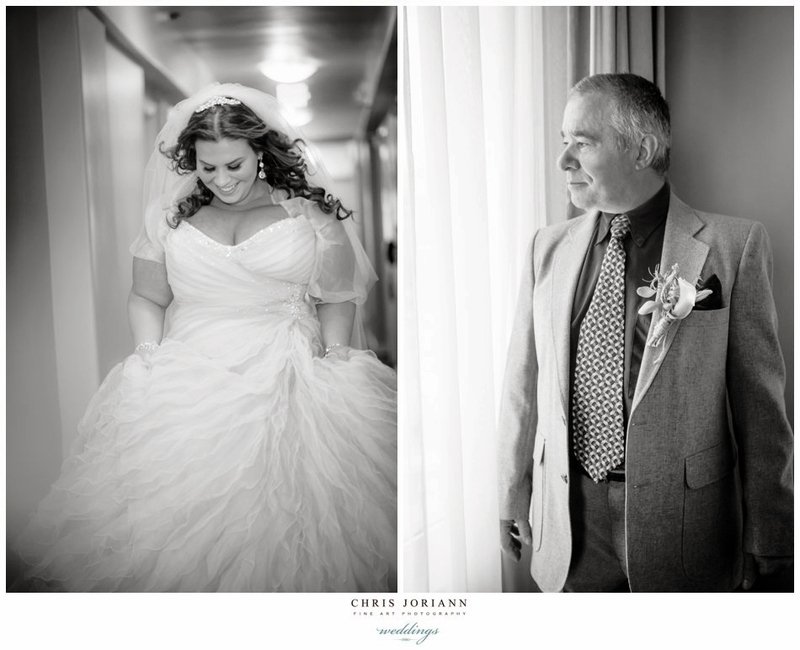 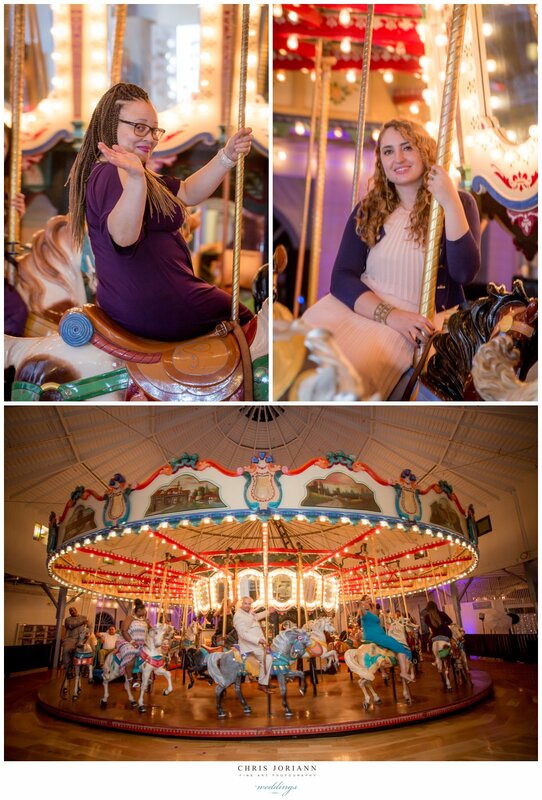 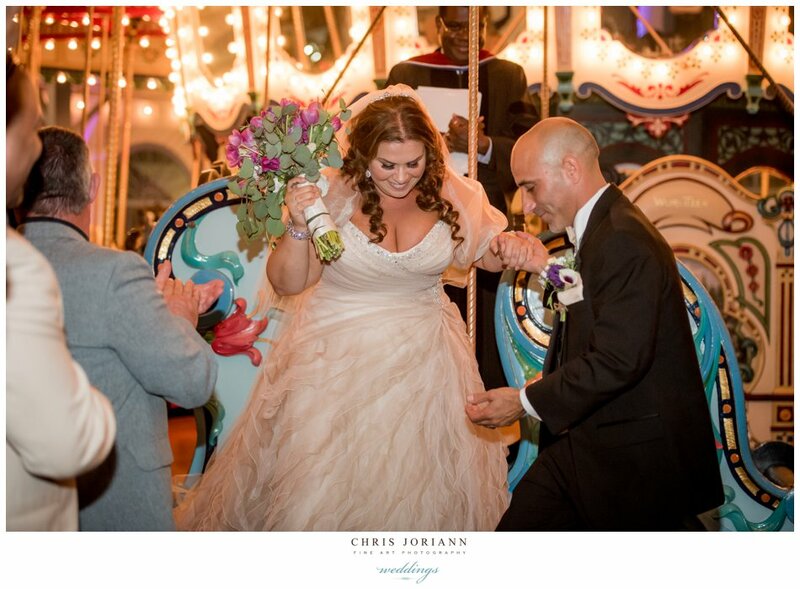 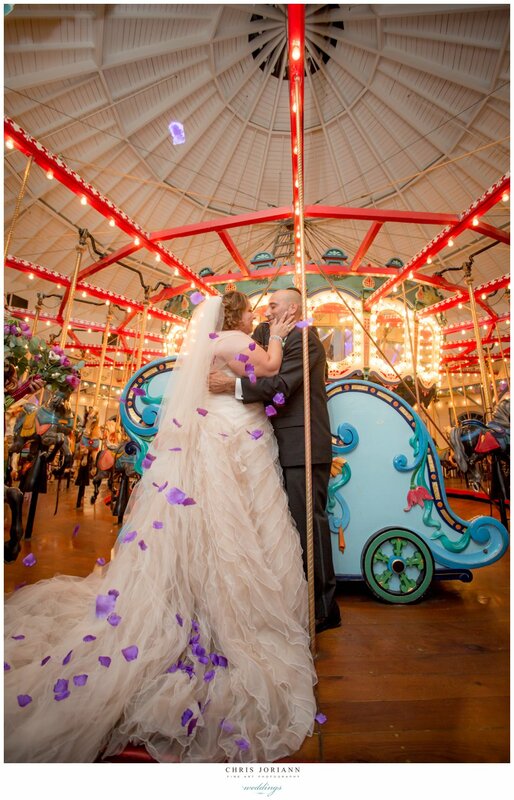 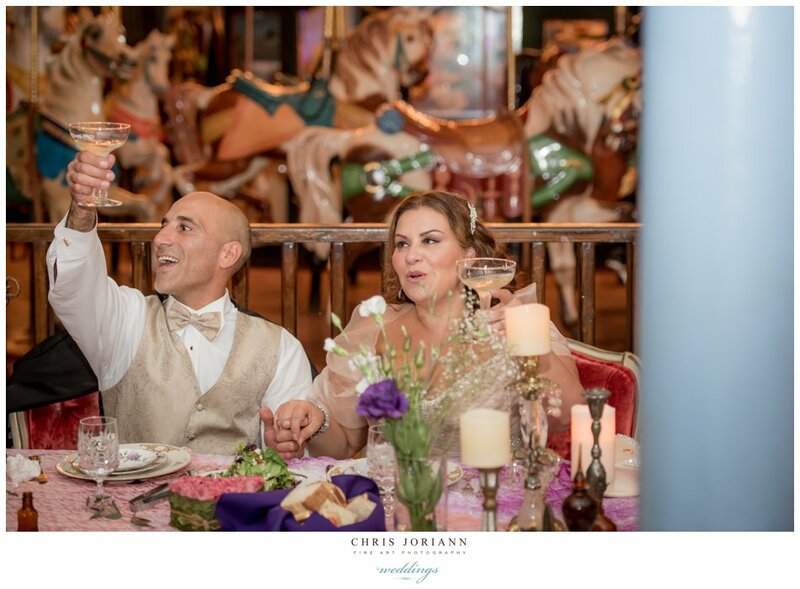 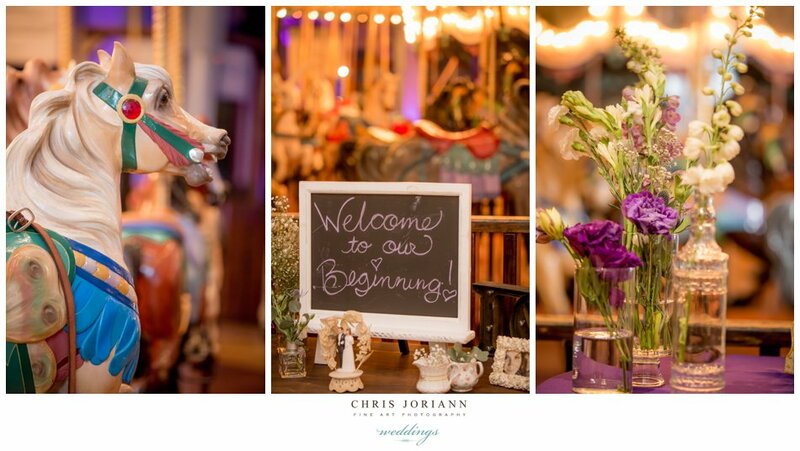 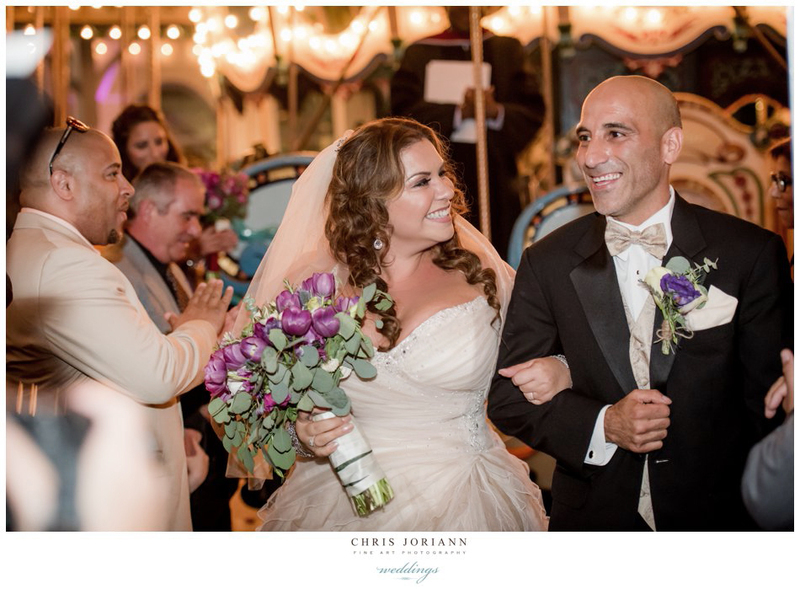 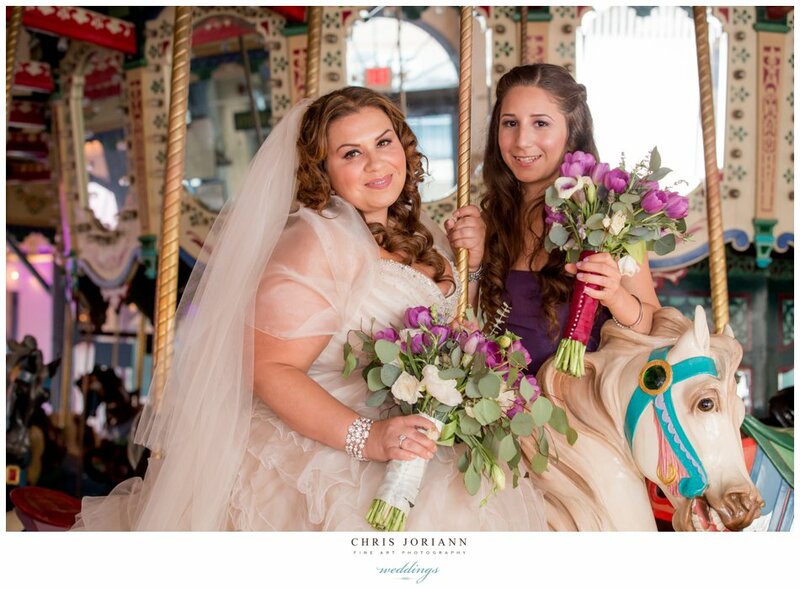 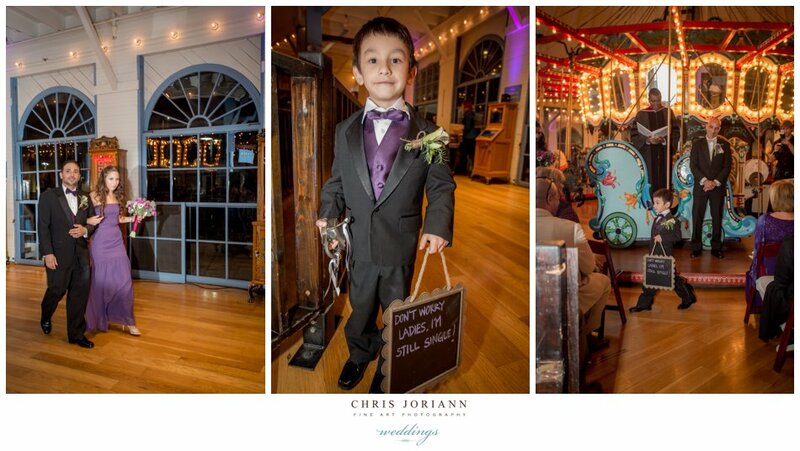 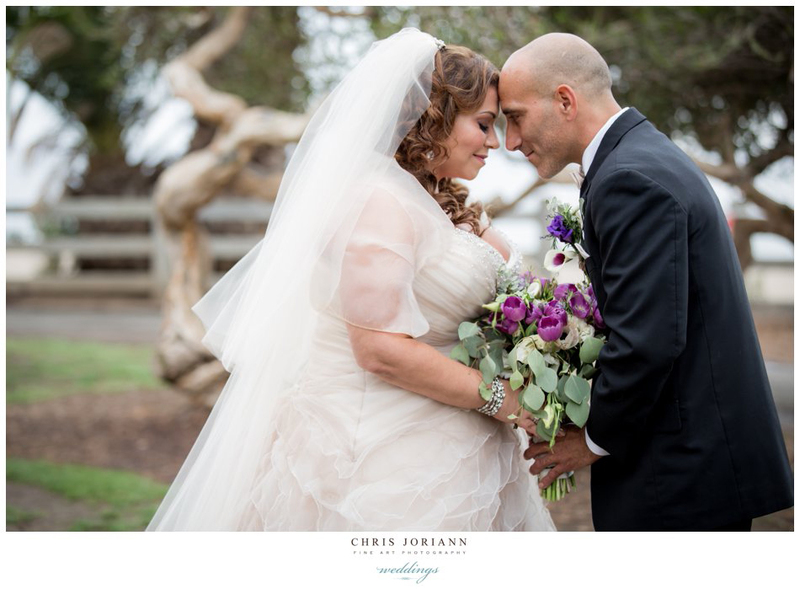 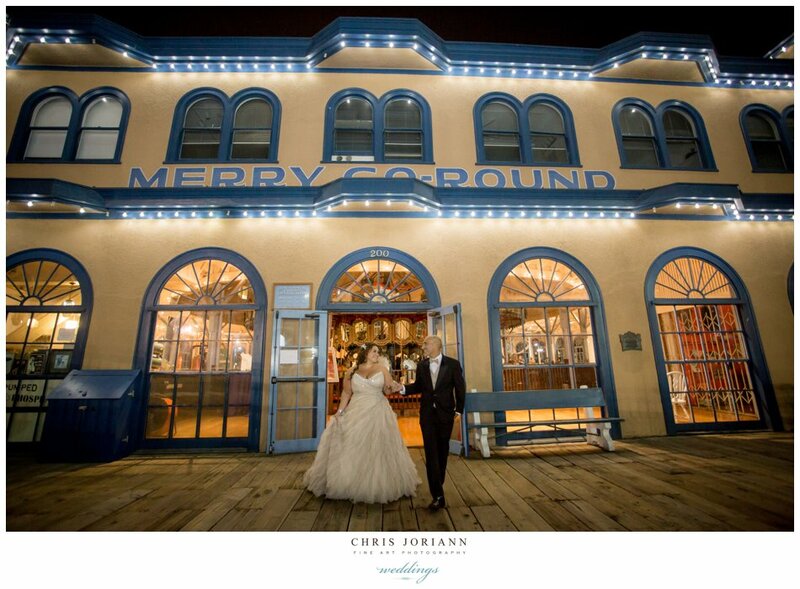 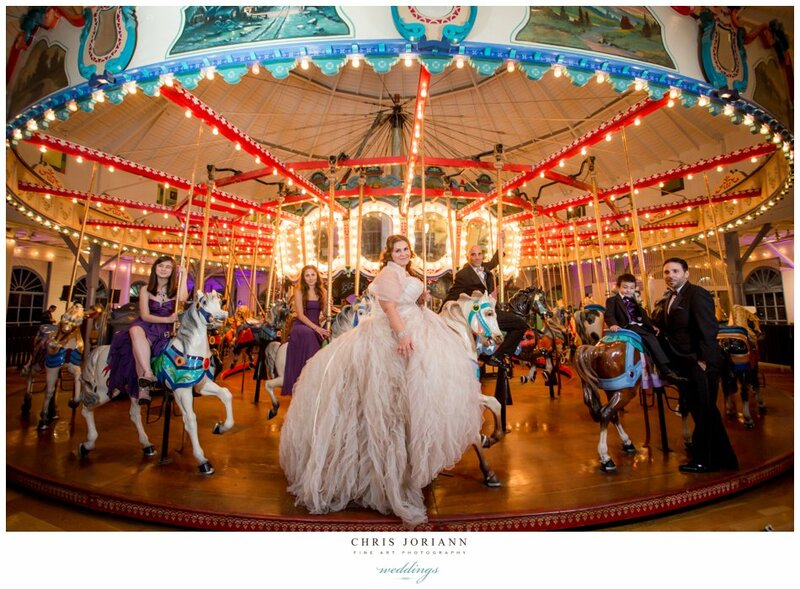 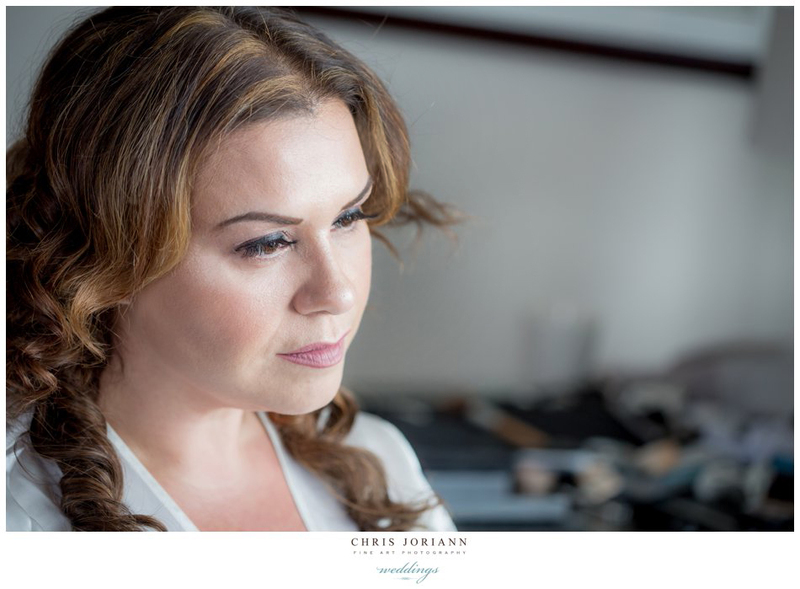 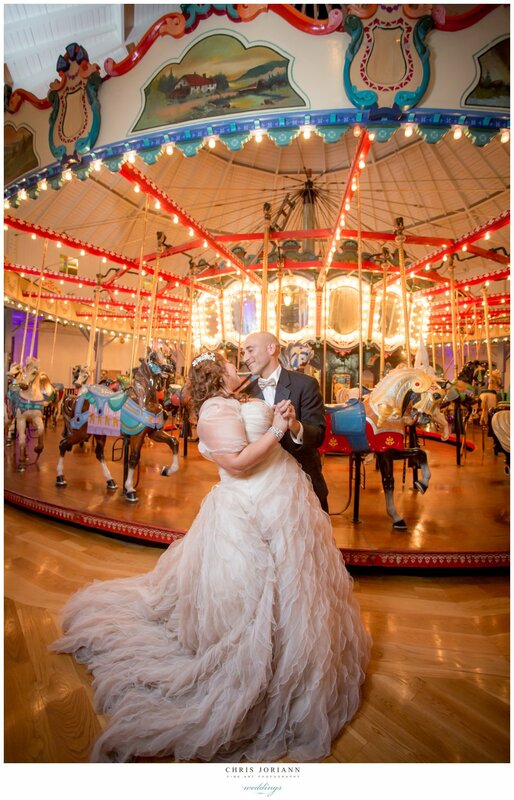 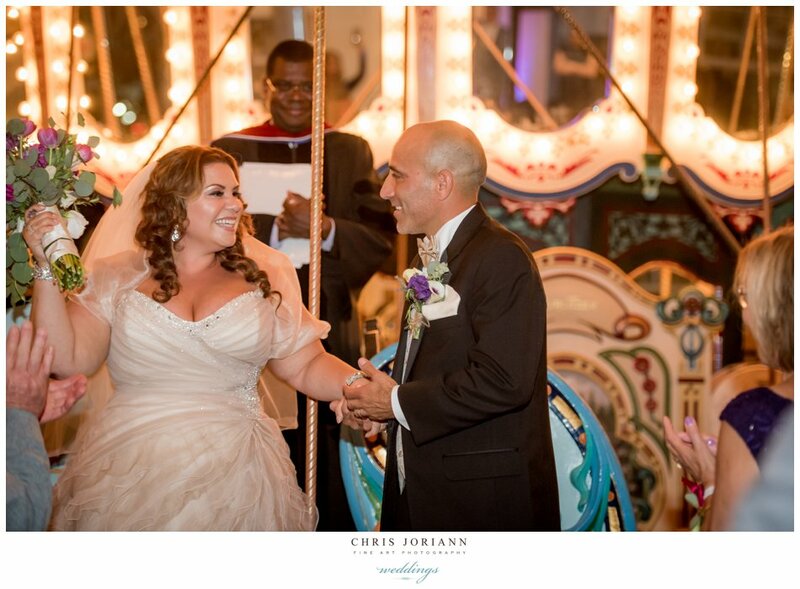 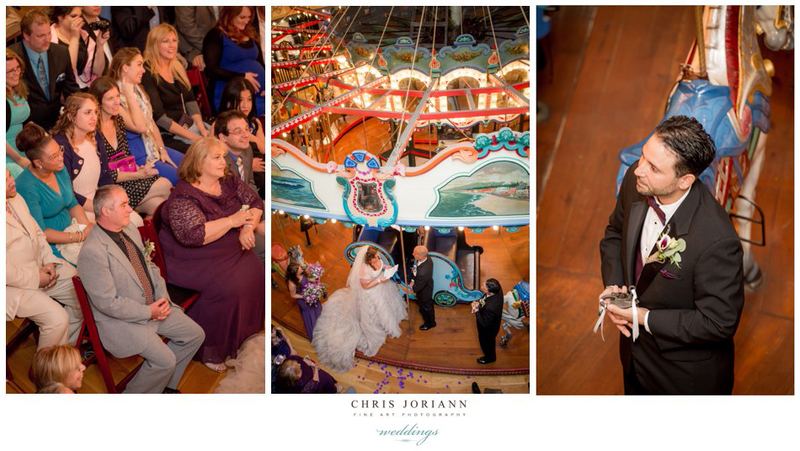 Deanna + Manny’s “Vintage Carousel” wedding at the Santa Monica Pier was as wonderful as it was unique!!!! 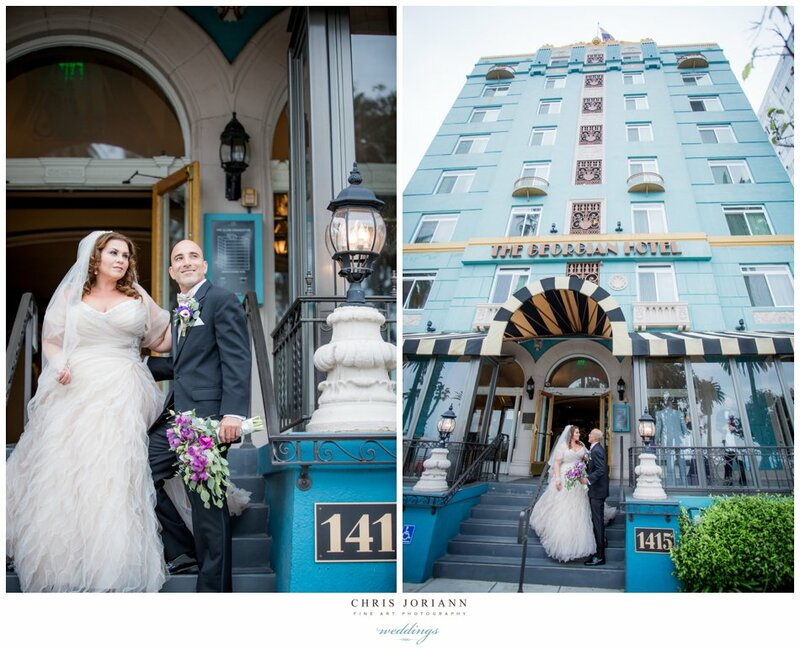 The bride readied at the historic Georgian Hotel, across from the beach. 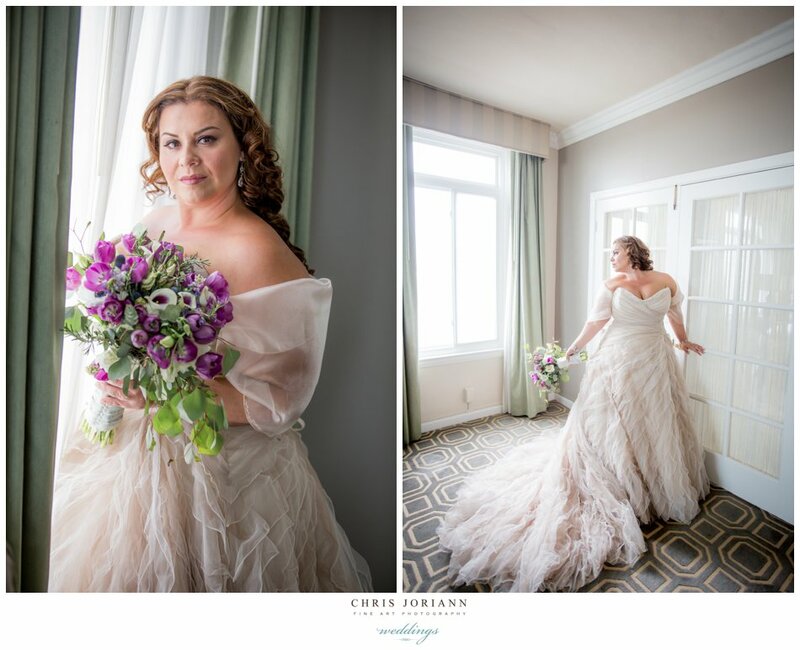 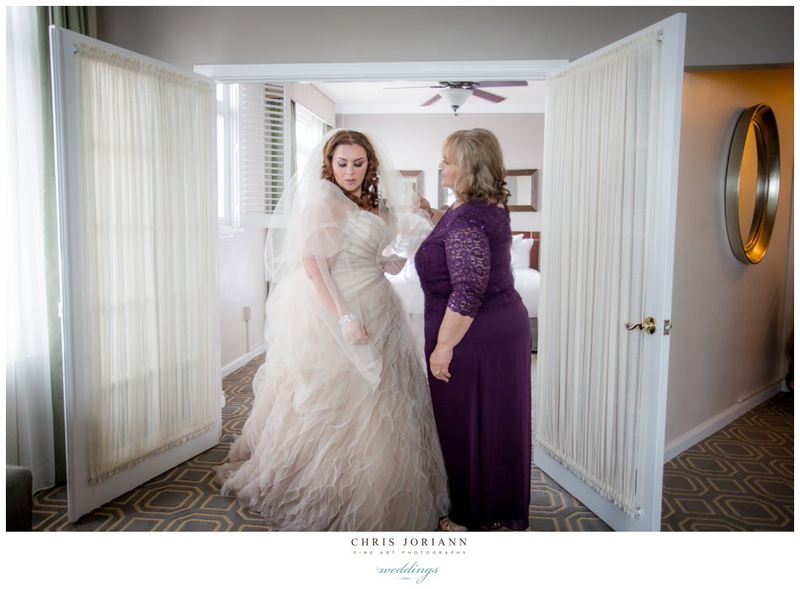 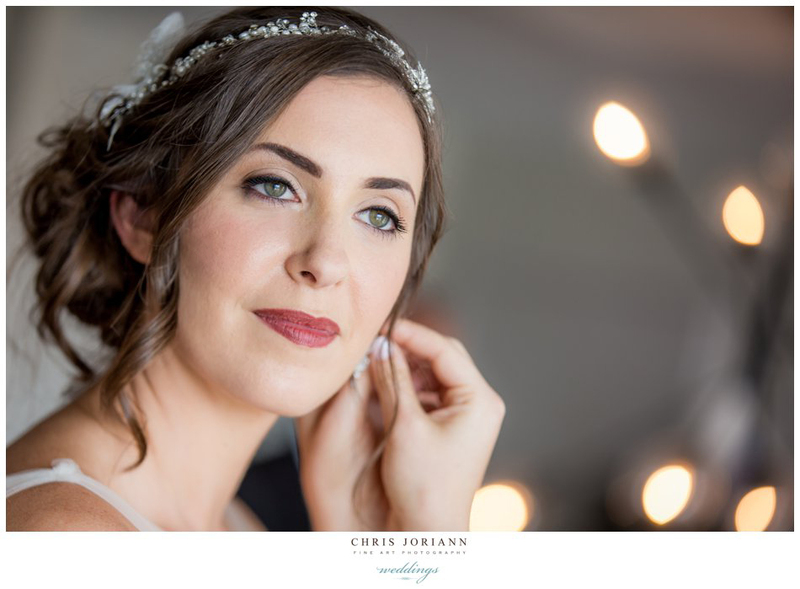 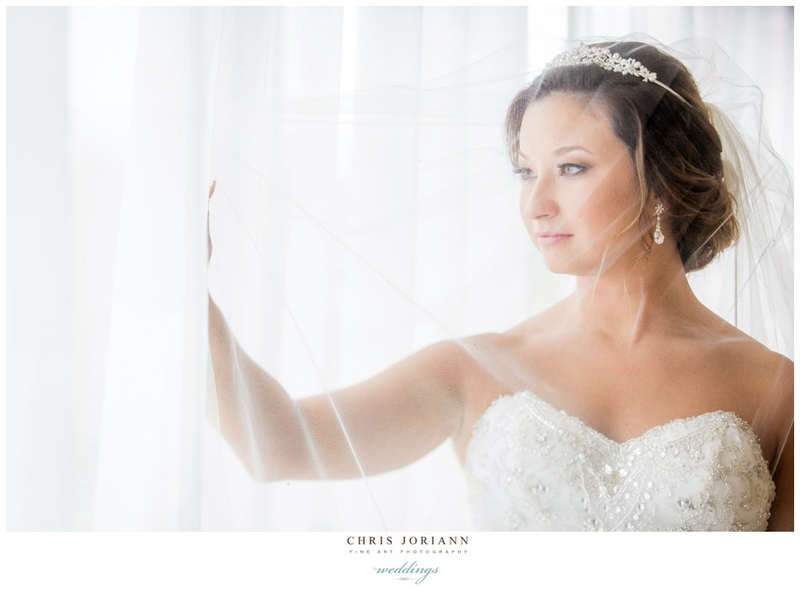 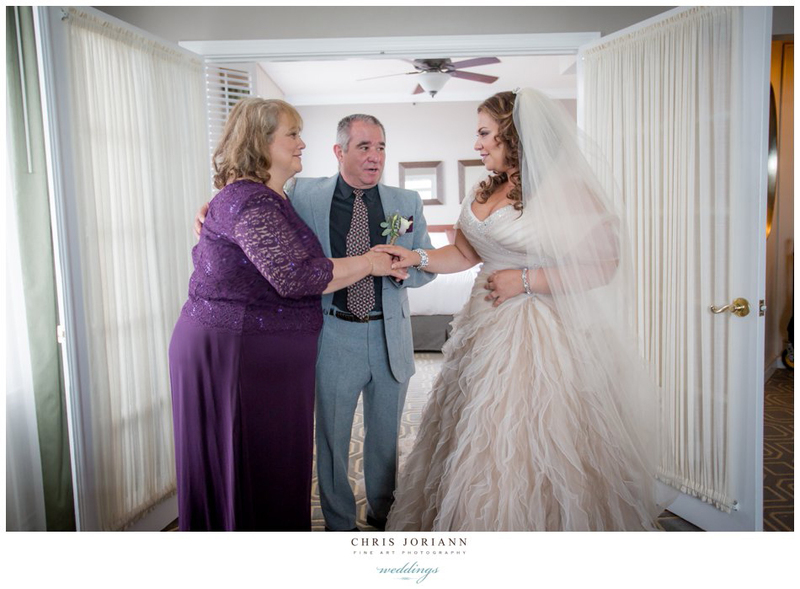 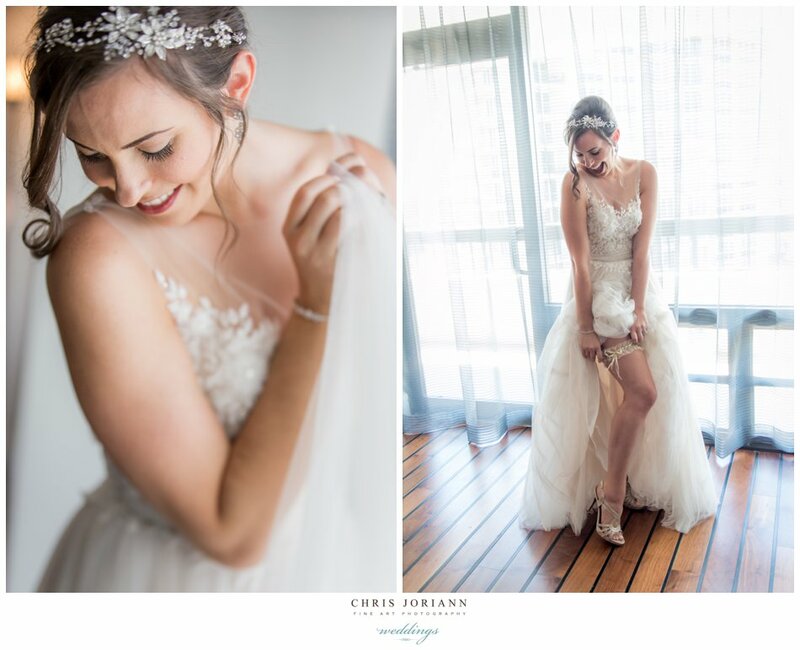 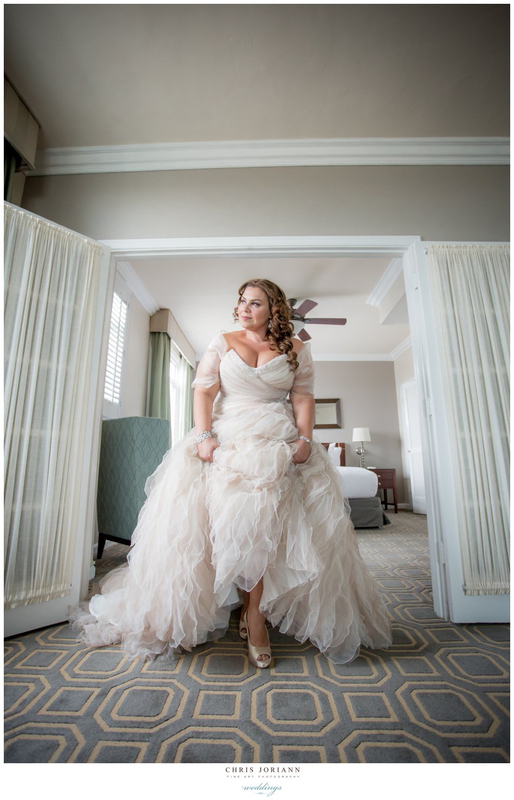 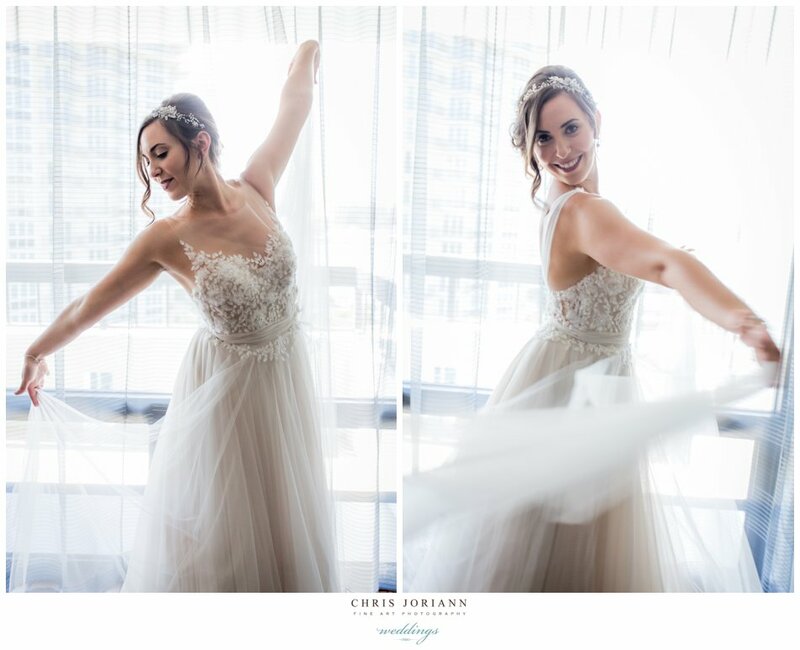 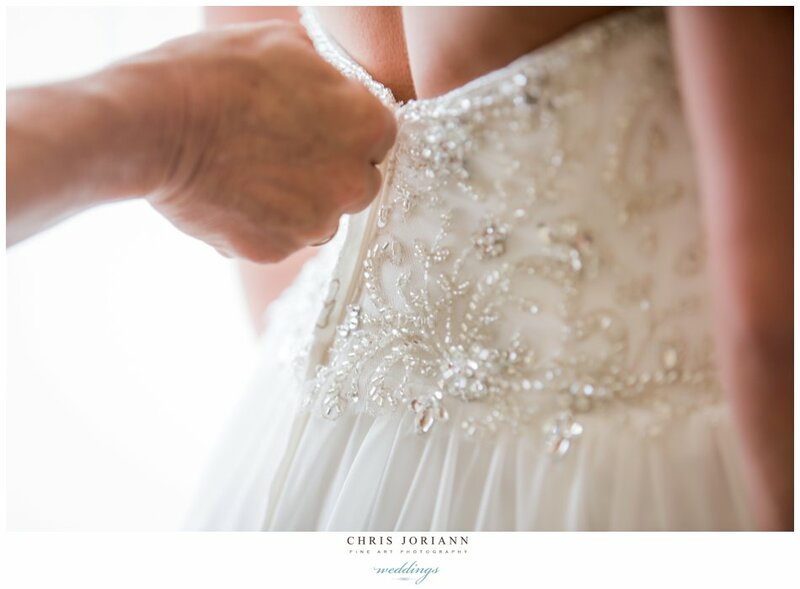 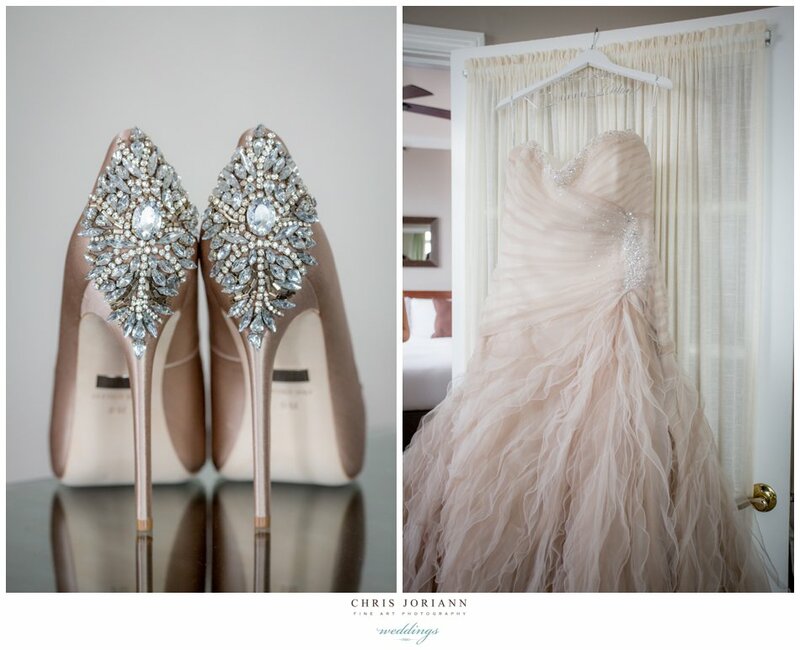 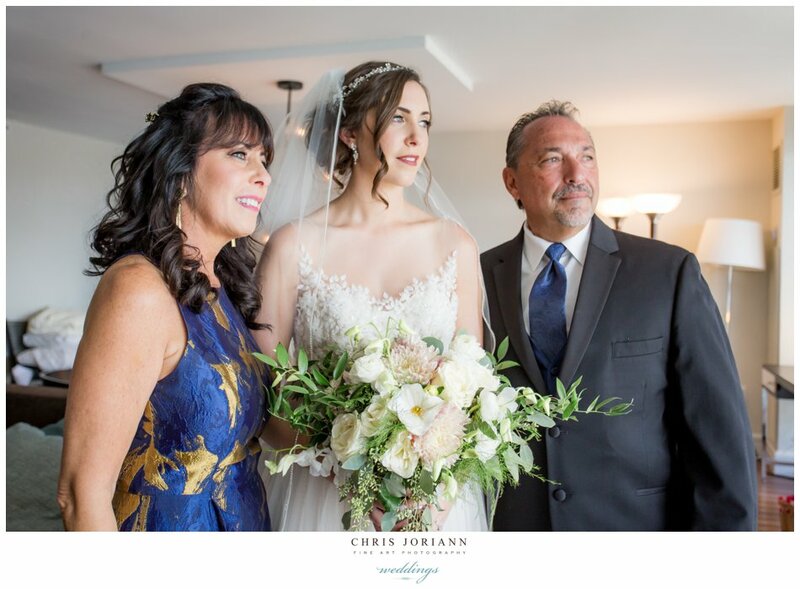 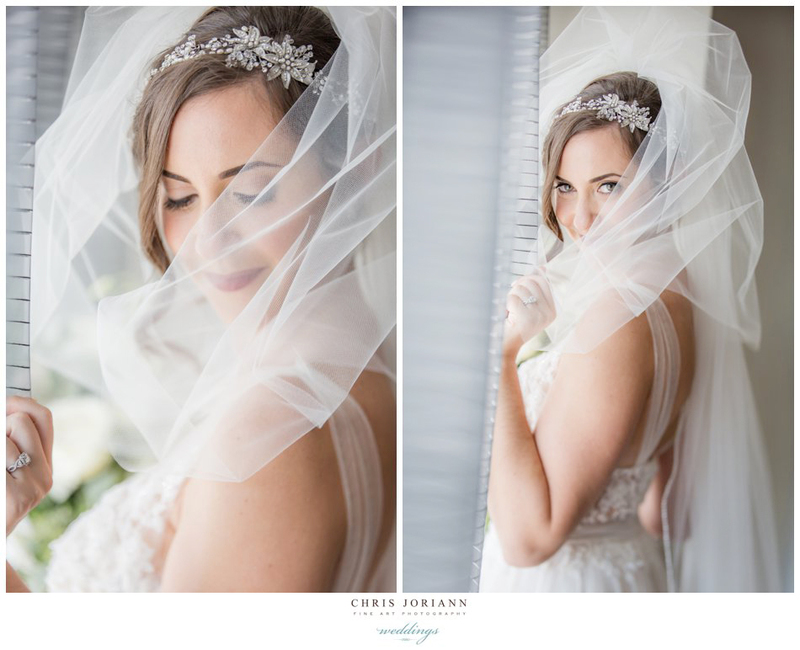 Dressed in Sophia Tolli Couture with layers of mocha tulle, and matching Badgley Mischka’s with a to-die-for jeweled heel… she was just breathtaking. 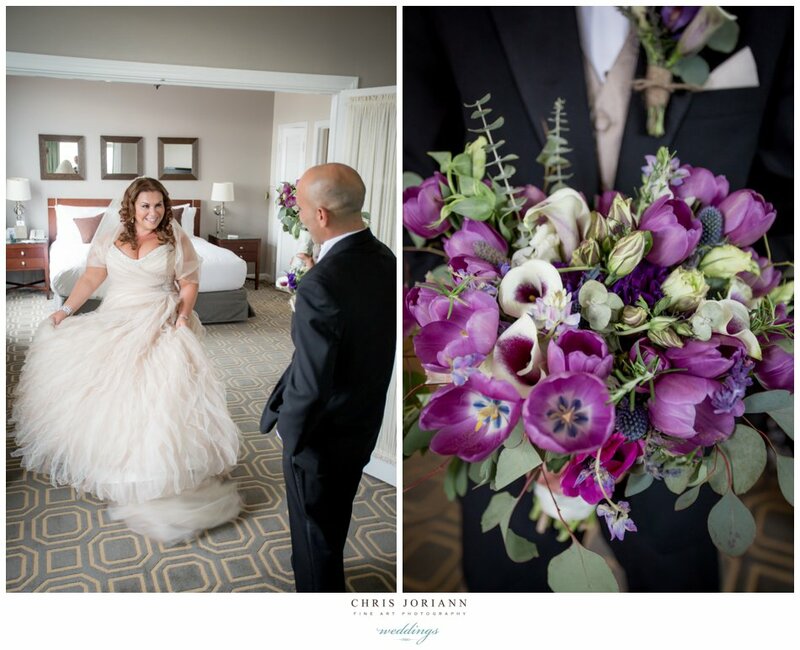 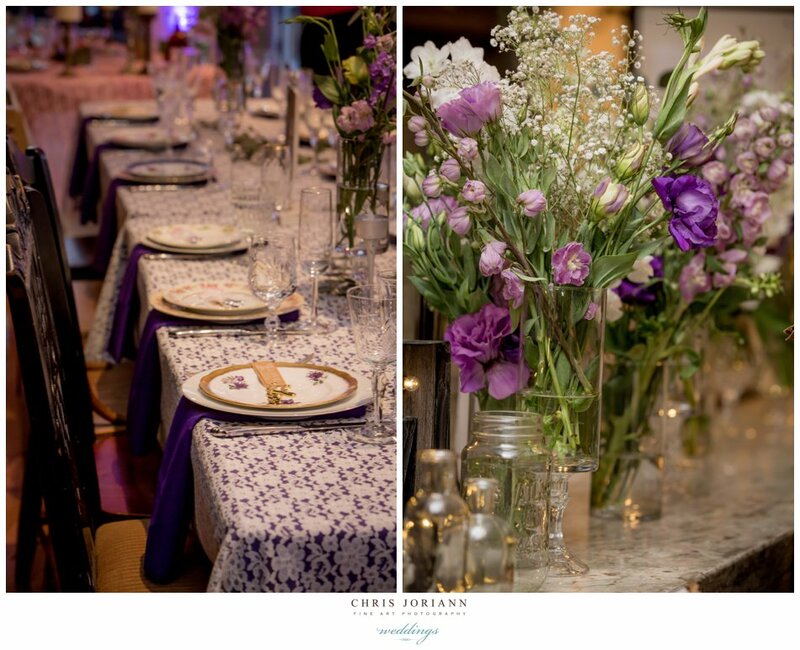 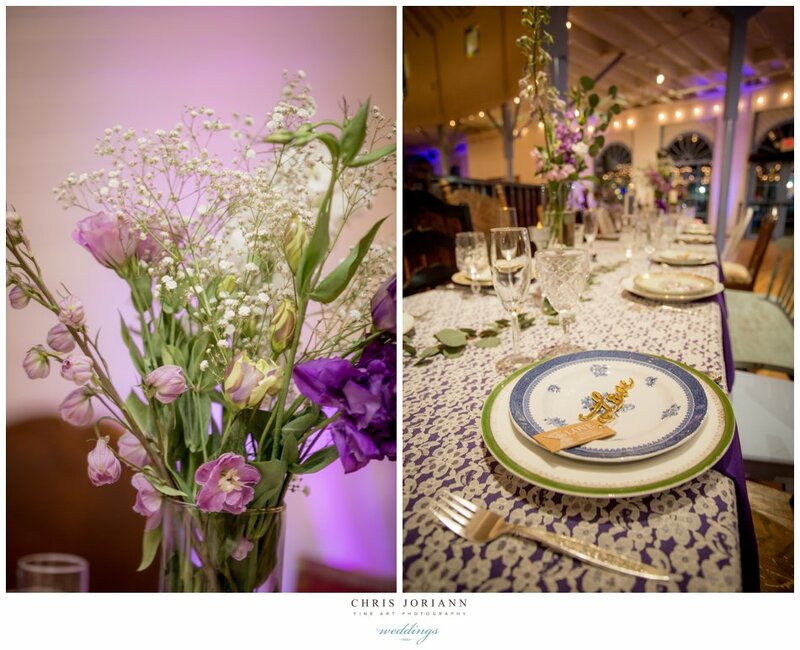 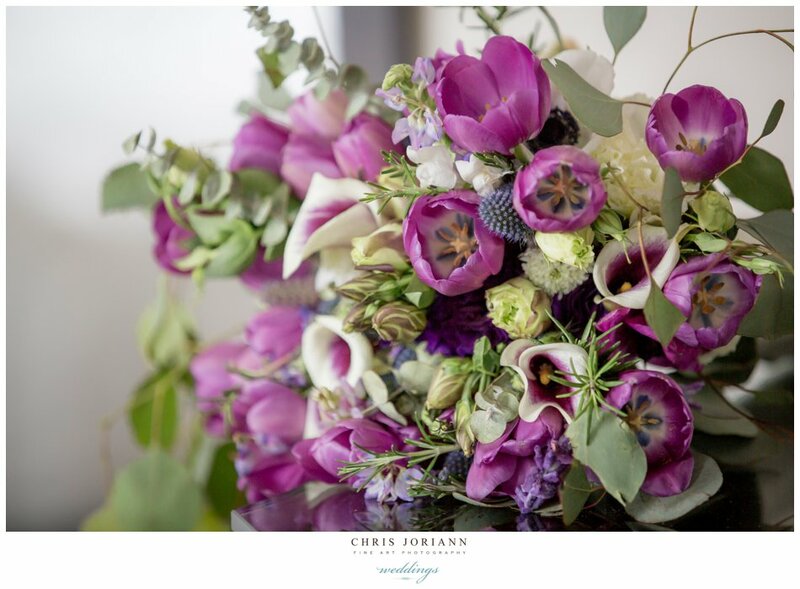 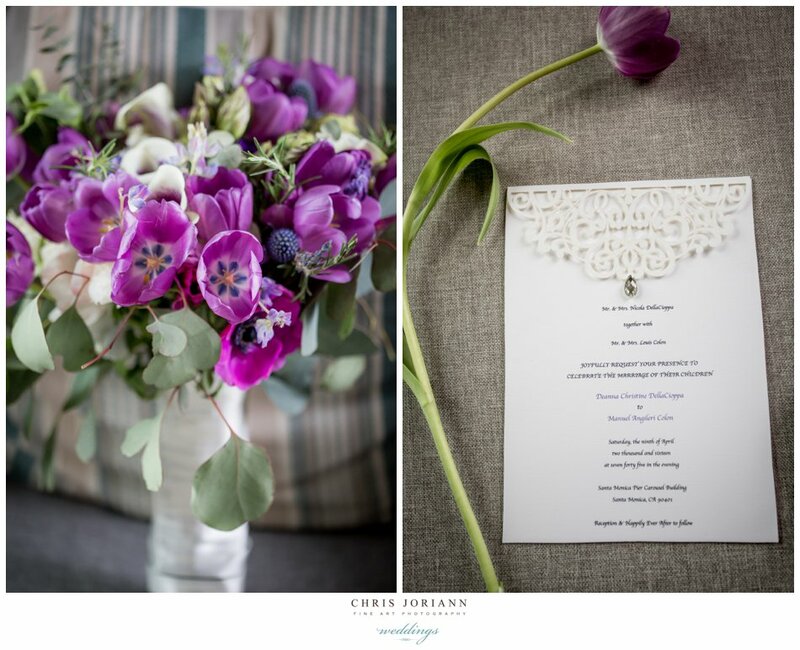 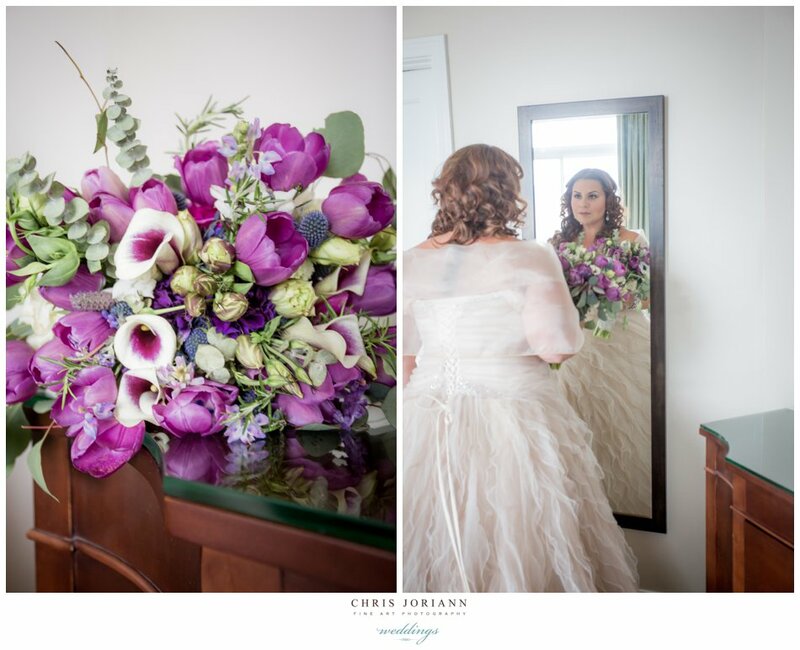 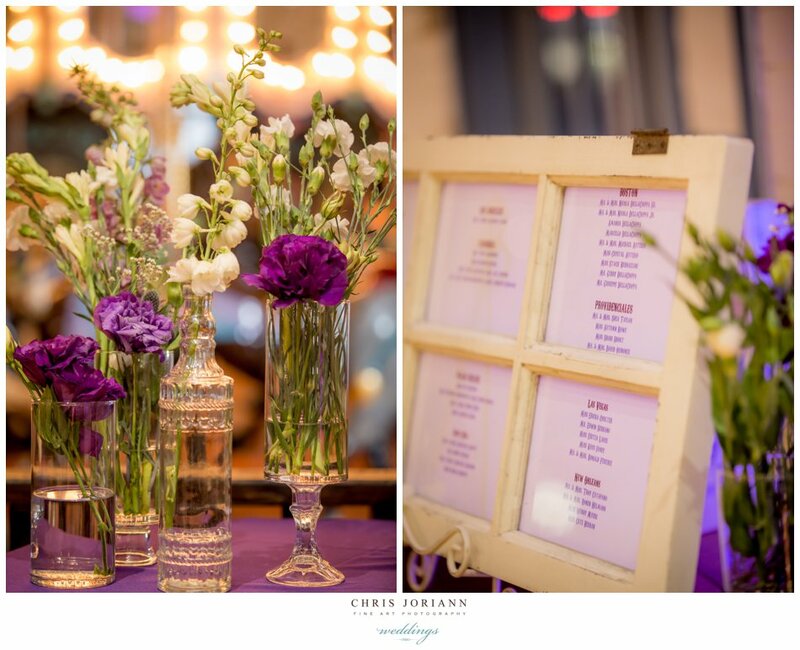 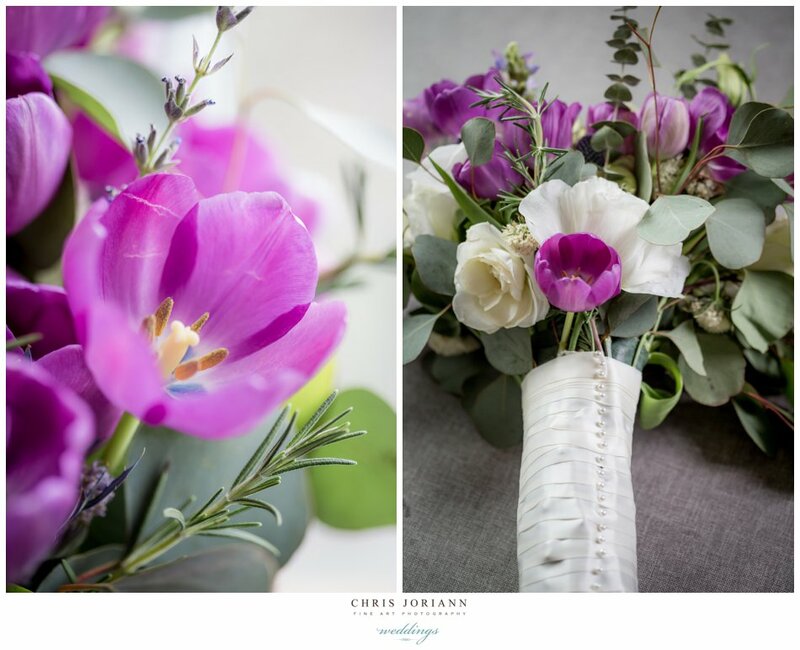 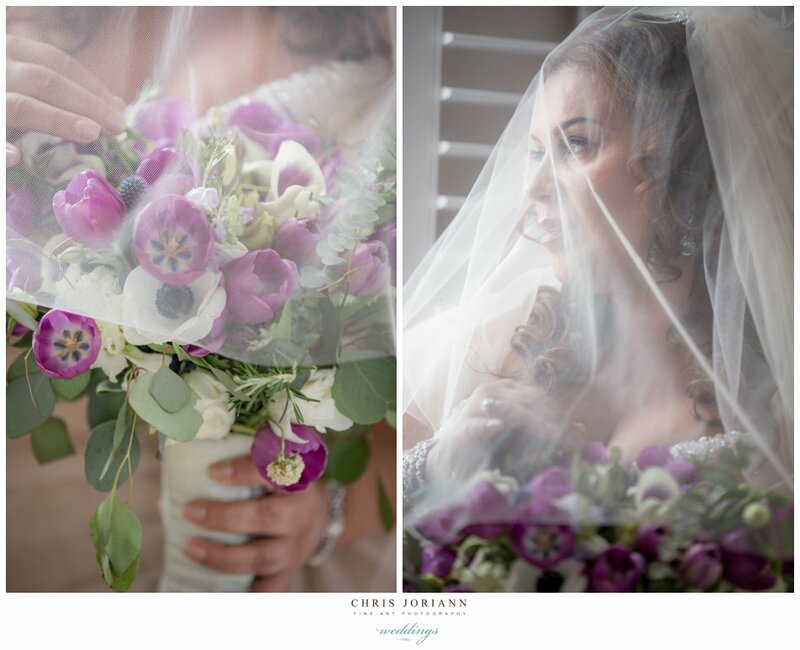 Florals + bouquets of tulips, calla lilies and wildflowers, by Burlap + Rose matched the plum/lavender palette perfectly. 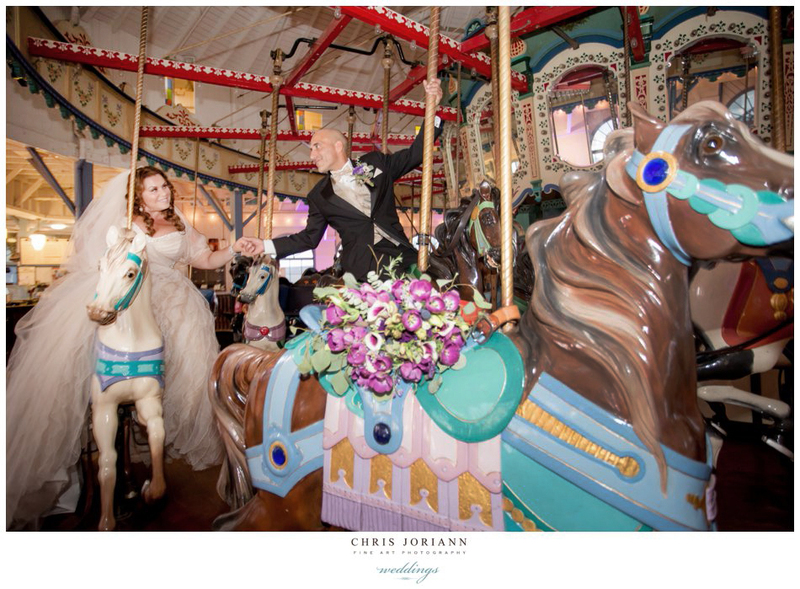 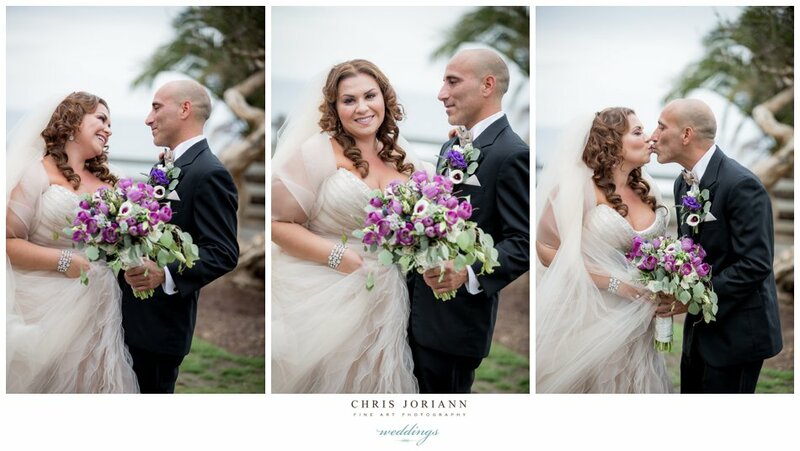 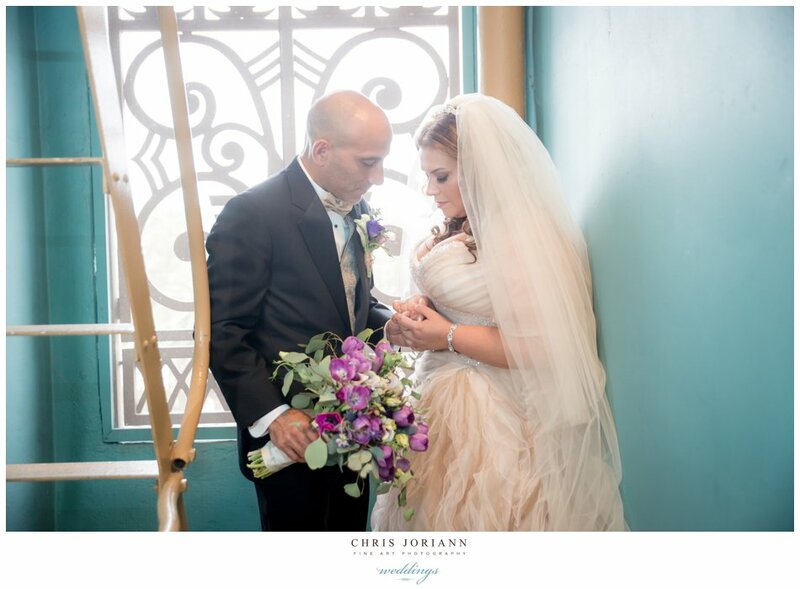 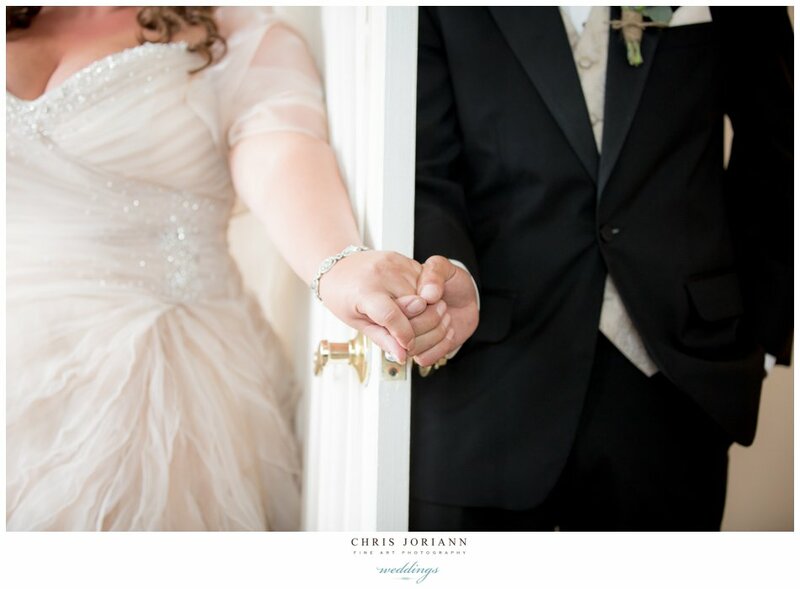 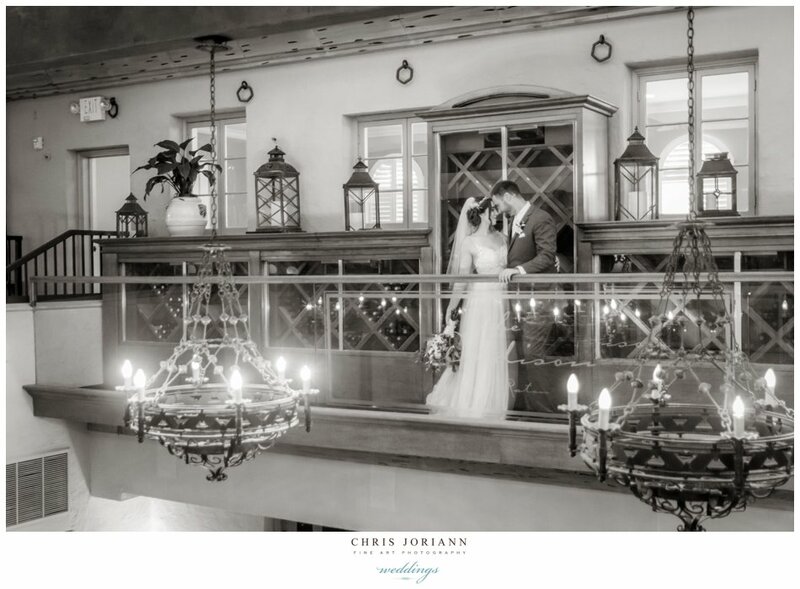 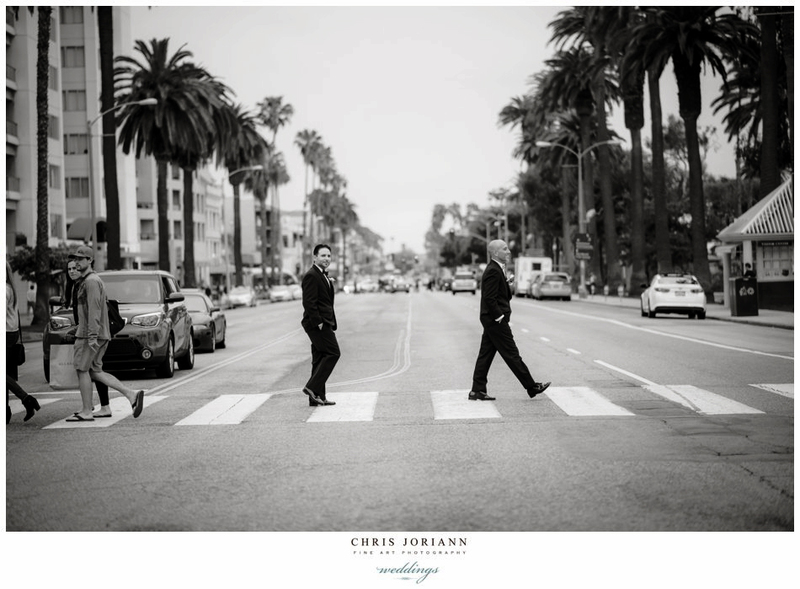 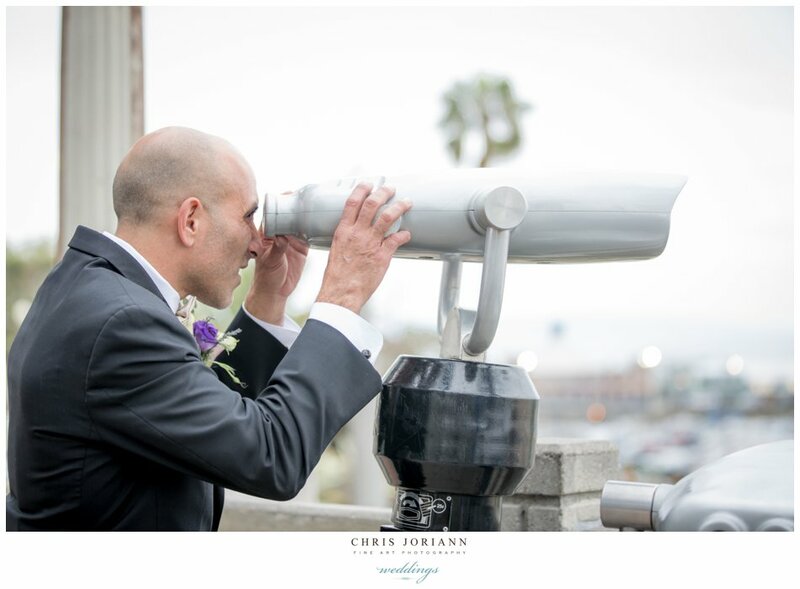 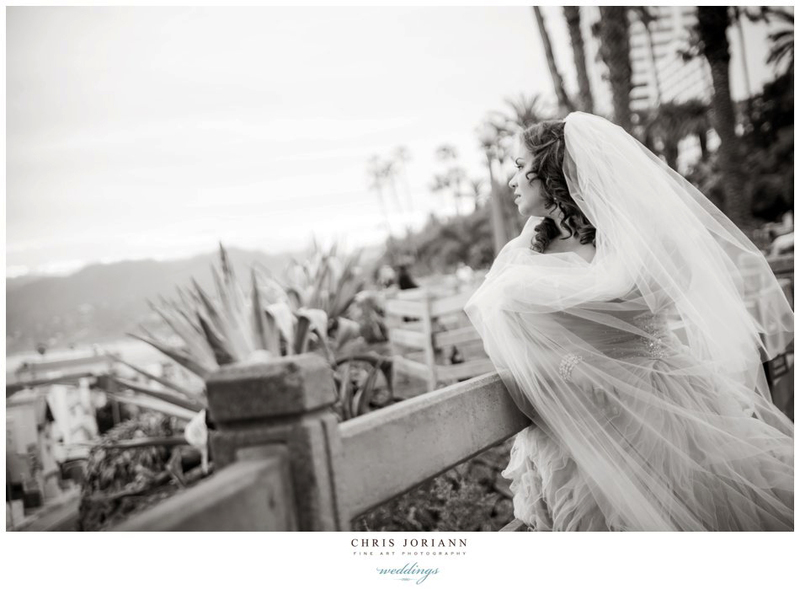 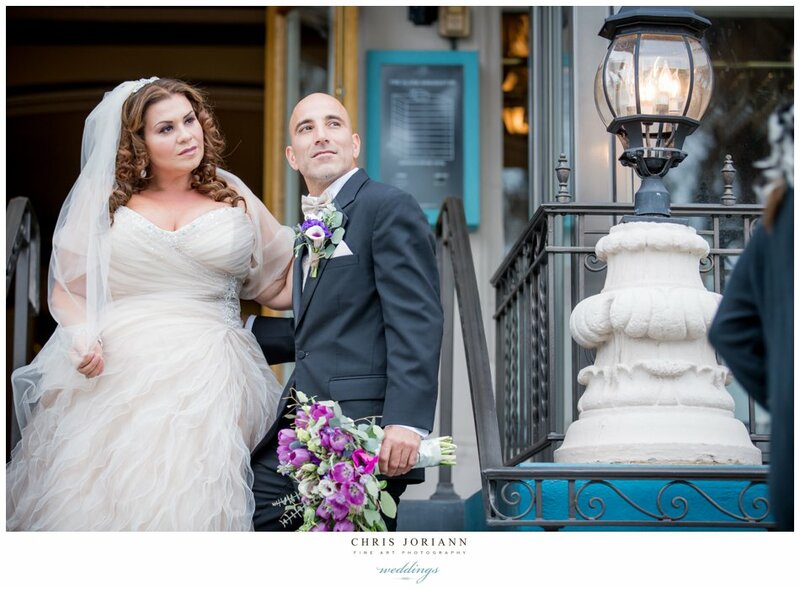 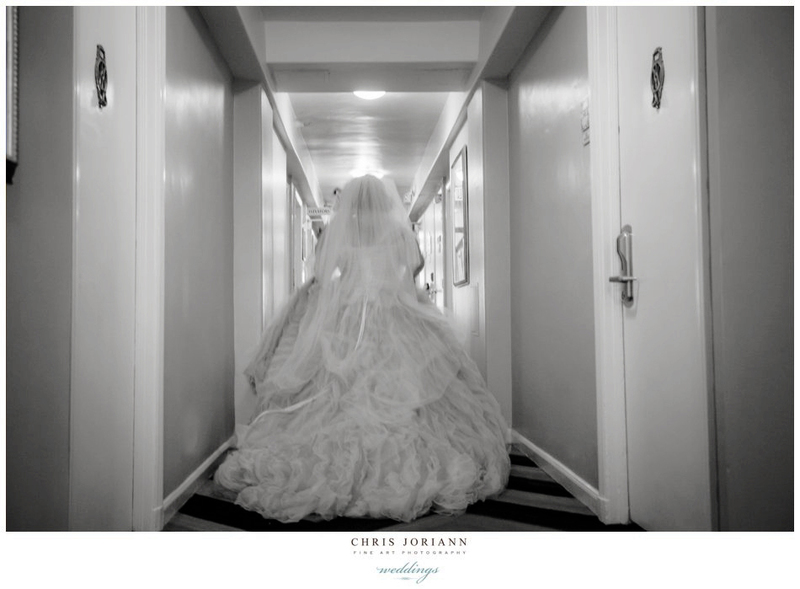 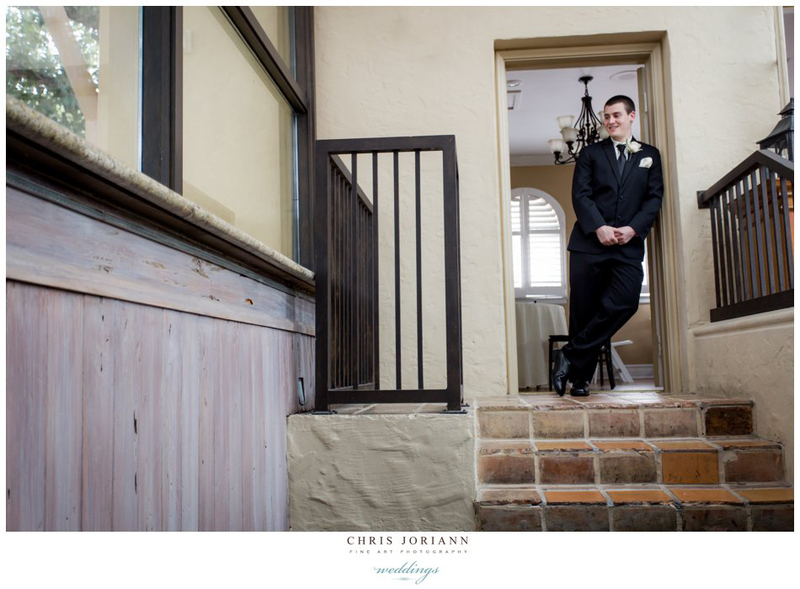 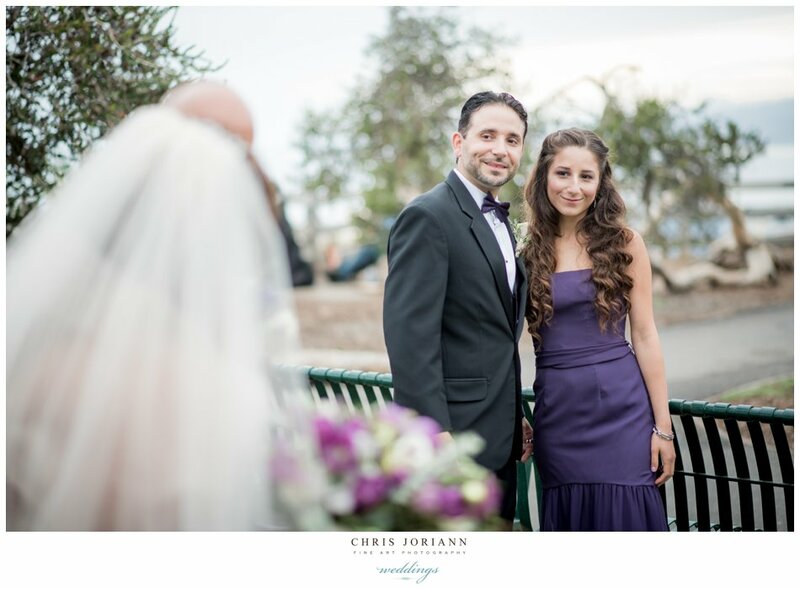 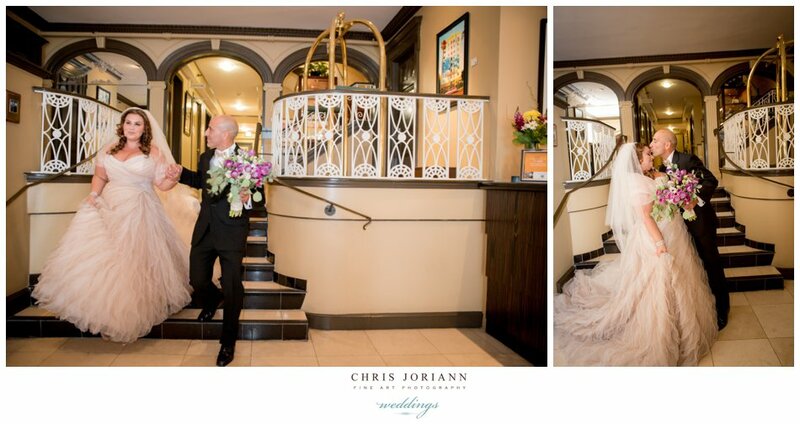 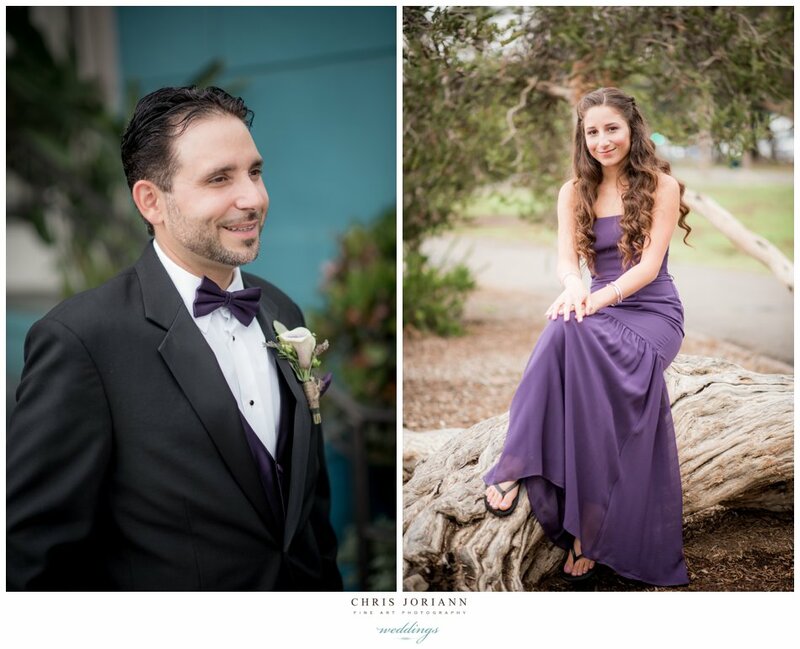 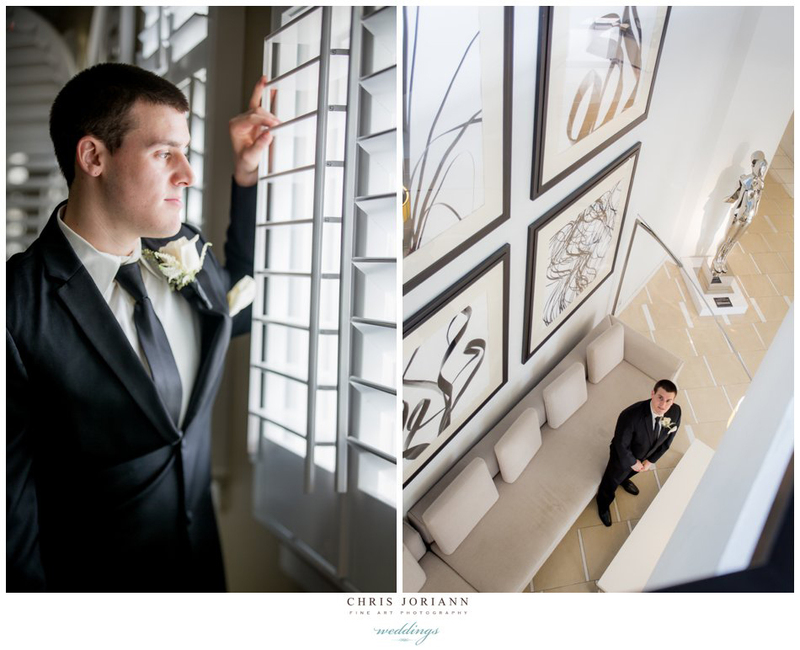 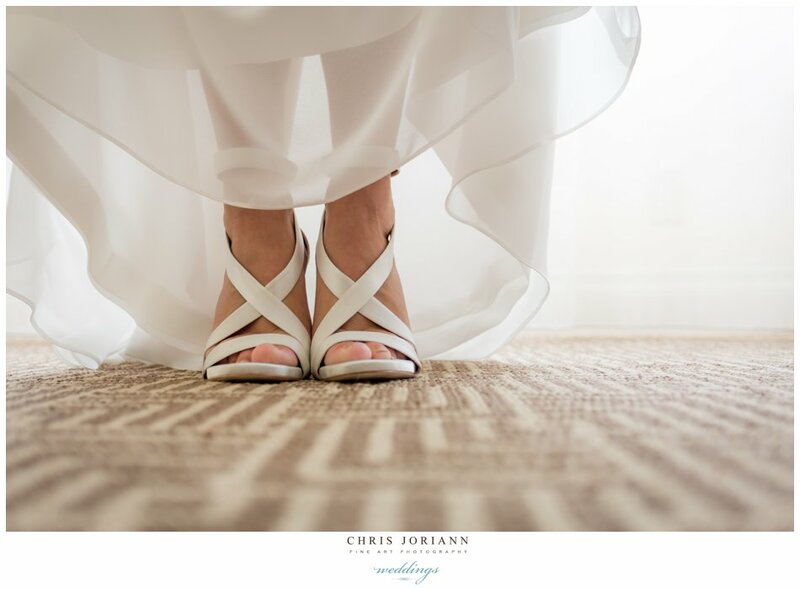 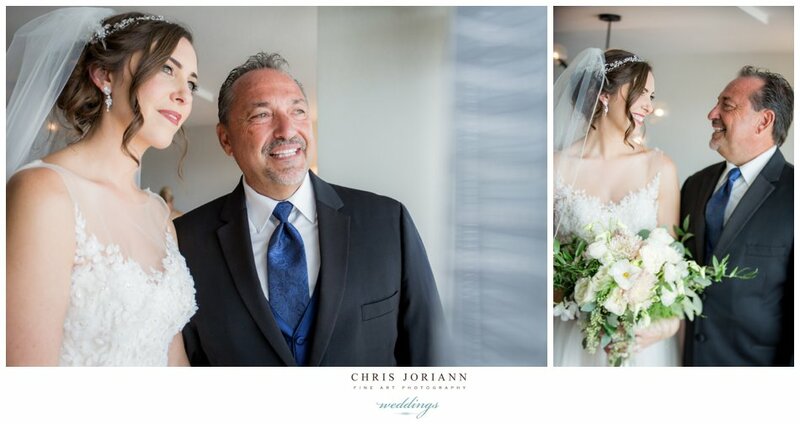 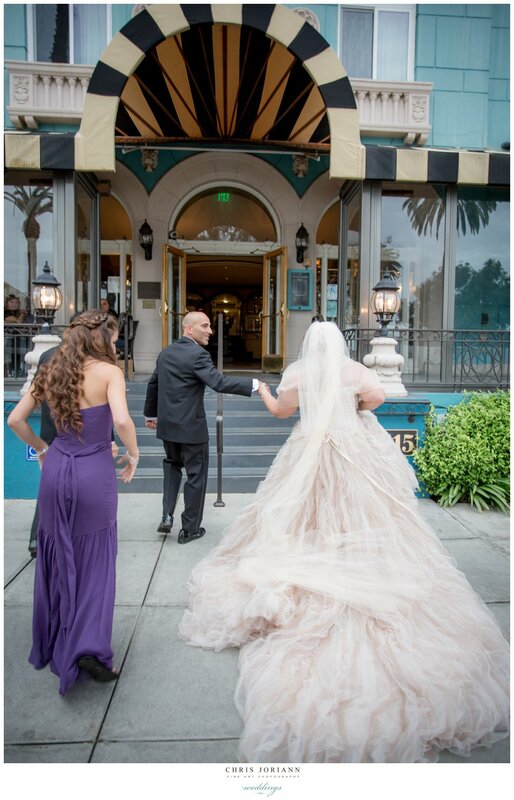 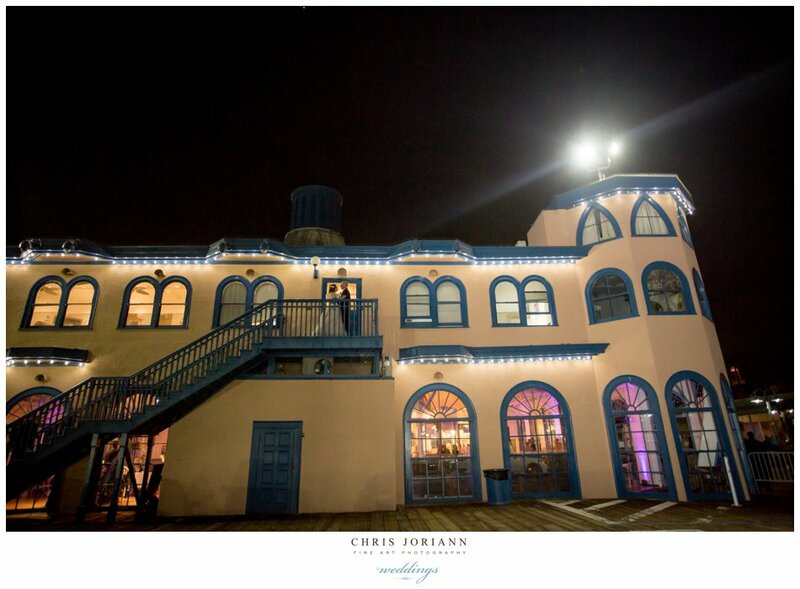 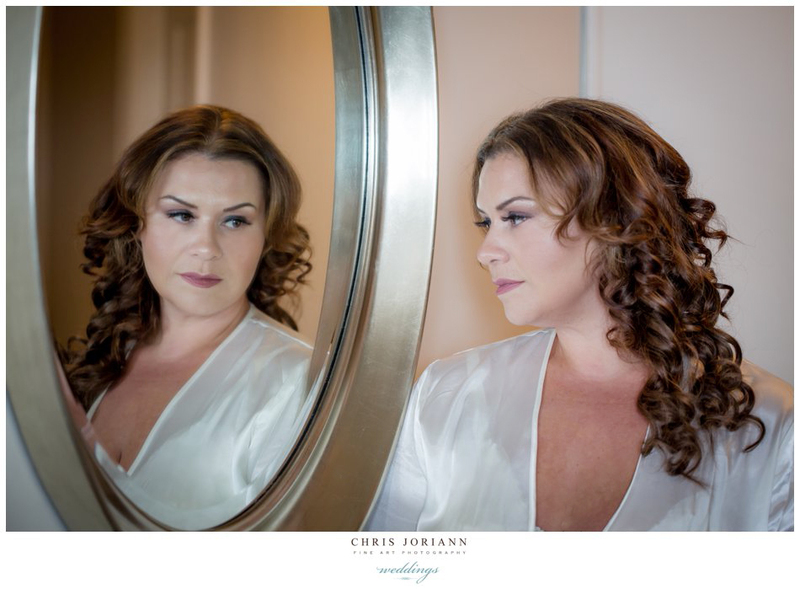 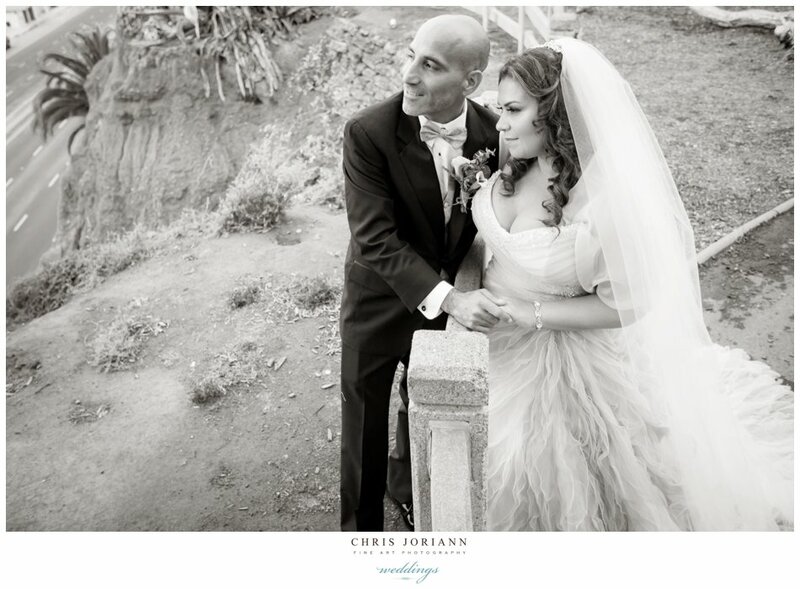 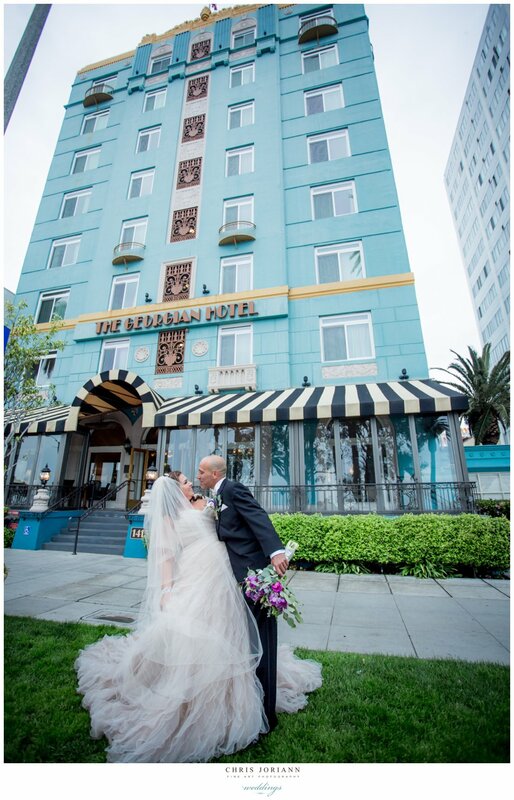 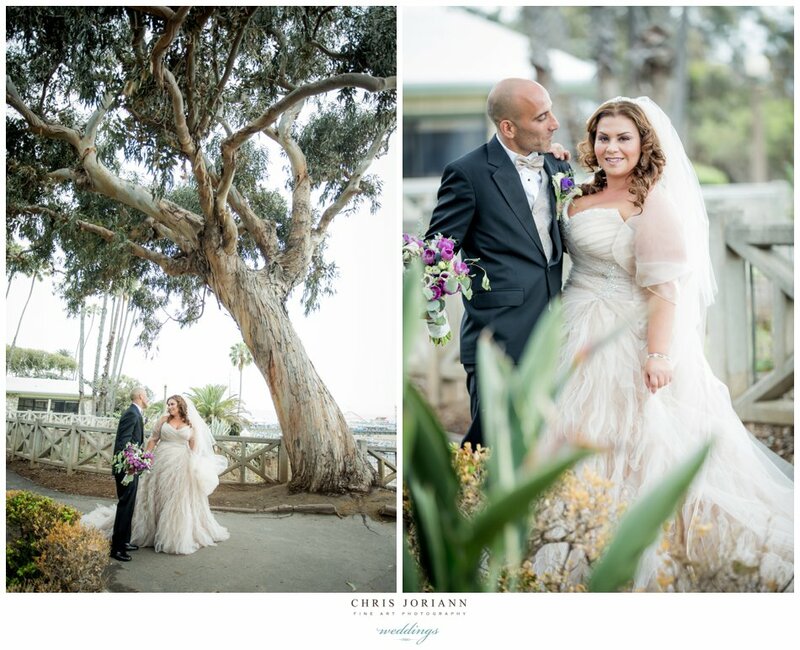 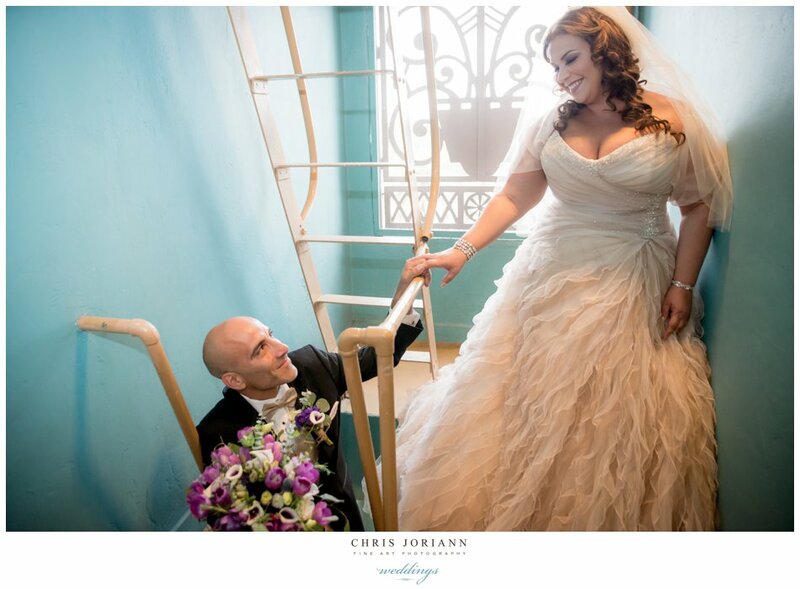 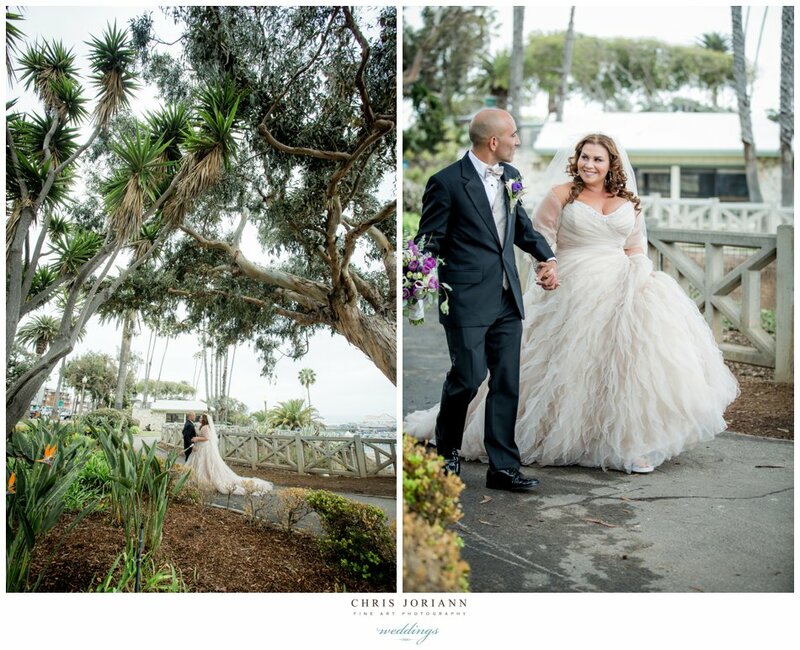 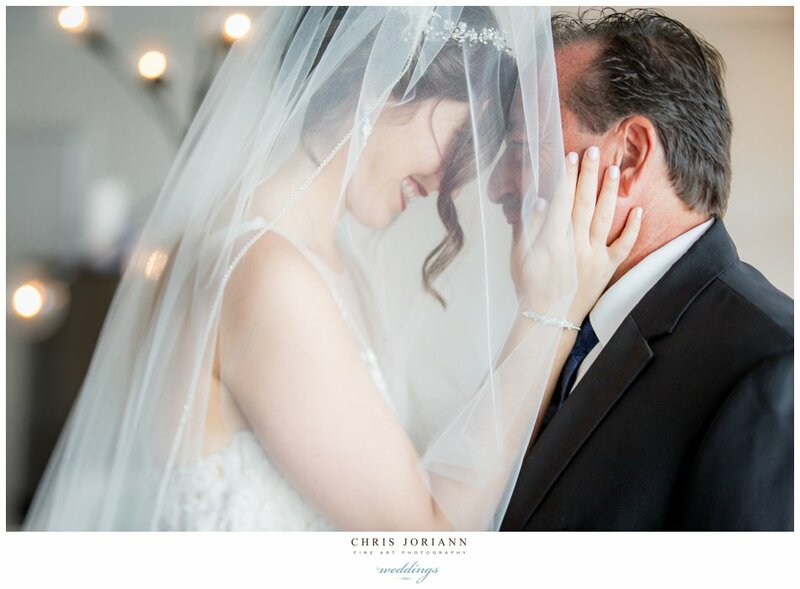 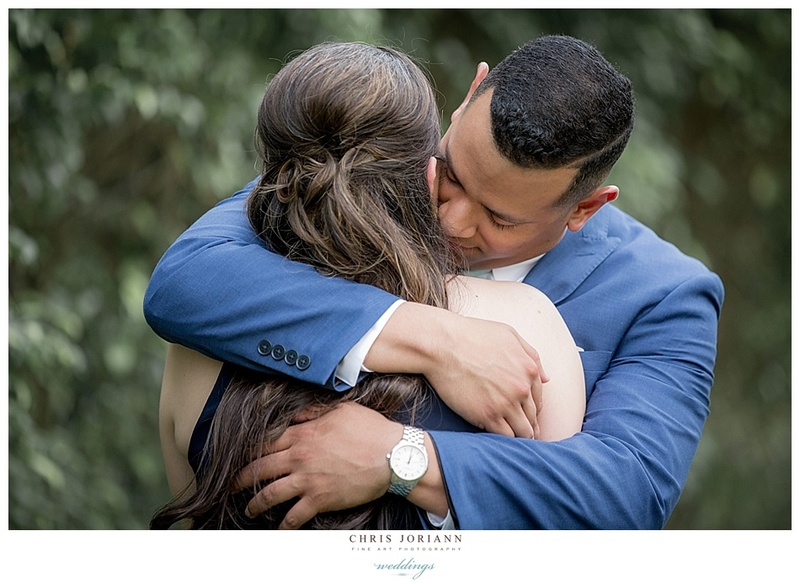 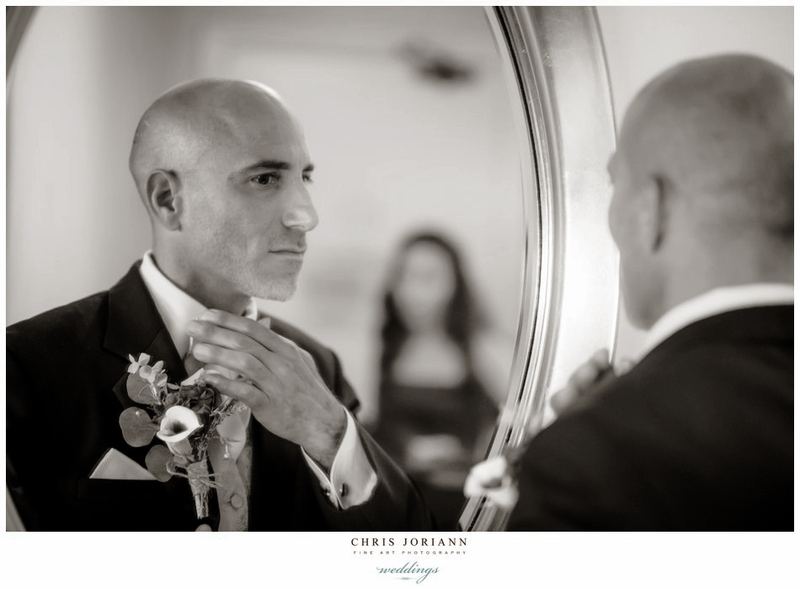 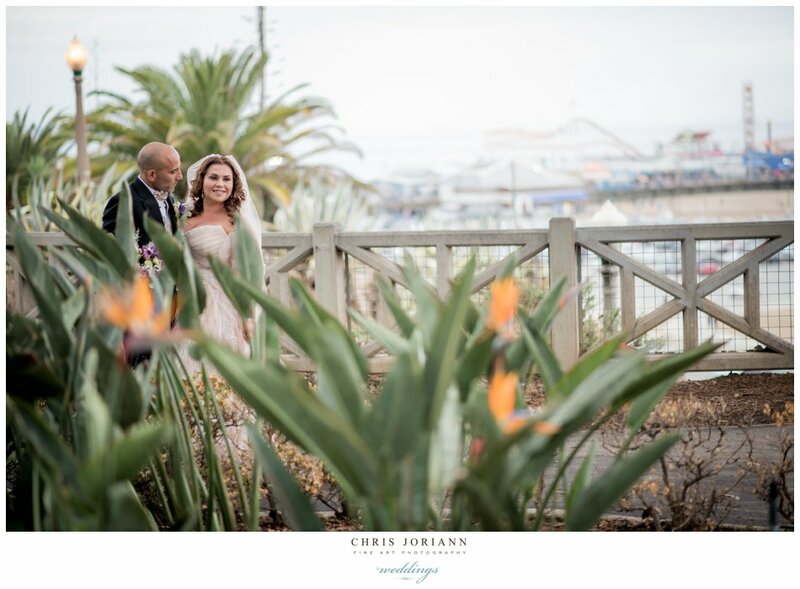 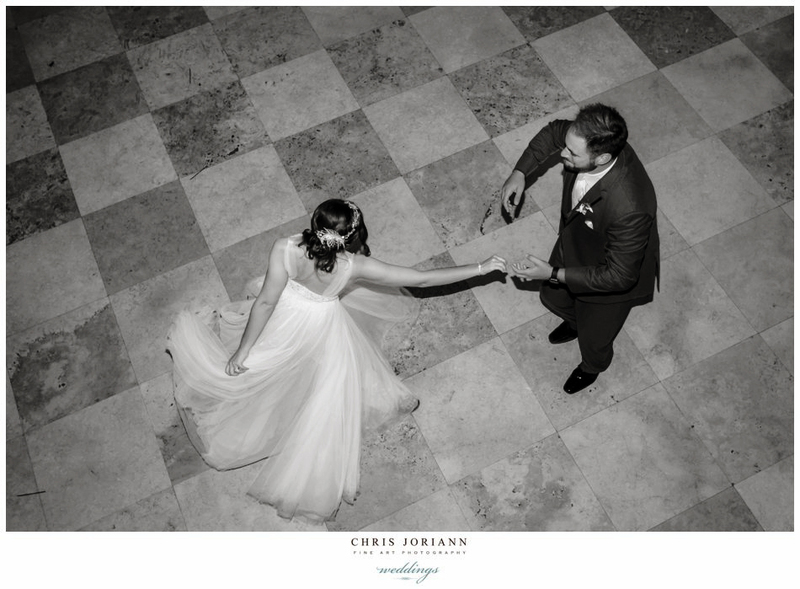 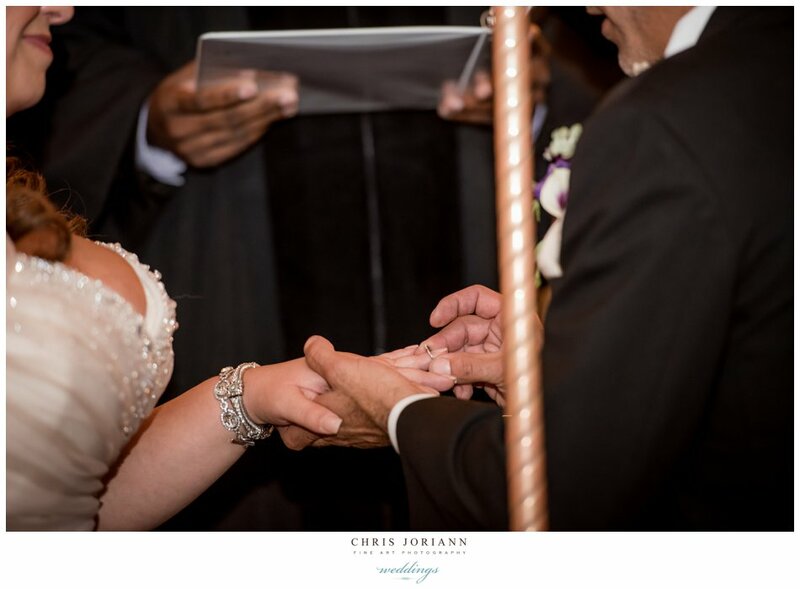 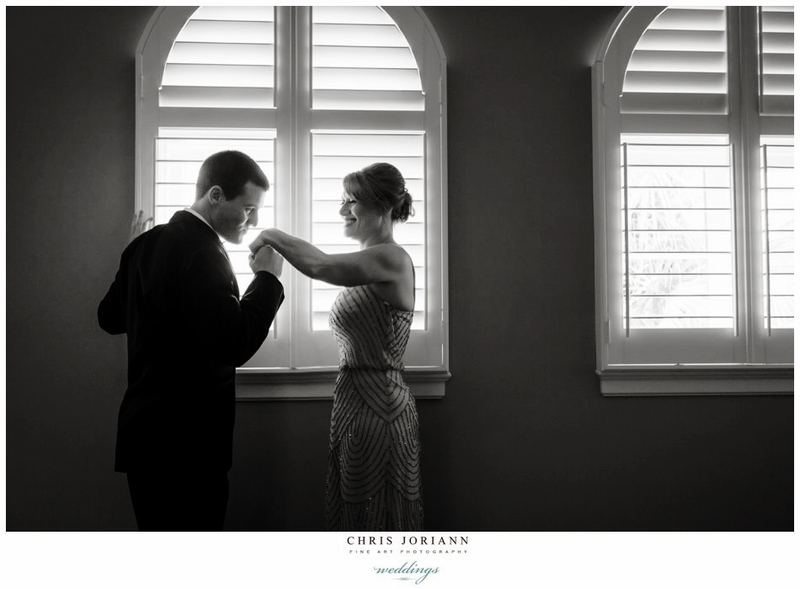 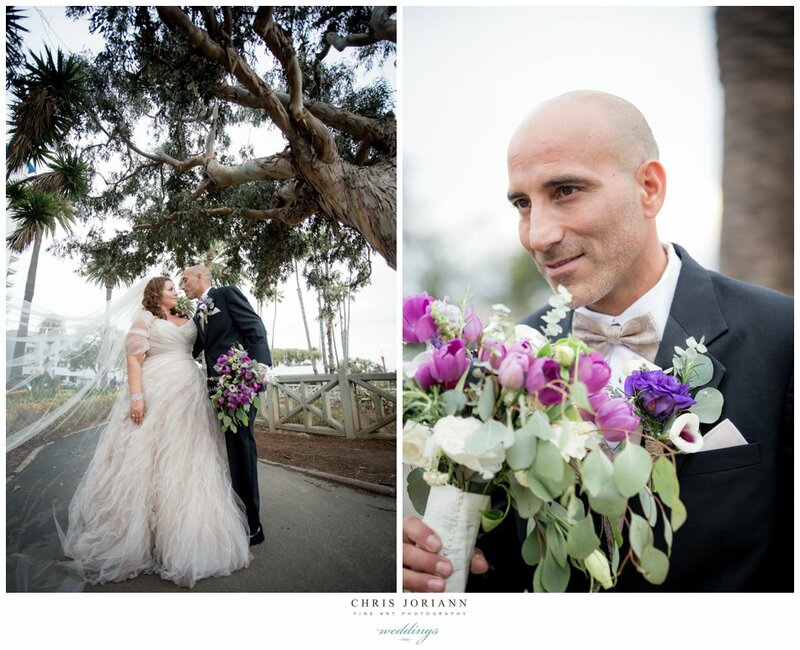 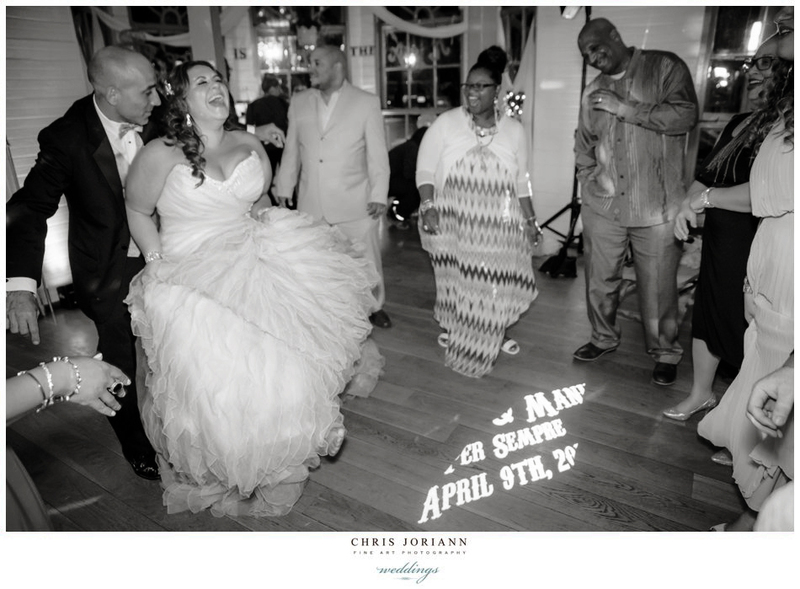 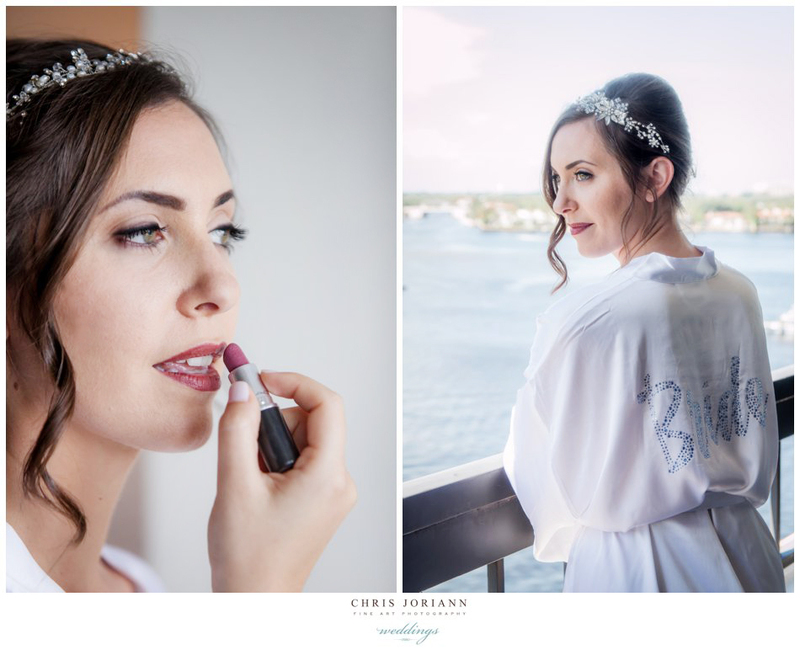 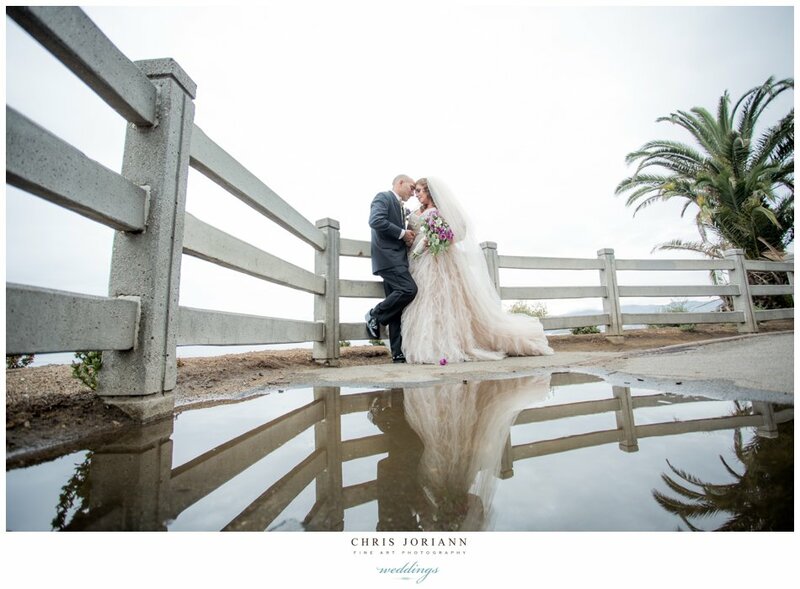 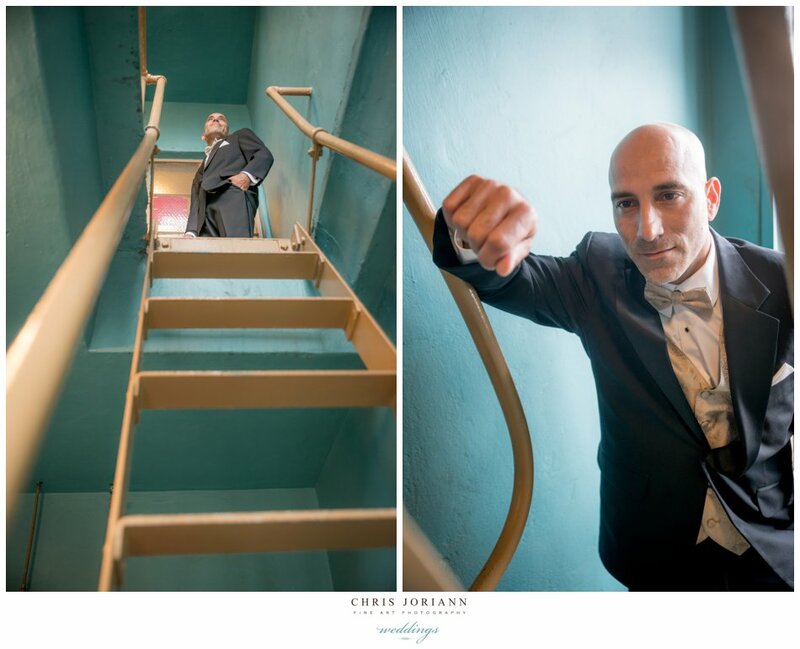 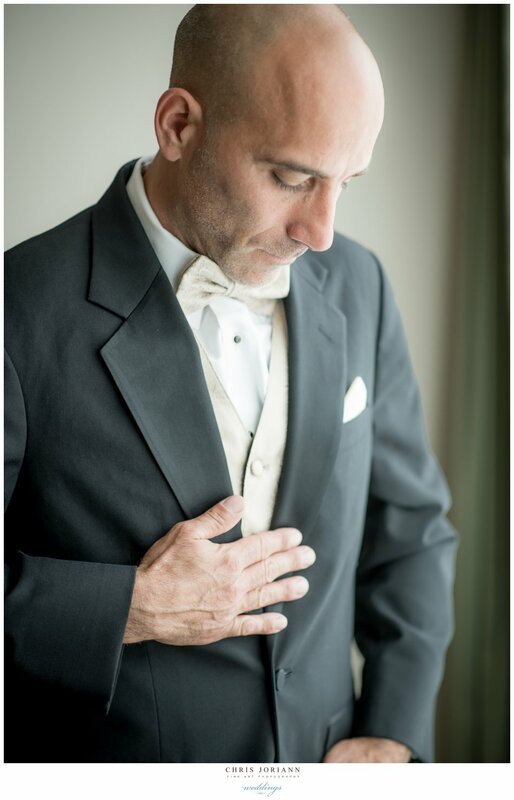 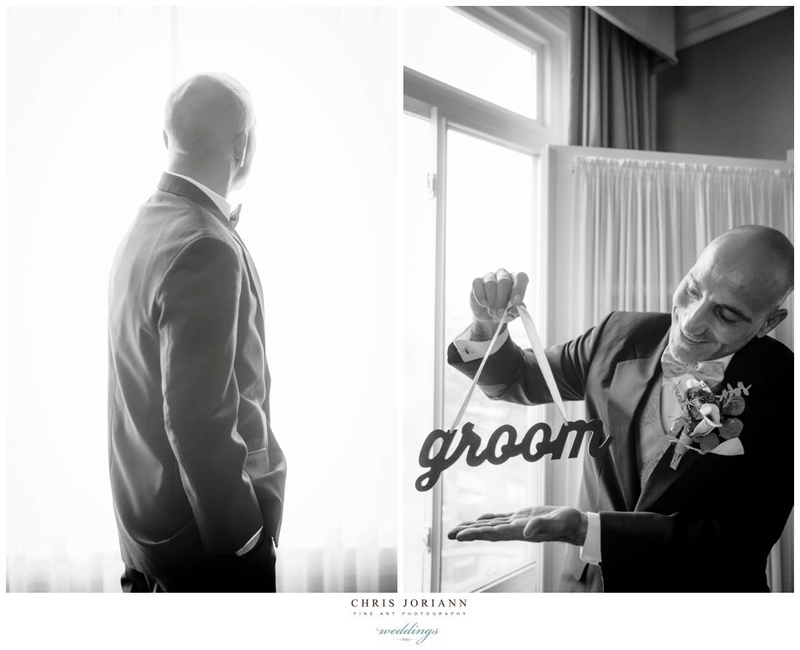 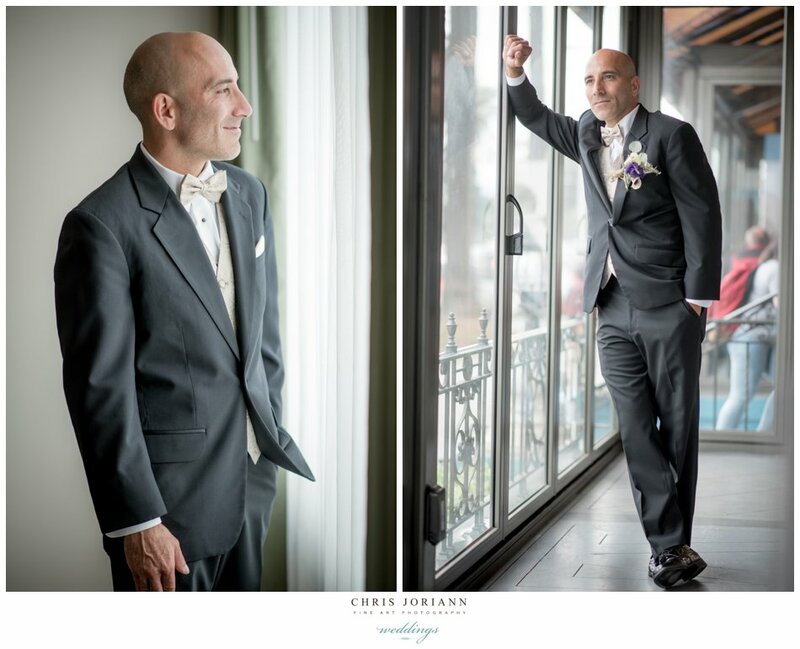 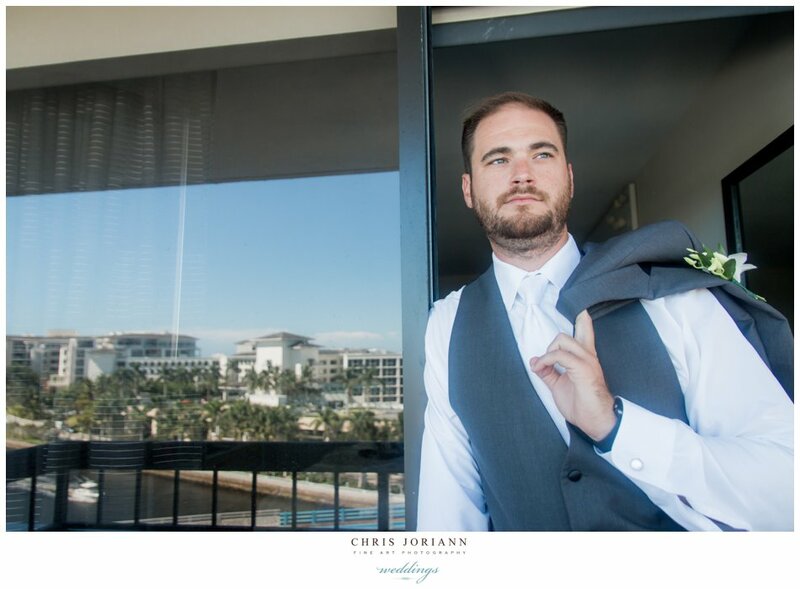 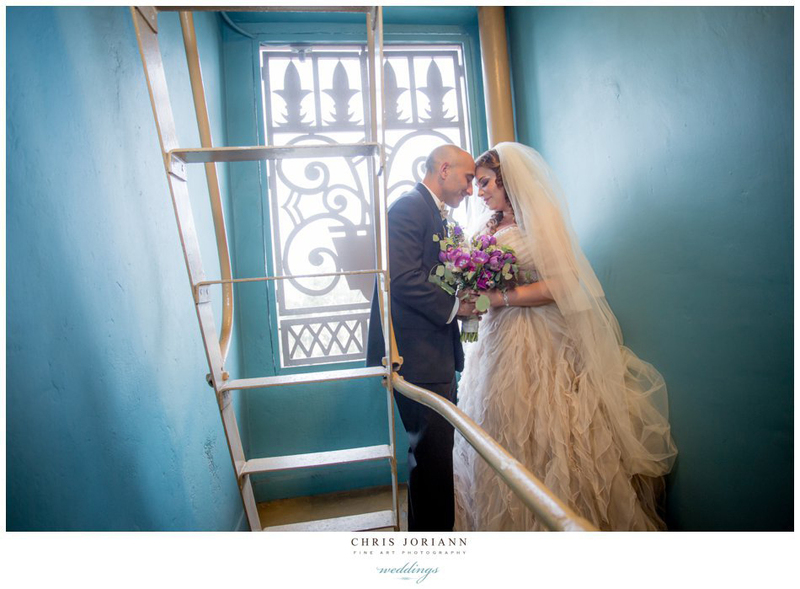 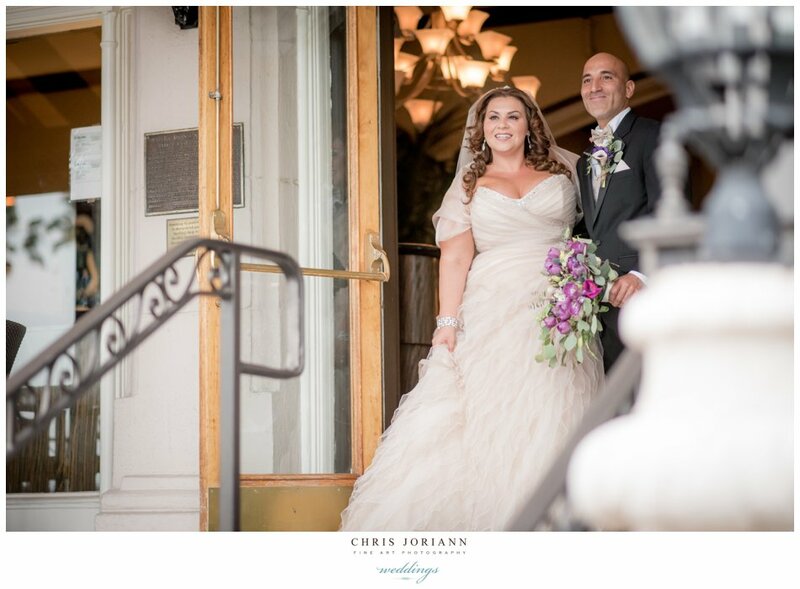 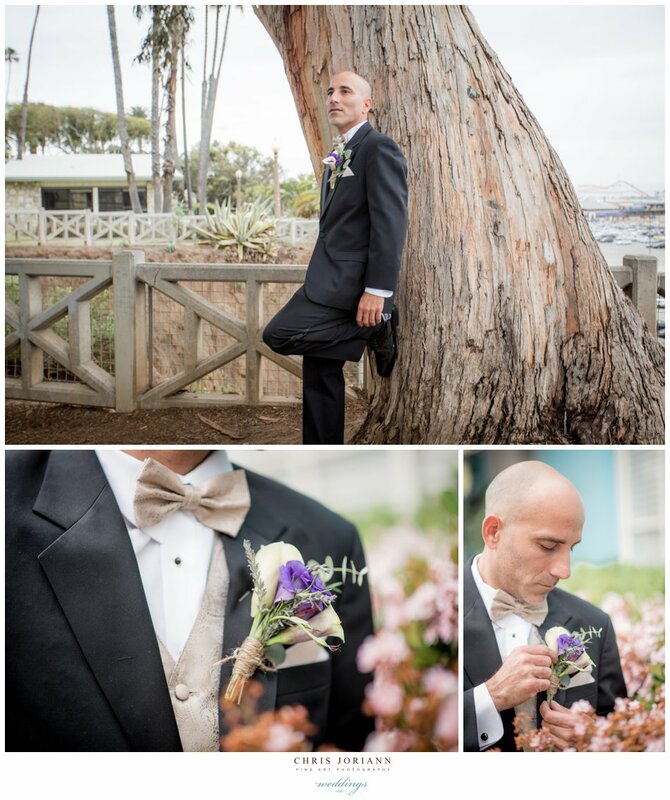 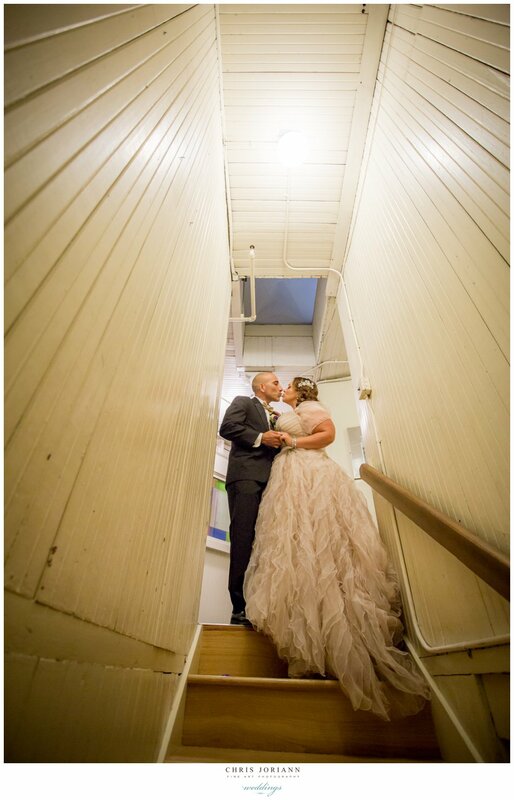 Following a romantic behind the door first look, the couple nuzzled on the art deco veranda, then dodged the raindrops for portraits at Palisades Park overlooking the Pacific, before heading to the Carousel + Loof Hippodrome just after sunset. 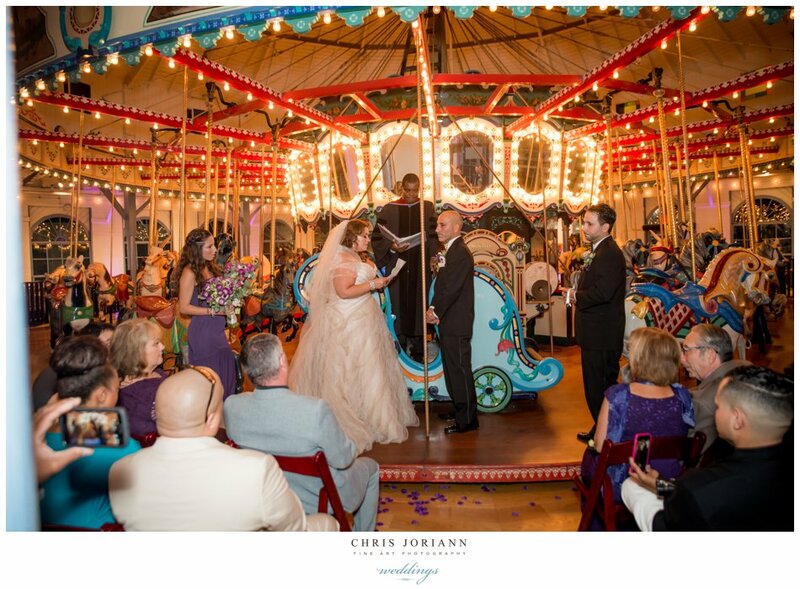 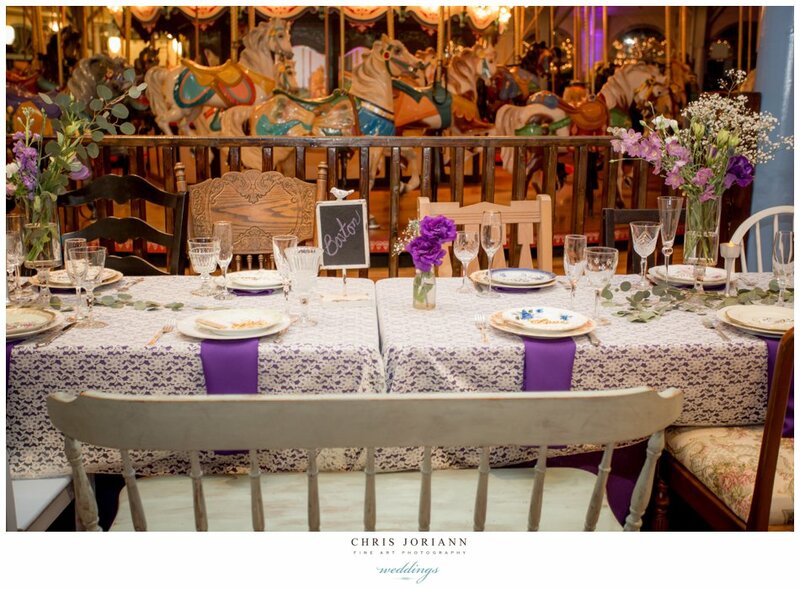 They exchanged tear-jerking vows before family and friends at the historic landmark, followed by a group ride on the antique horses by all attendees. 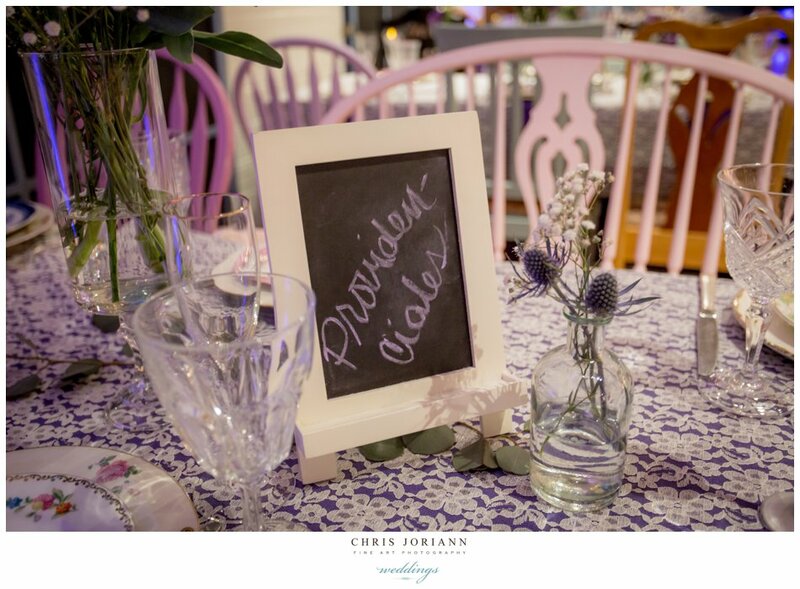 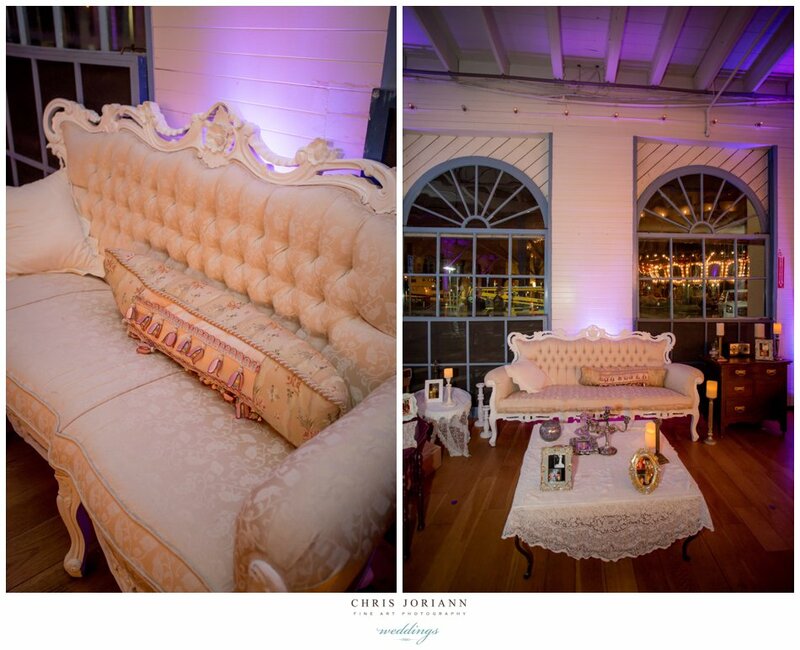 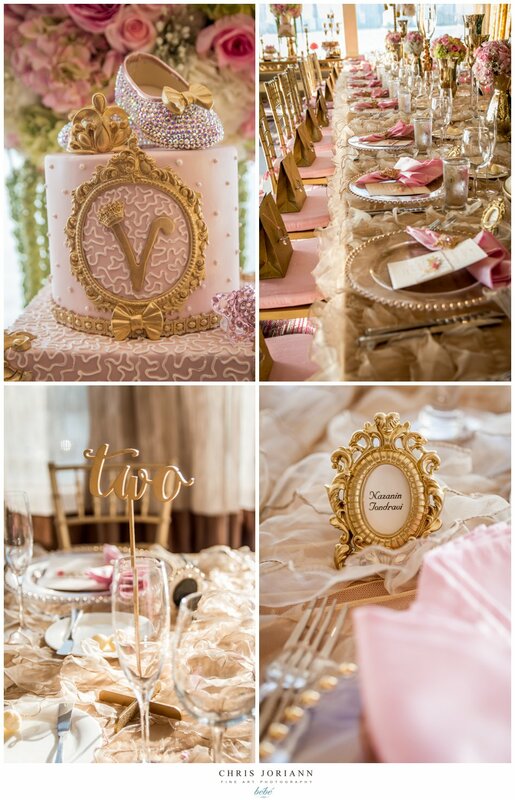 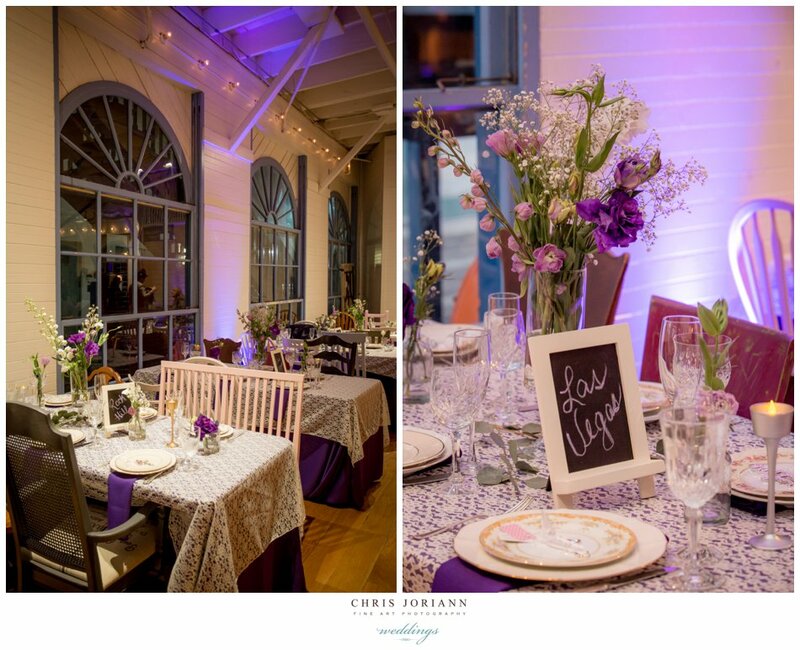 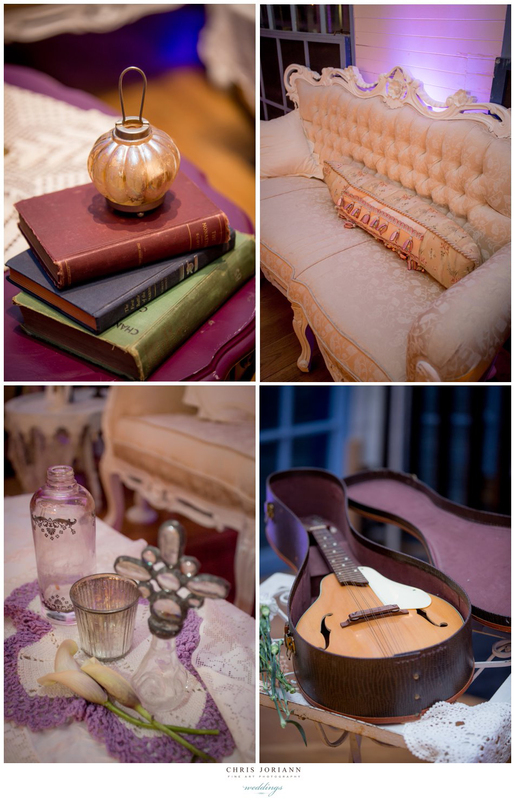 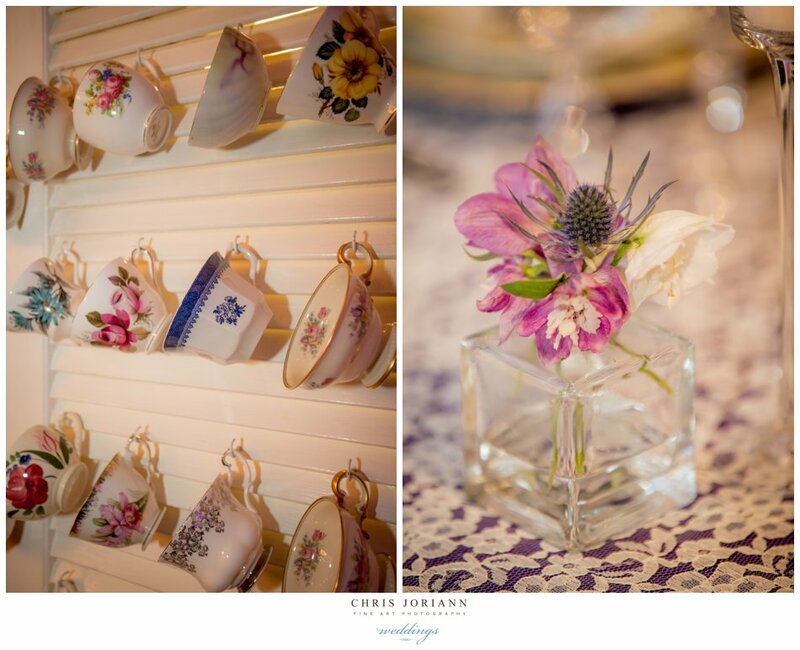 Coordinated by Jennifer Toth Clary, the reception space was transformed into a vintage parlor, with antique furniture, lace table coverings, and fine vintage china by Bella Vita Vintage Rentals. 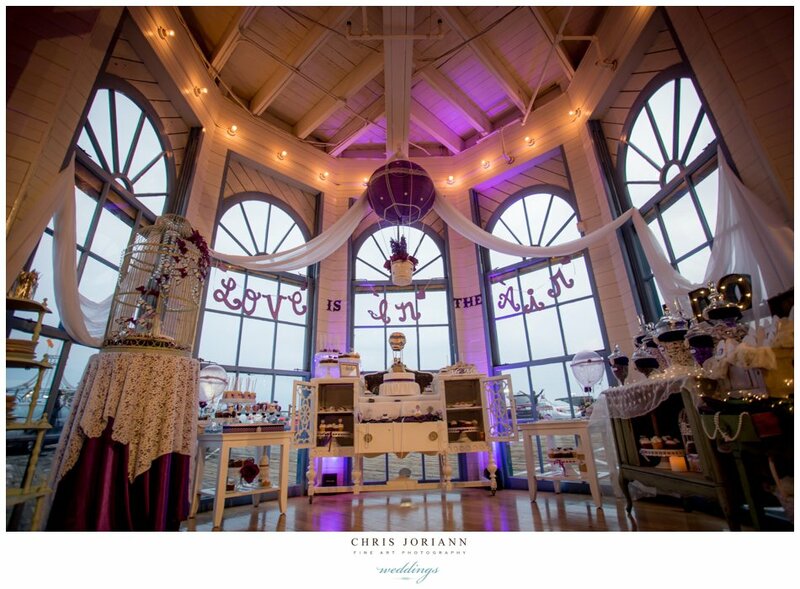 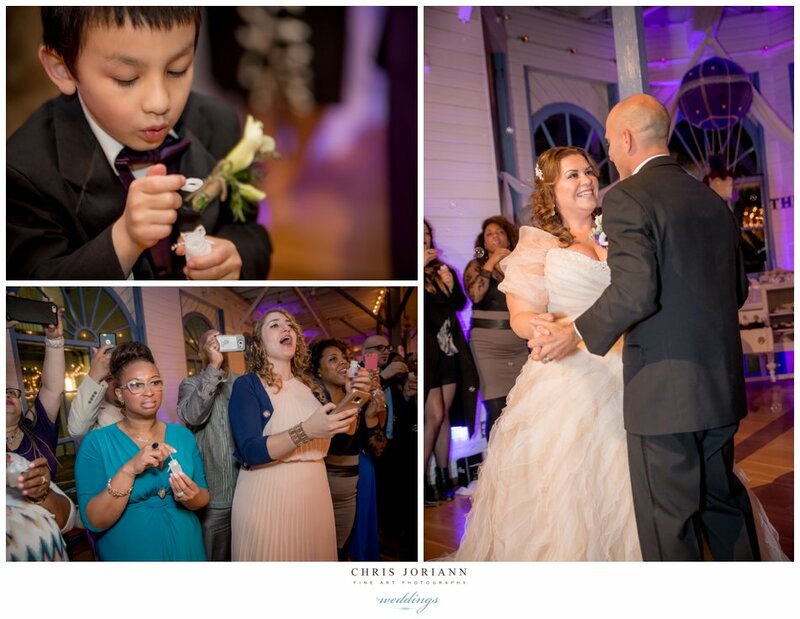 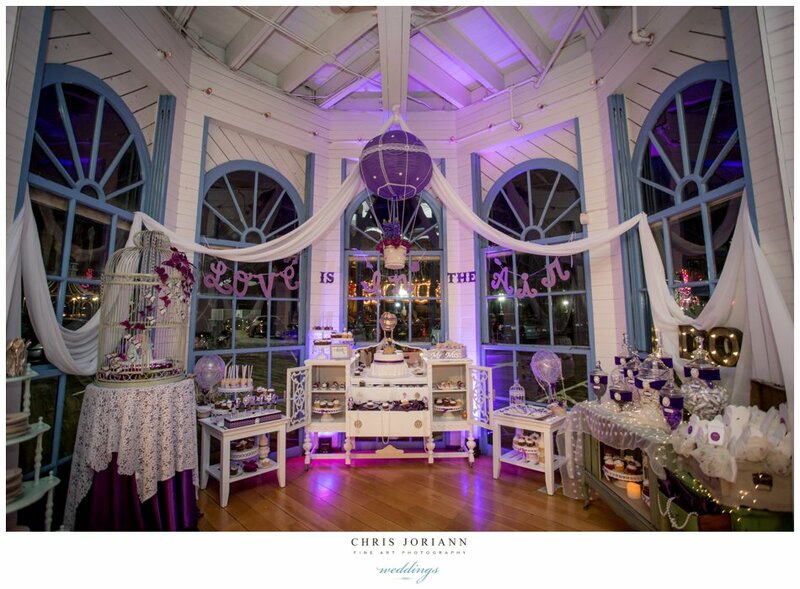 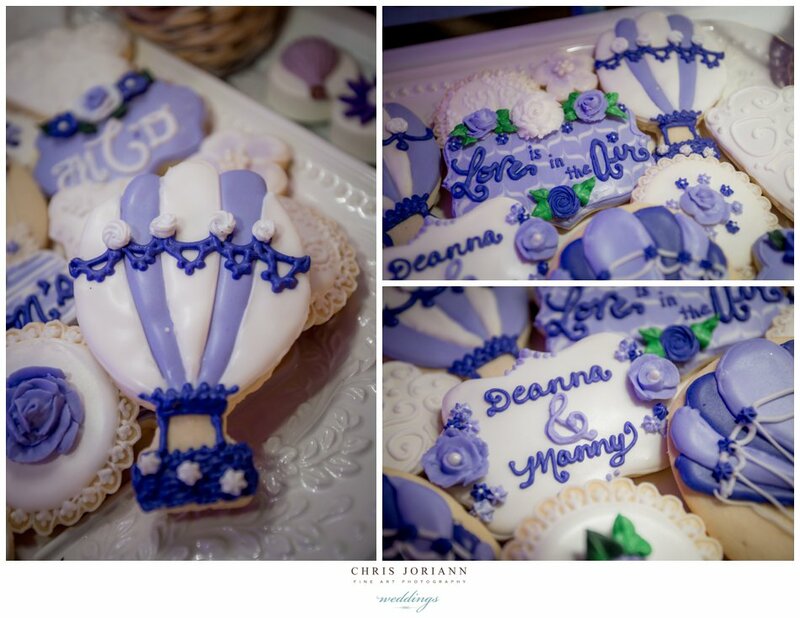 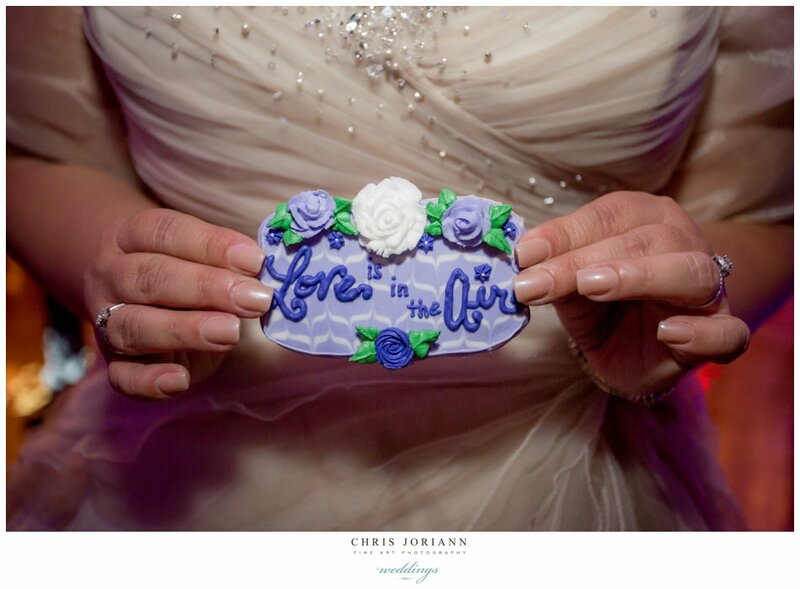 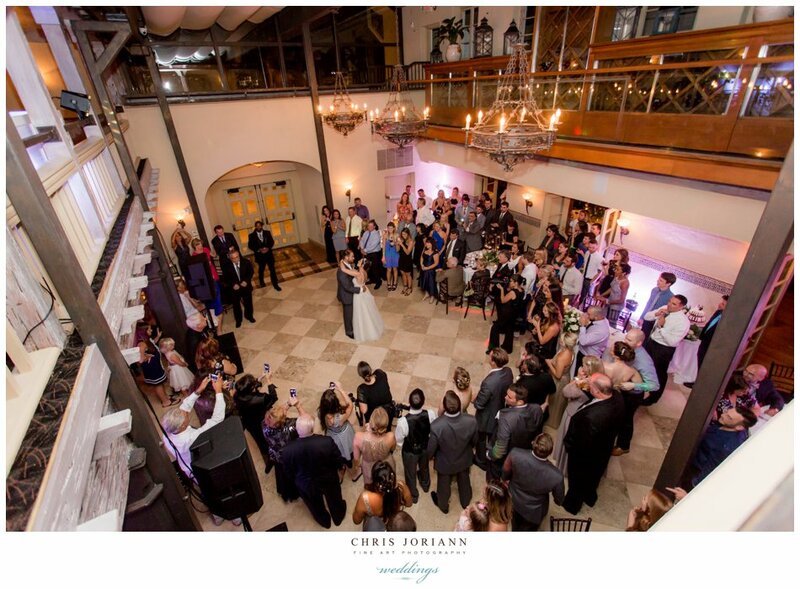 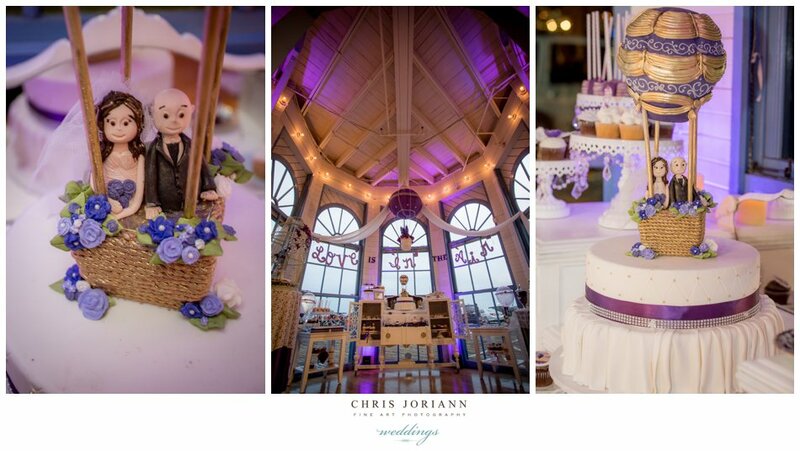 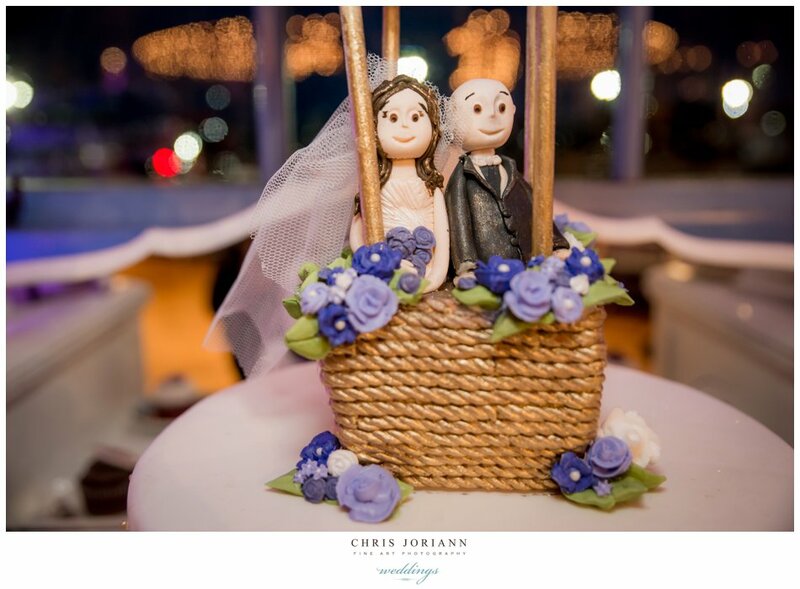 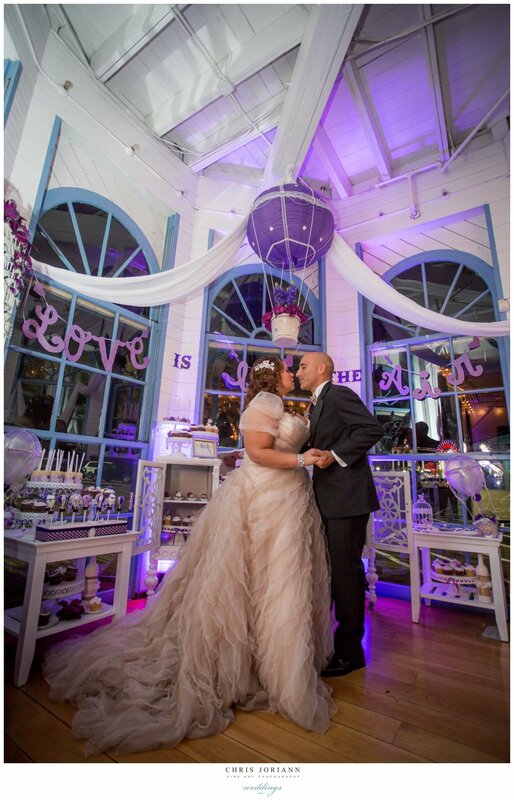 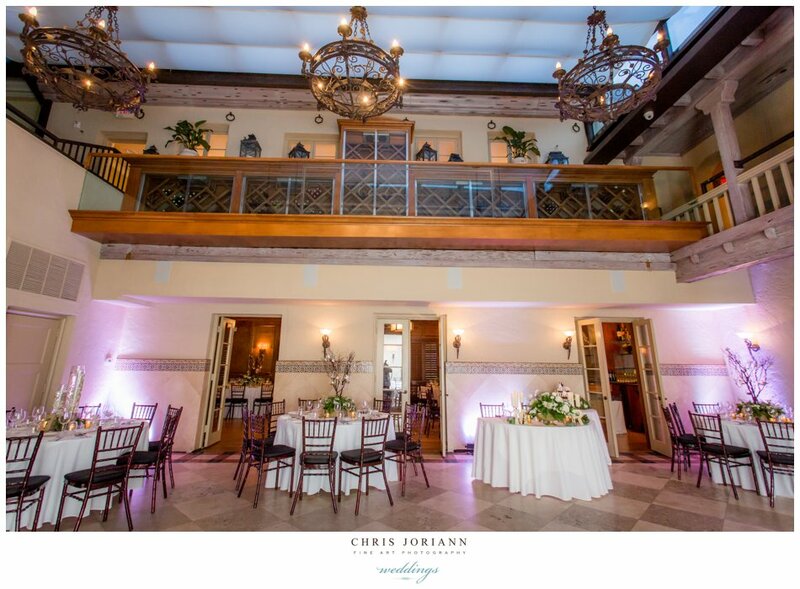 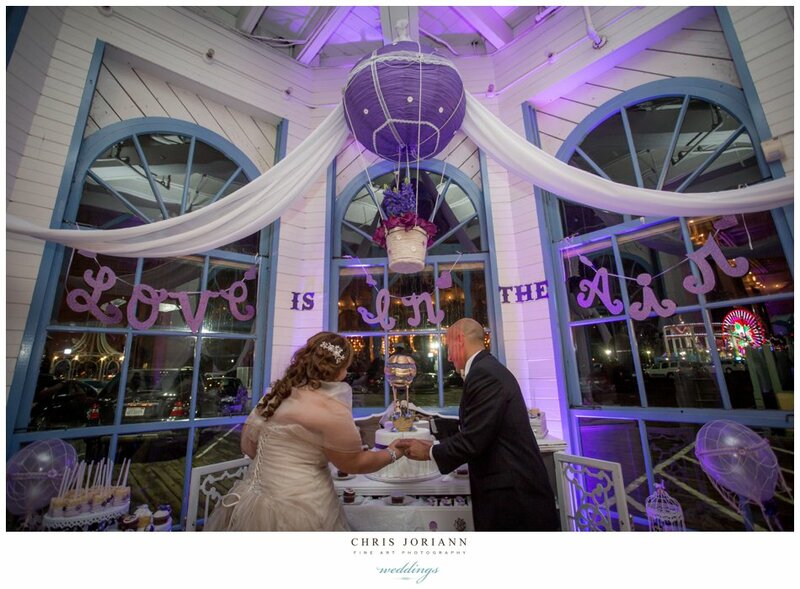 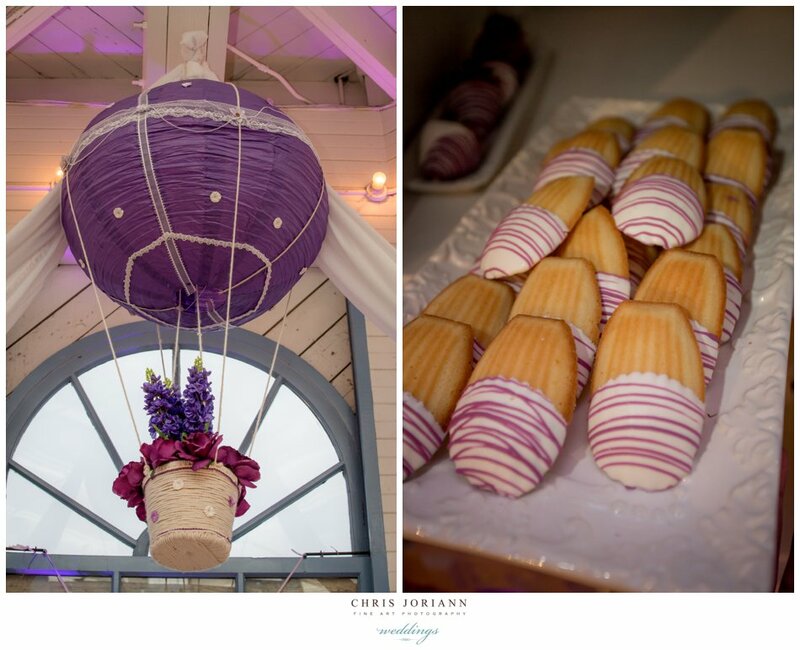 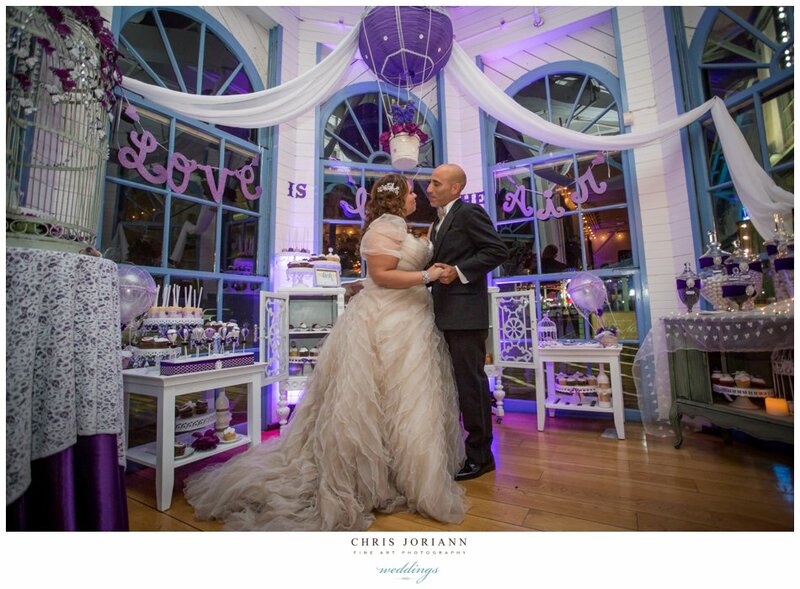 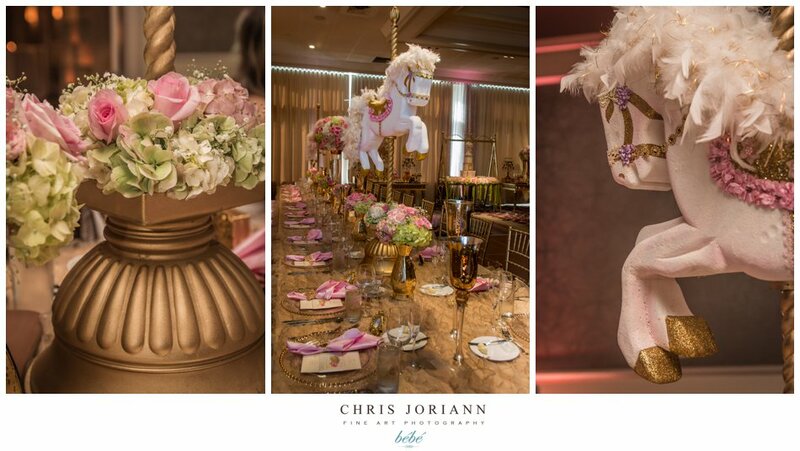 The bride’s love of “Hot Air Balloons” was realized by the amazing “Love is the Air” themed dessert room!!! 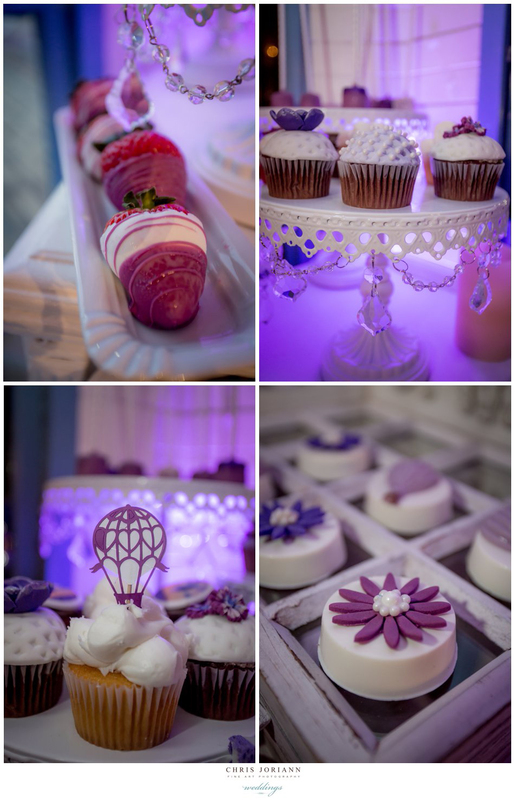 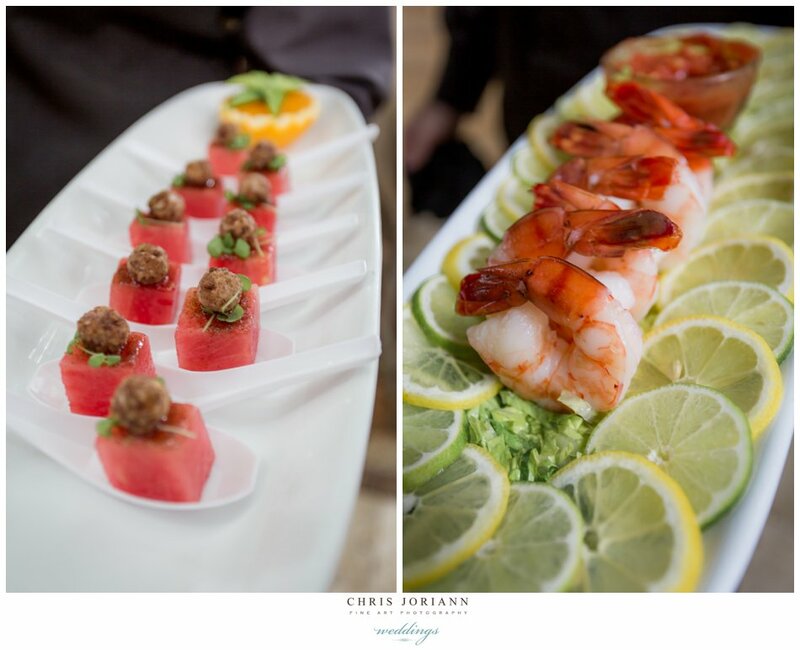 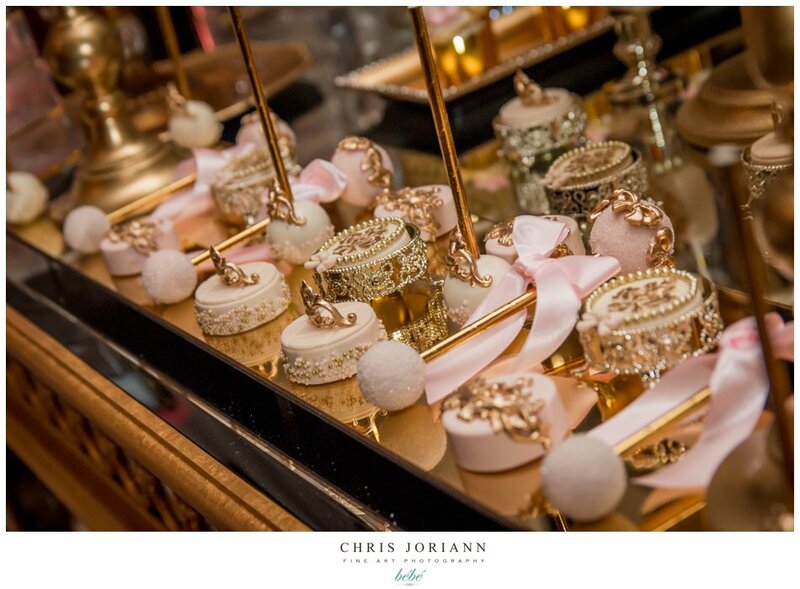 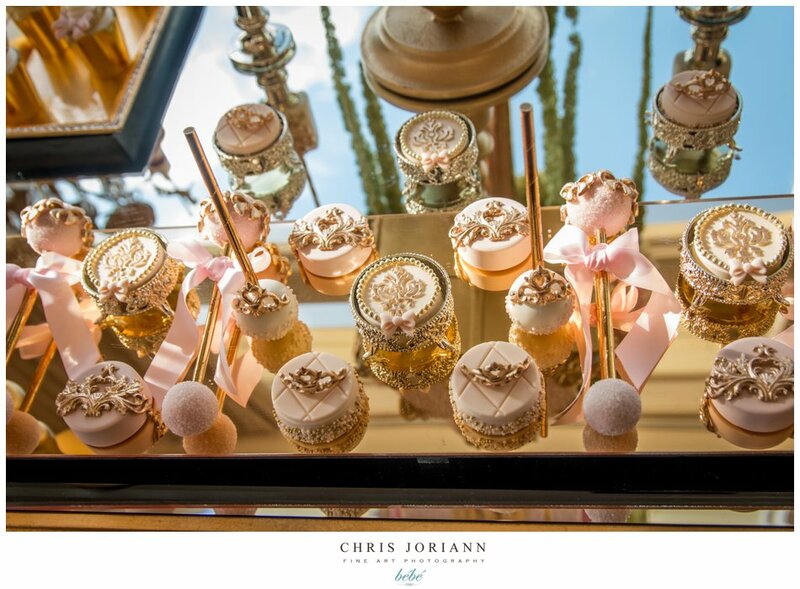 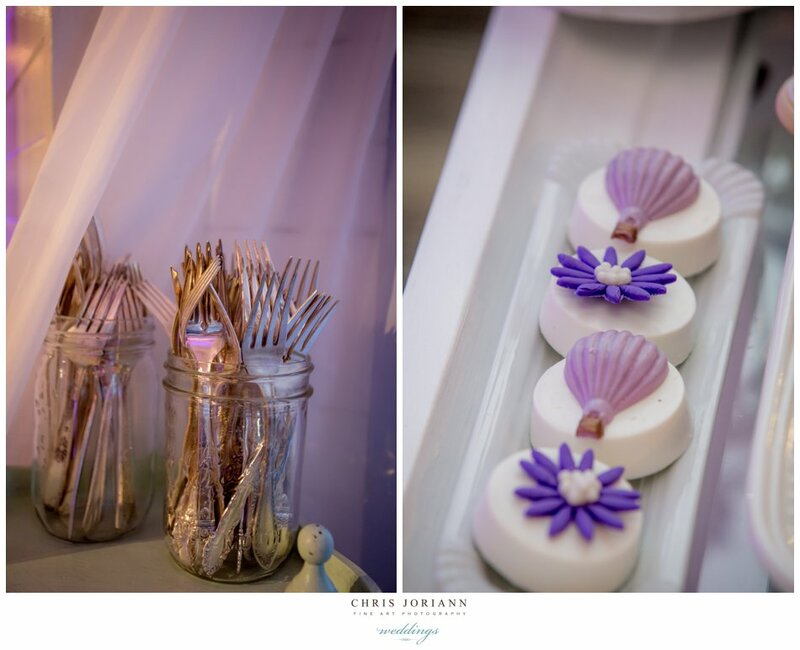 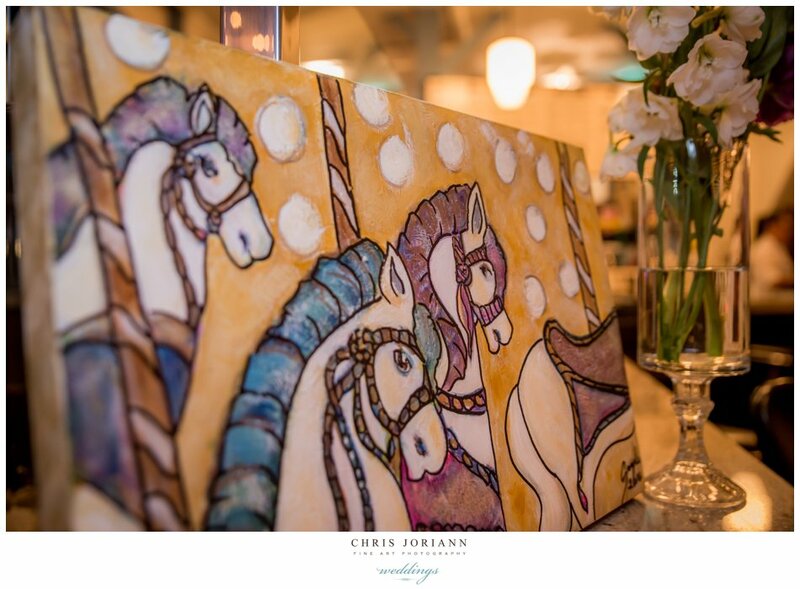 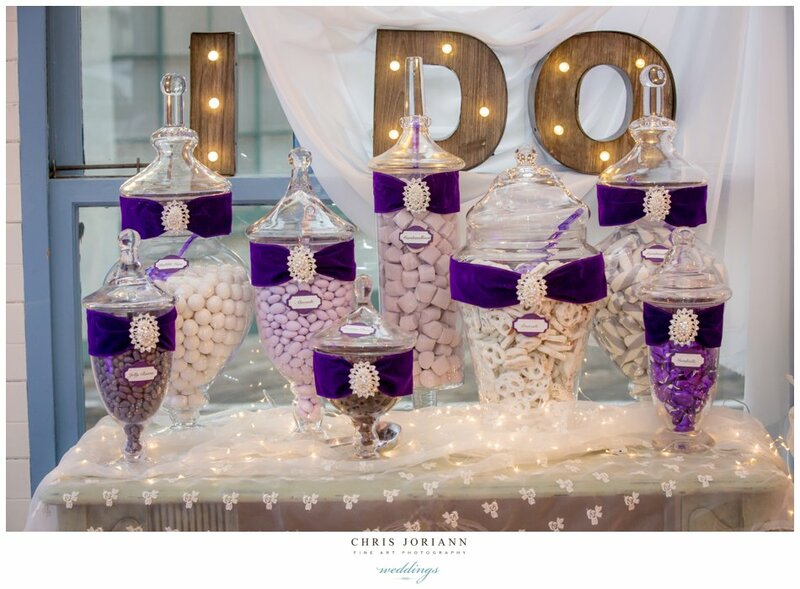 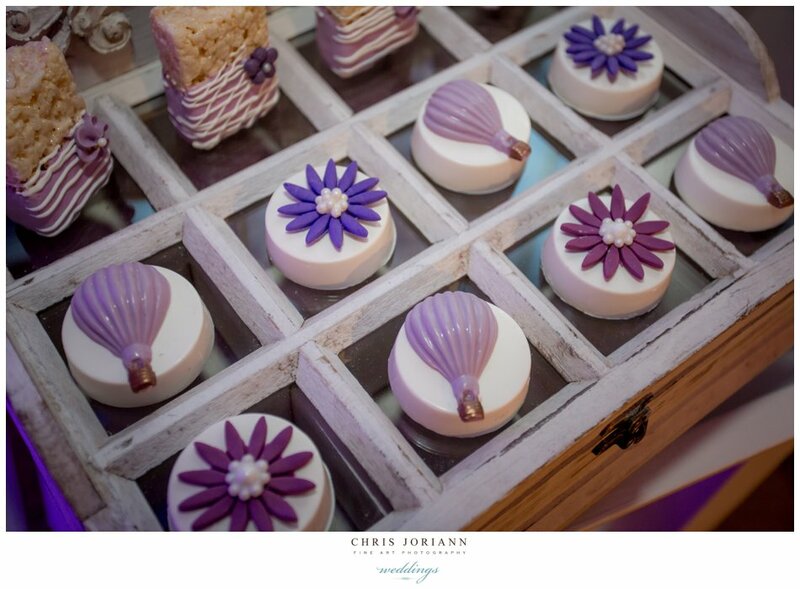 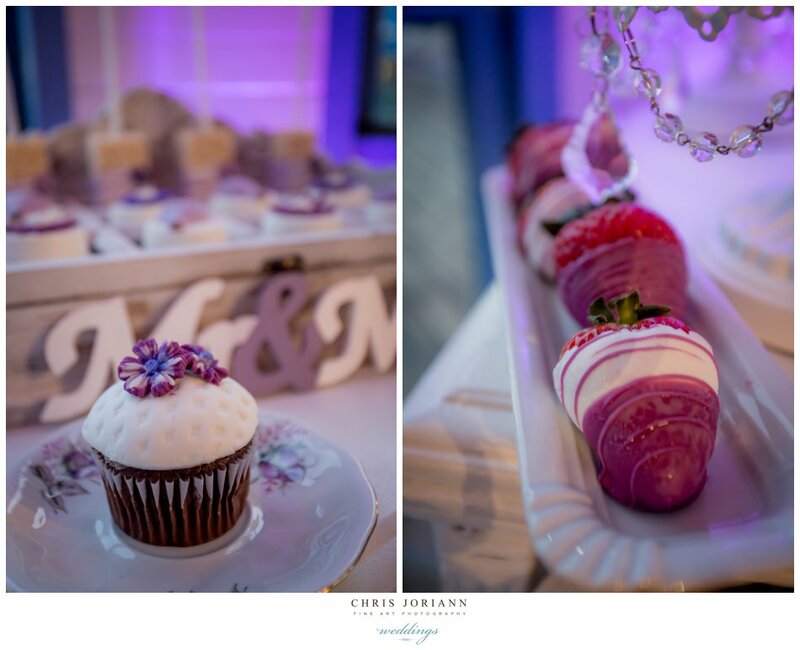 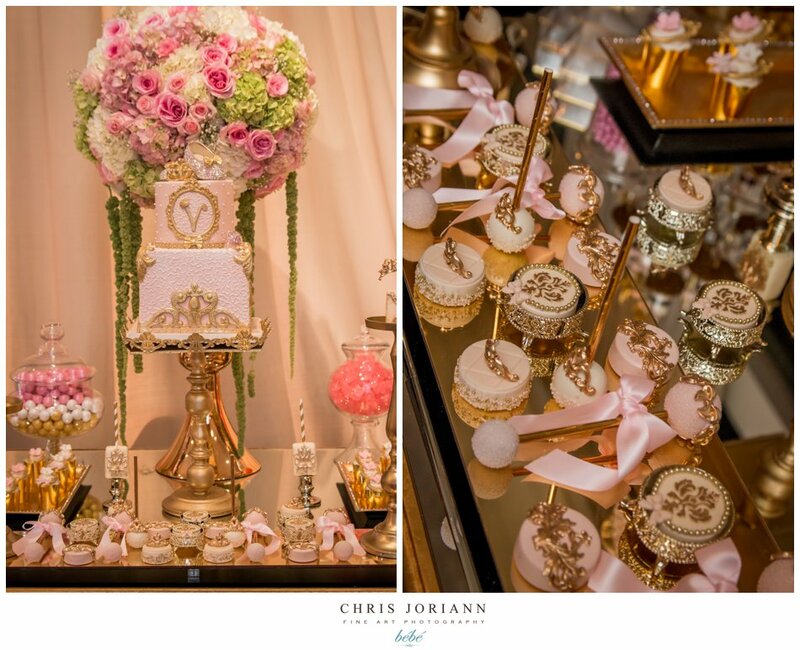 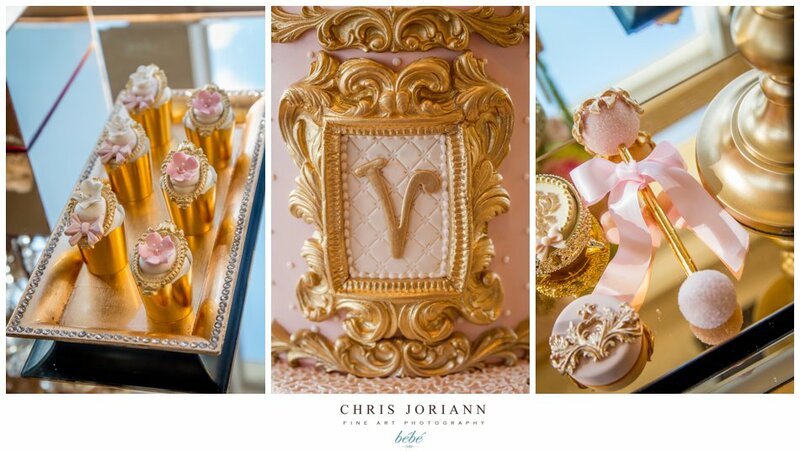 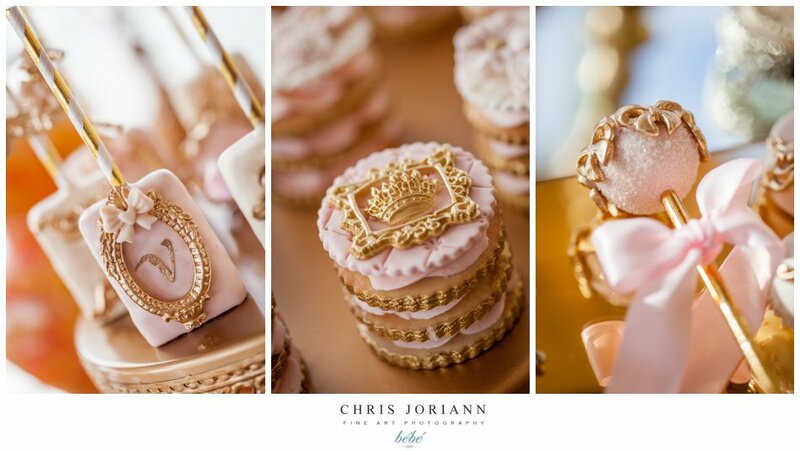 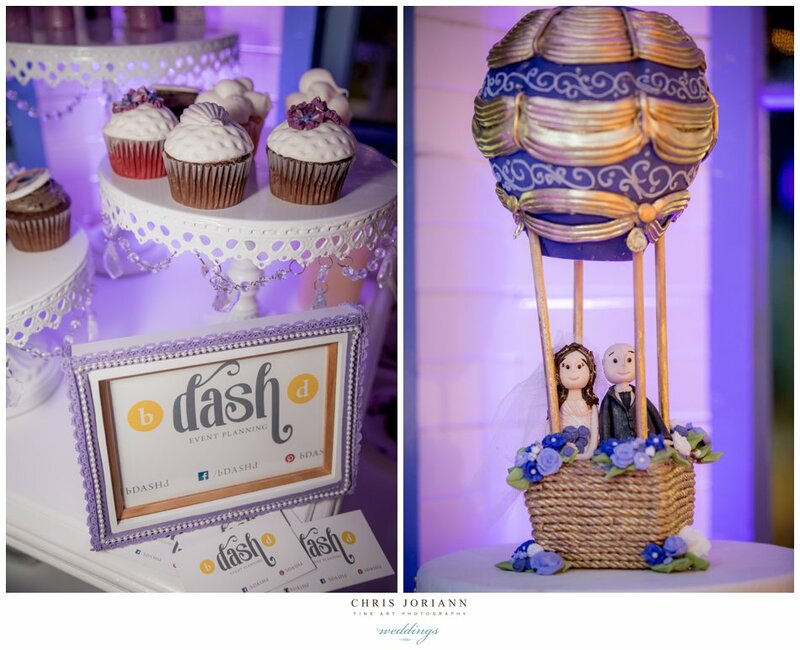 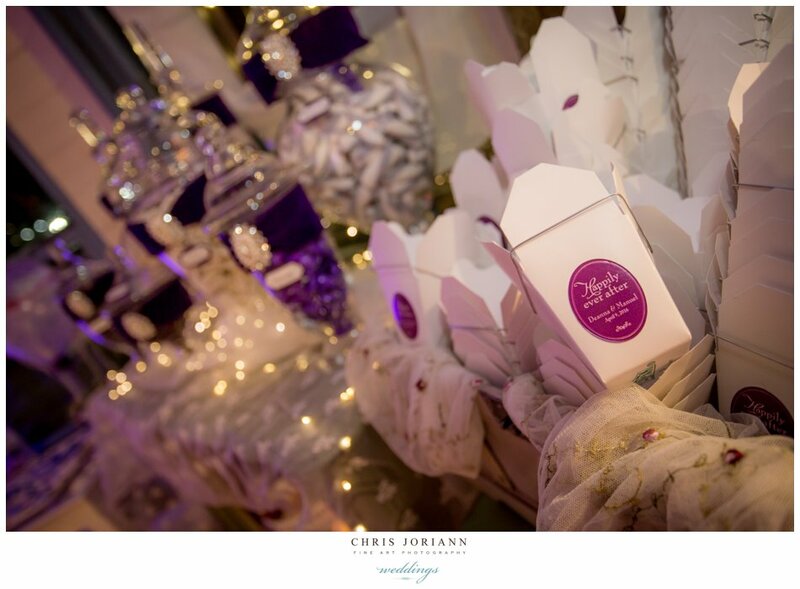 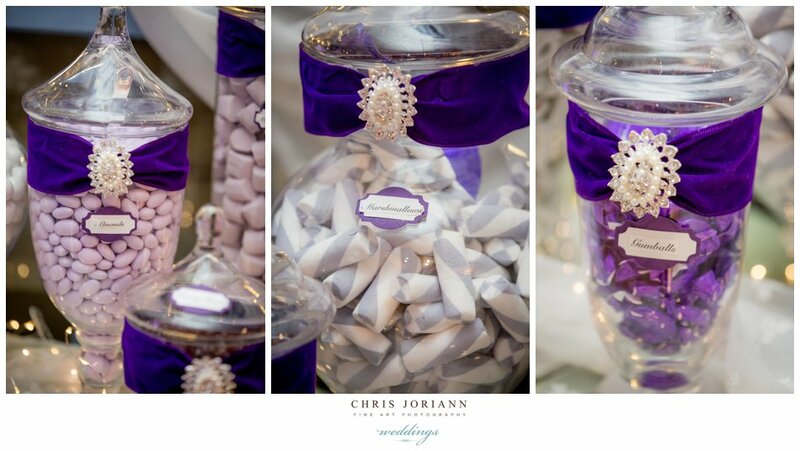 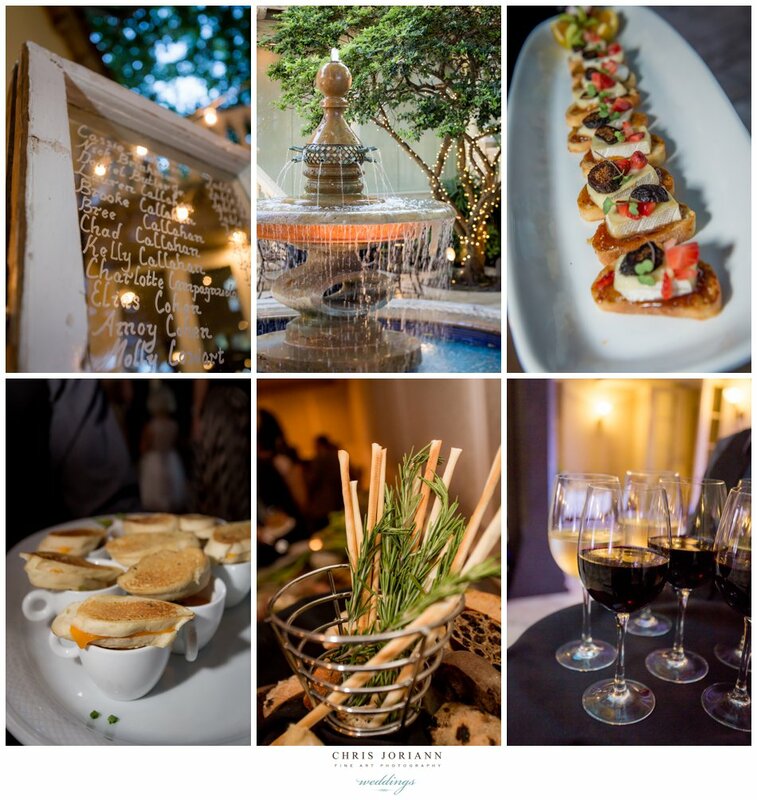 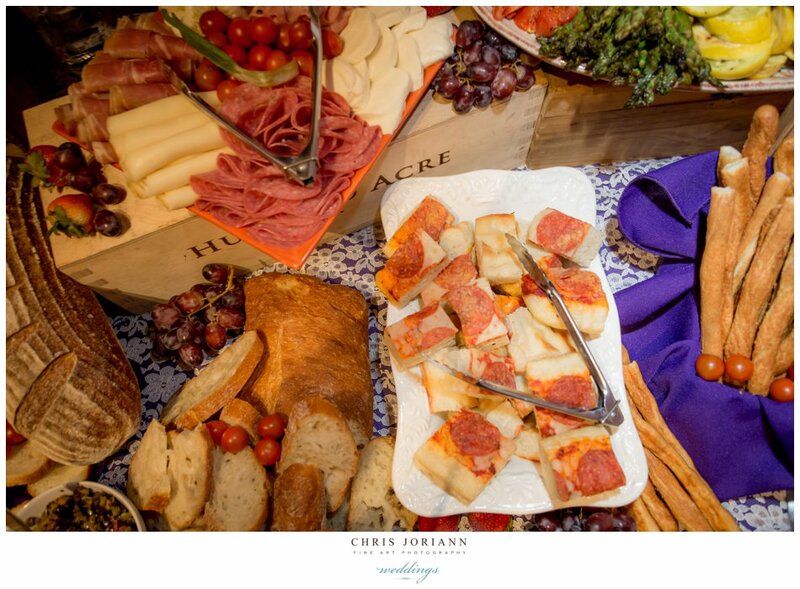 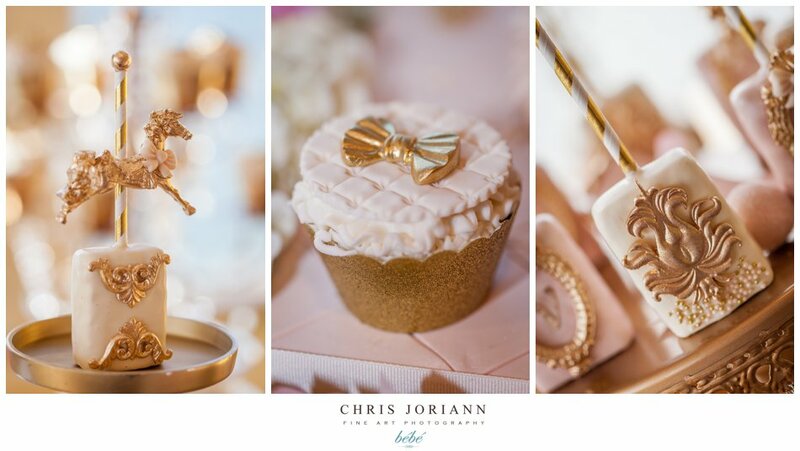 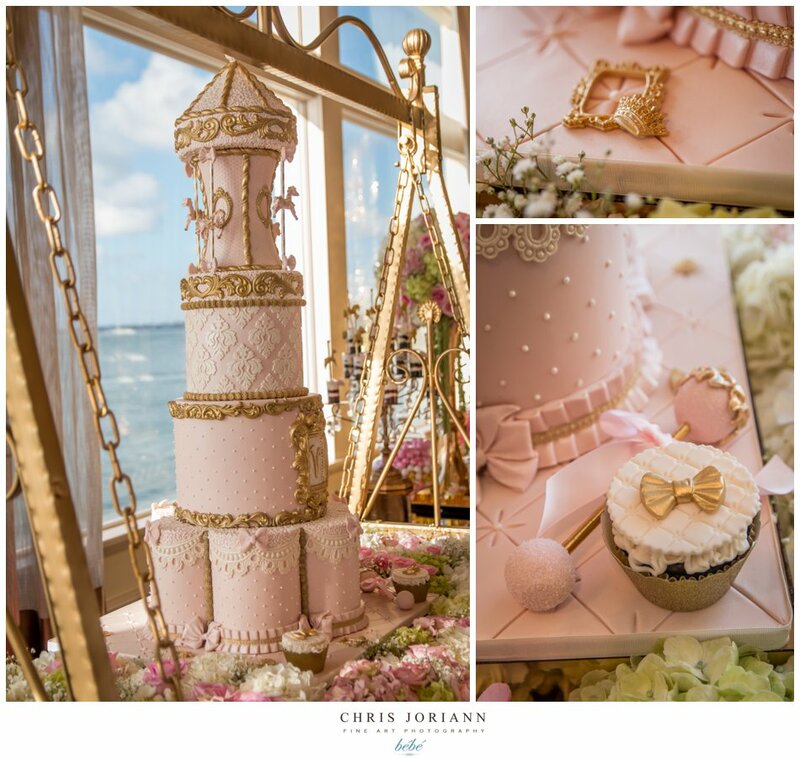 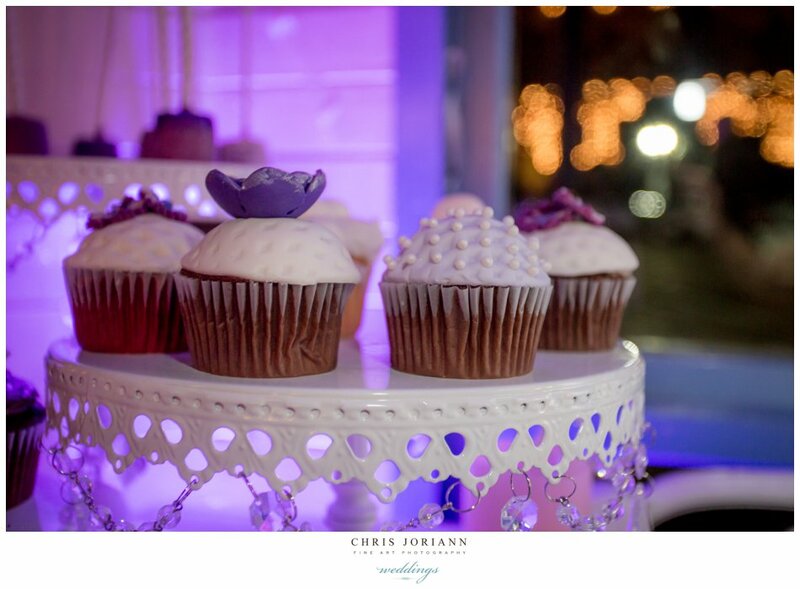 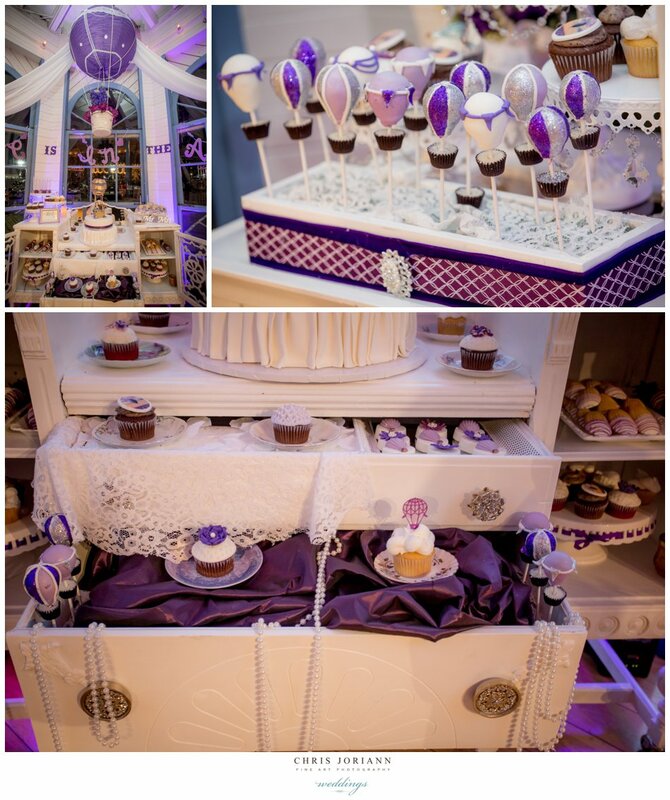 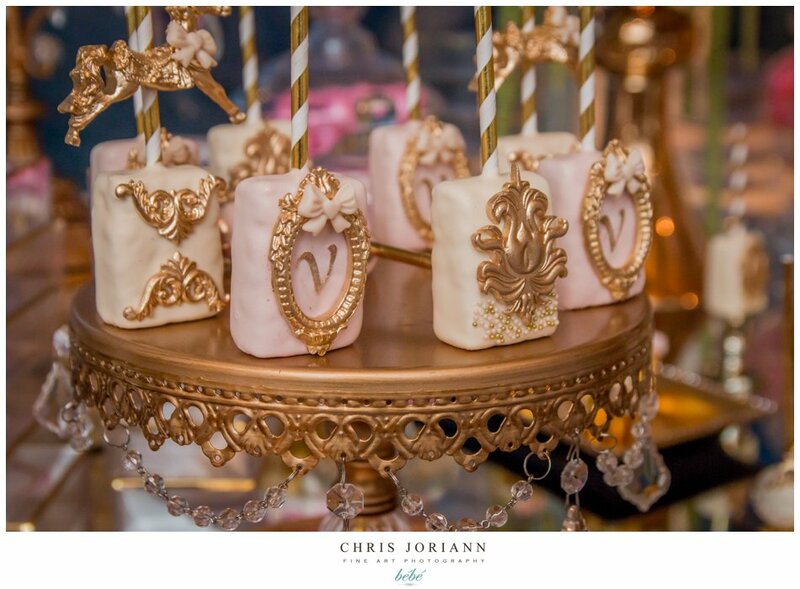 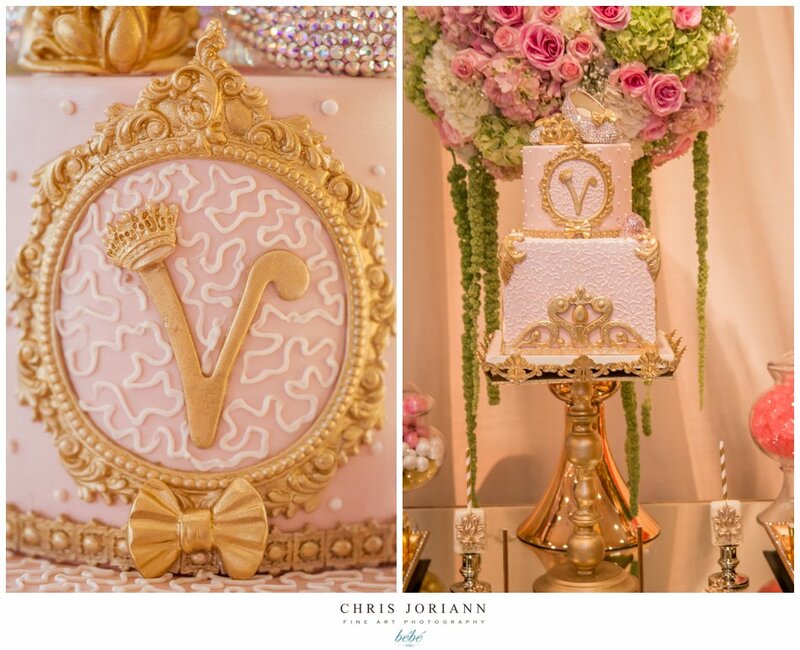 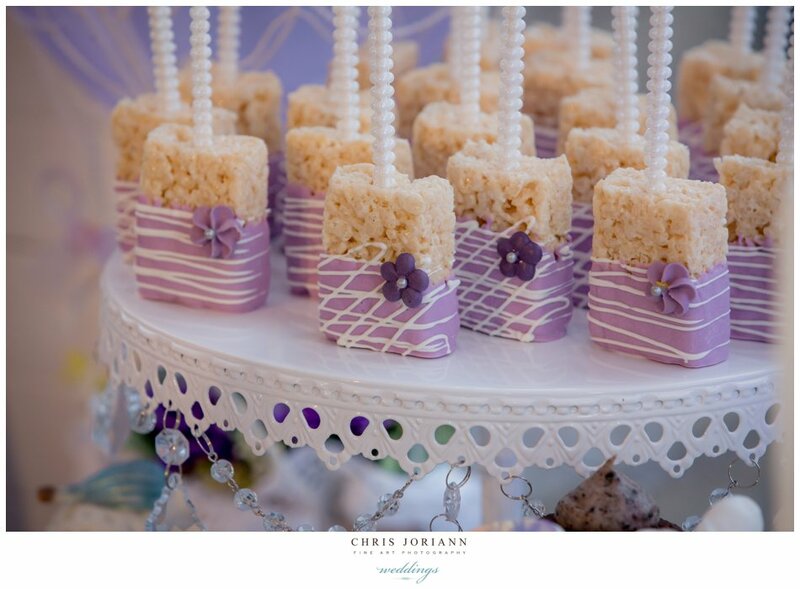 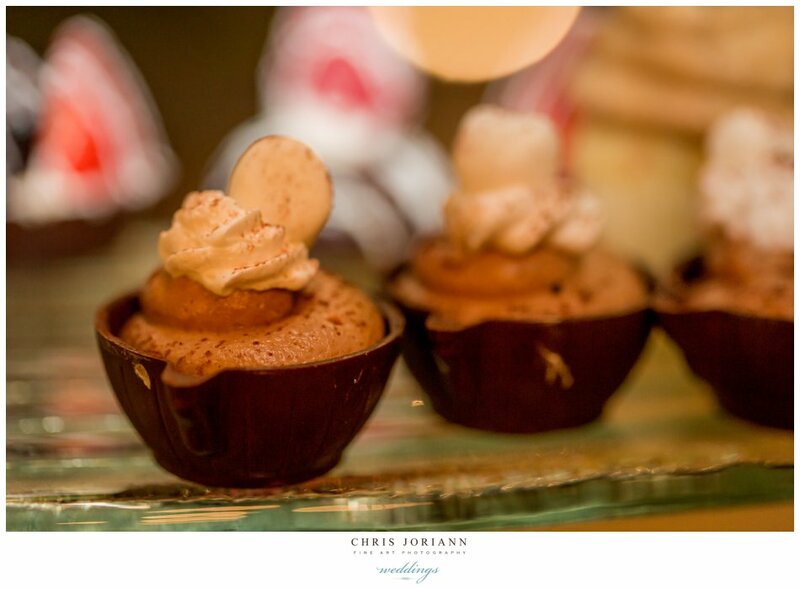 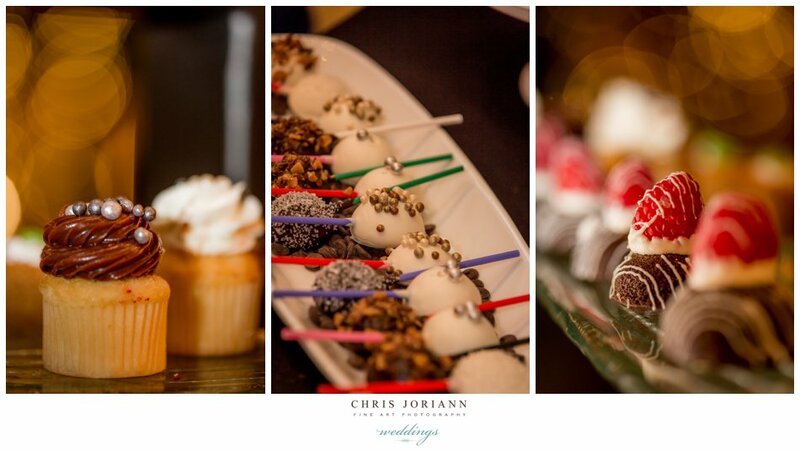 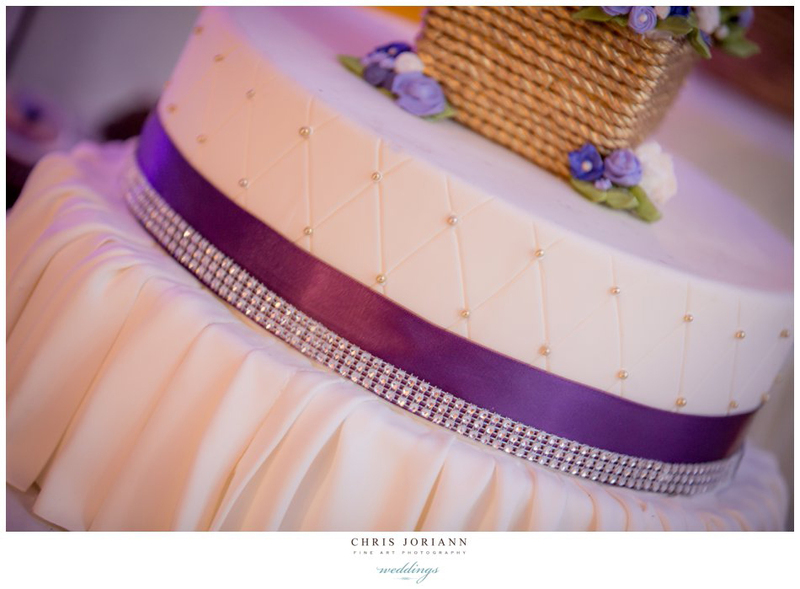 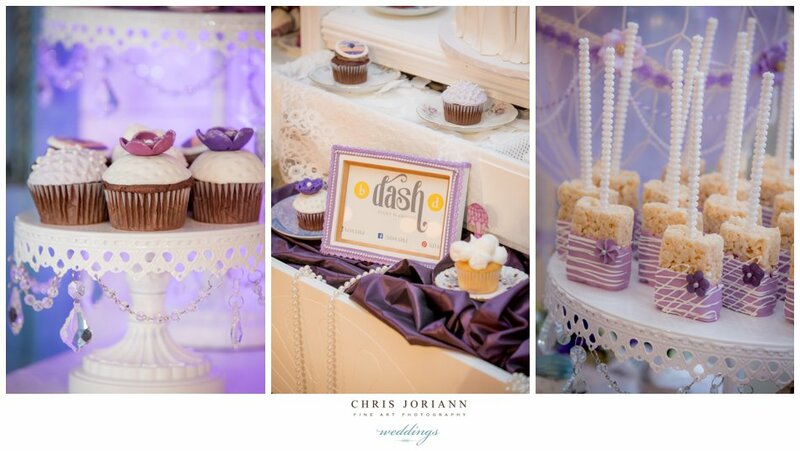 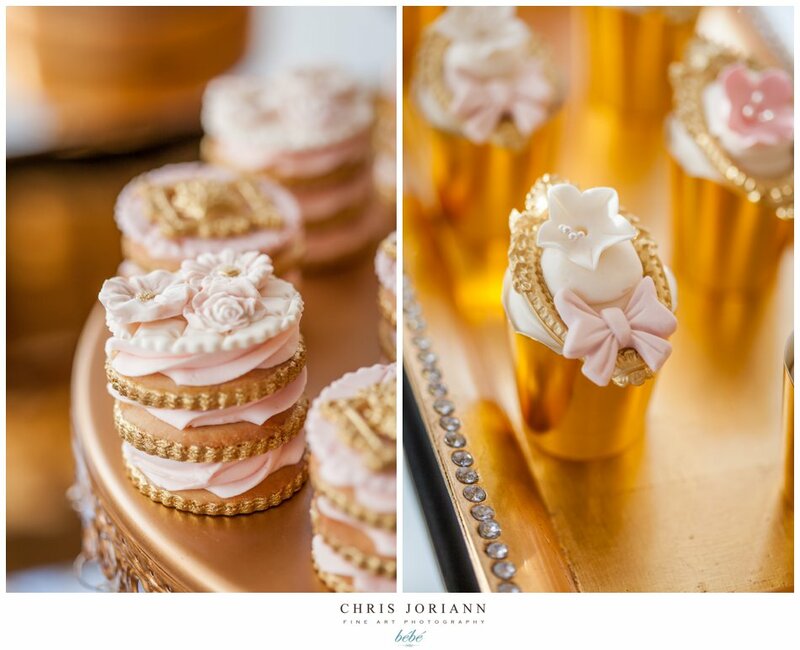 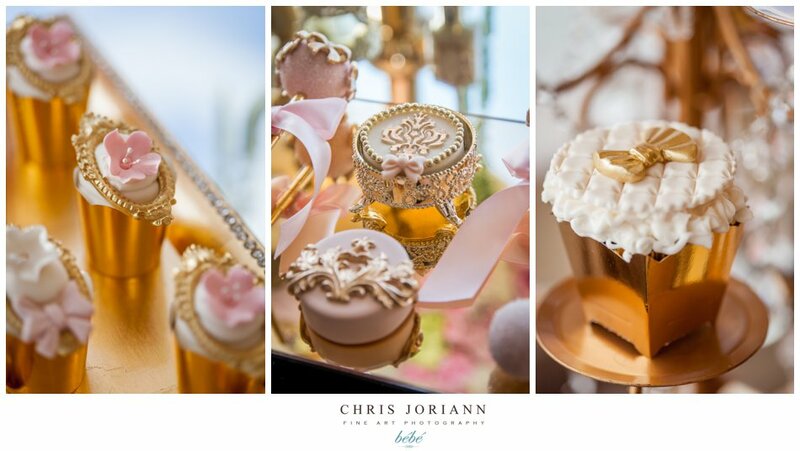 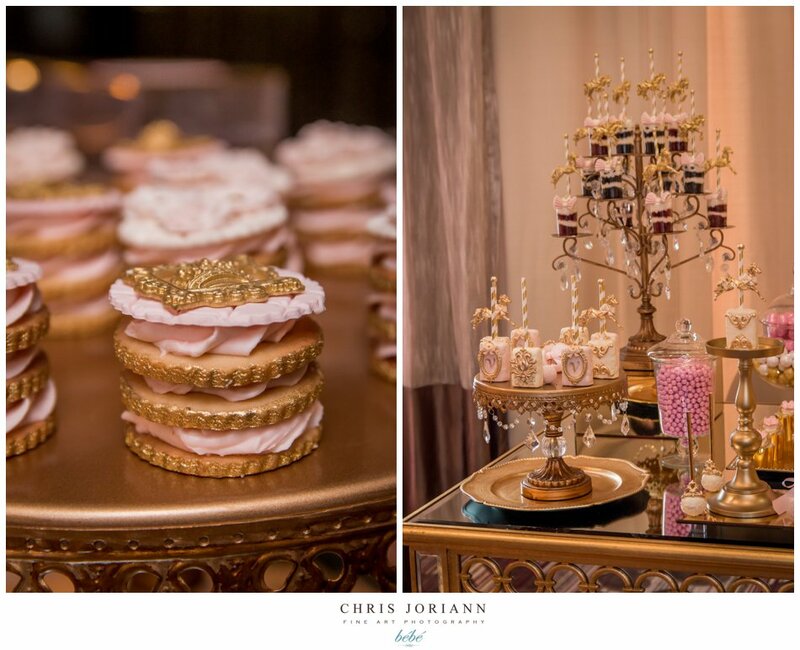 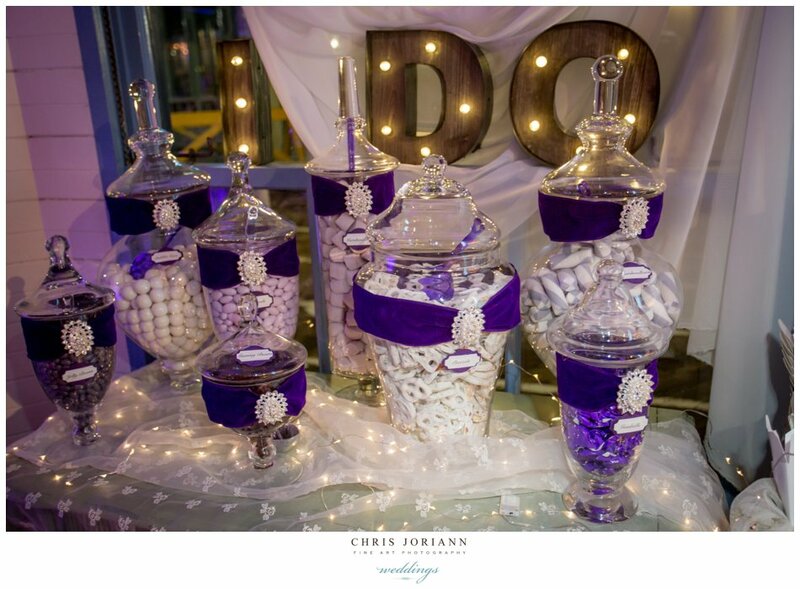 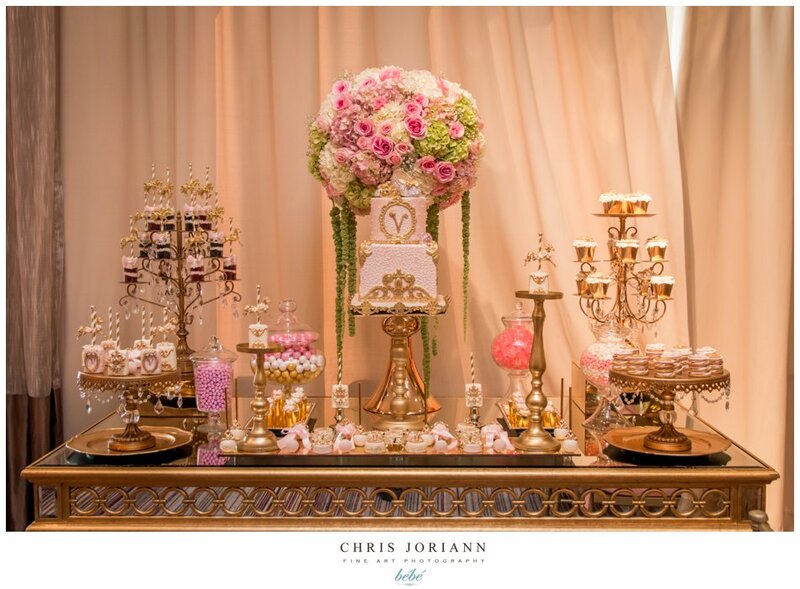 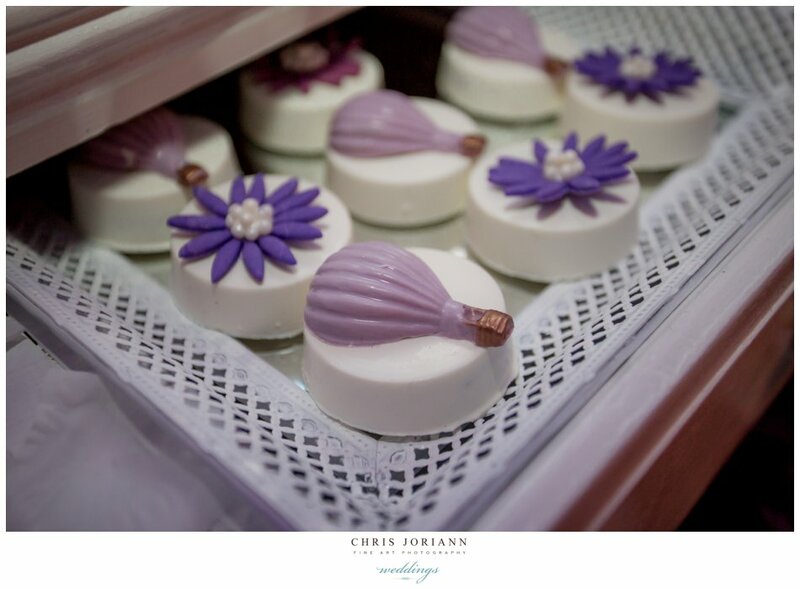 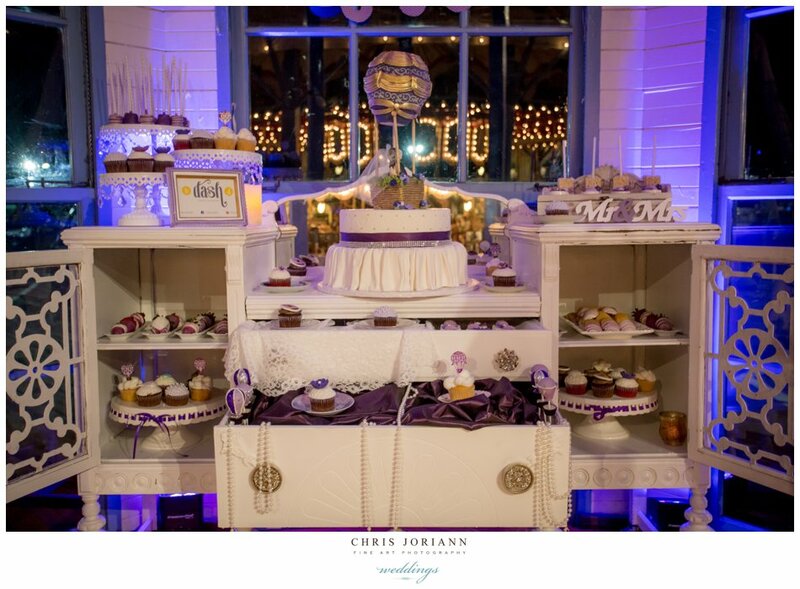 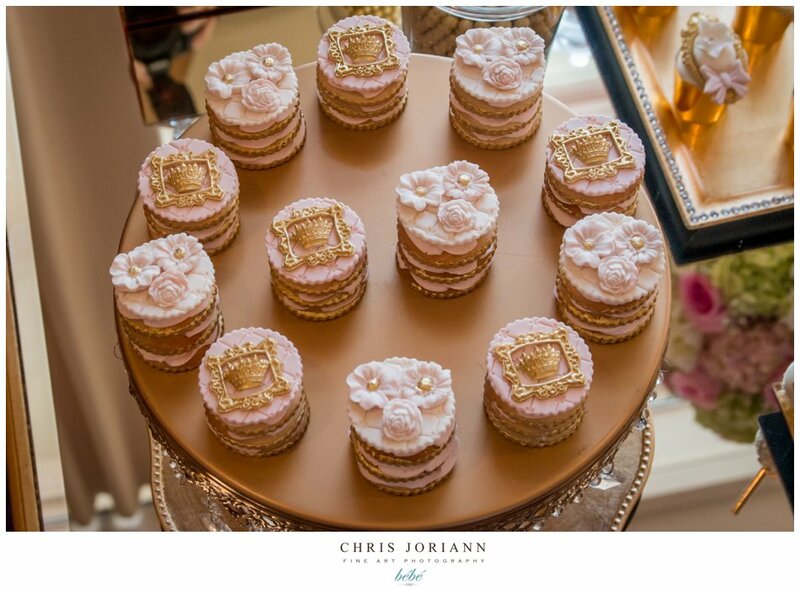 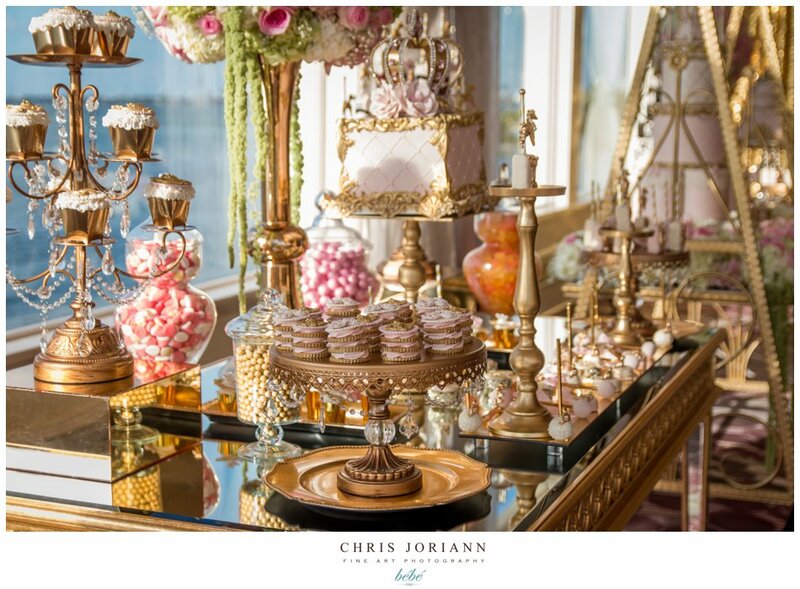 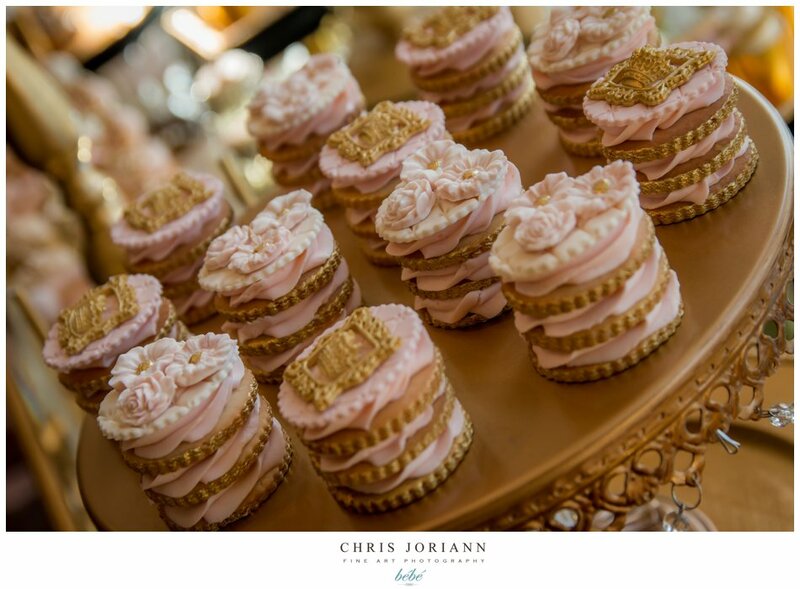 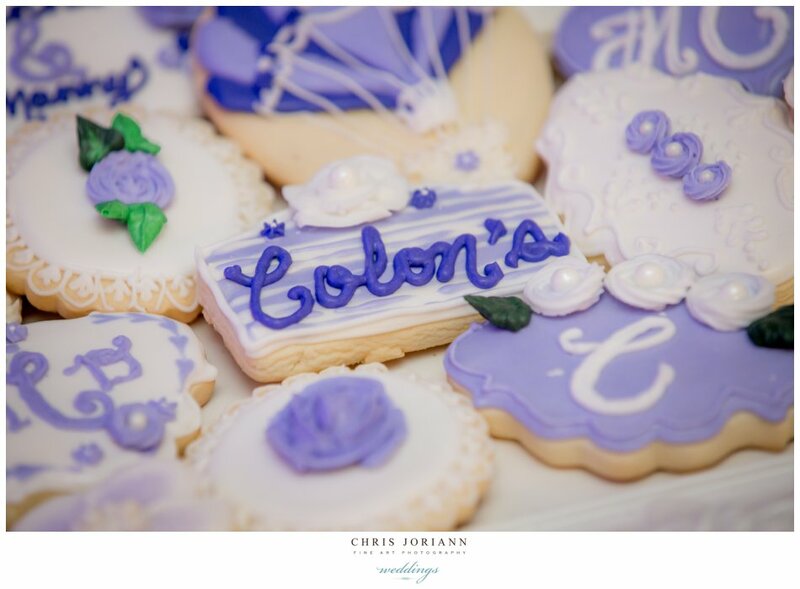 Designed by bDASHd Event Planning + Bakery, these incredible confections, and their presentation, were beyond compare. 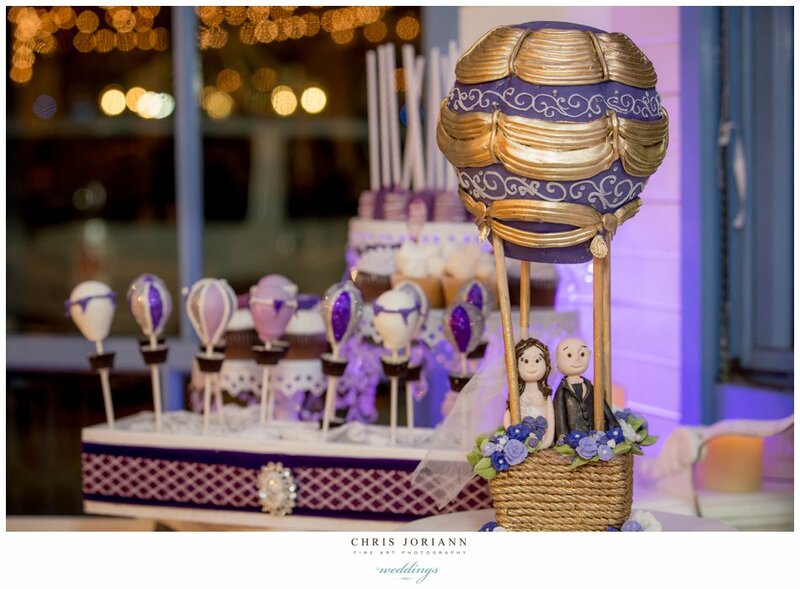 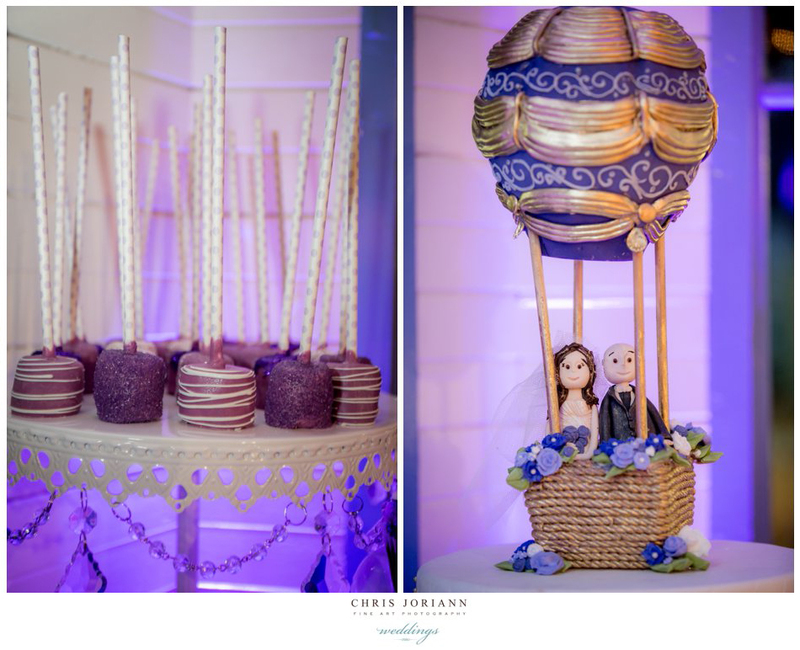 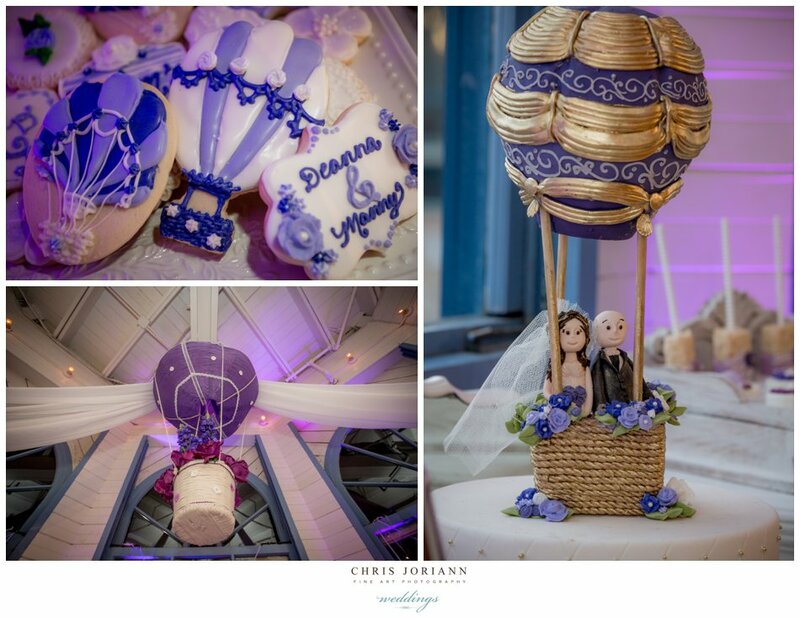 Due to zoning issues, the couple was unable to depart in an actual balloon, so the wedding cake by Jennifer Johnson for Johnson’s Custom Cakes was the next best thing, as this pastry chef extraordinaire actually designed a fondant replica of the newlyweds in a gold and plum basket as the top layer.